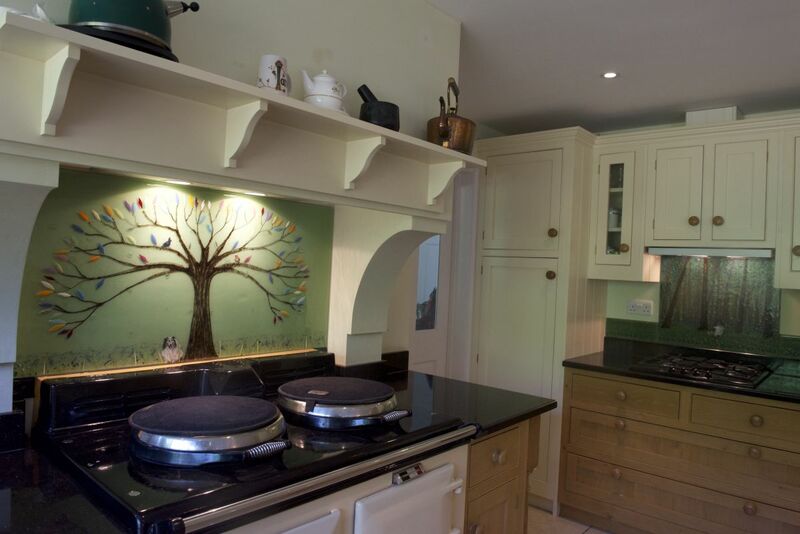 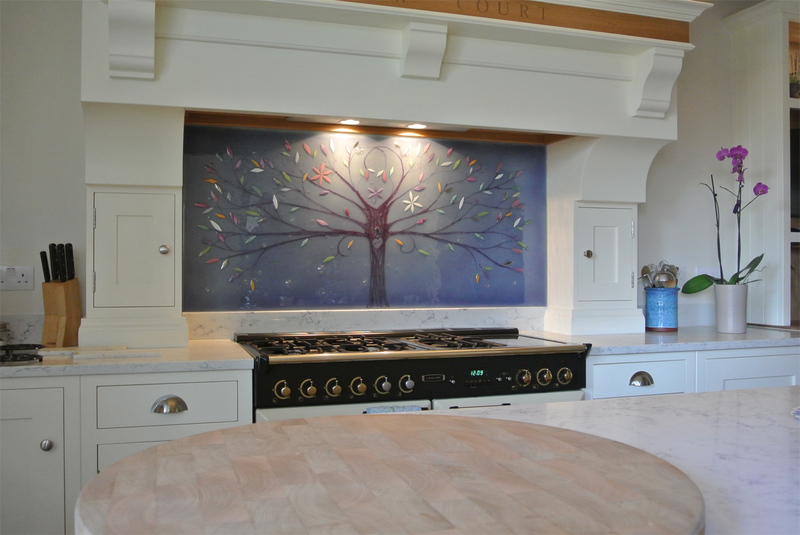 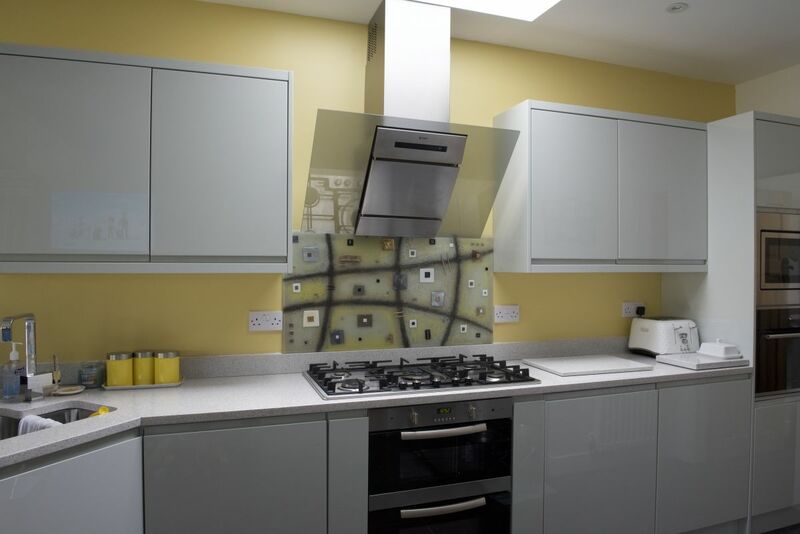 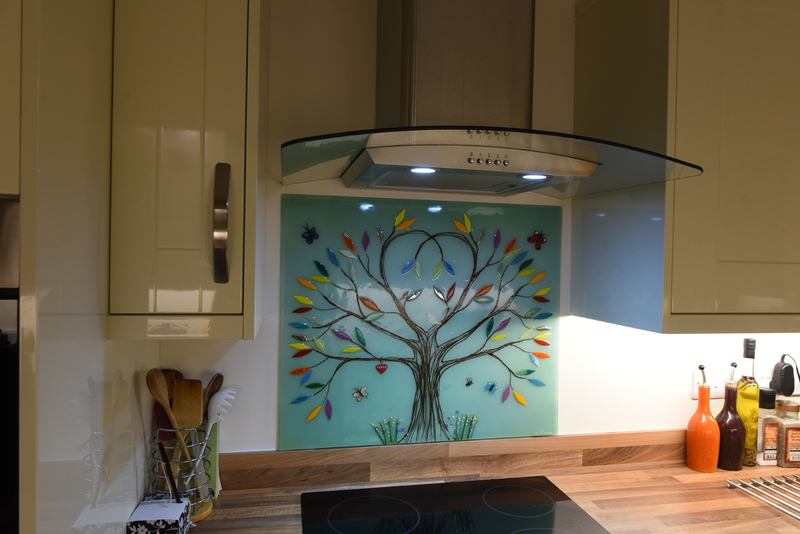 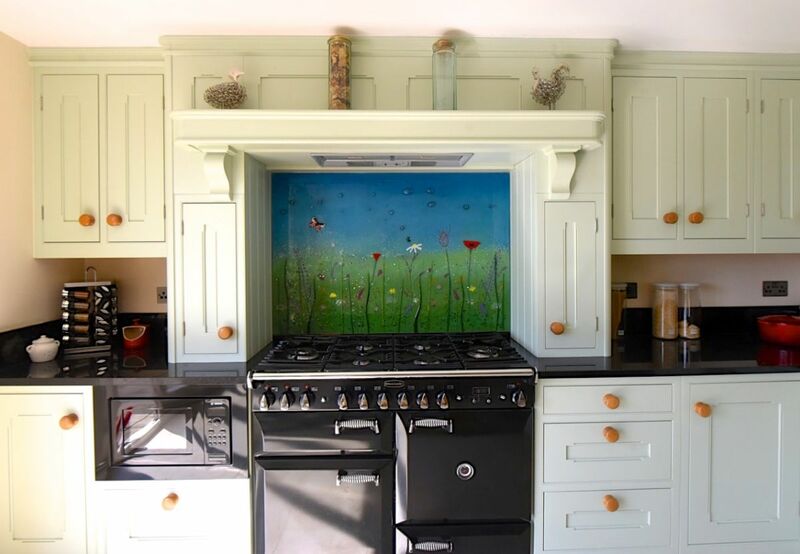 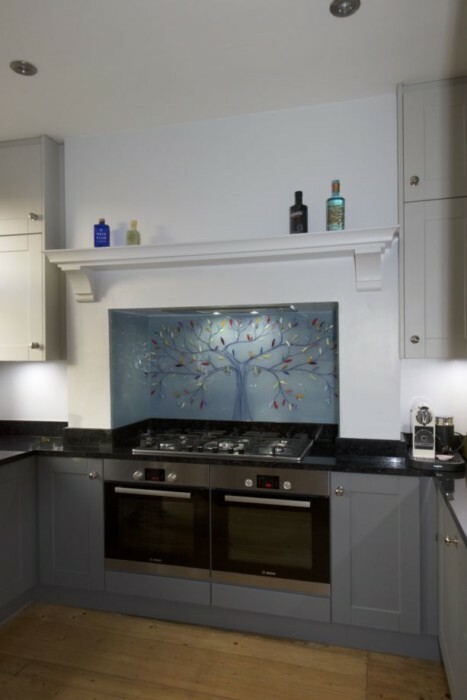 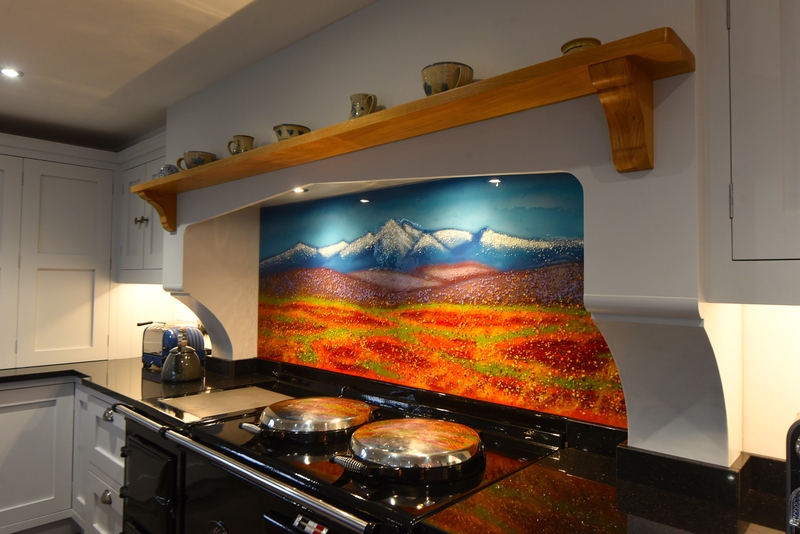 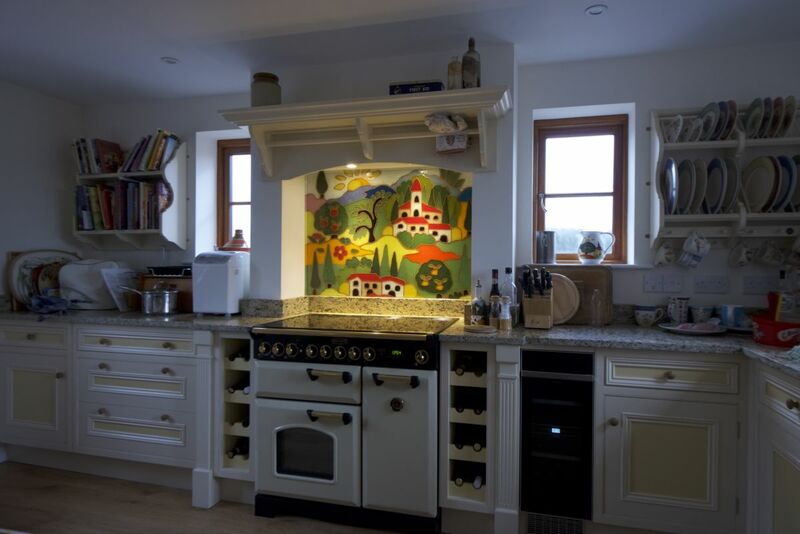 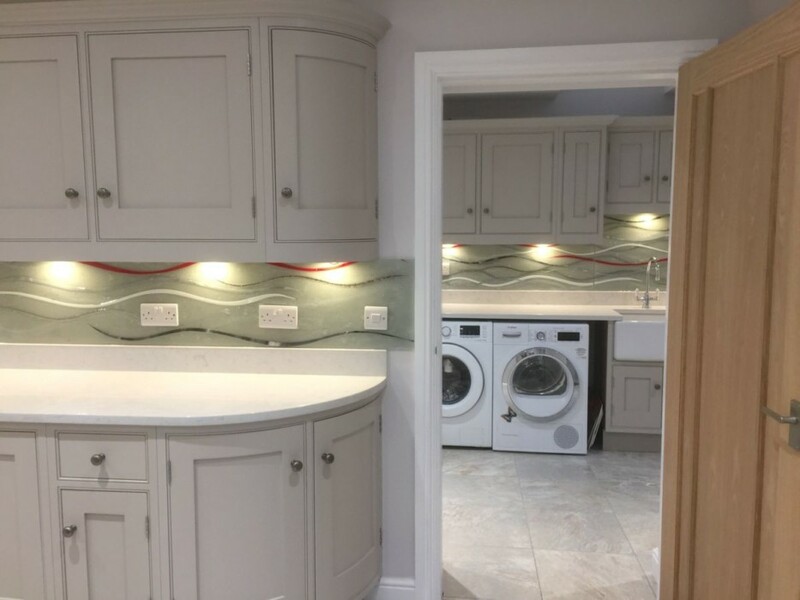 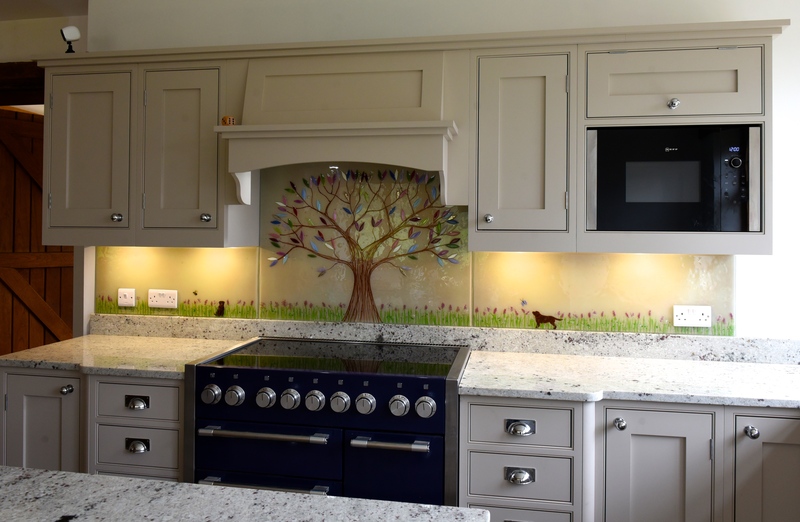 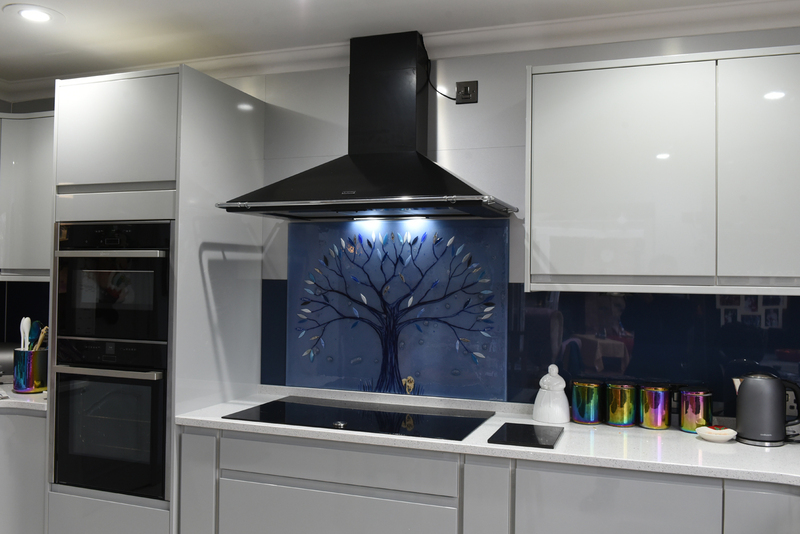 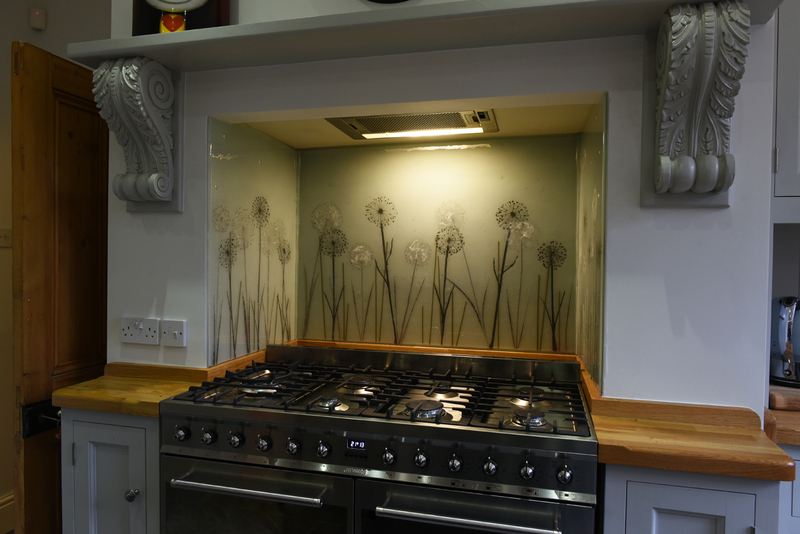 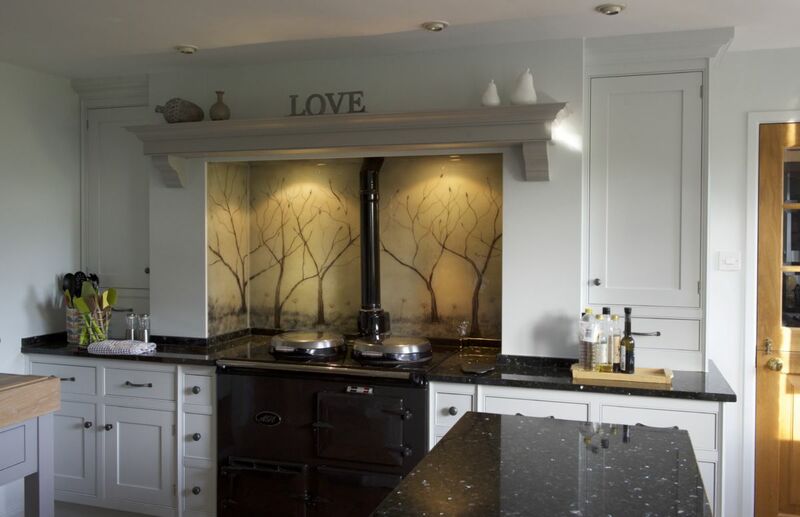 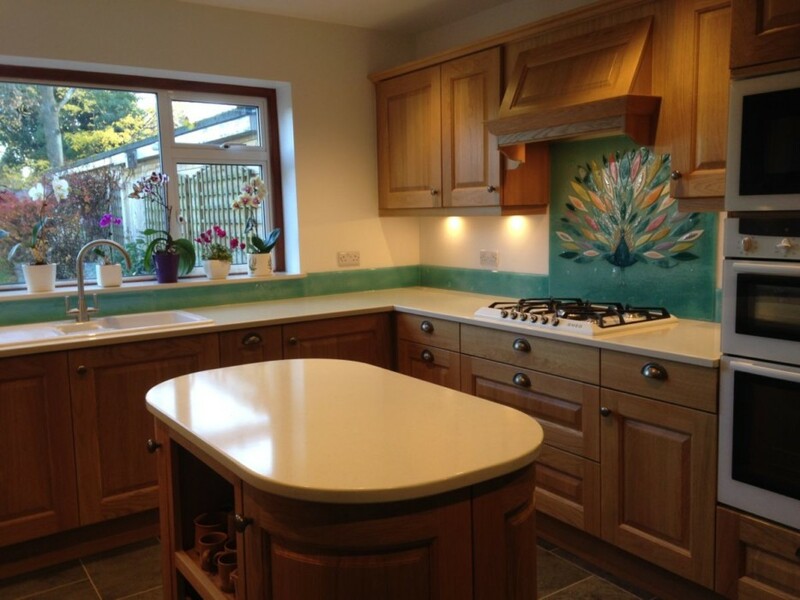 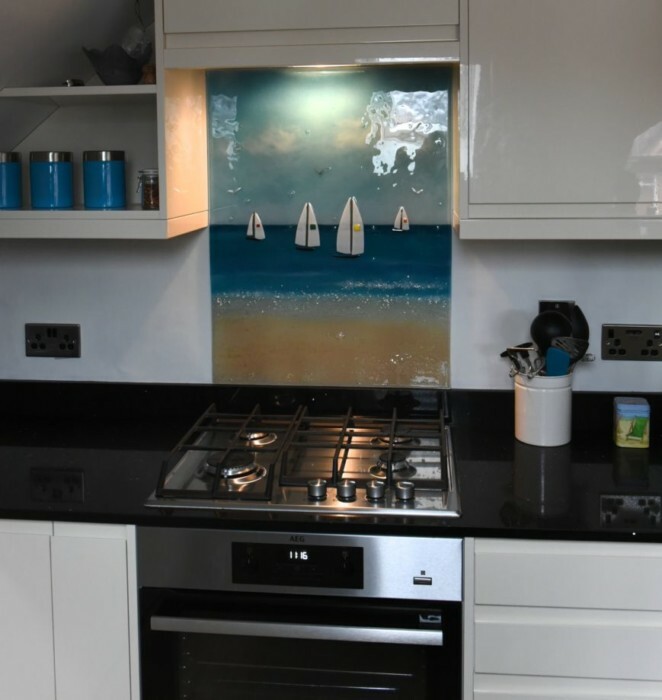 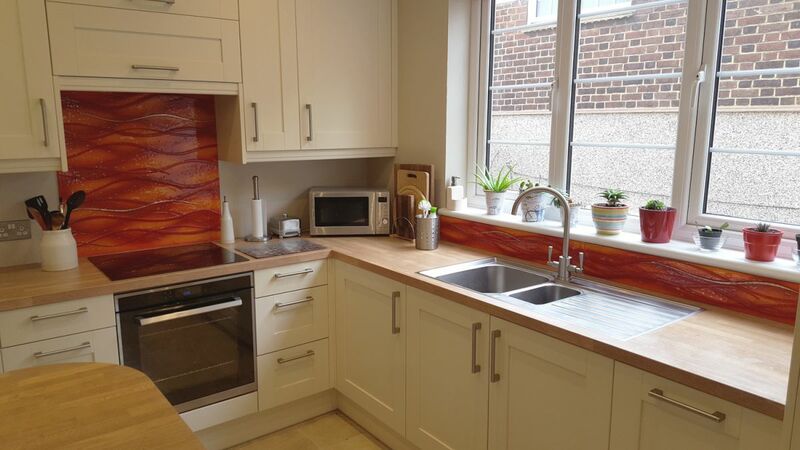 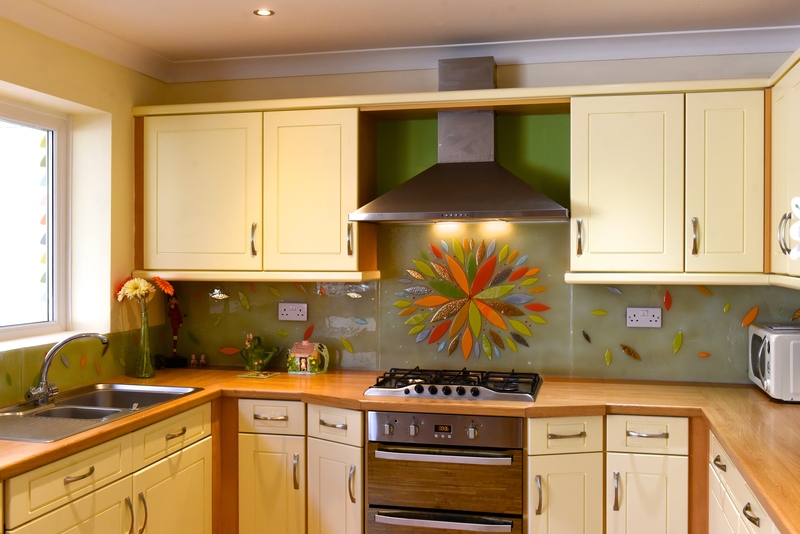 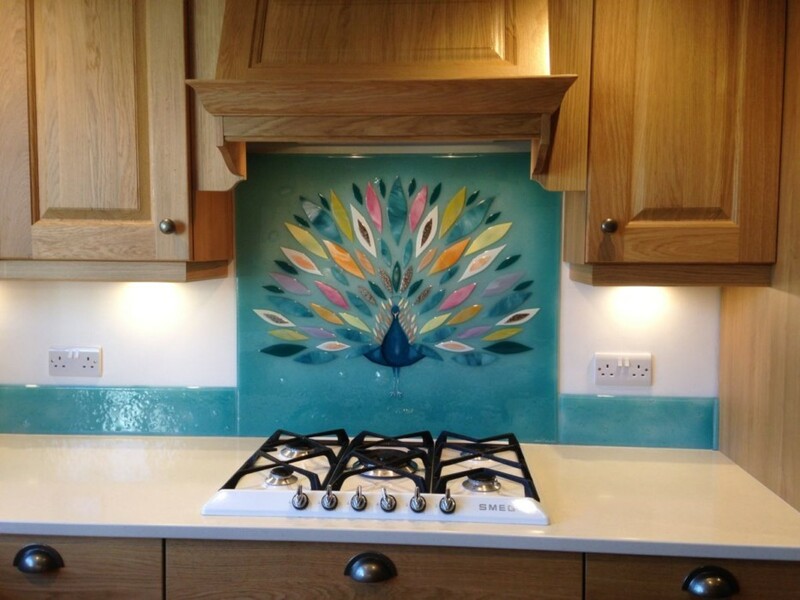 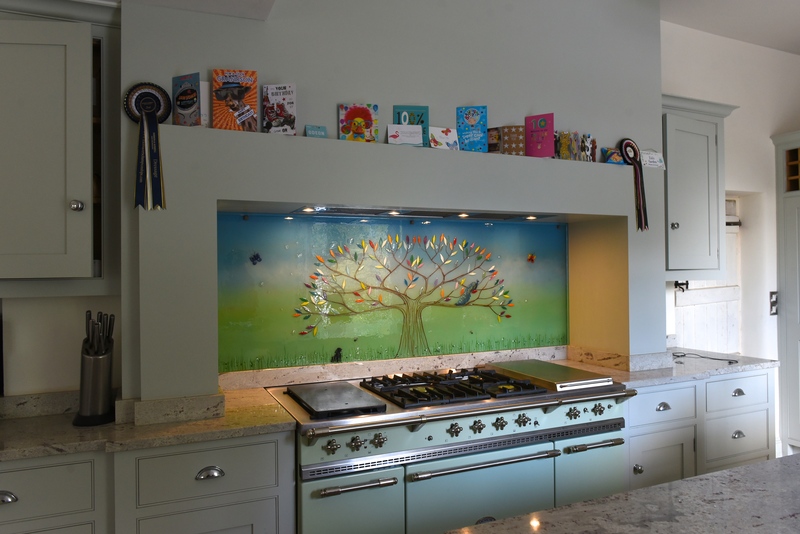 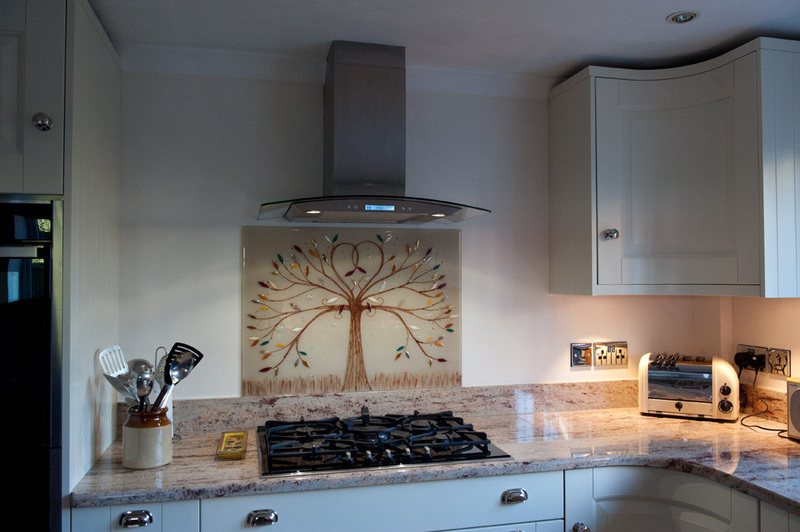 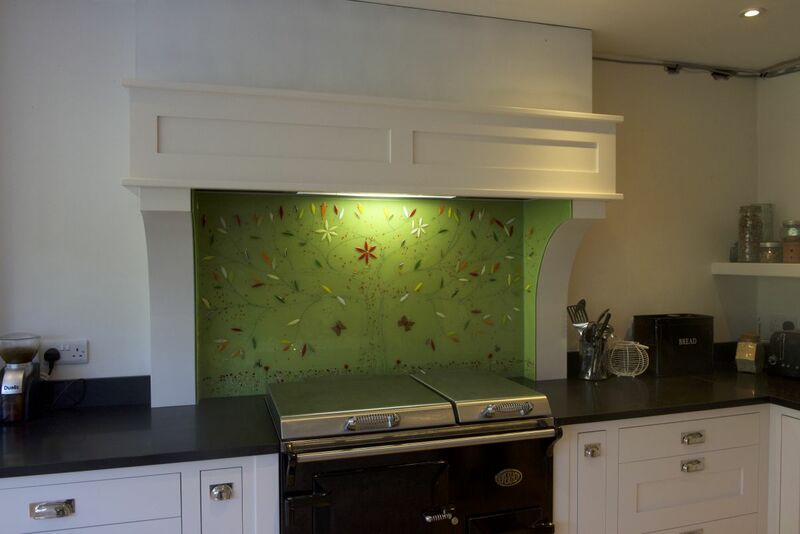 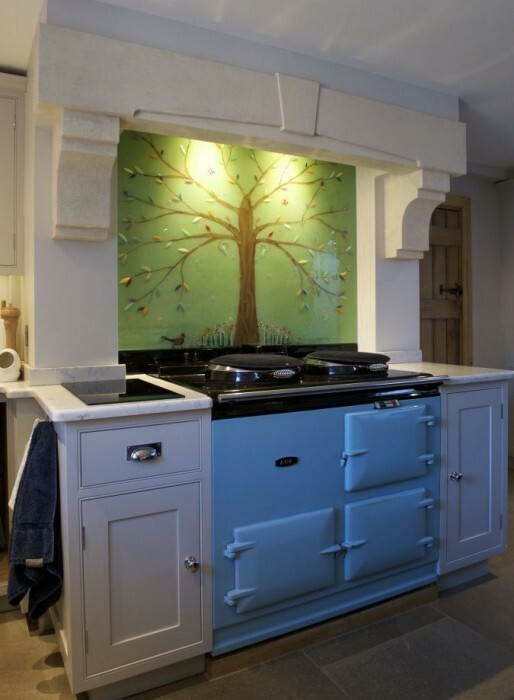 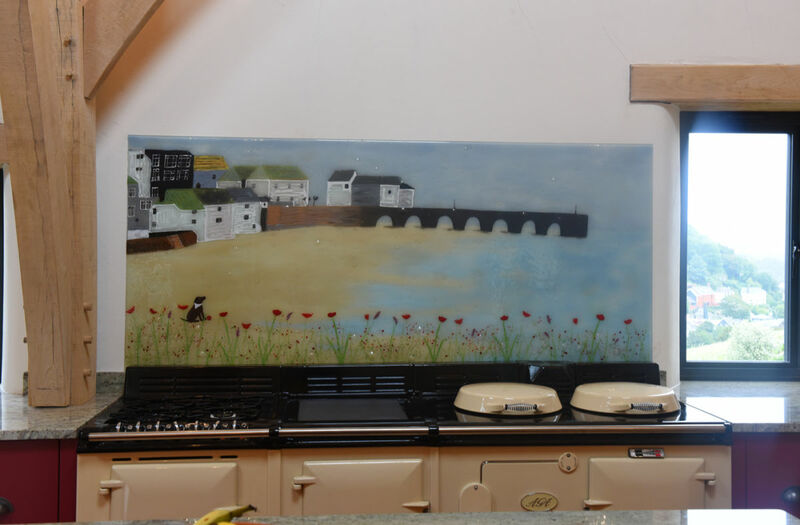 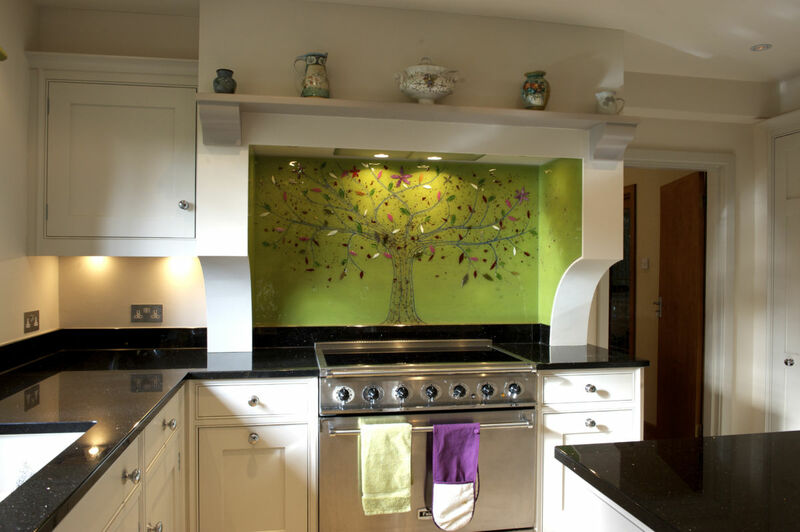 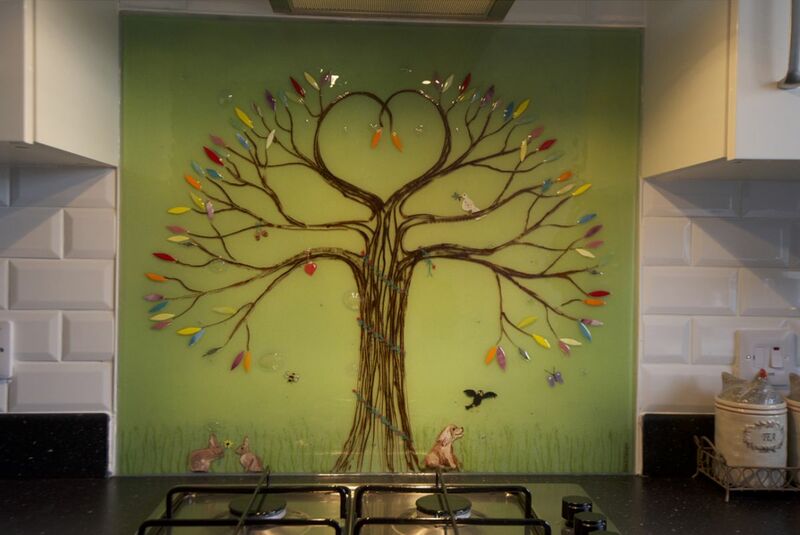 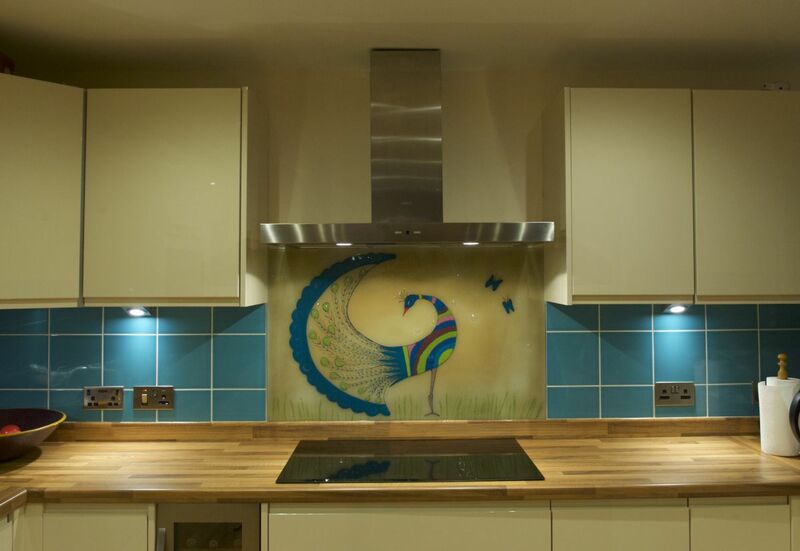 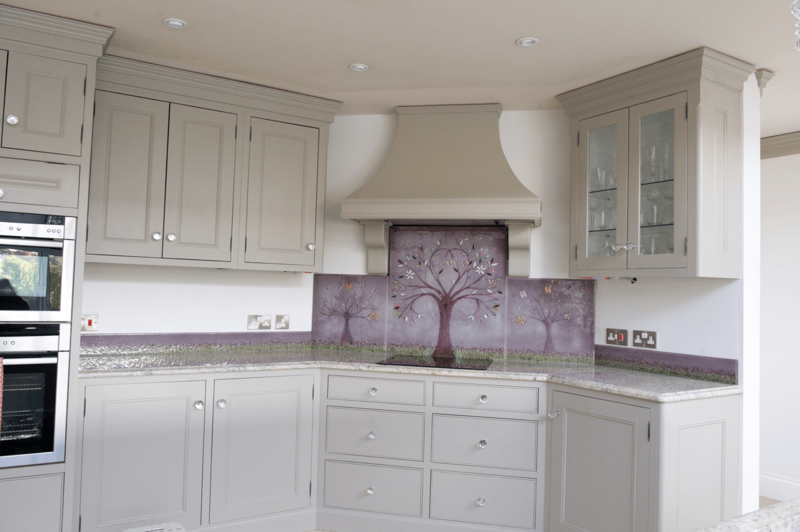 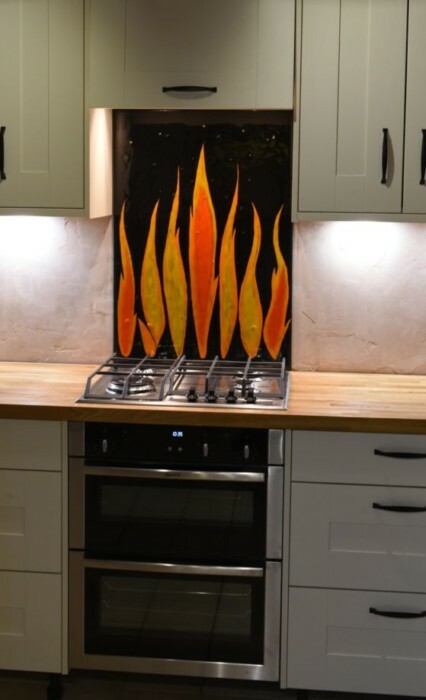 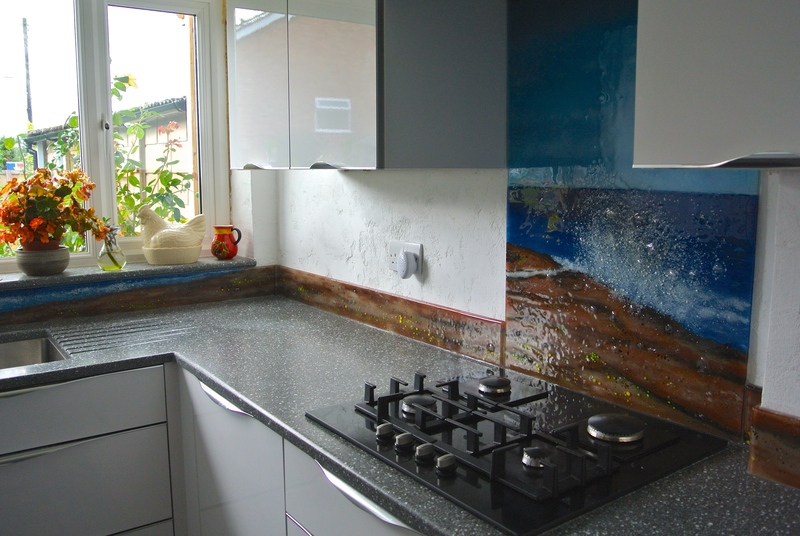 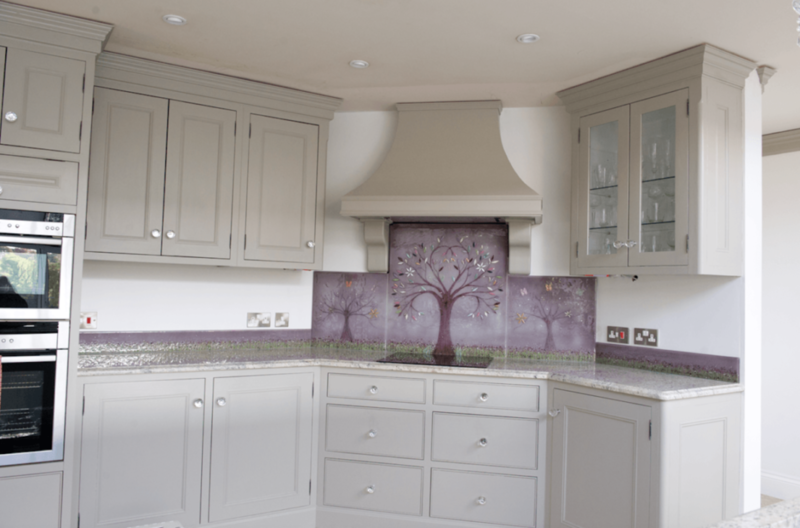 This lovely splashback in Meriden was requested by a client who had seen a piece we’d done before and wanted something just like it, albeit with some unique little additions. 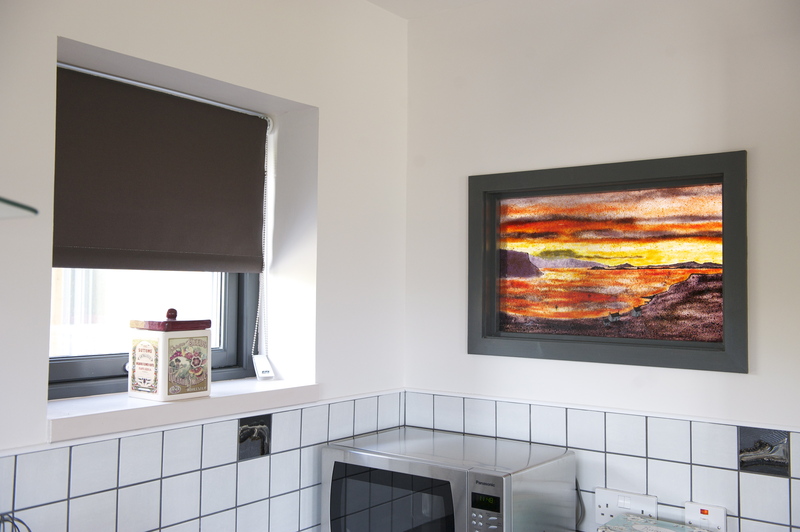 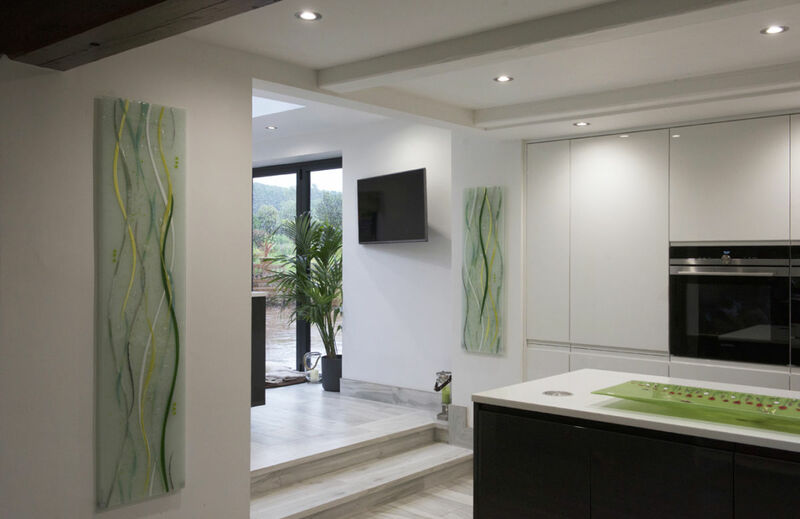 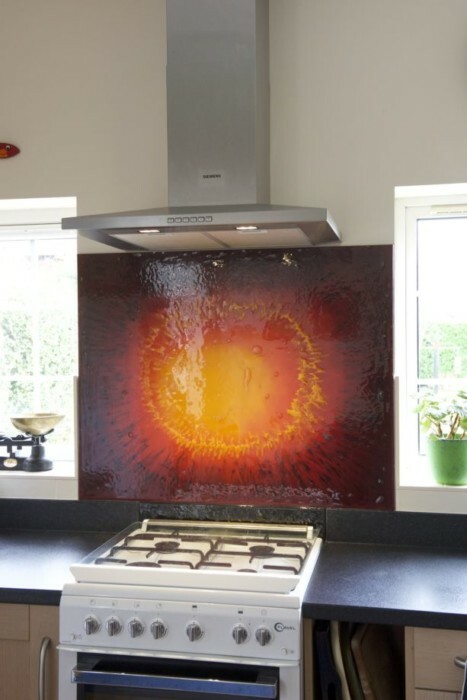 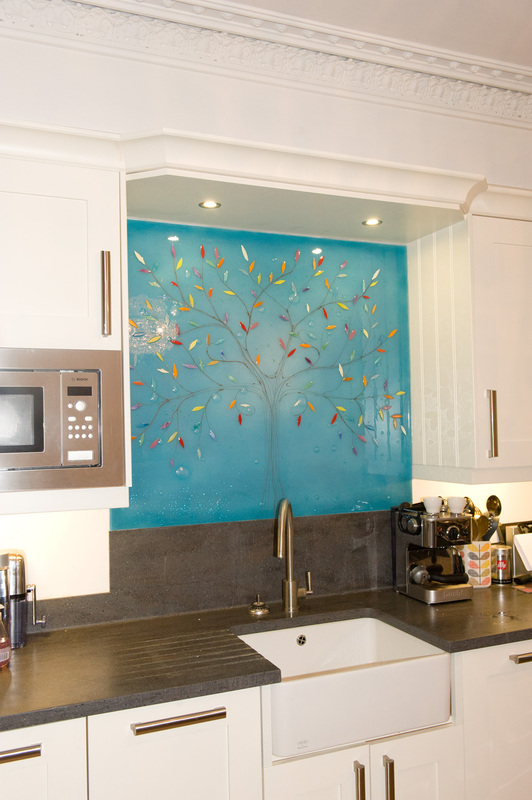 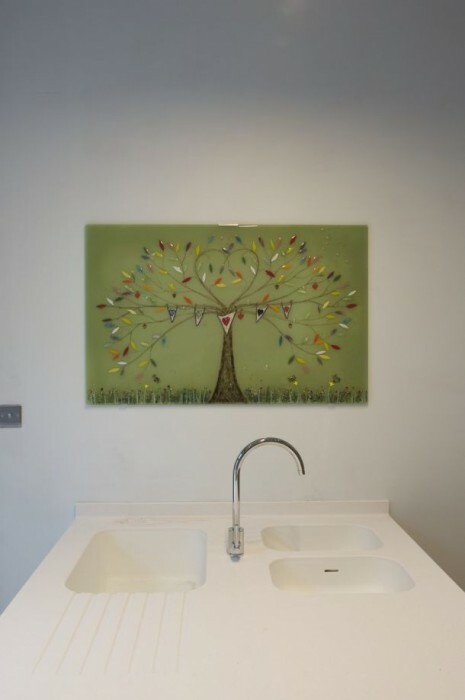 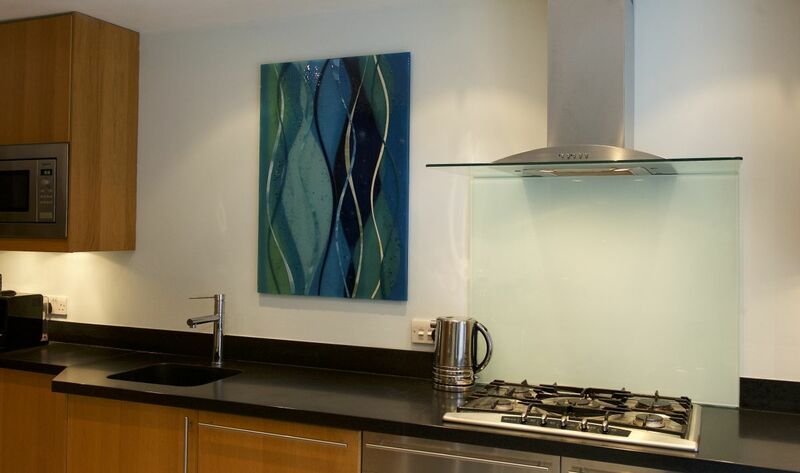 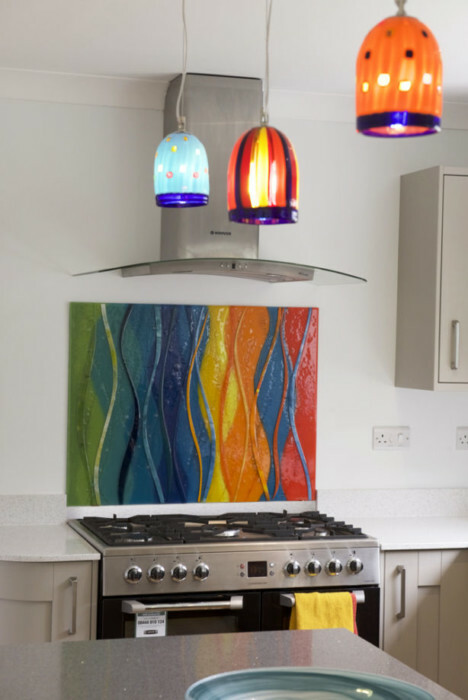 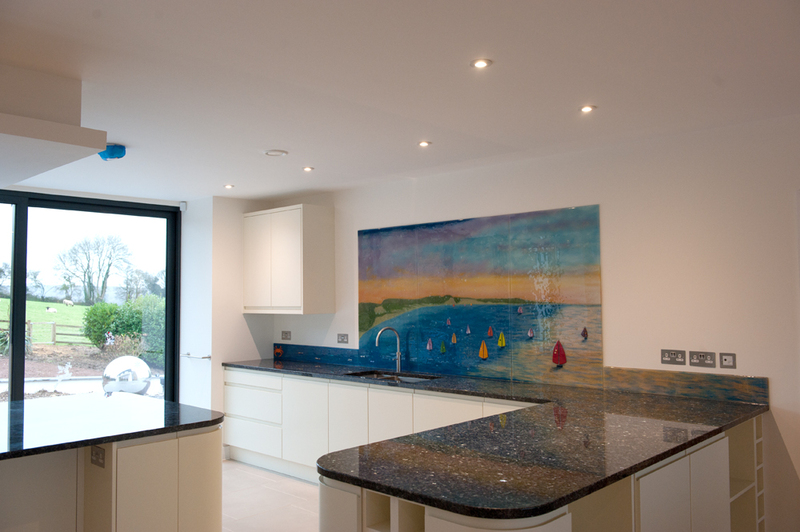 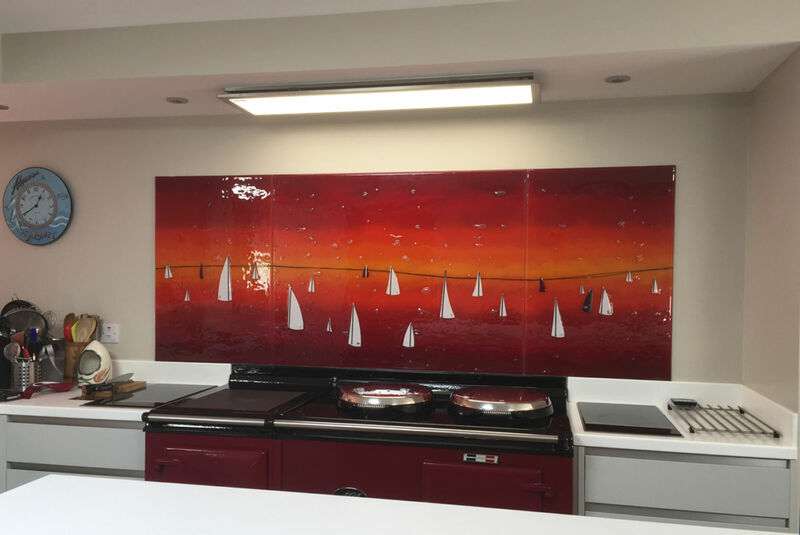 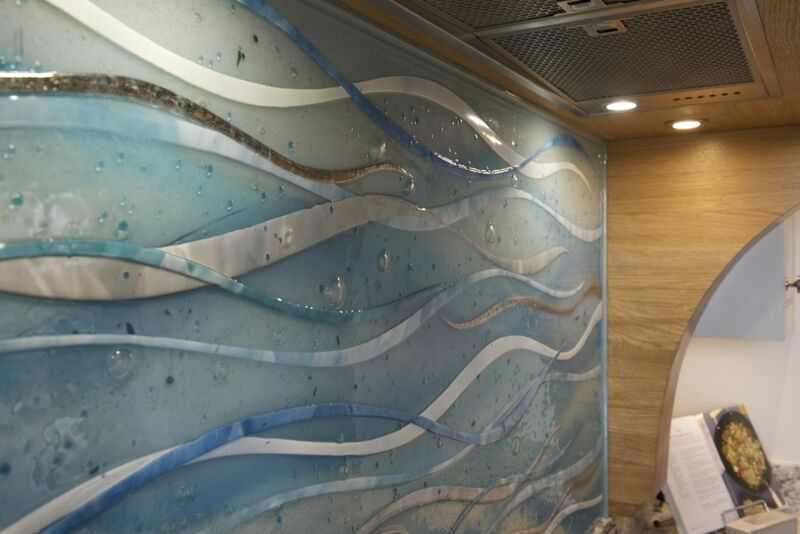 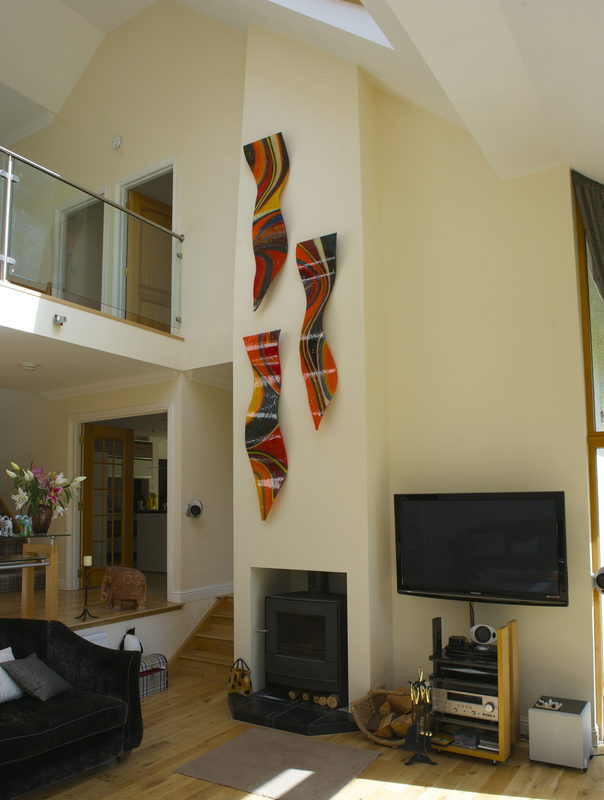 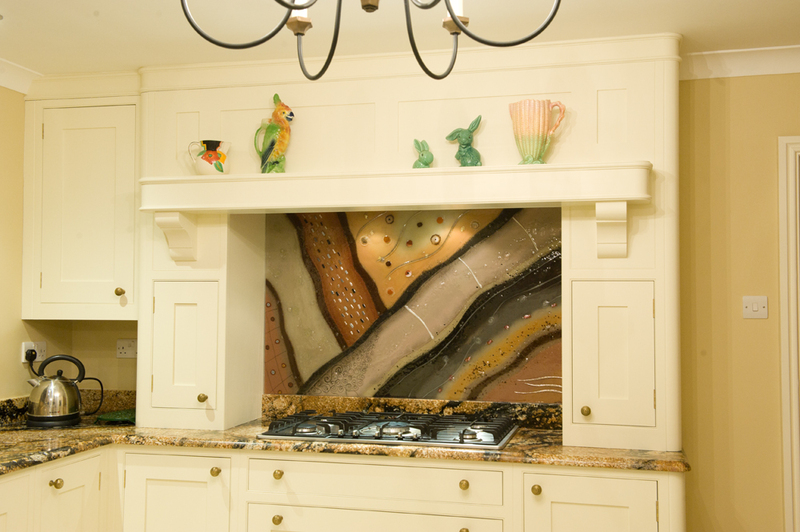 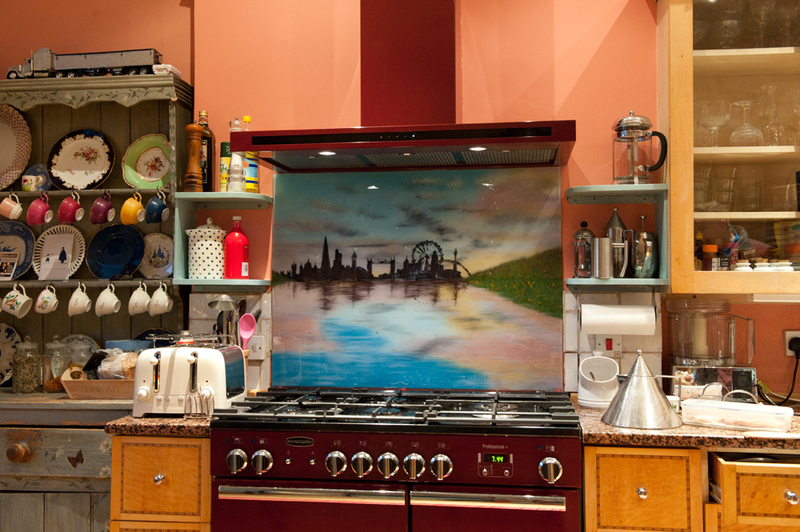 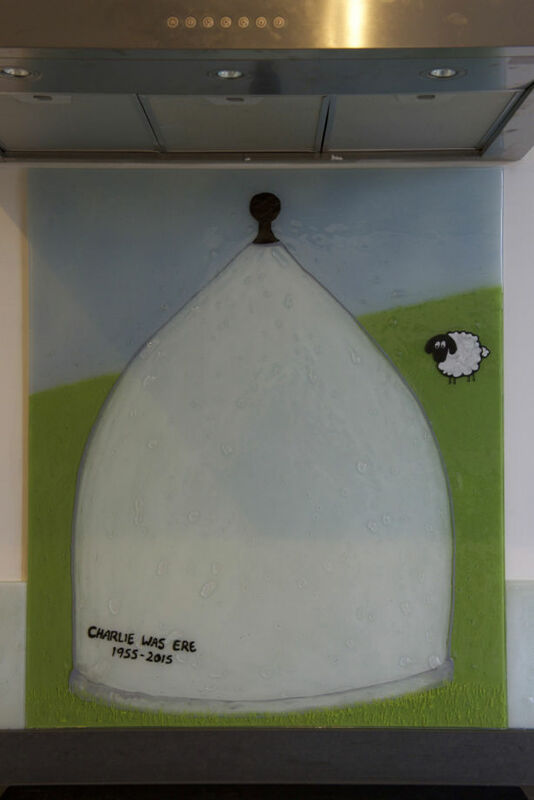 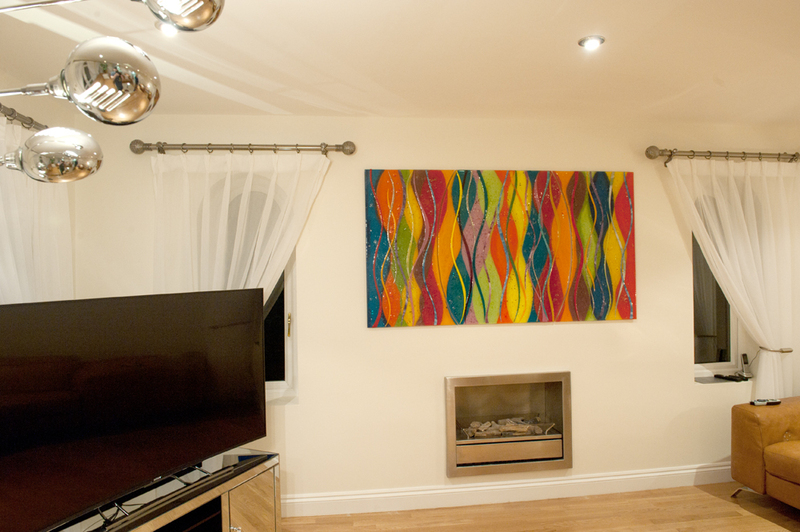 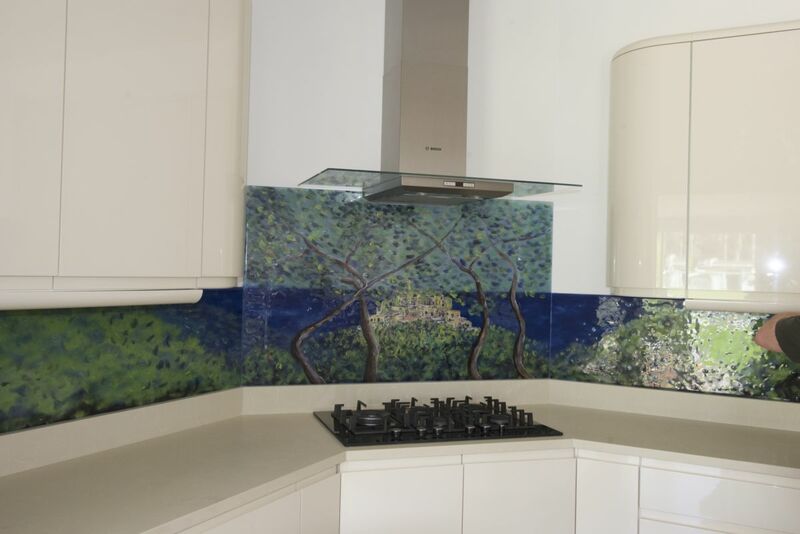 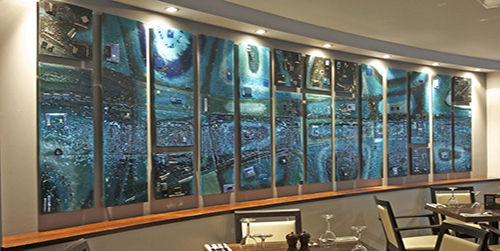 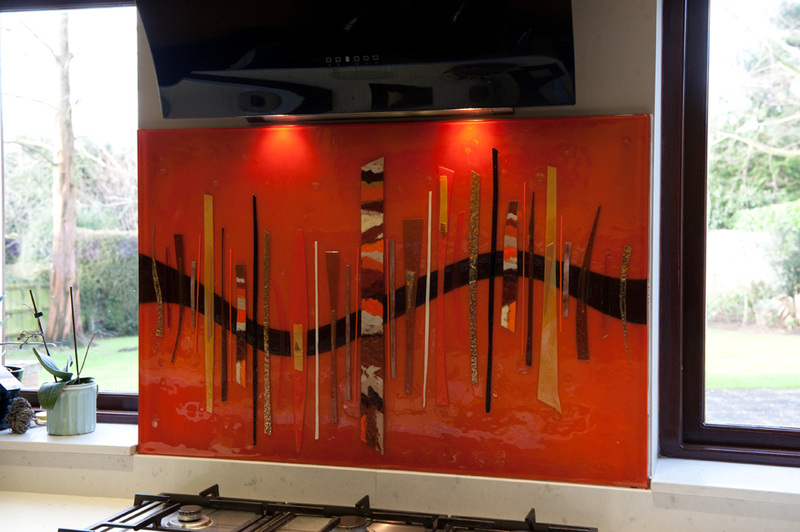 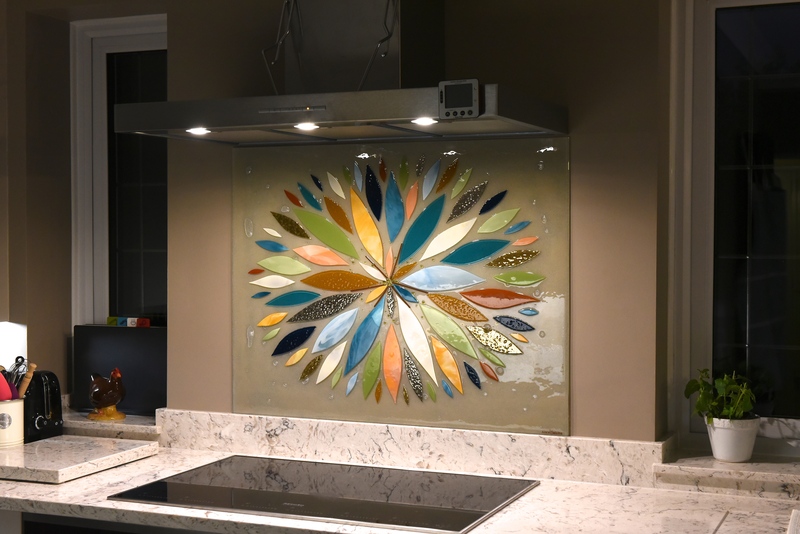 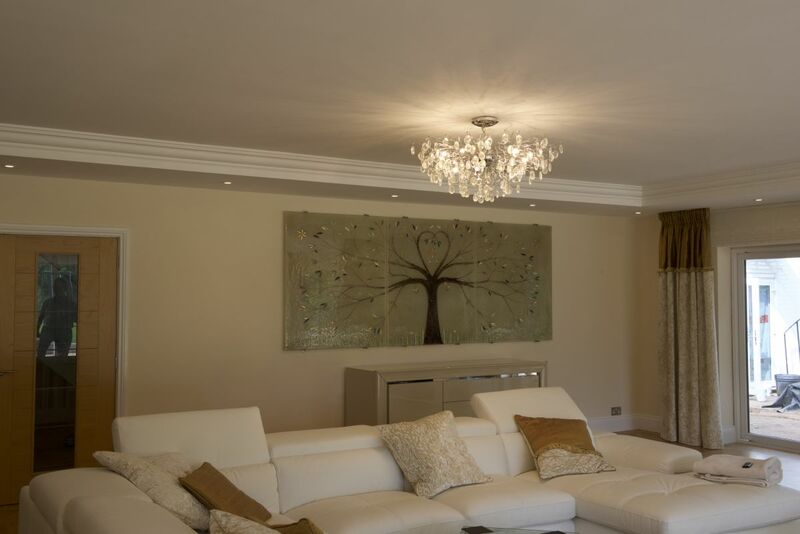 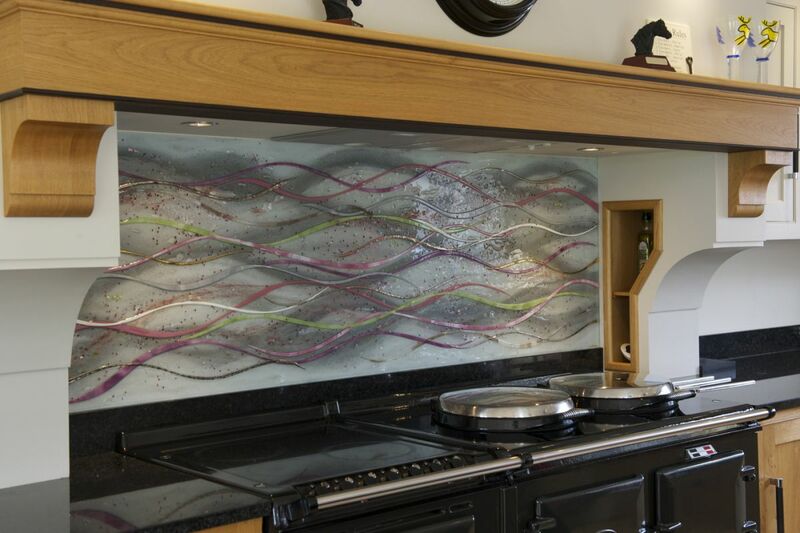 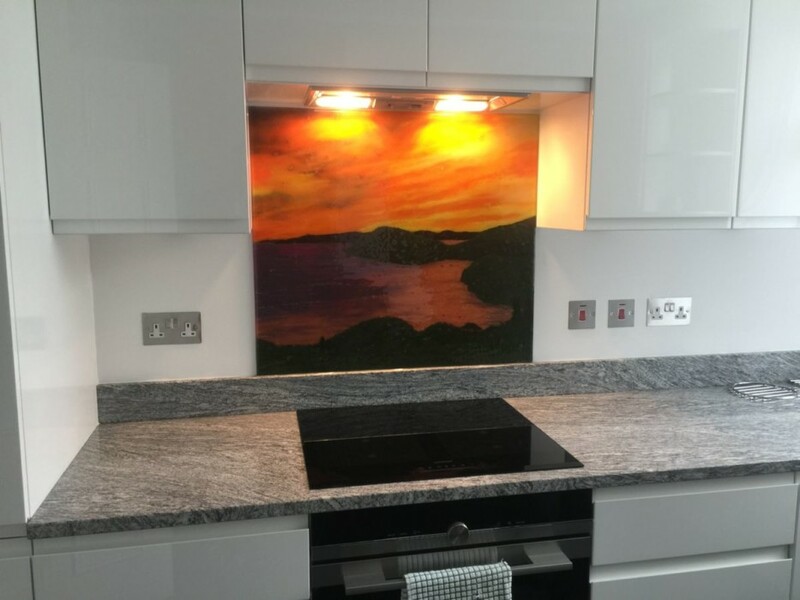 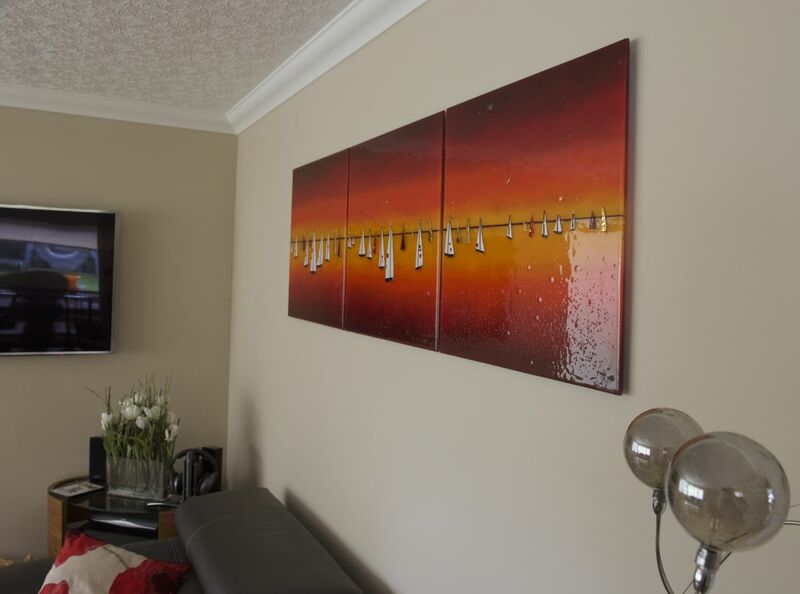 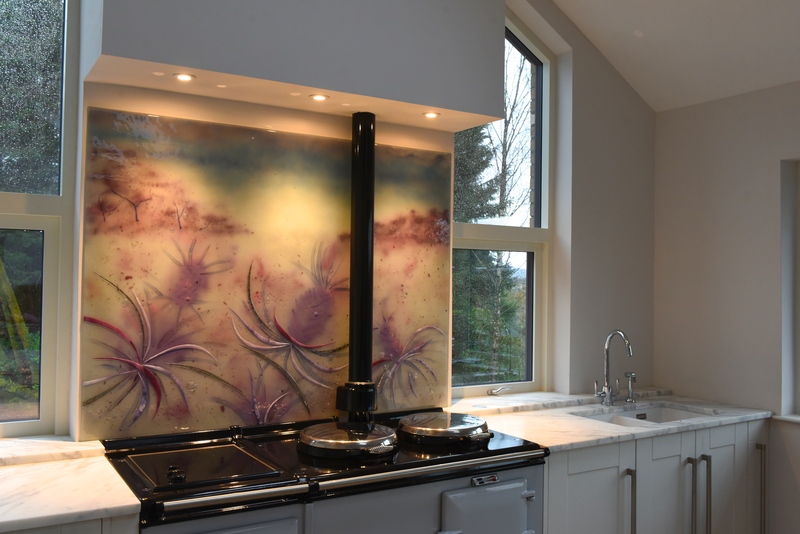 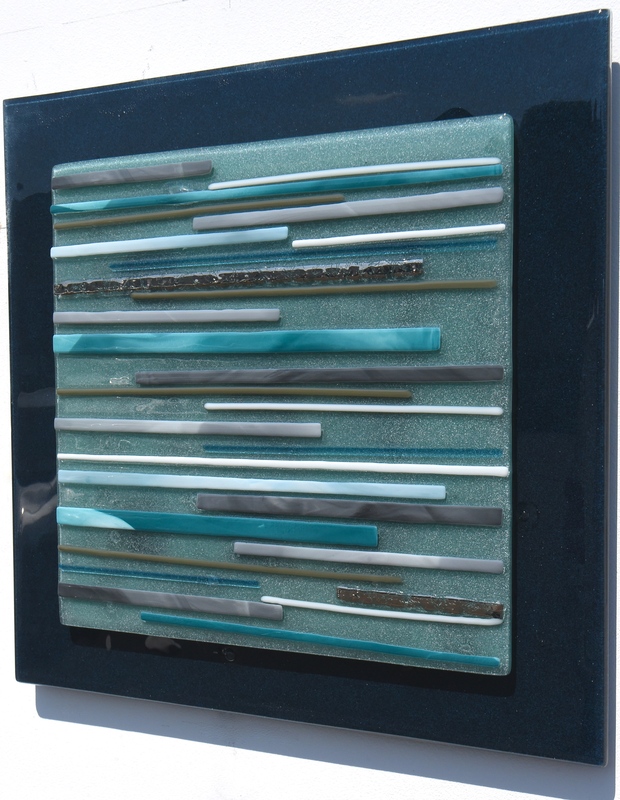 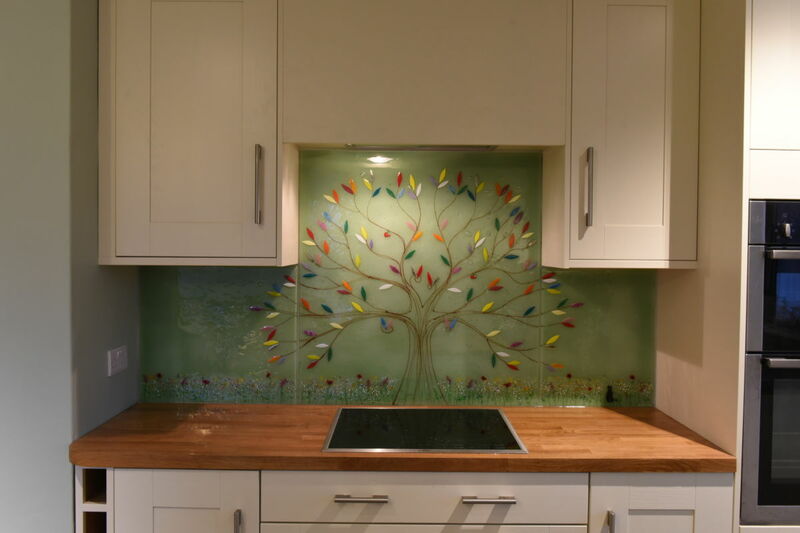 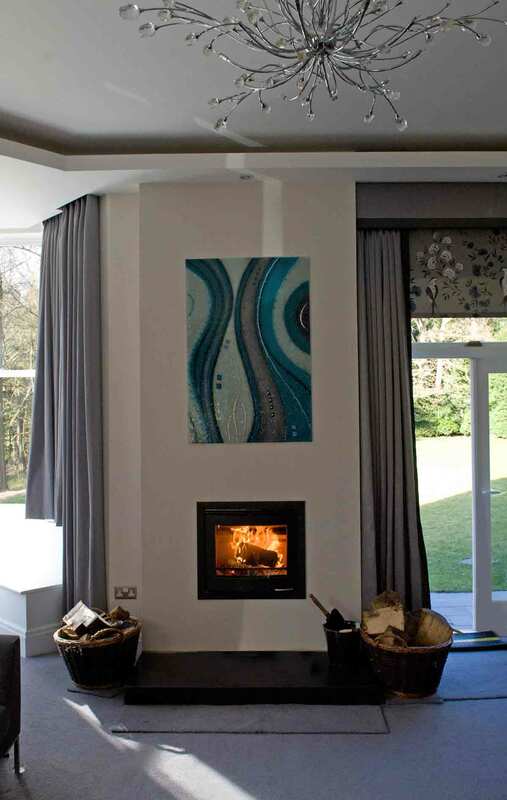 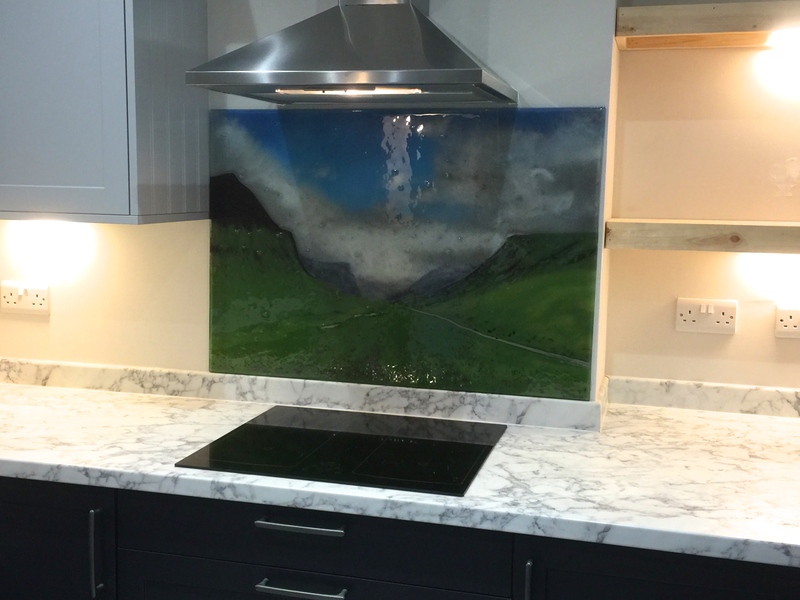 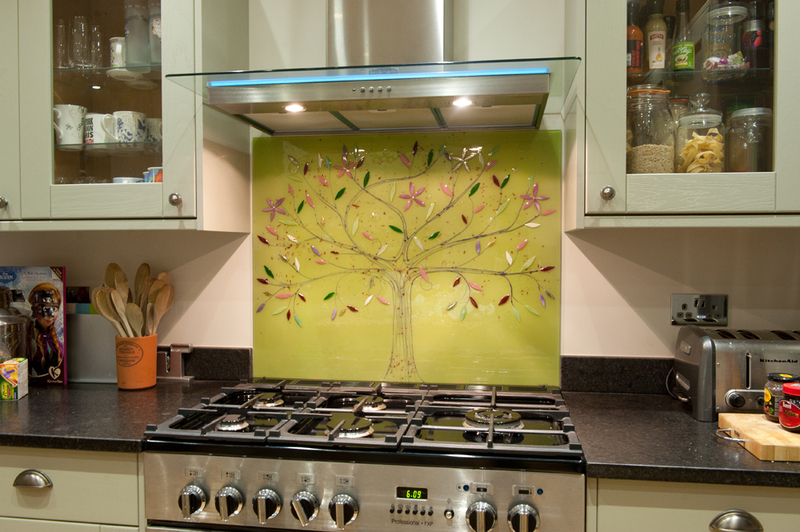 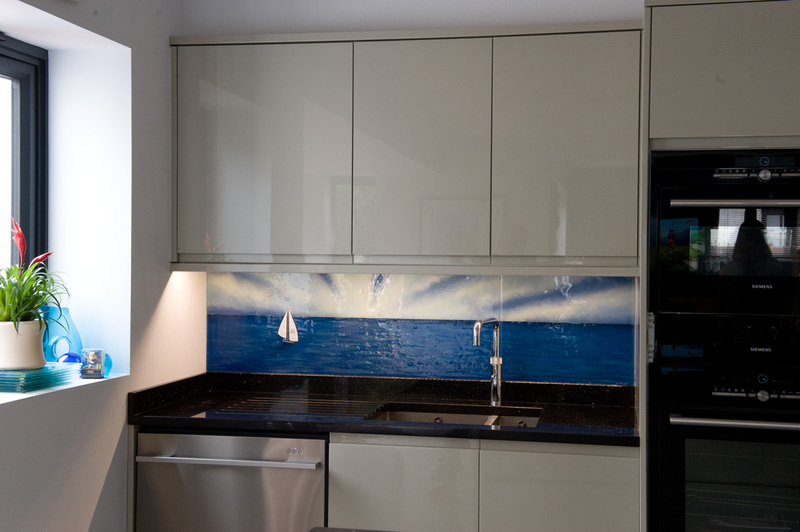 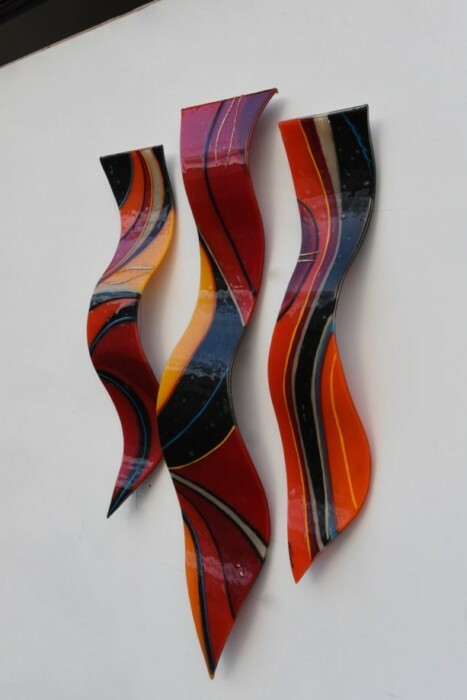 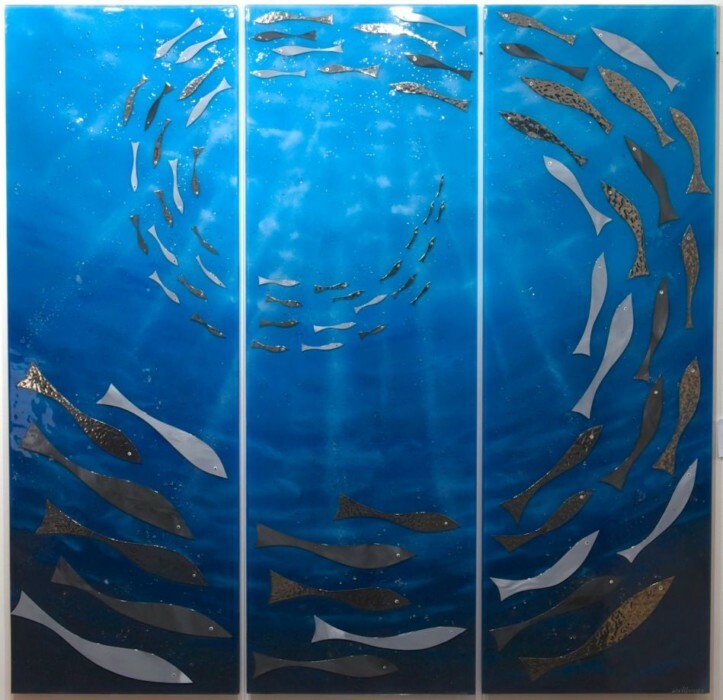 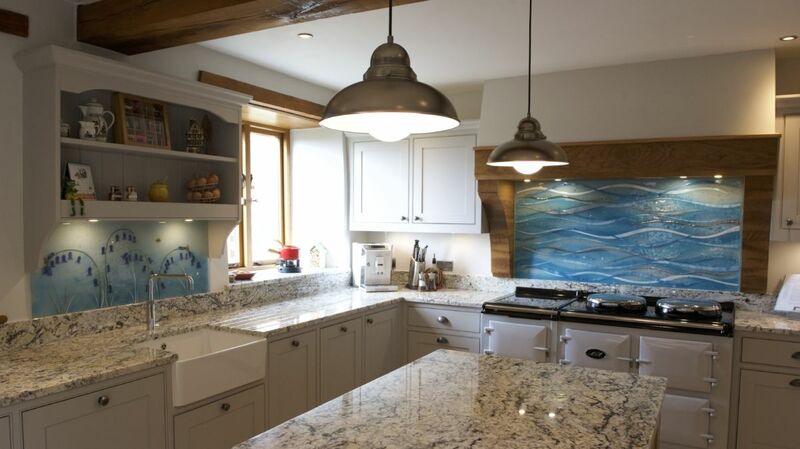 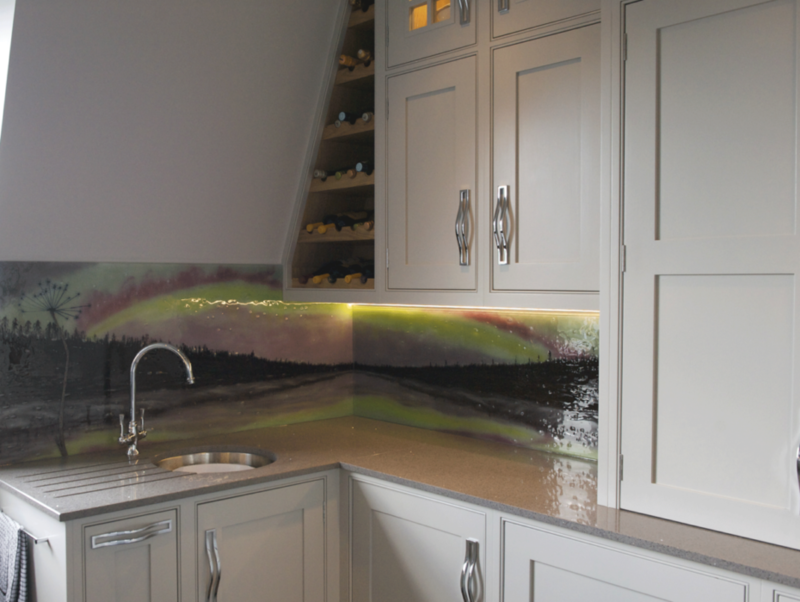 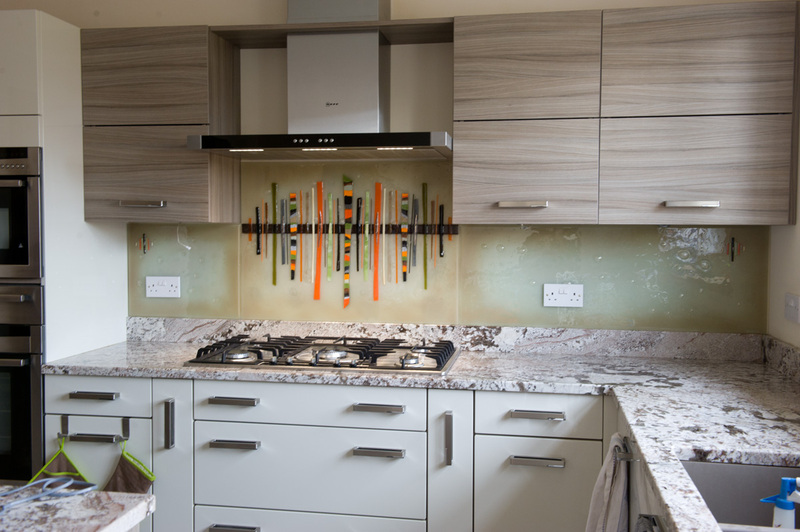 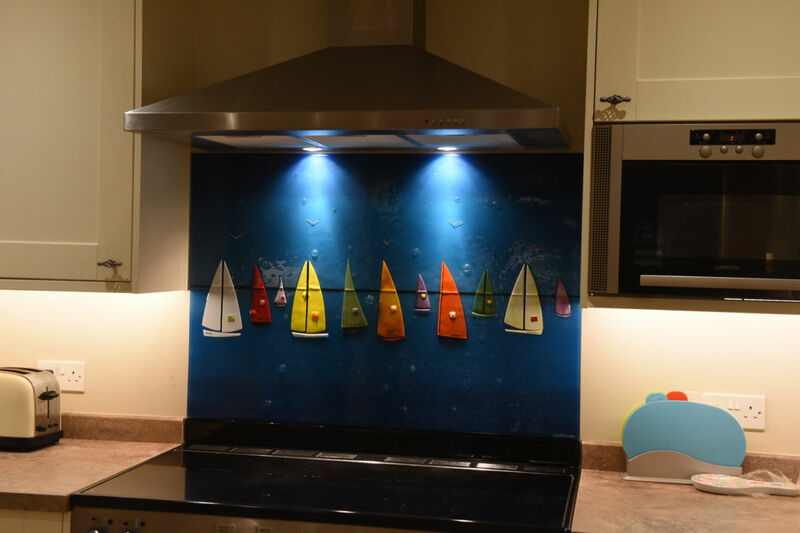 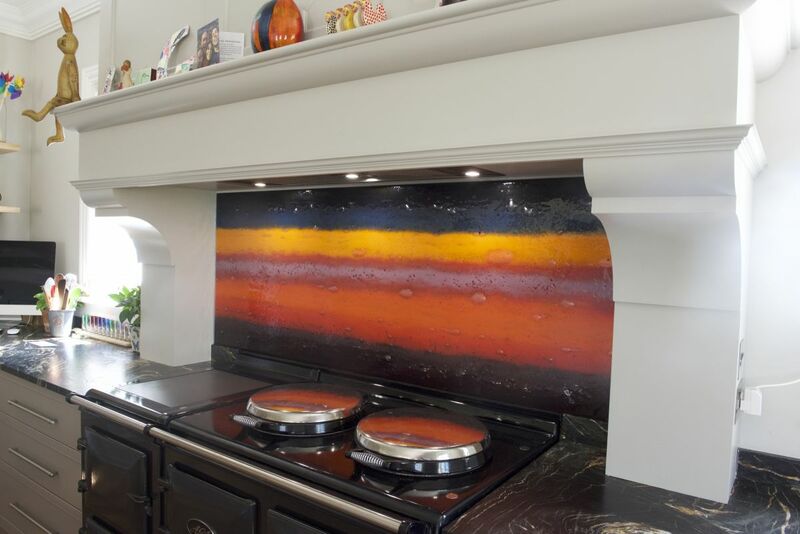 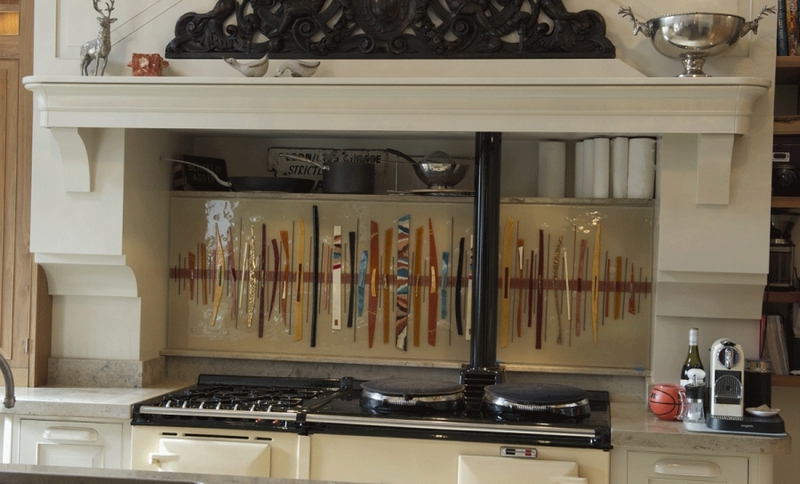 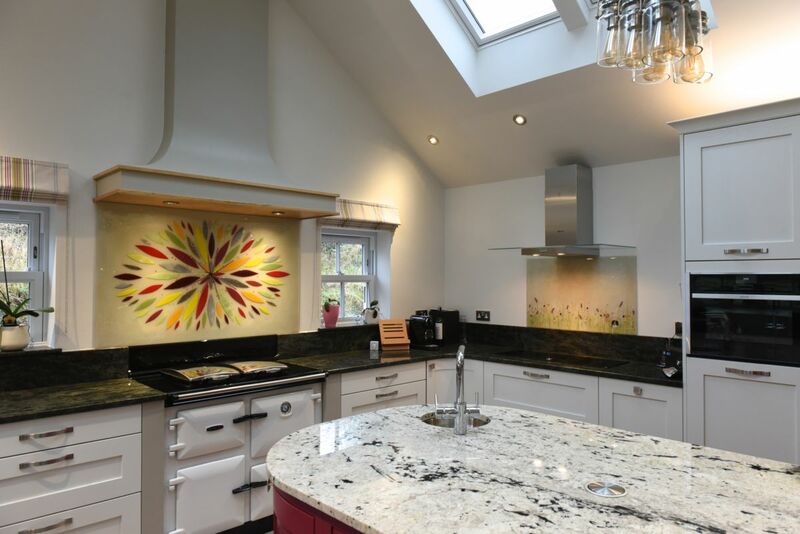 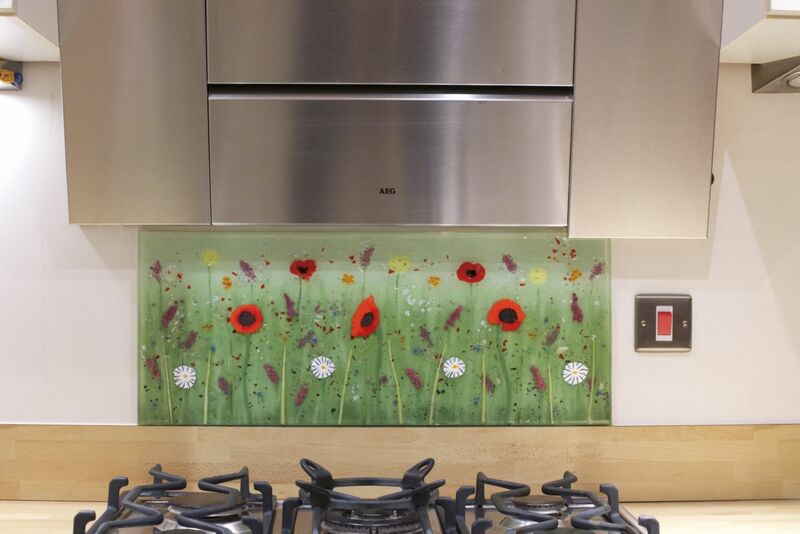 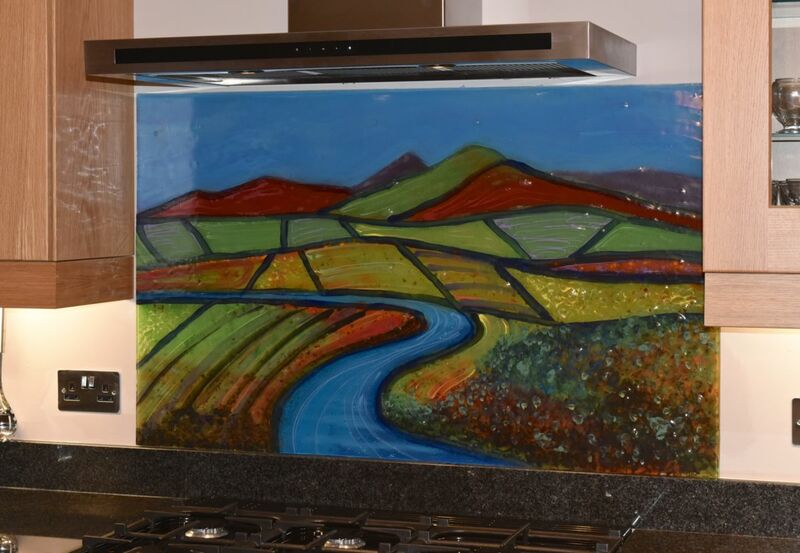 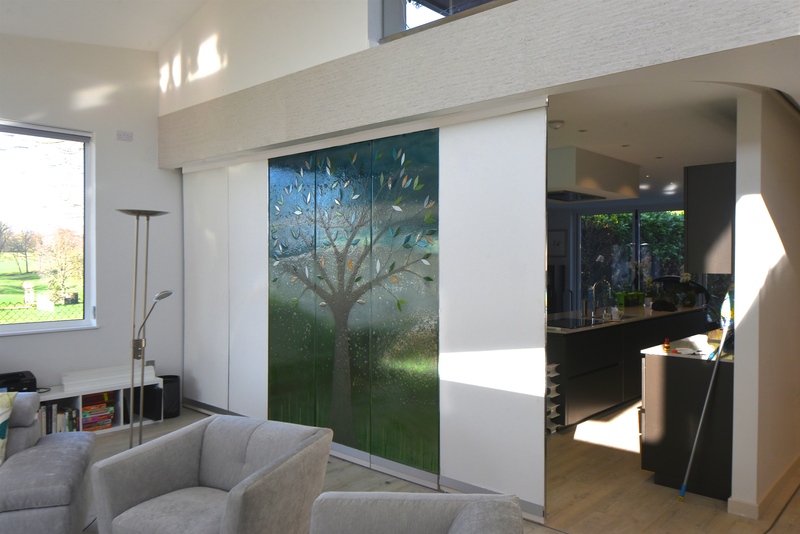 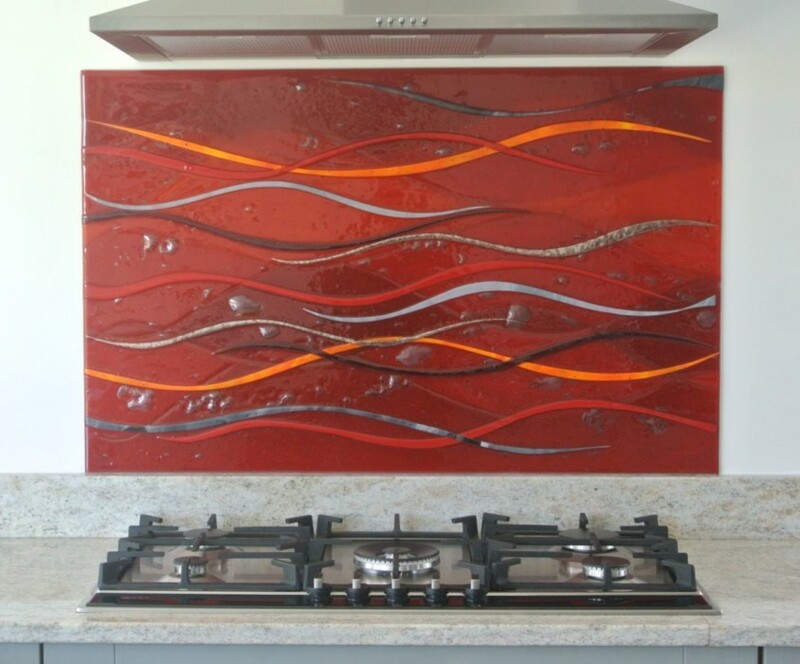 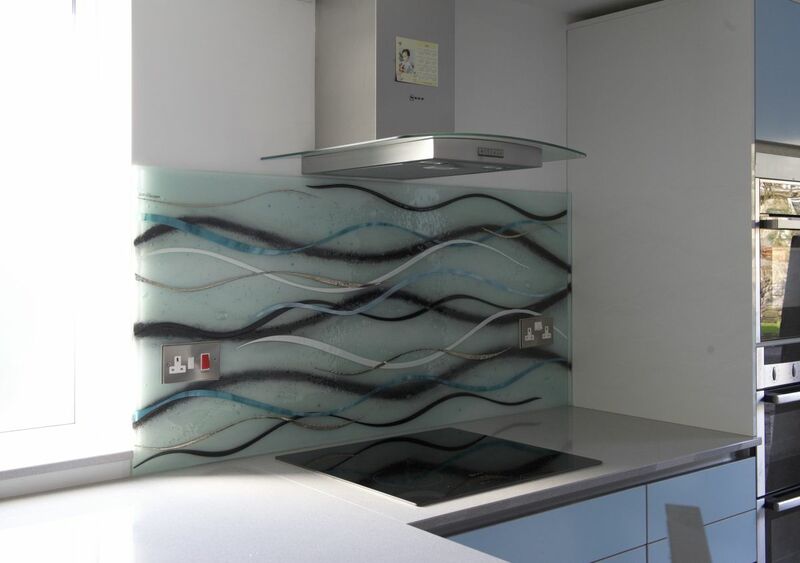 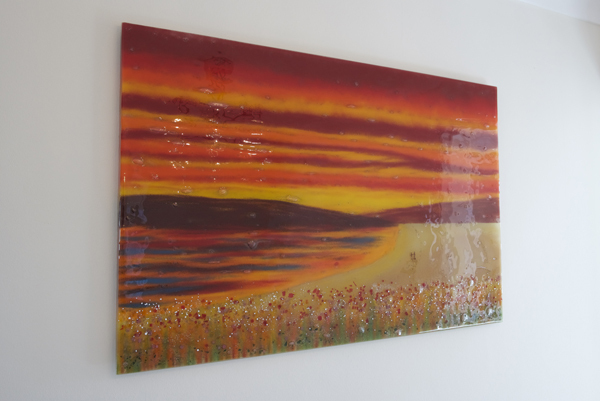 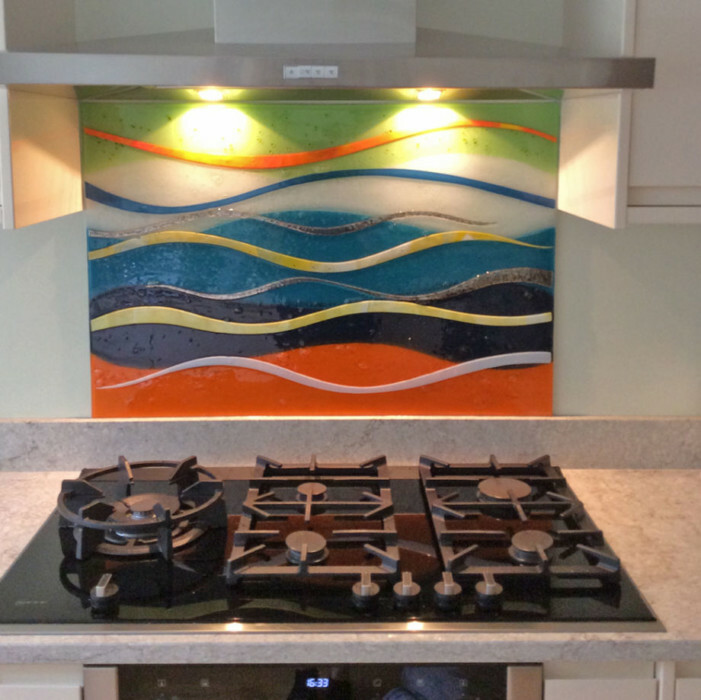 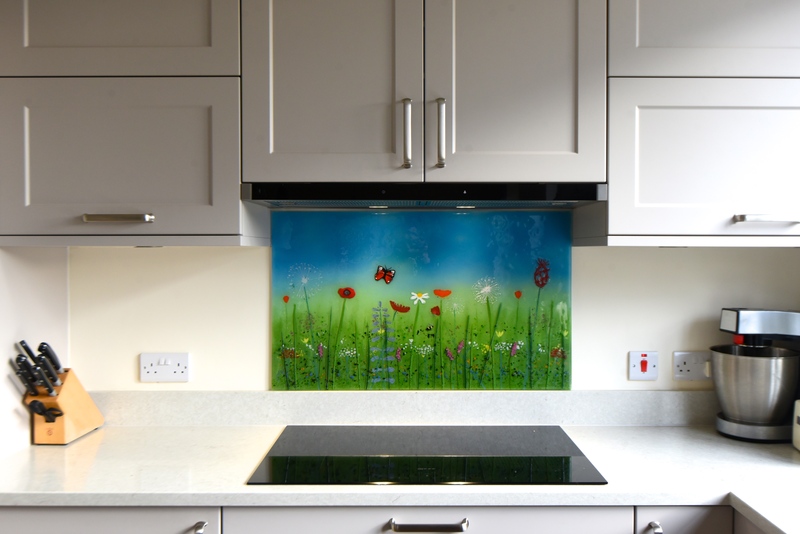 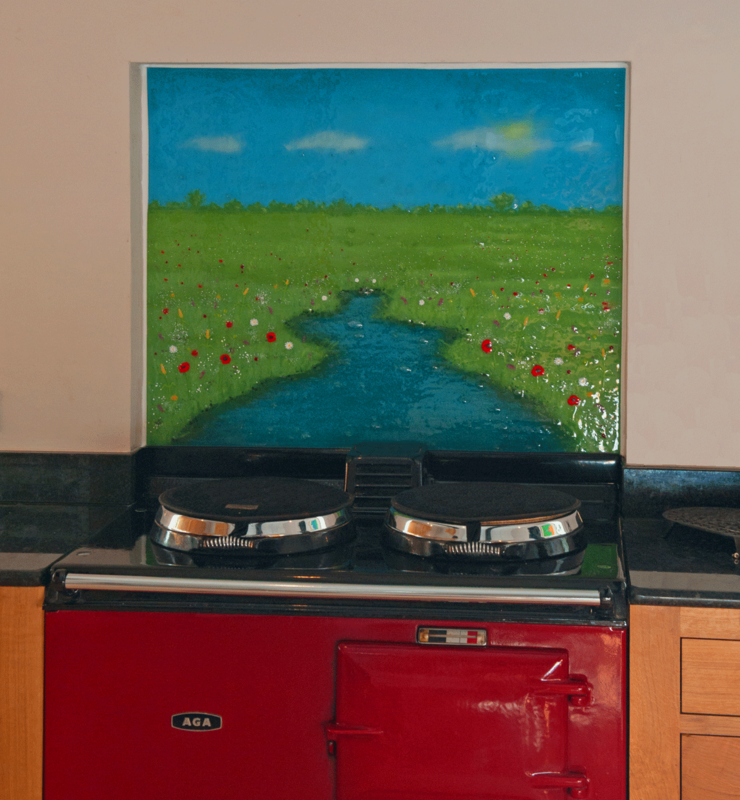 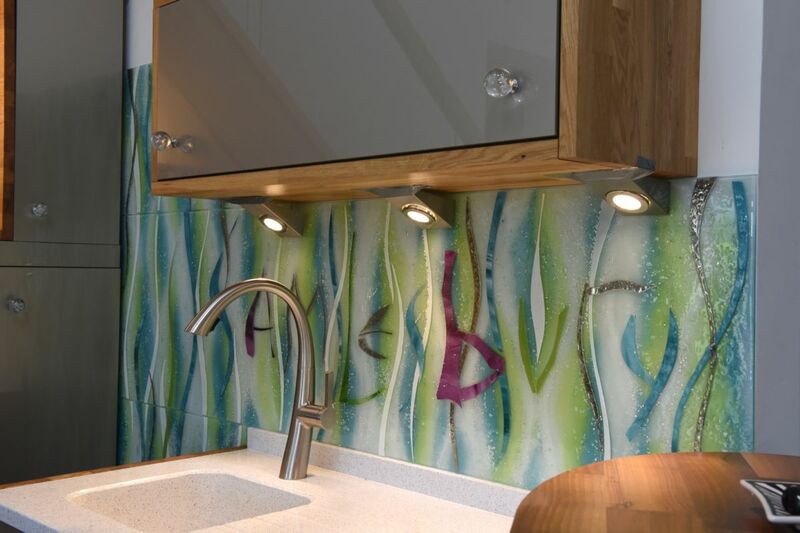 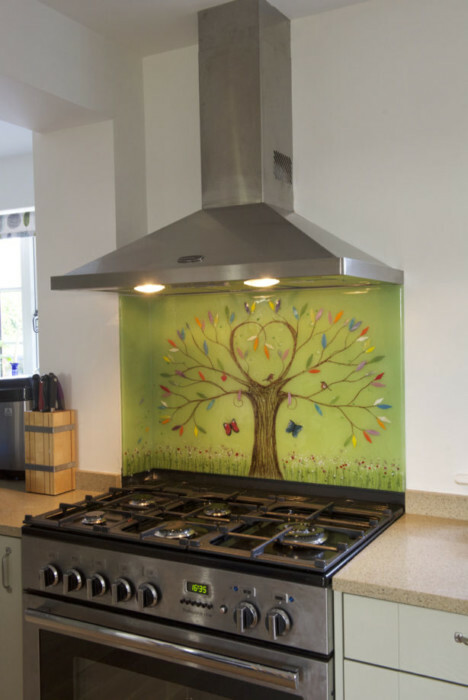 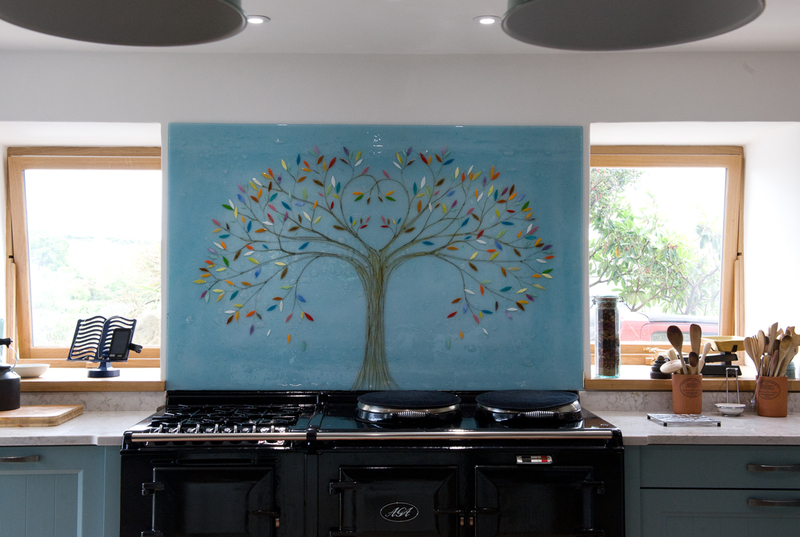 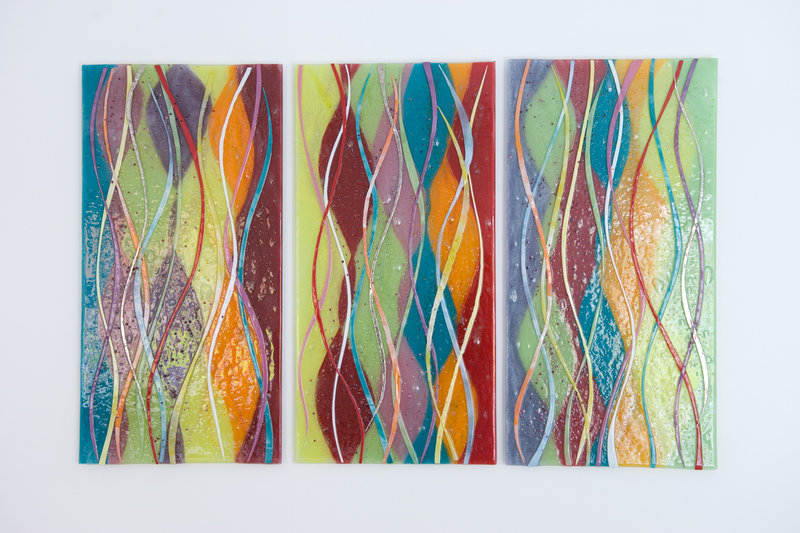 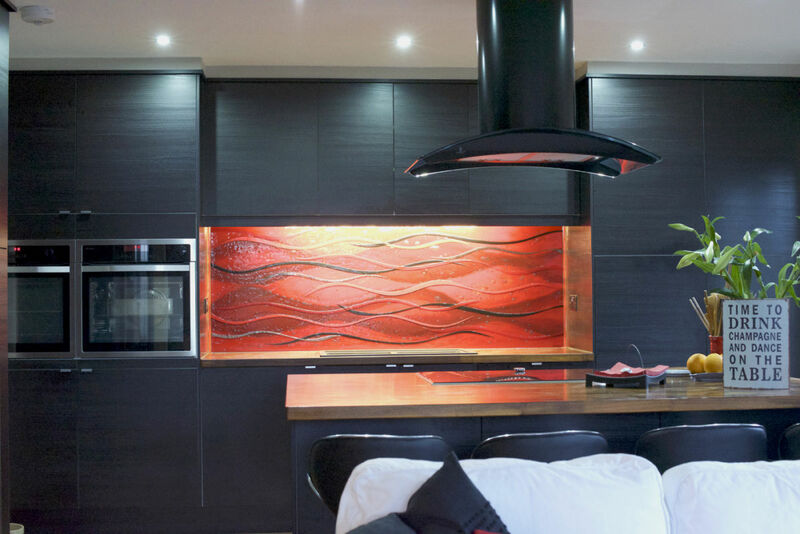 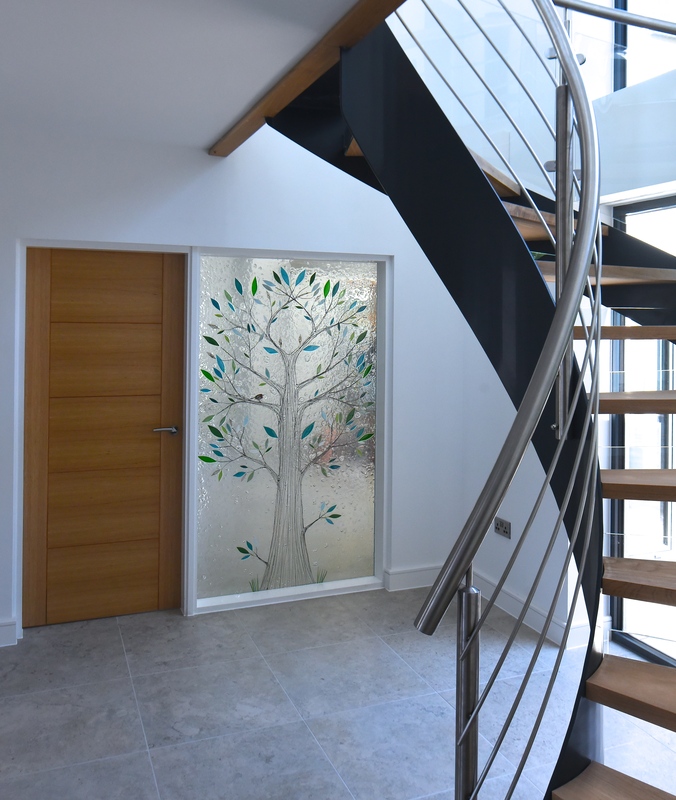 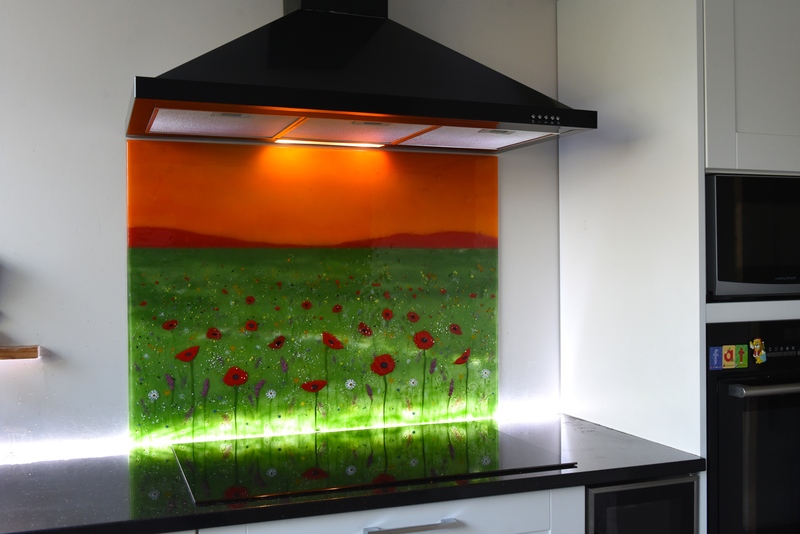 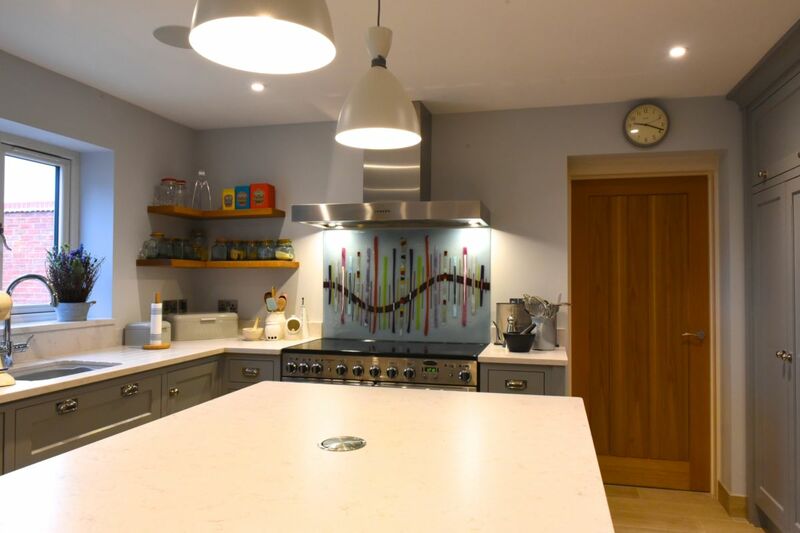 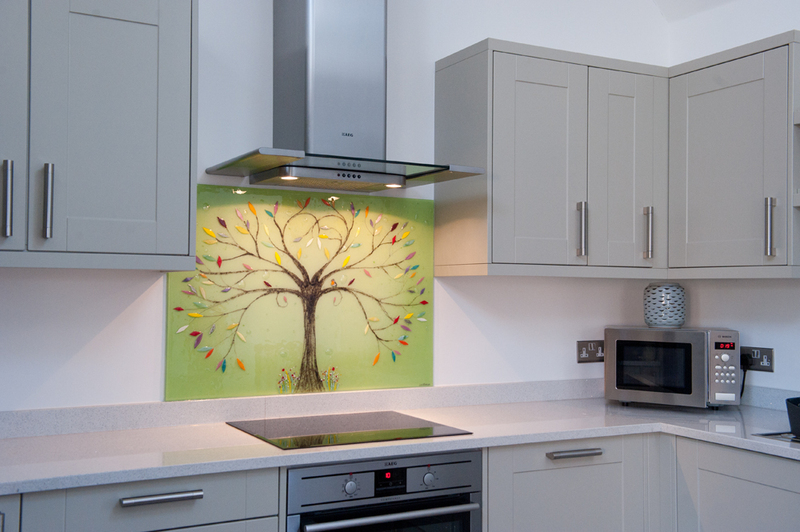 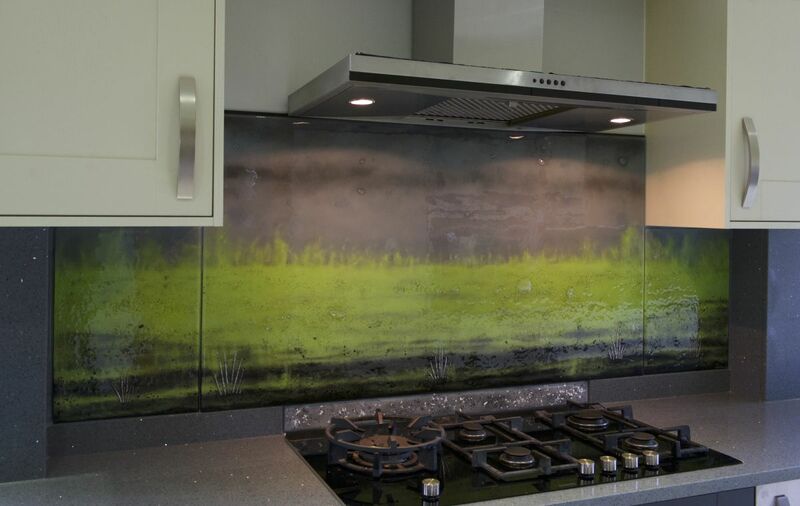 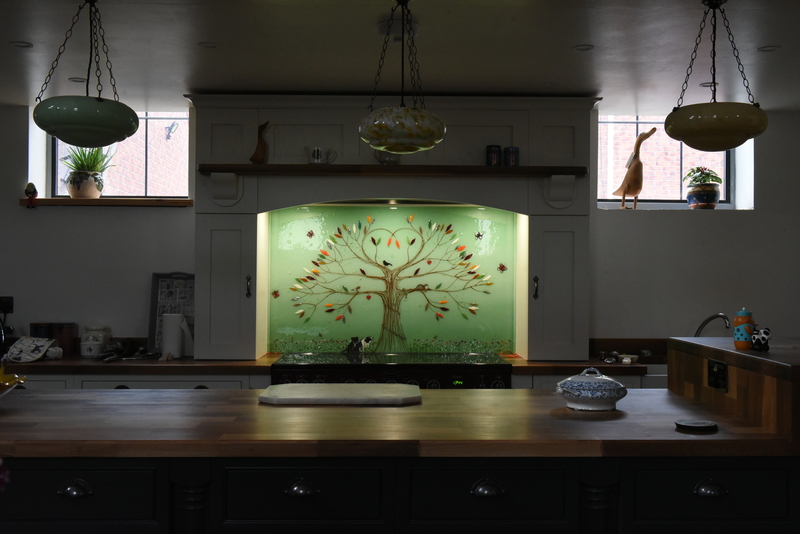 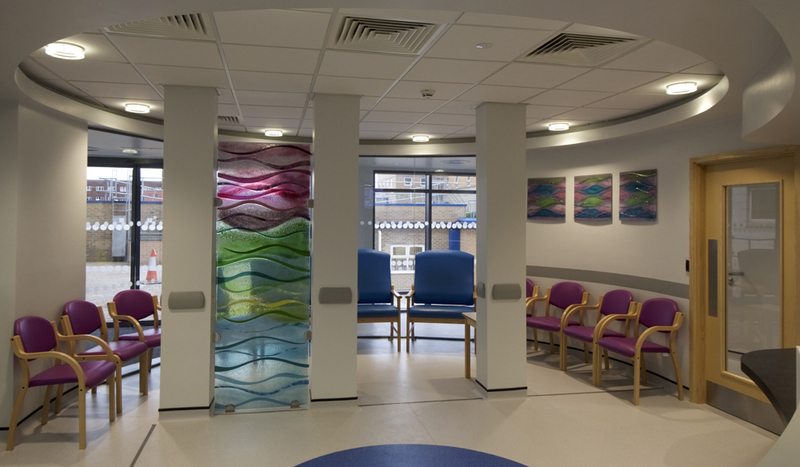 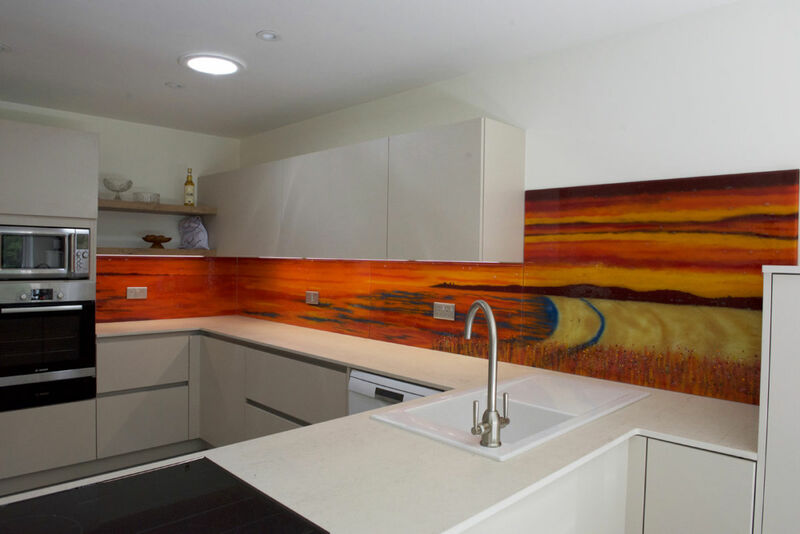 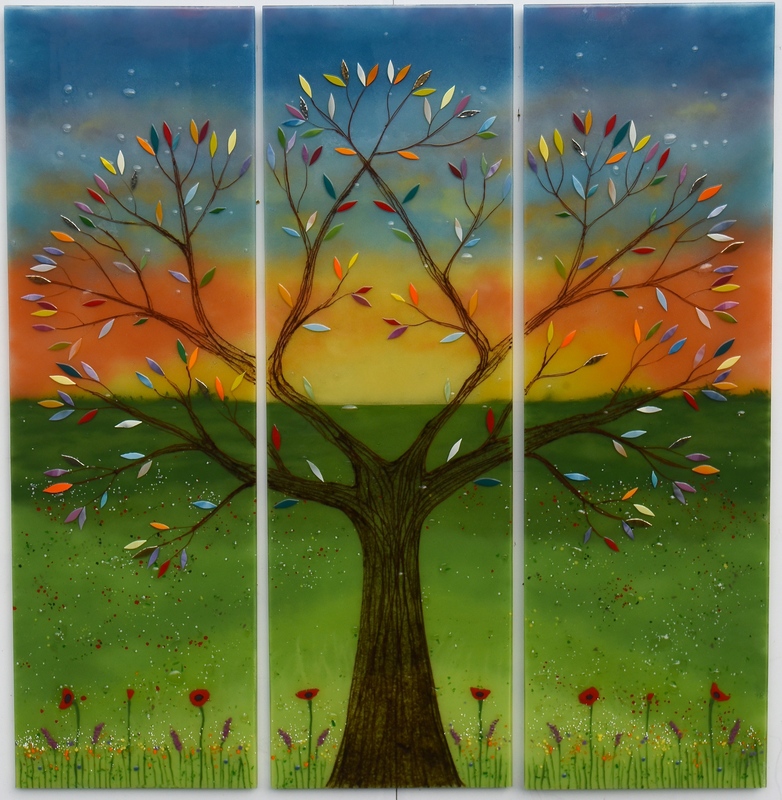 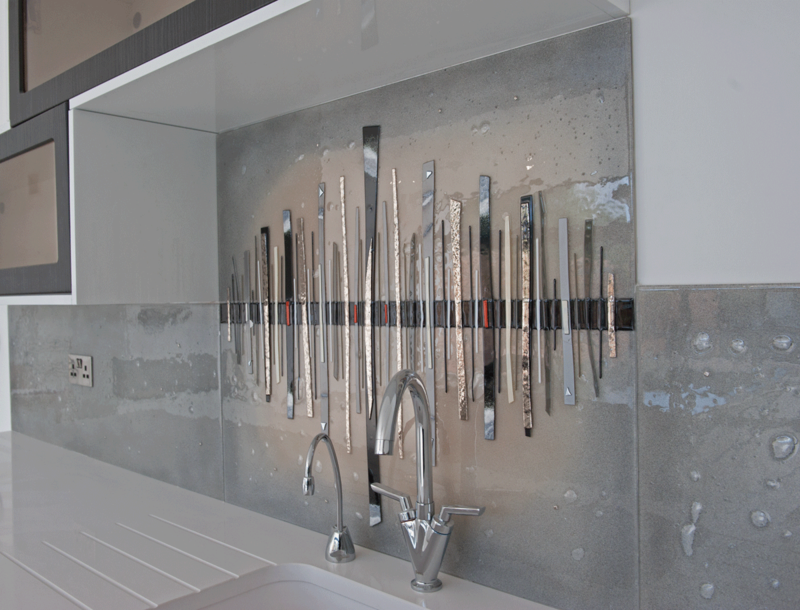 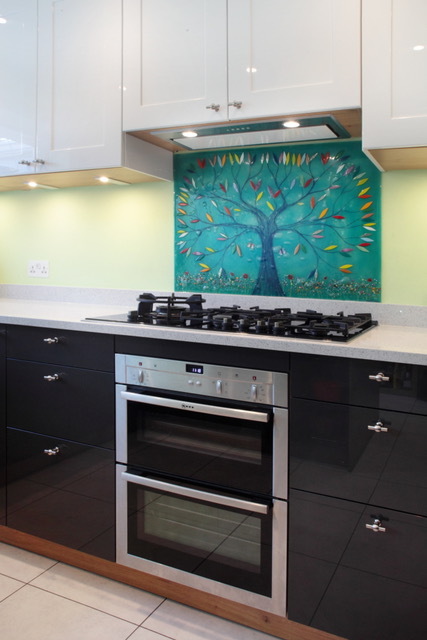 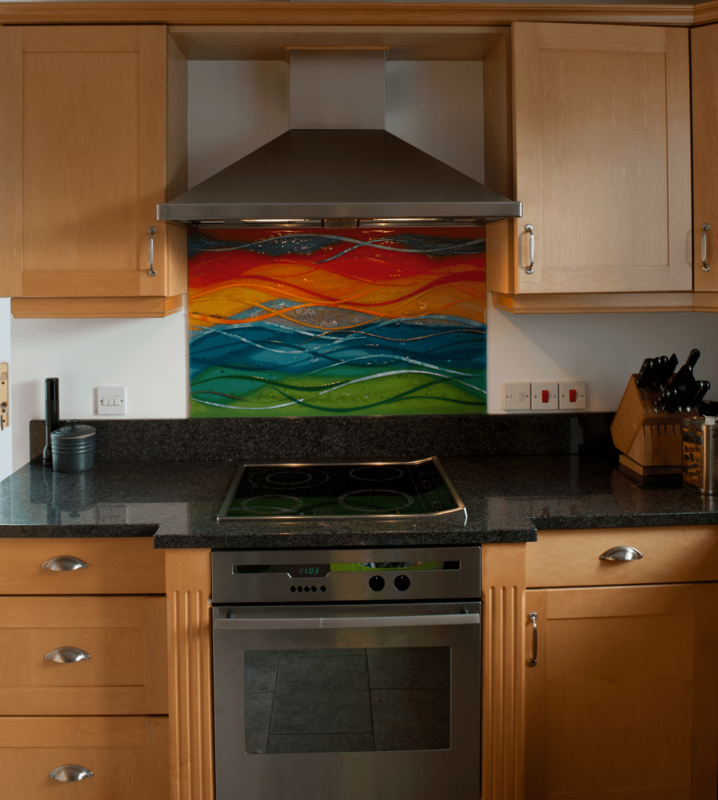 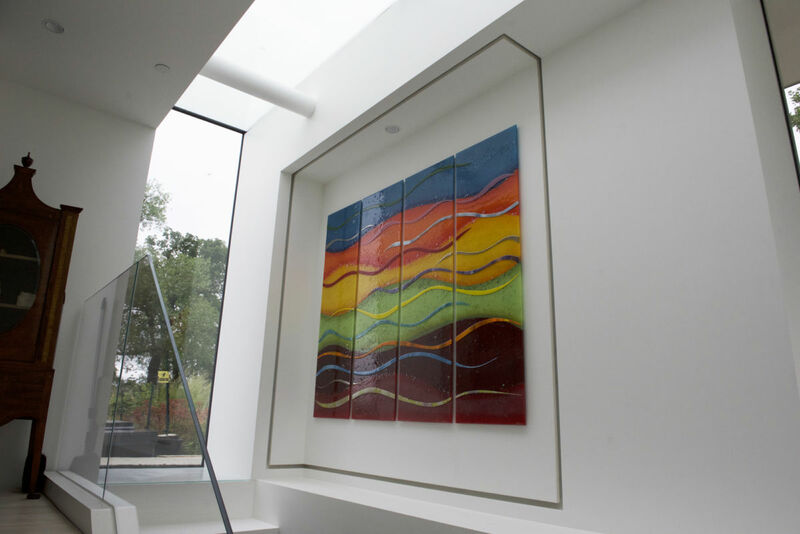 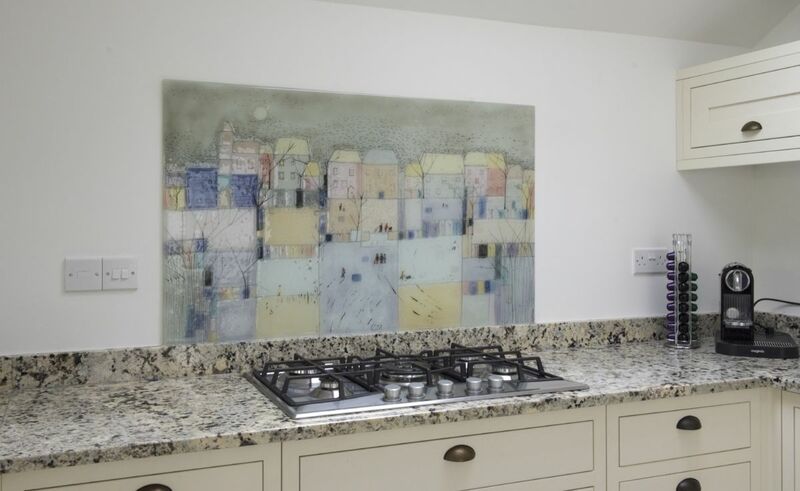 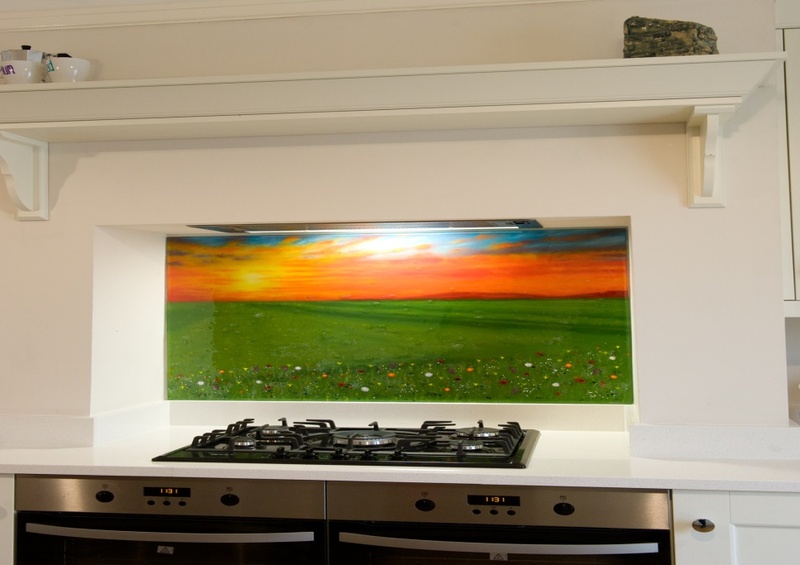 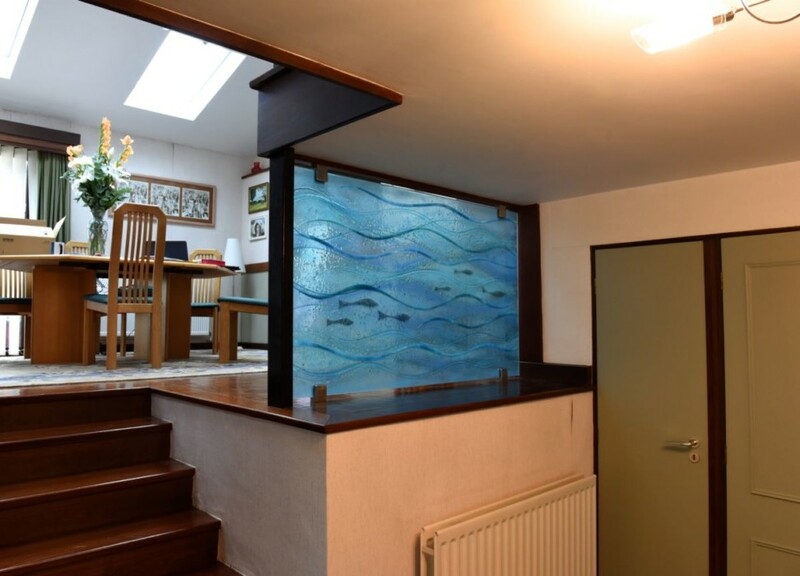 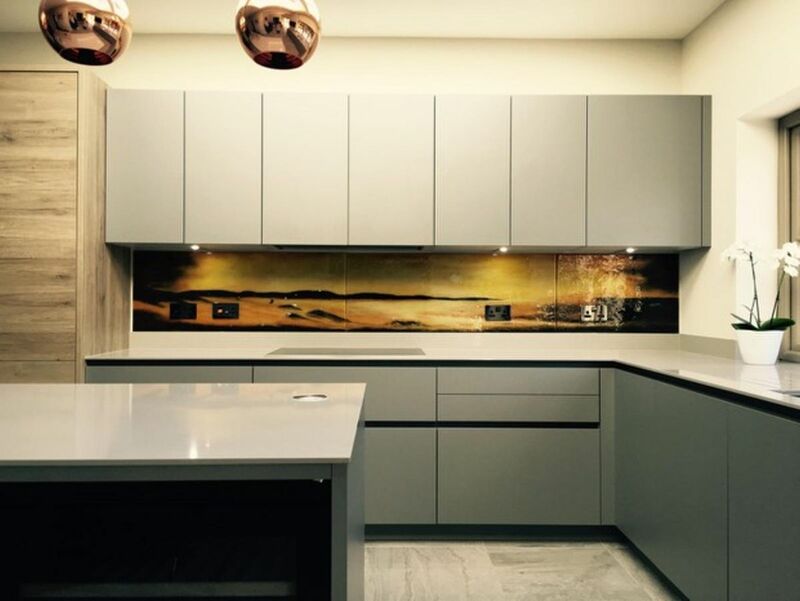 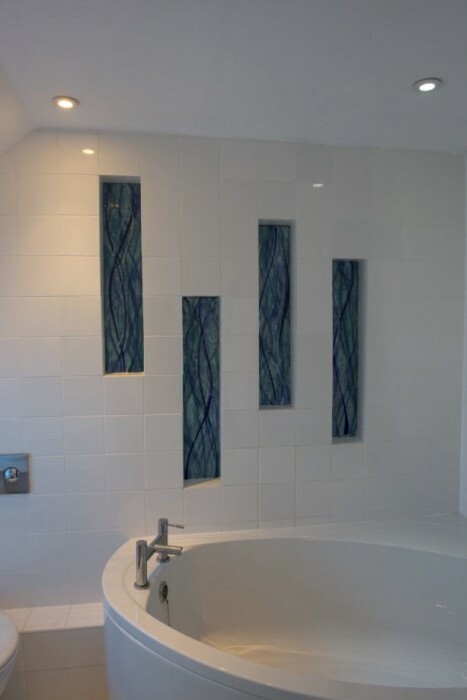 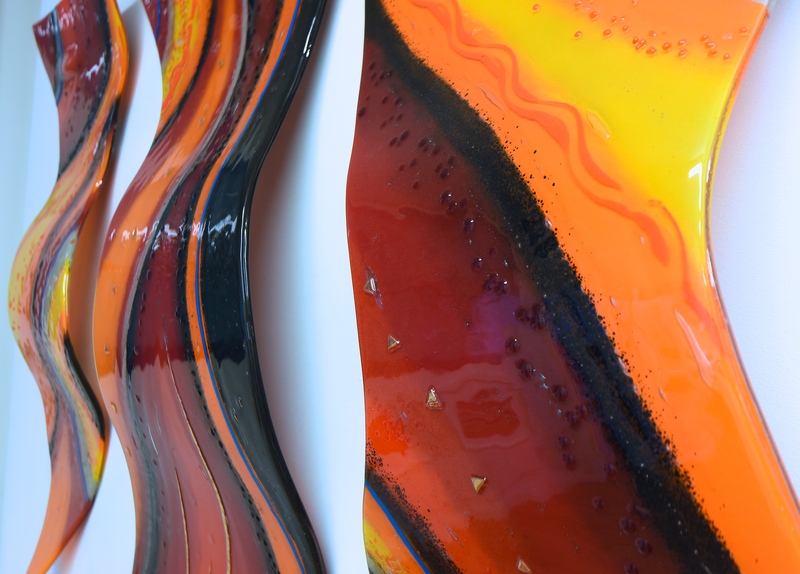 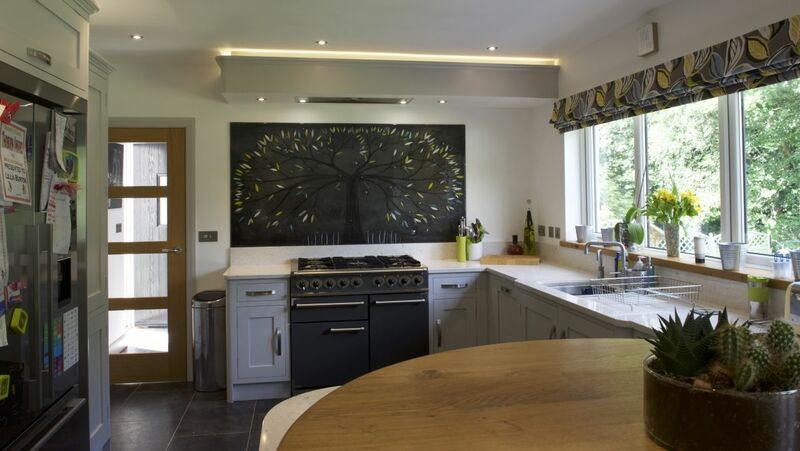 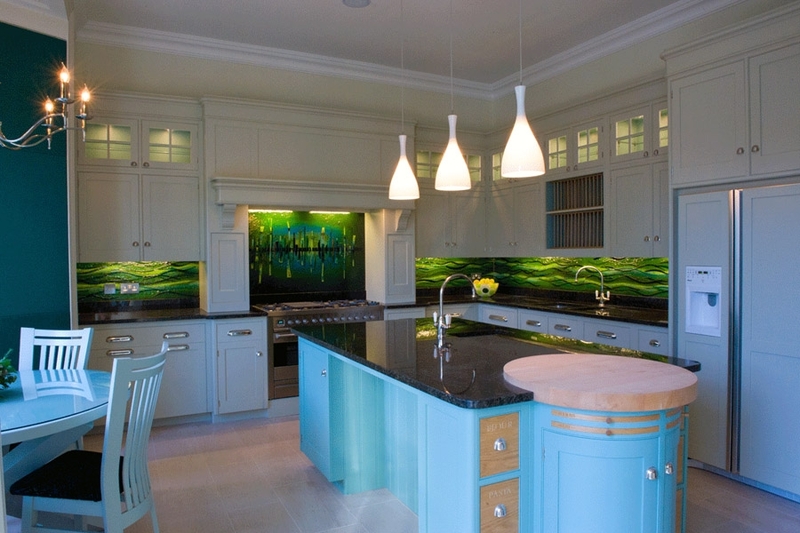 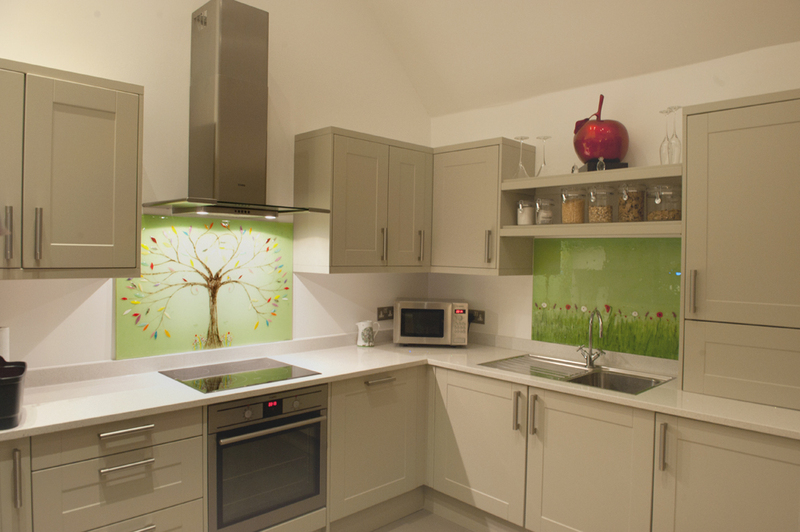 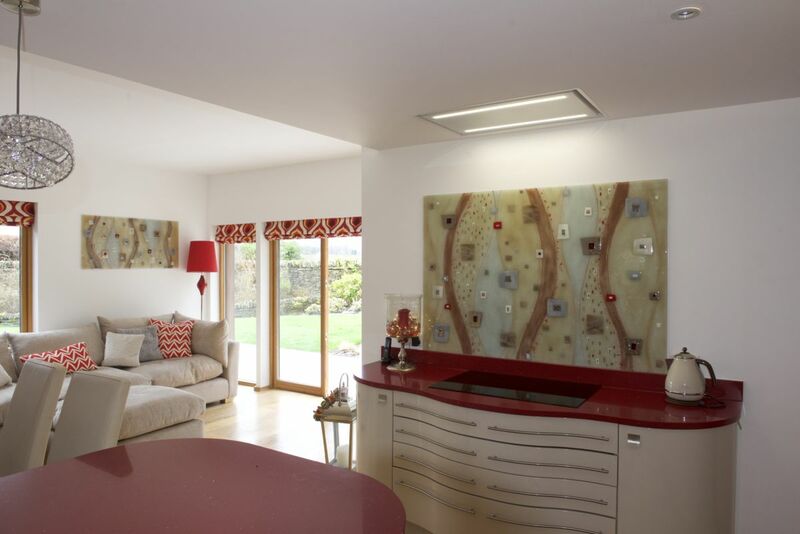 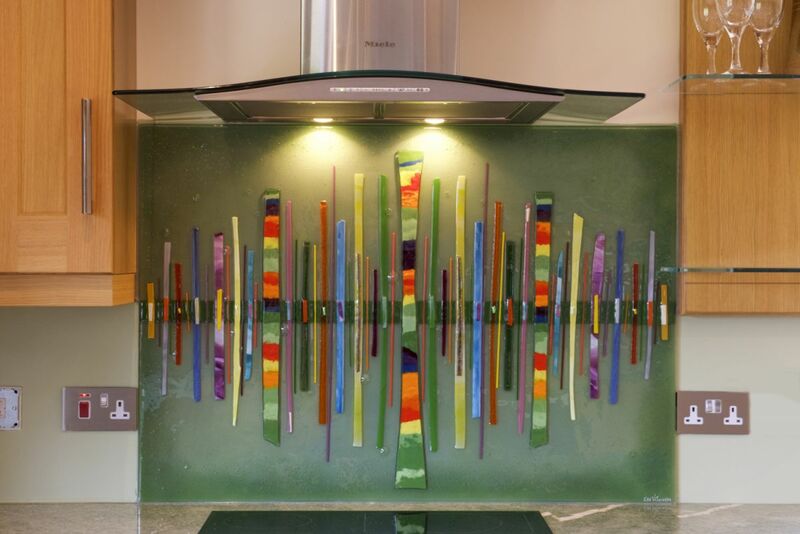 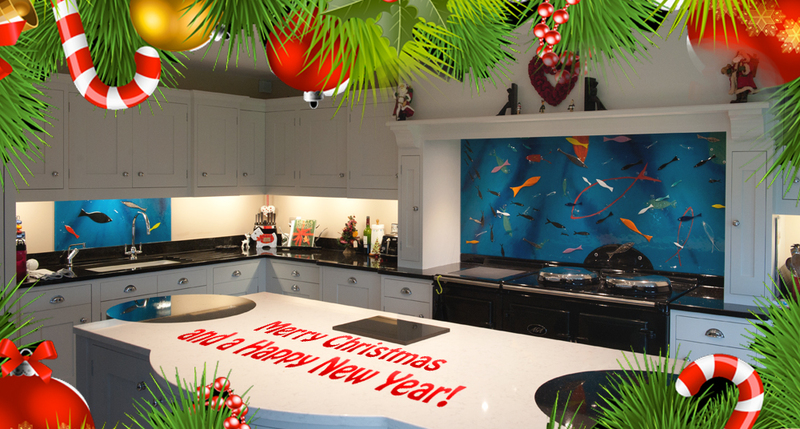 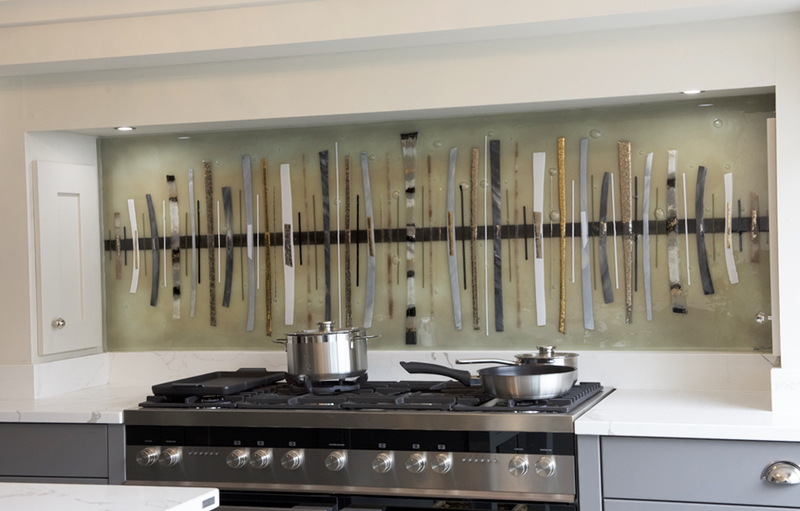 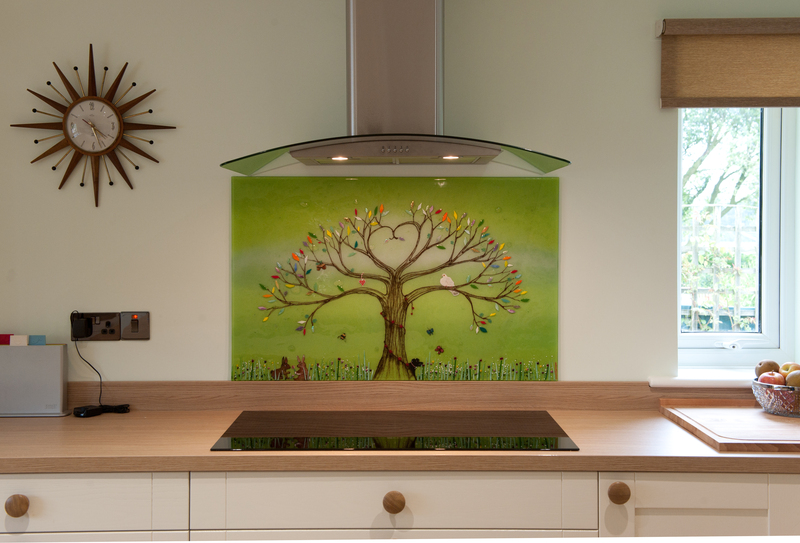 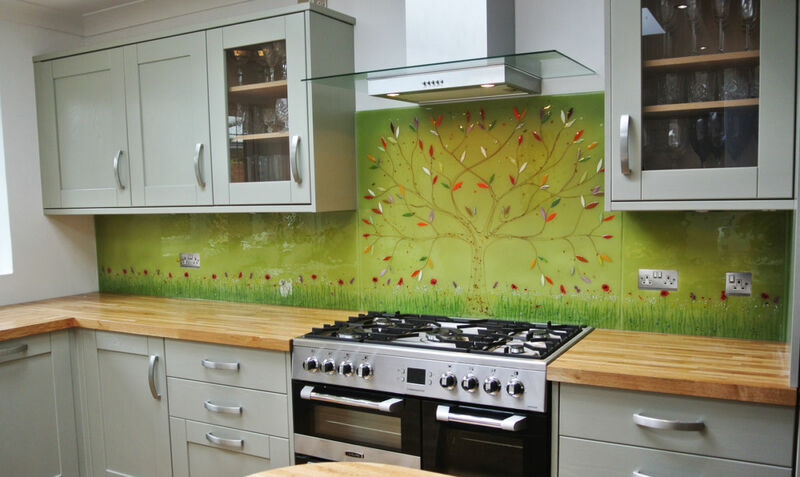 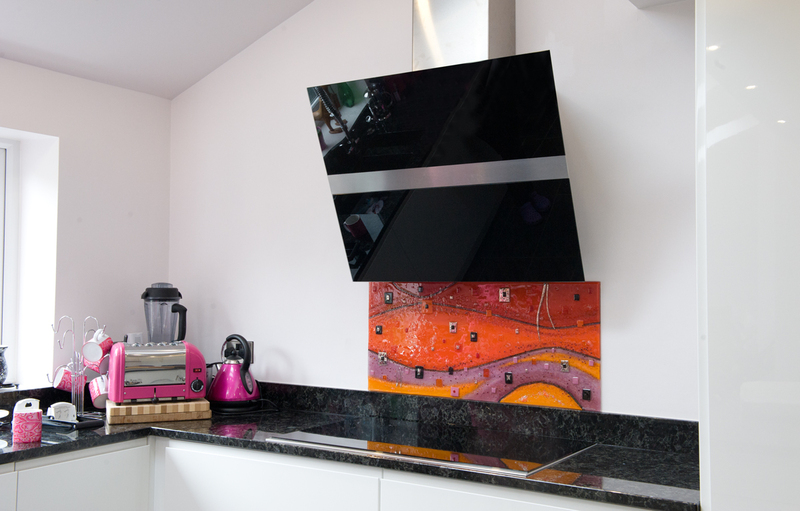 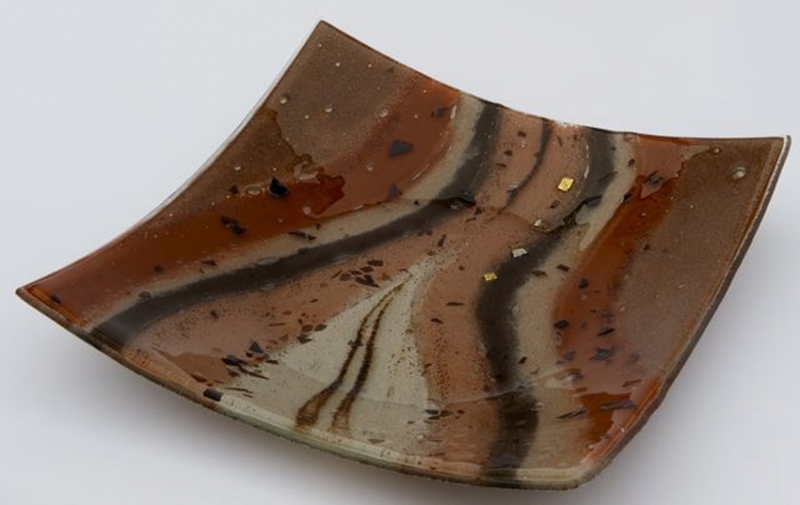 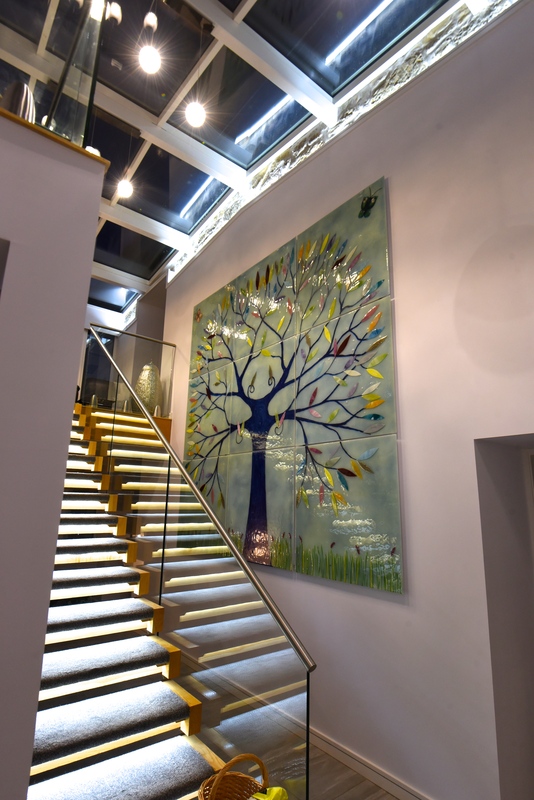 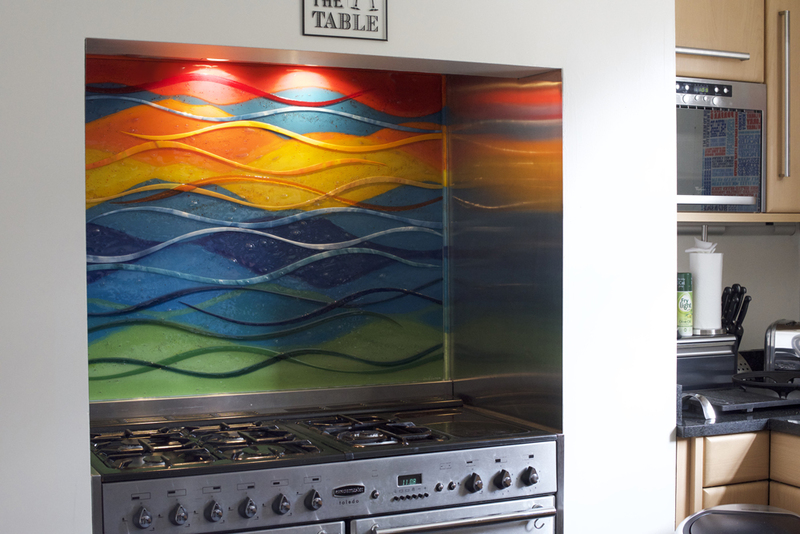 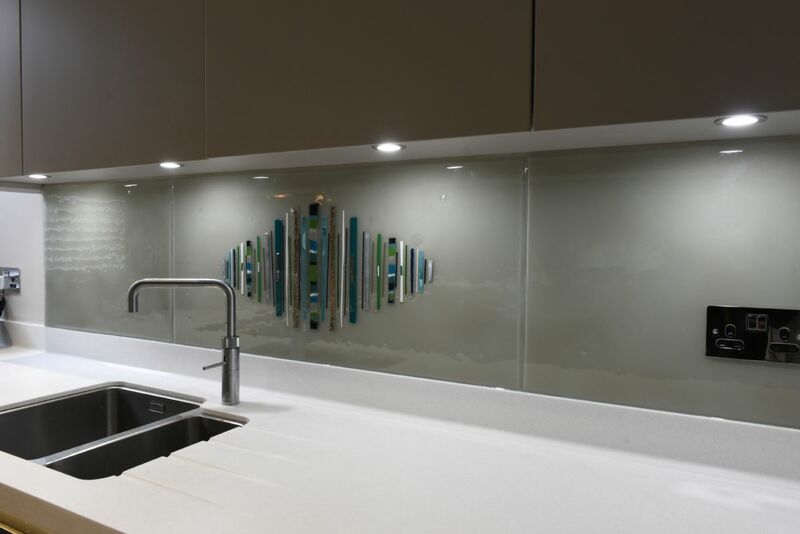 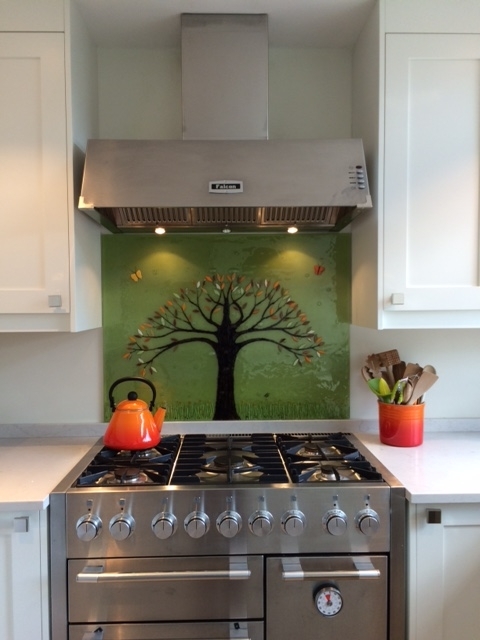 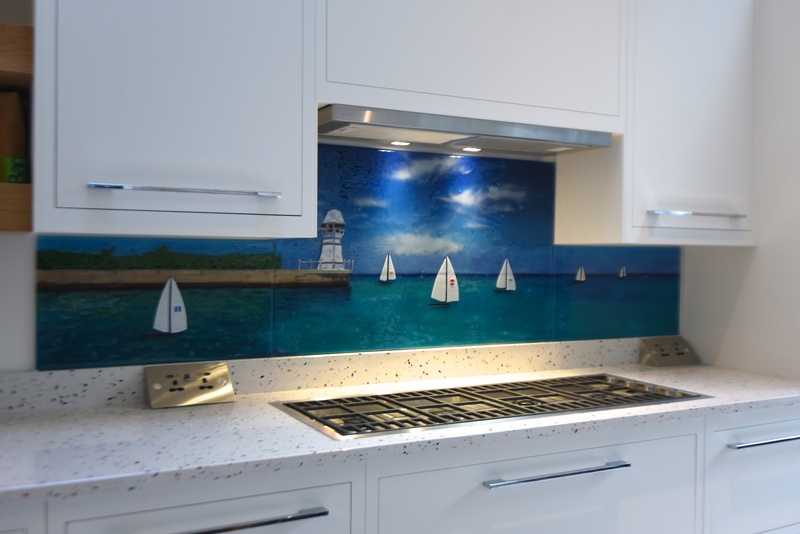 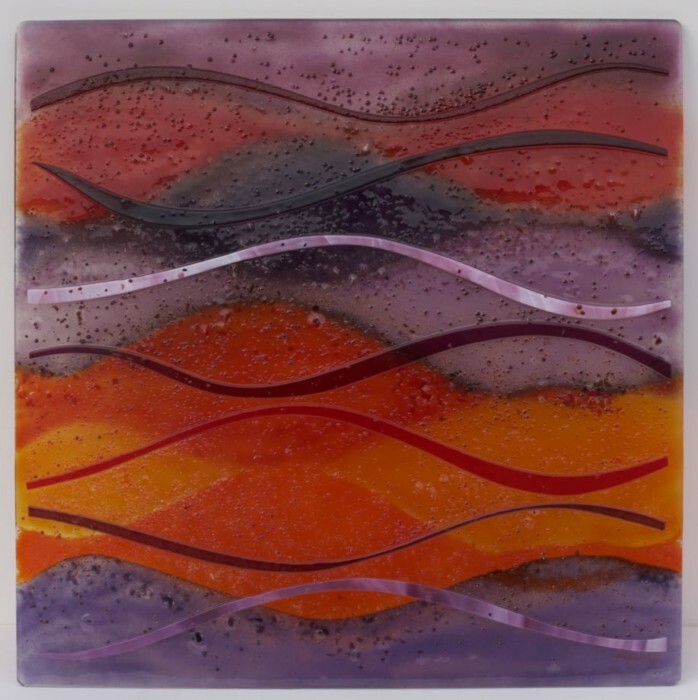 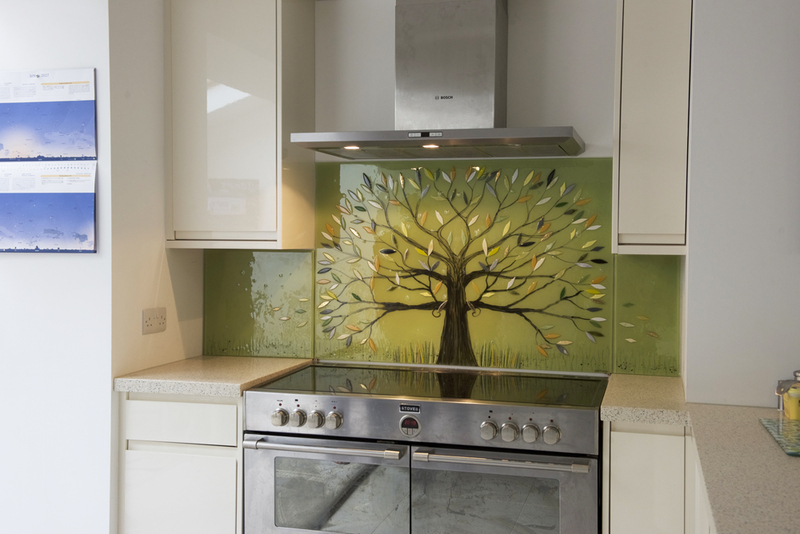 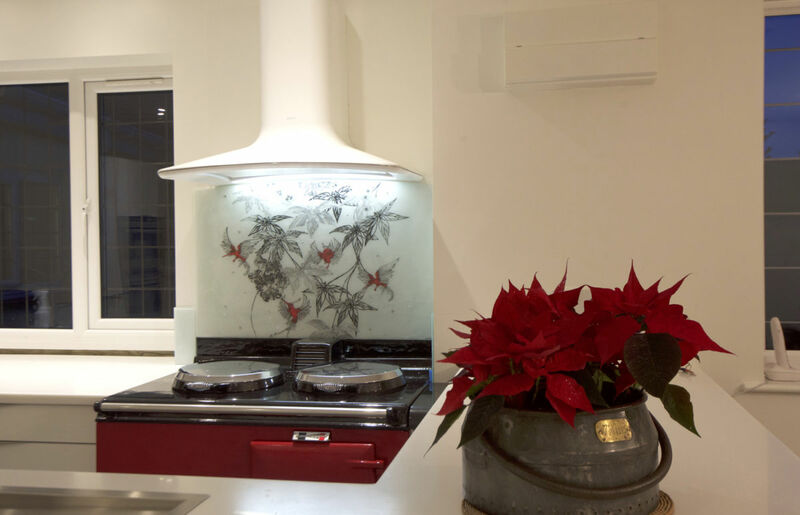 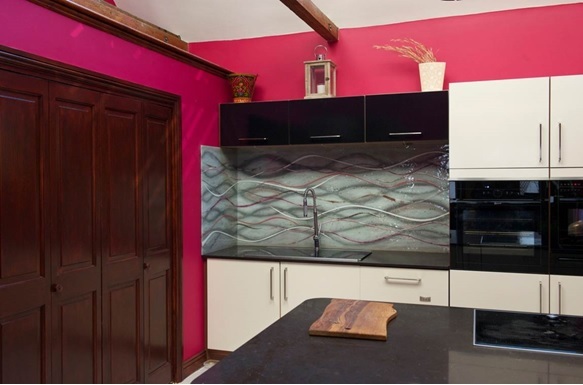 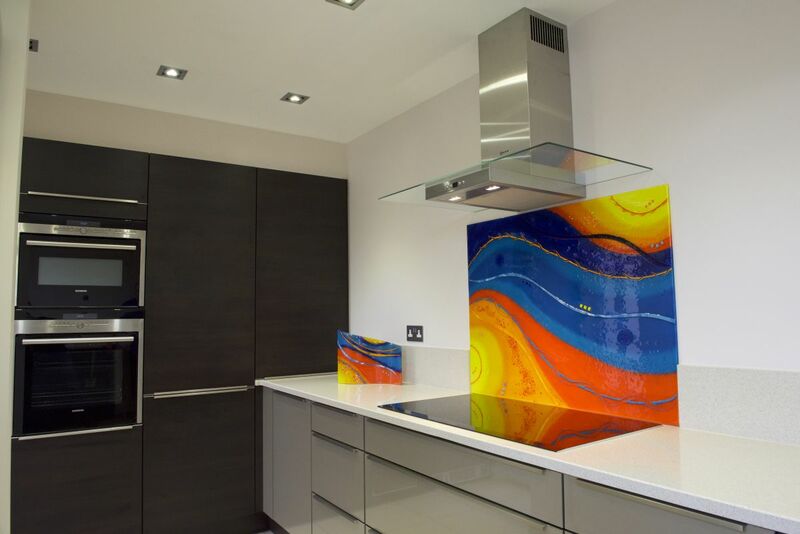 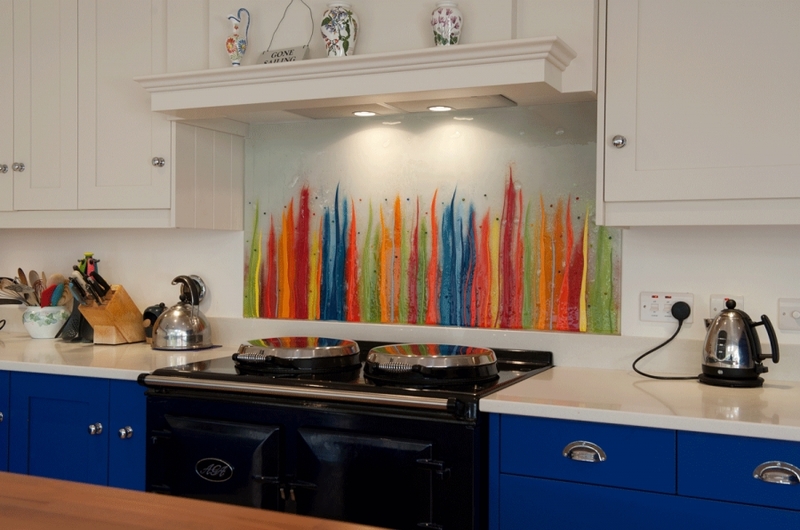 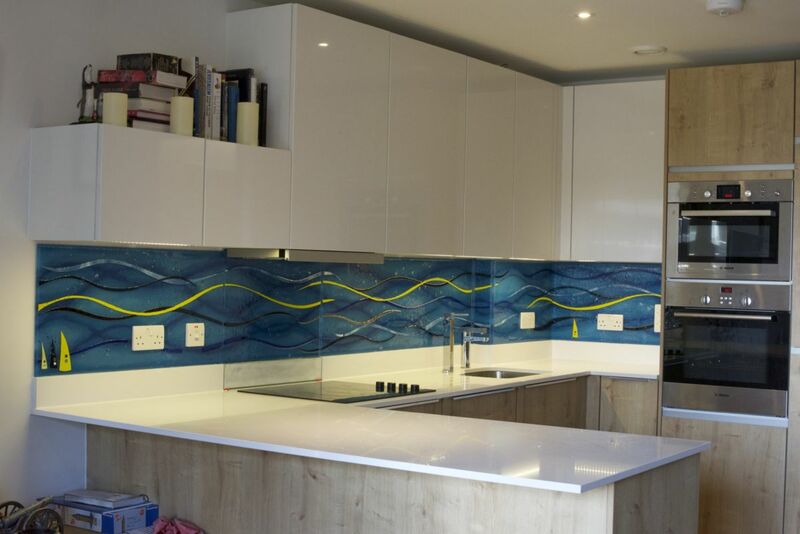 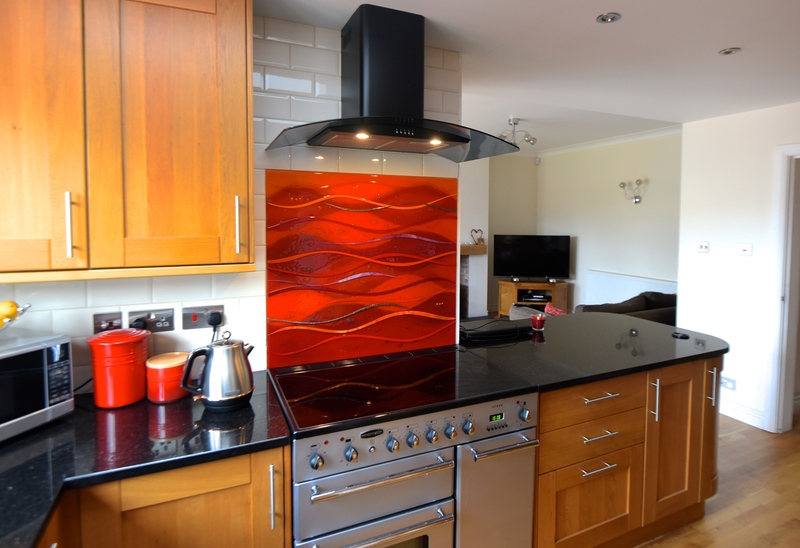 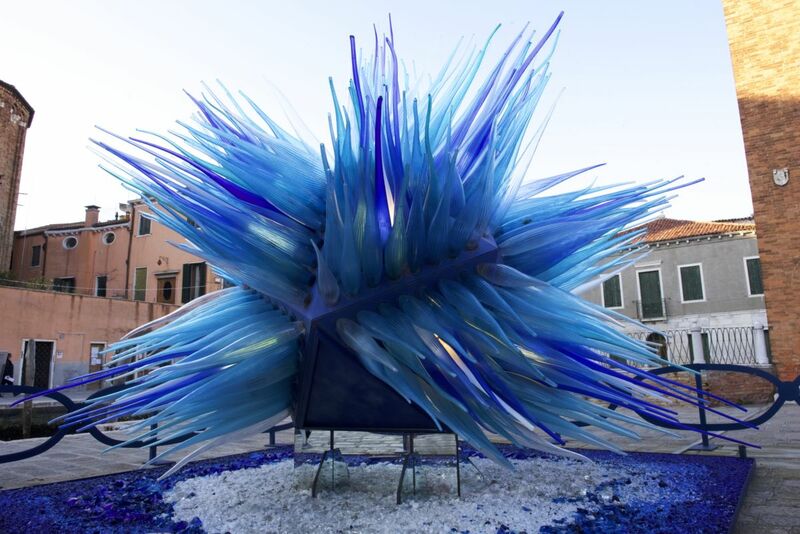 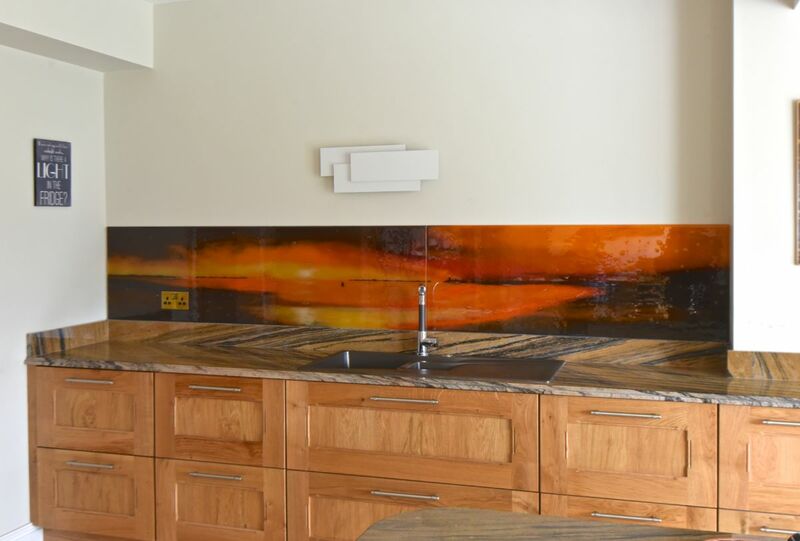 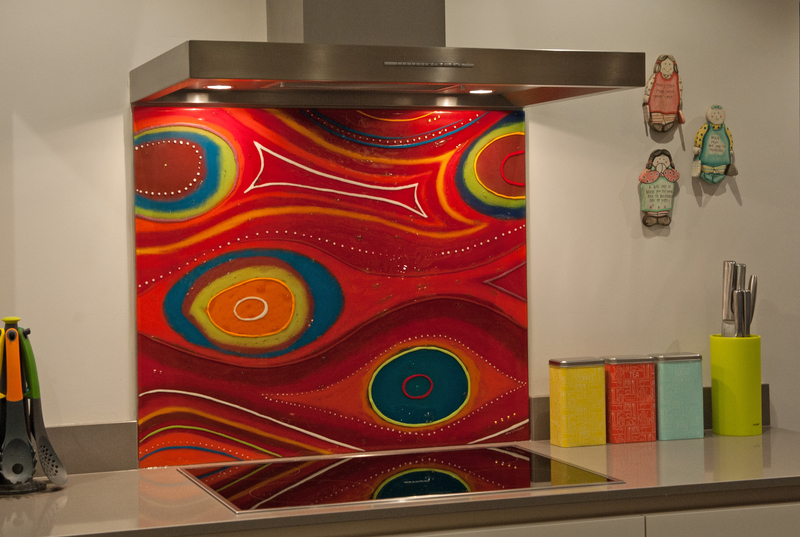 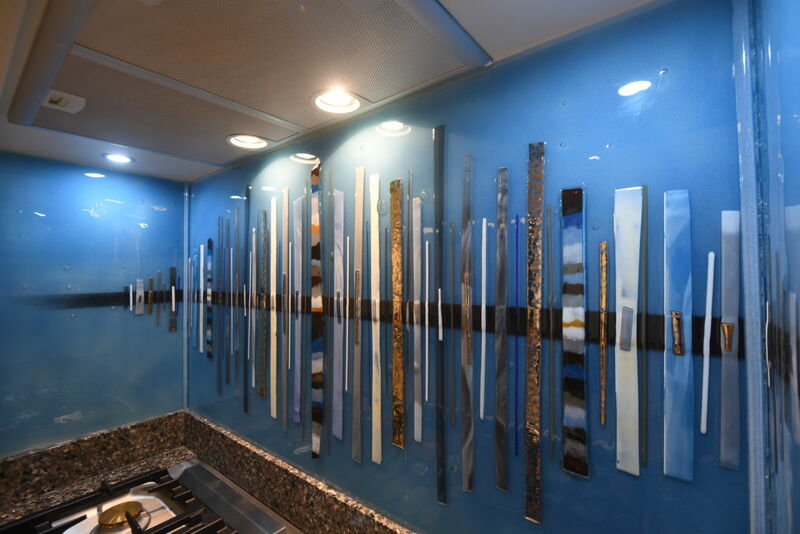 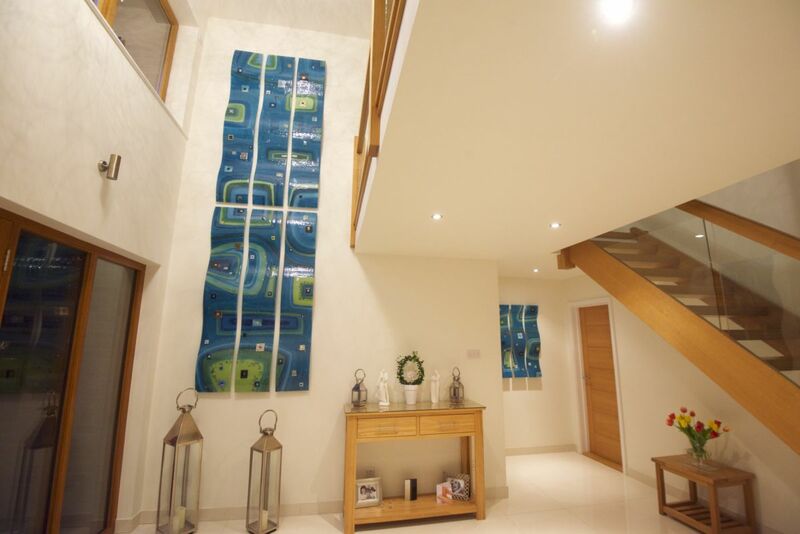 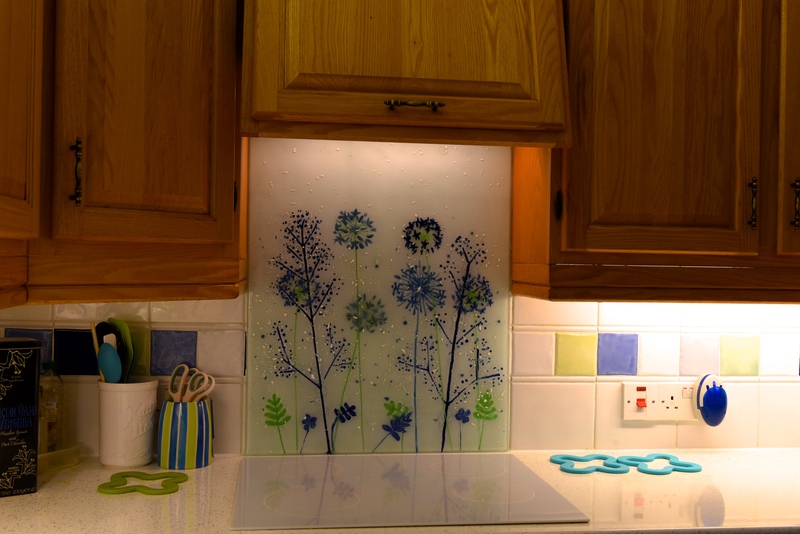 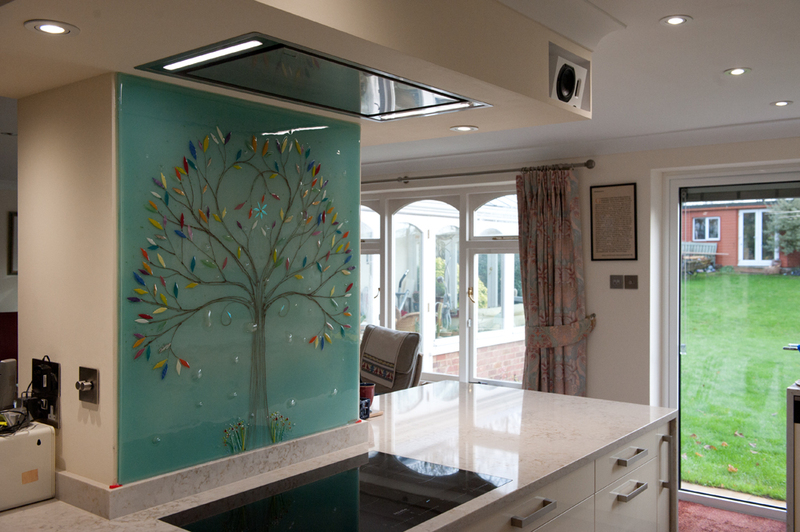 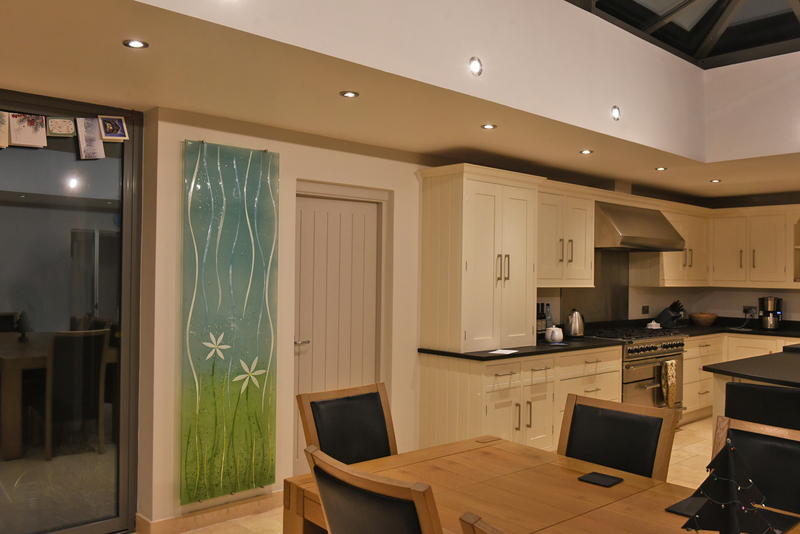 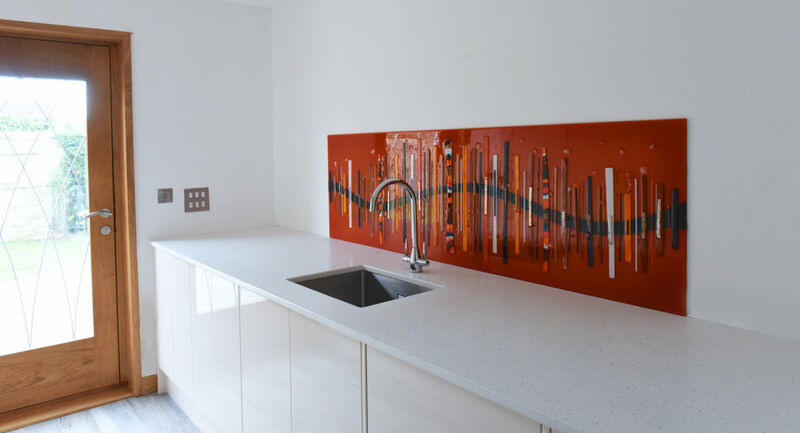 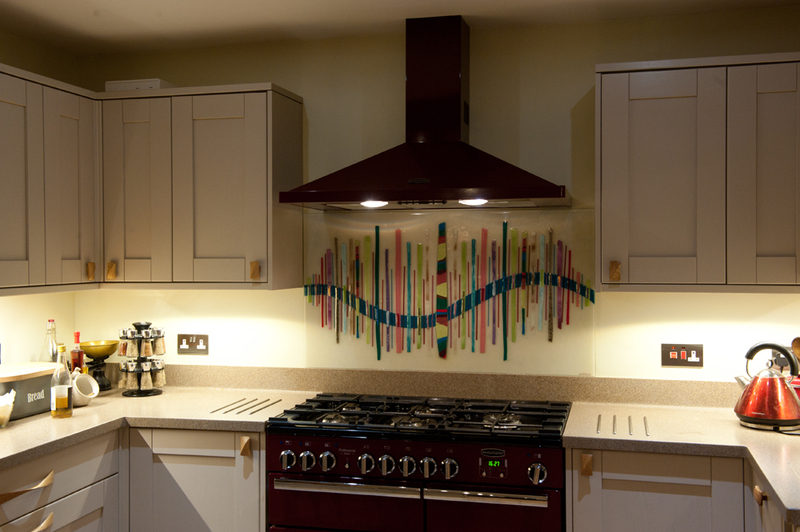 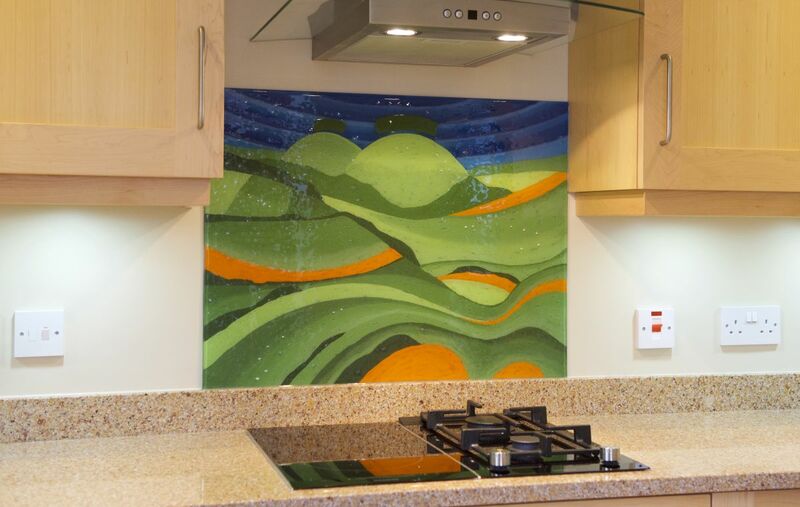 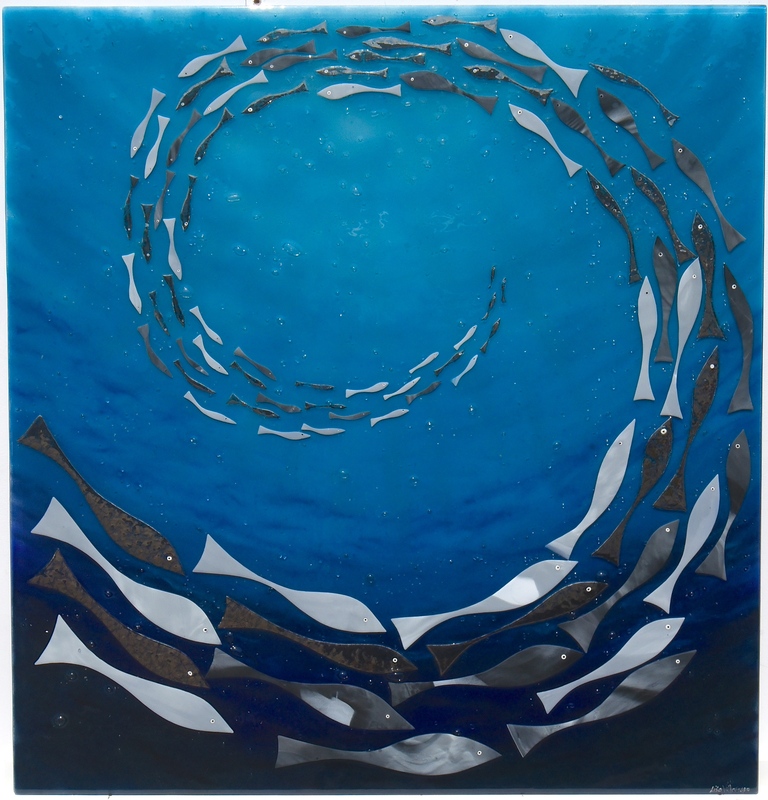 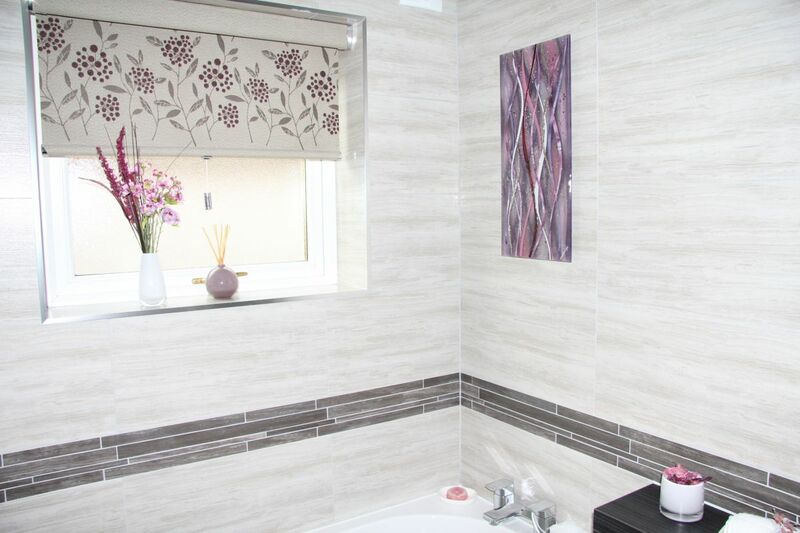 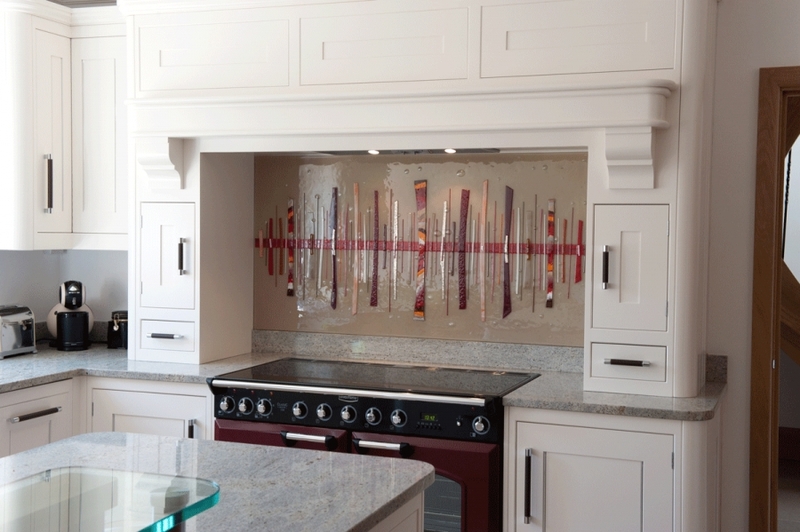 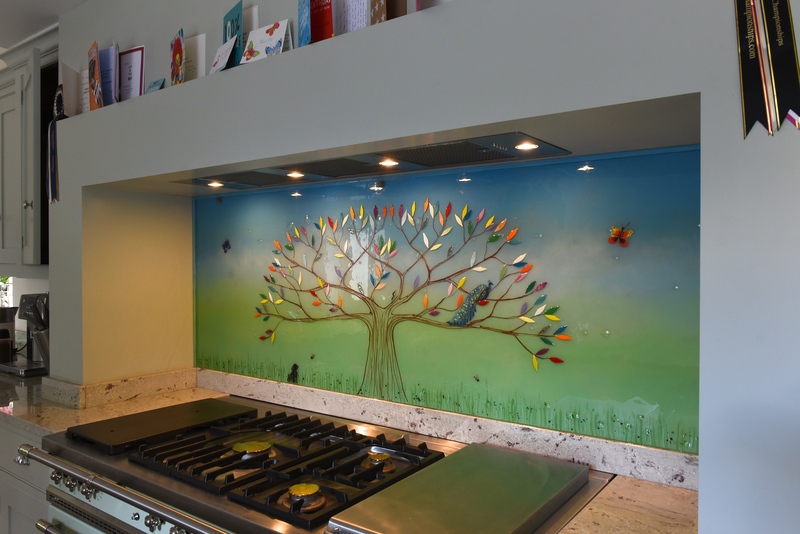 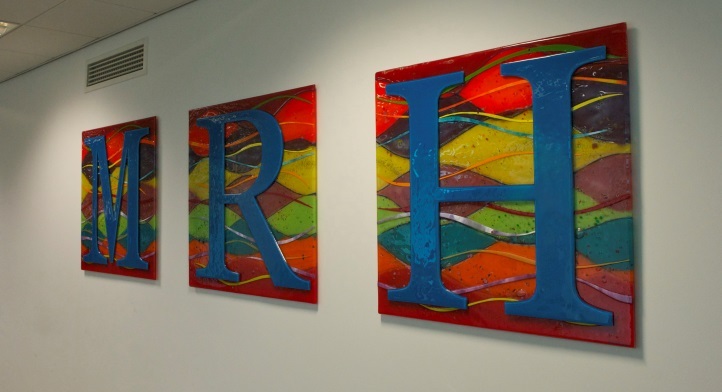 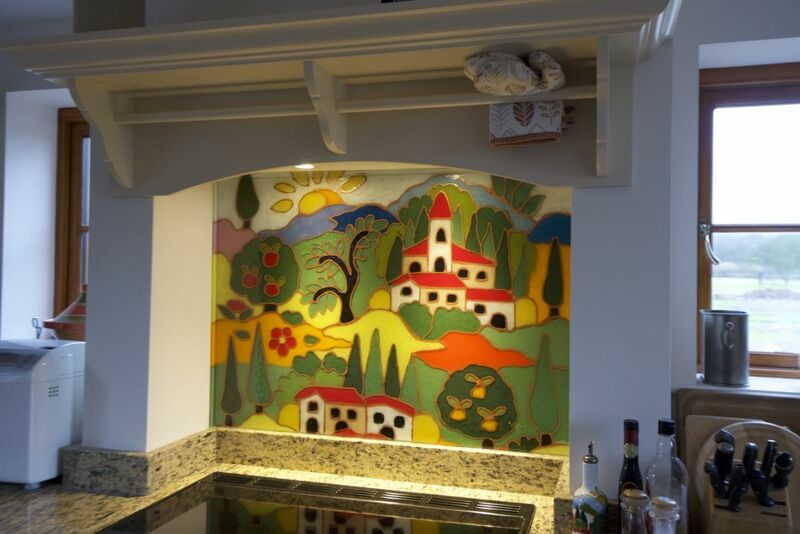 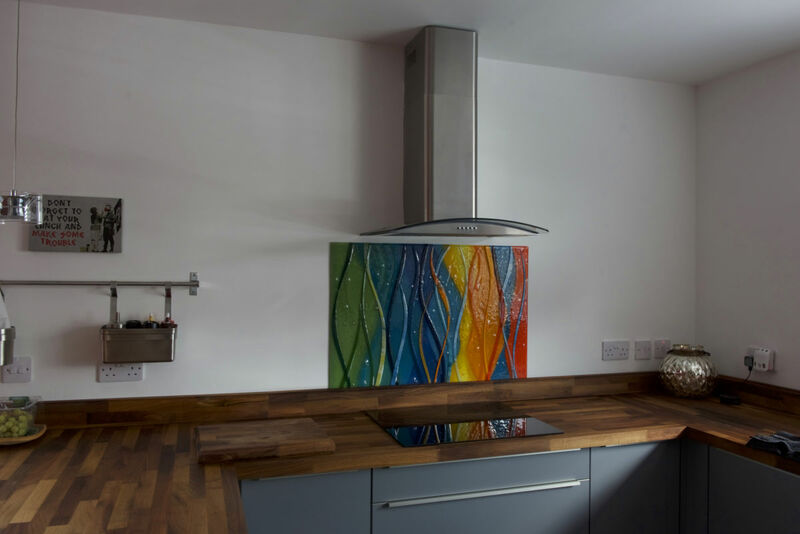 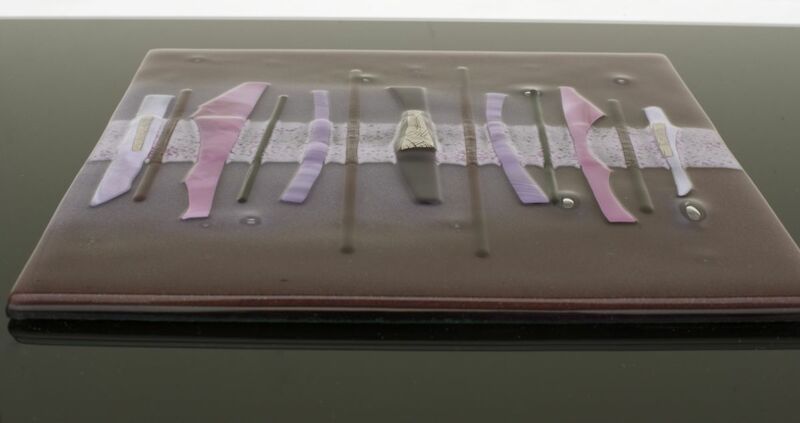 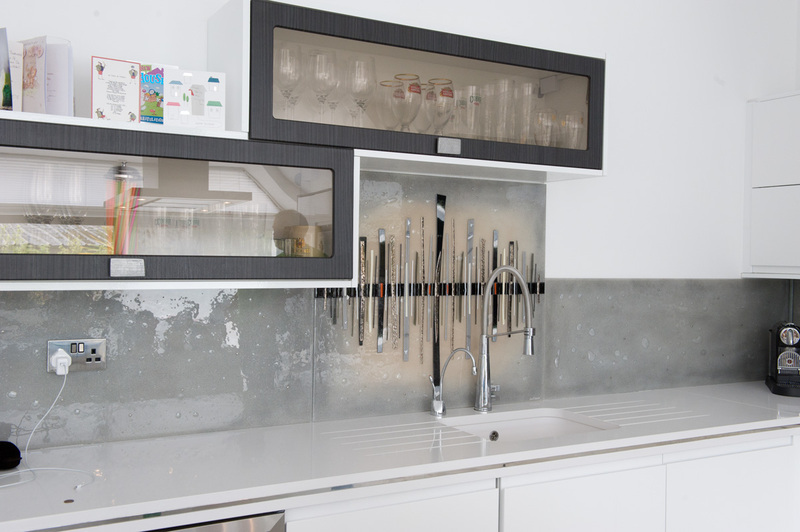 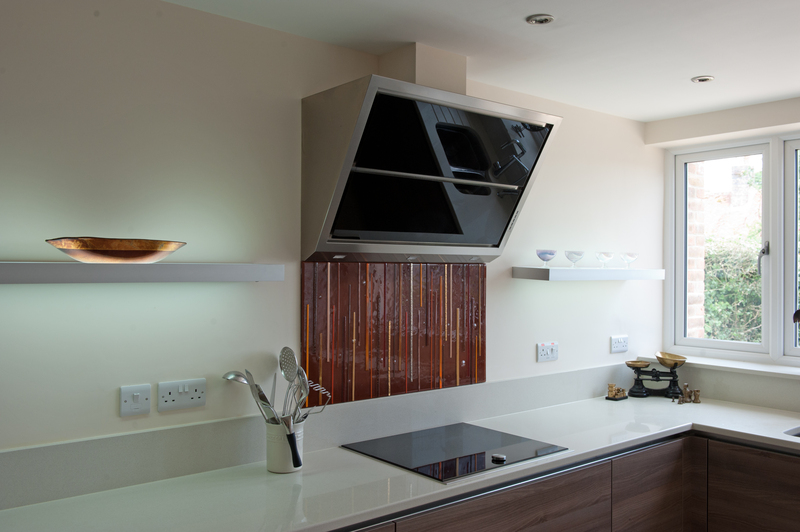 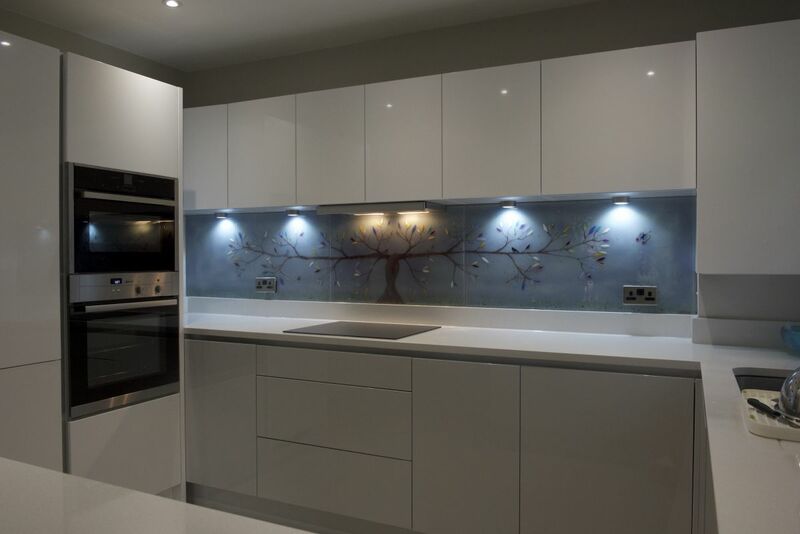 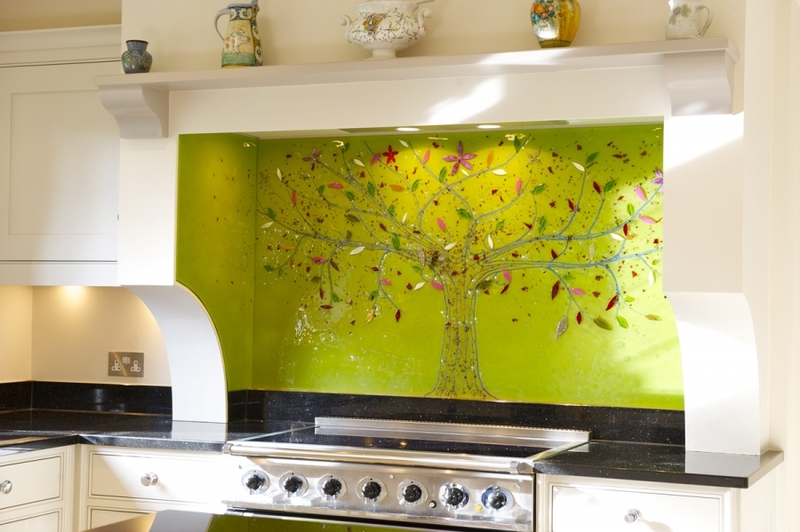 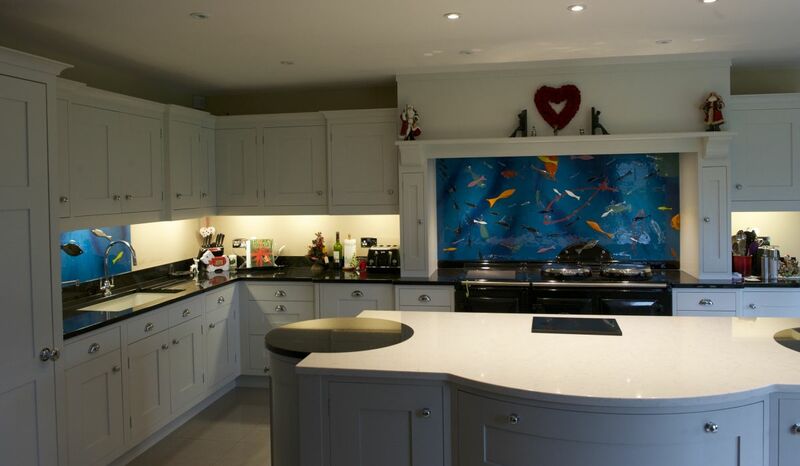 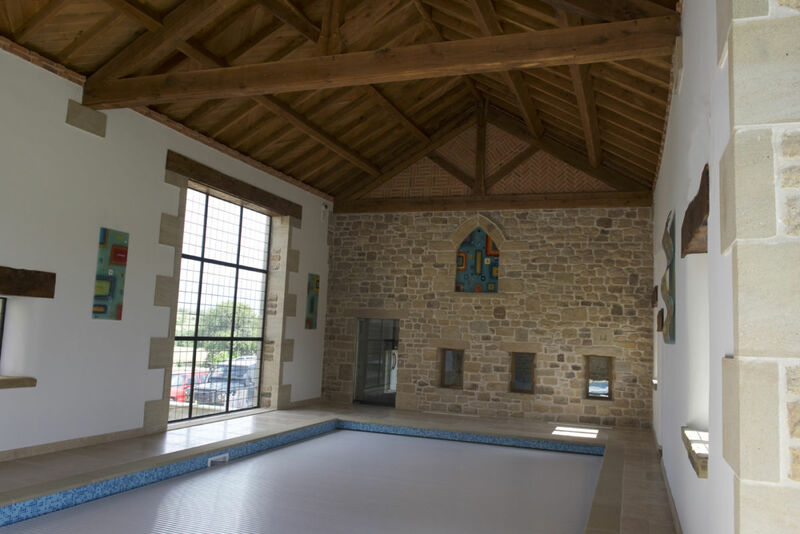 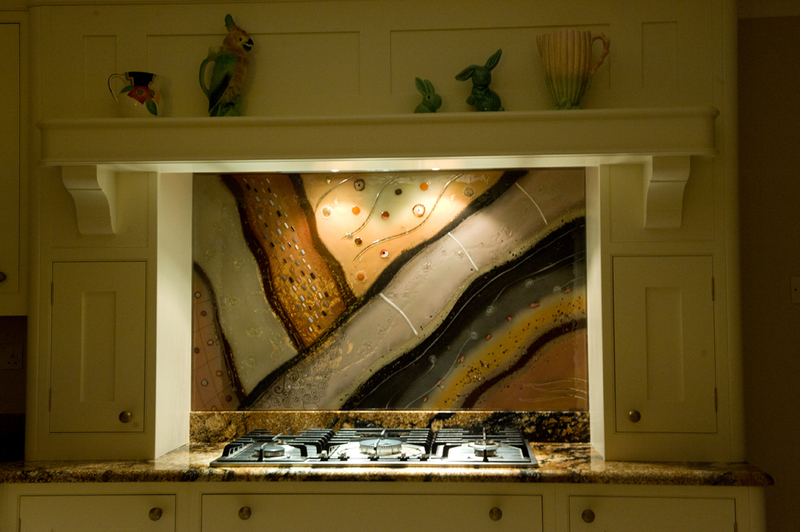 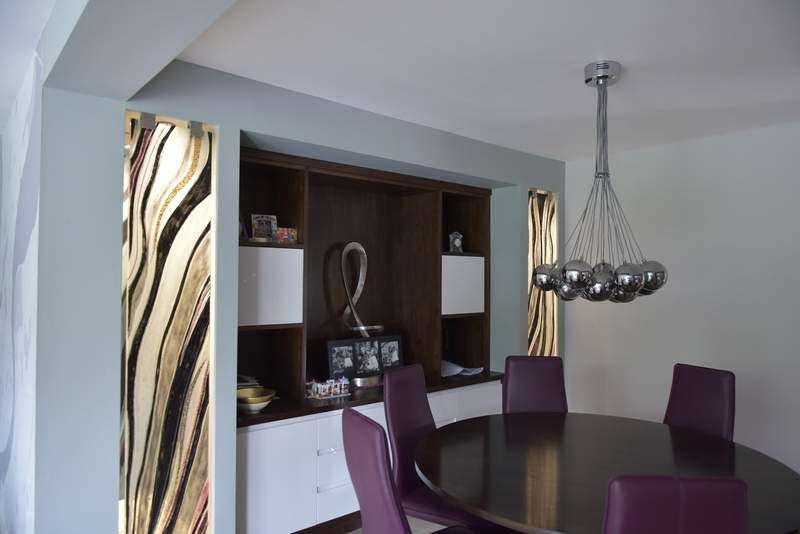 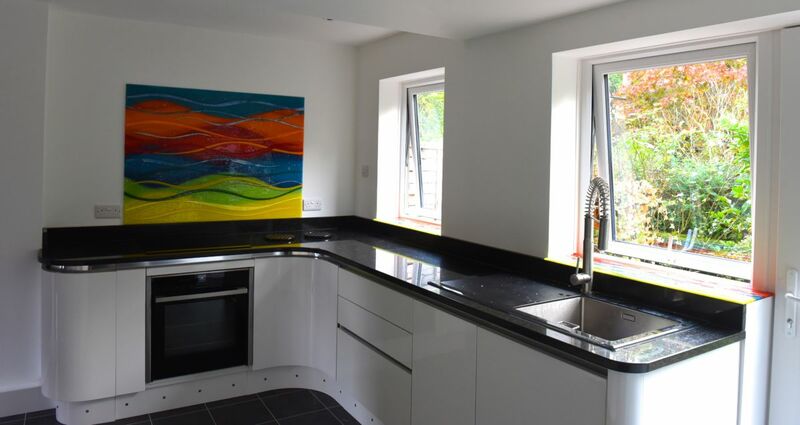 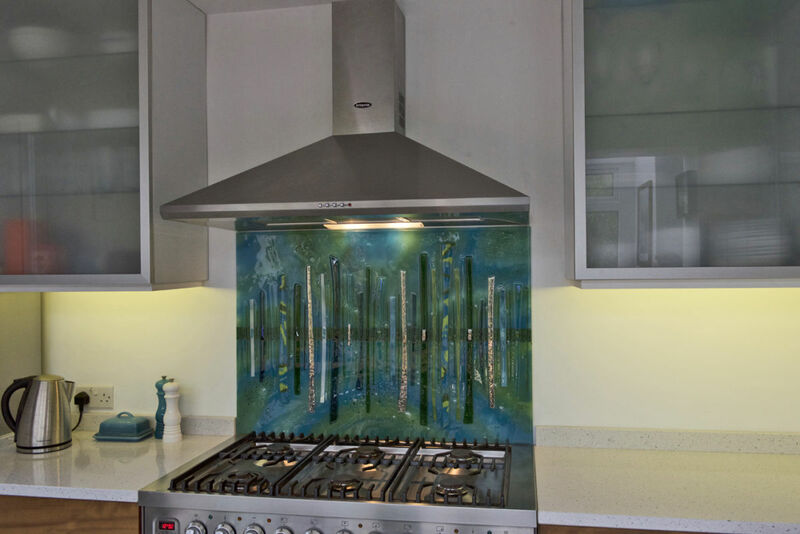 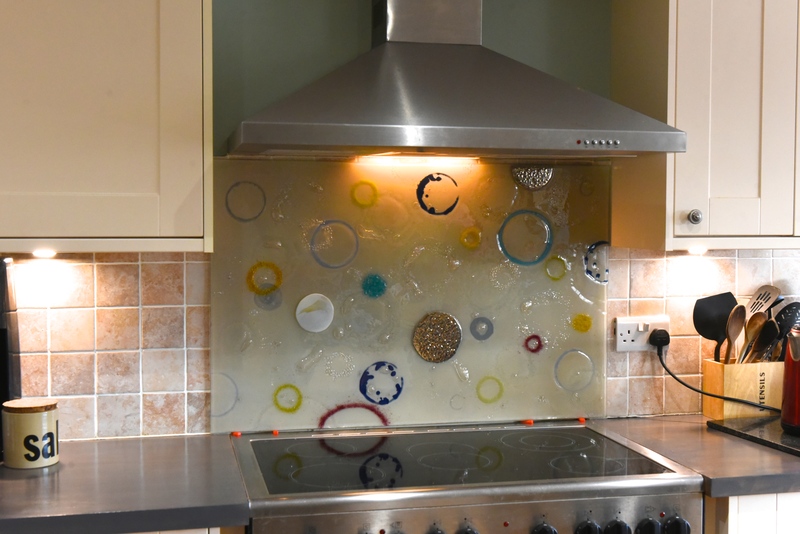 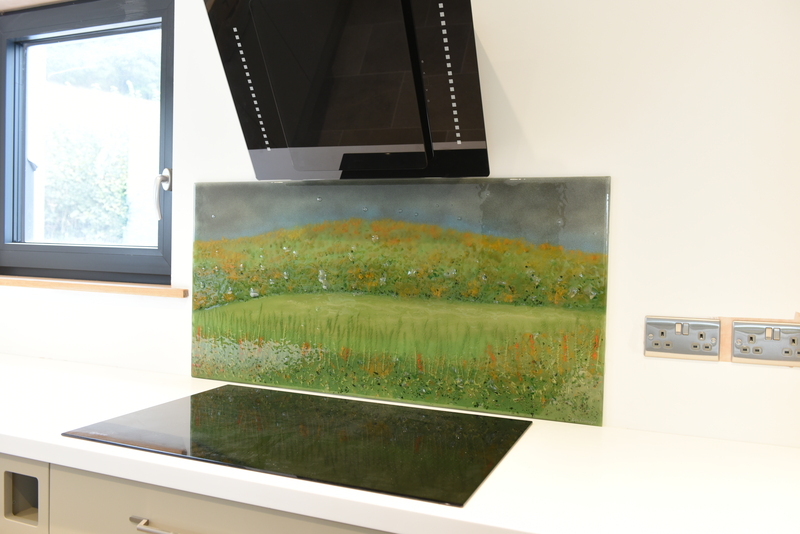 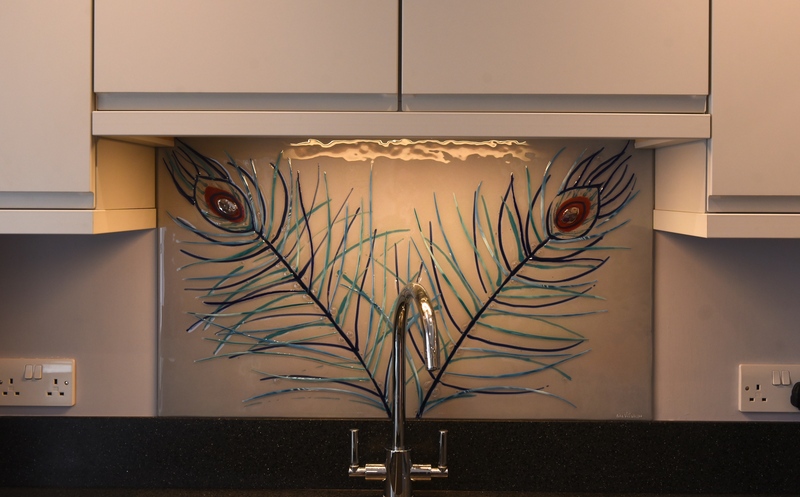 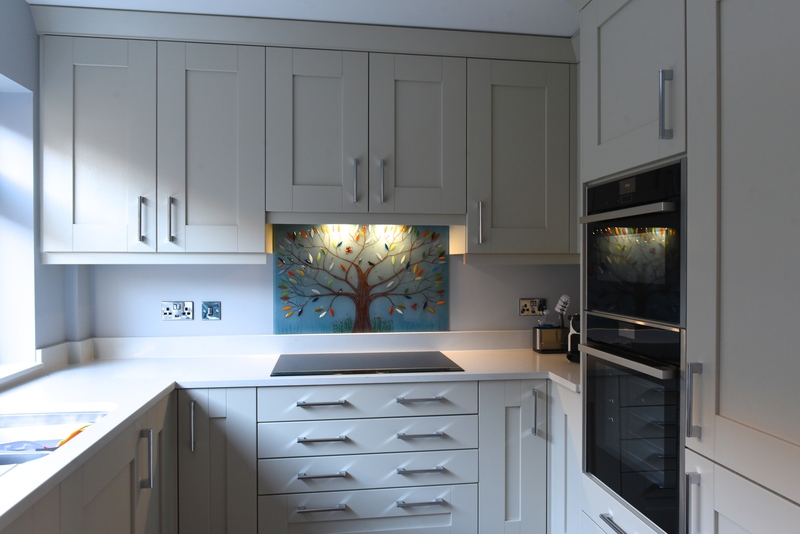 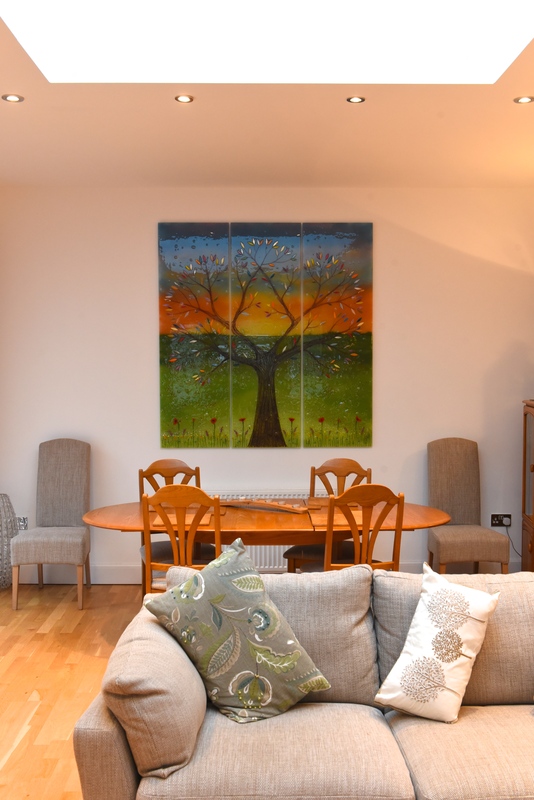 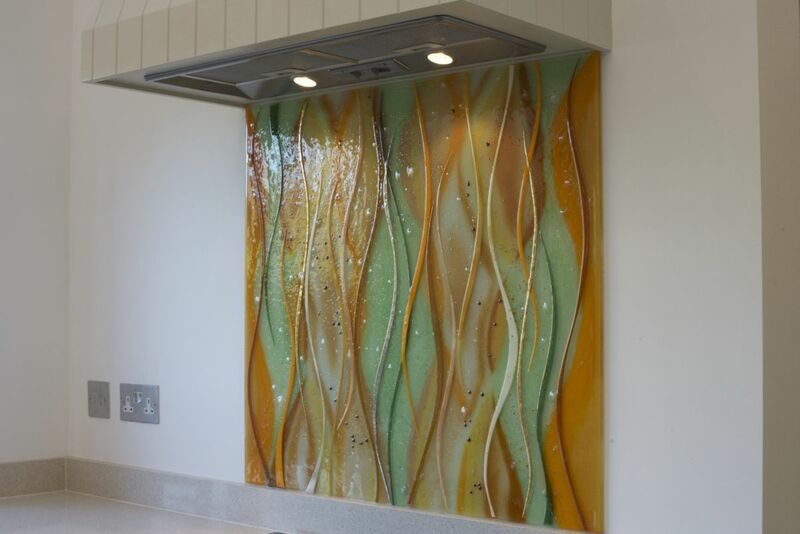 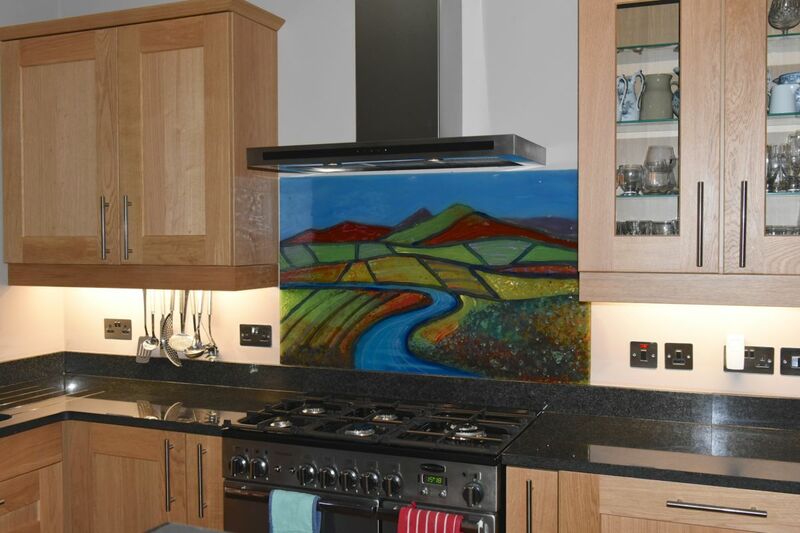 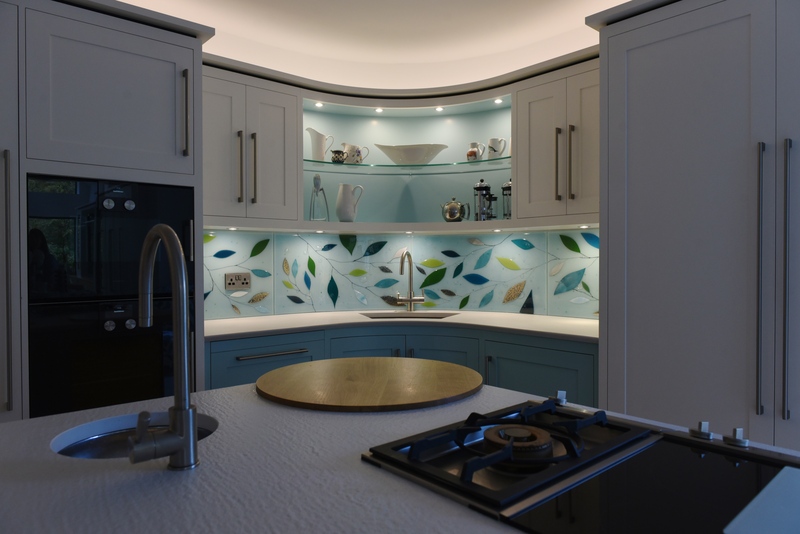 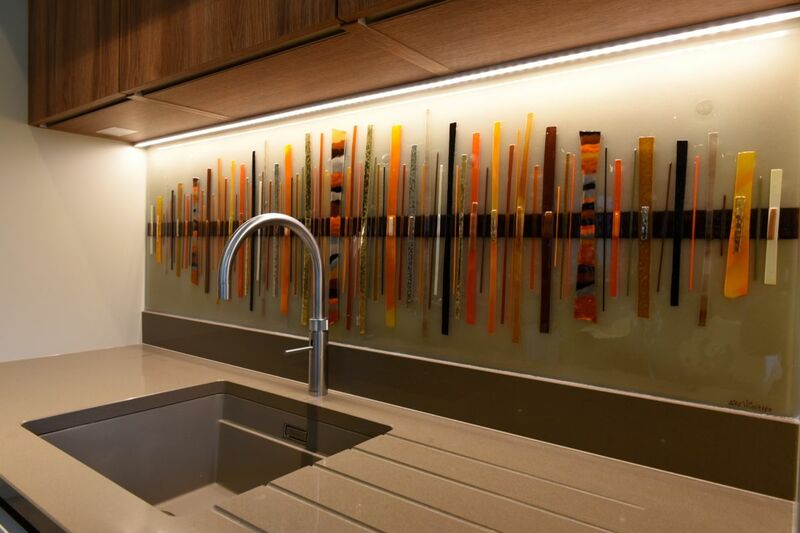 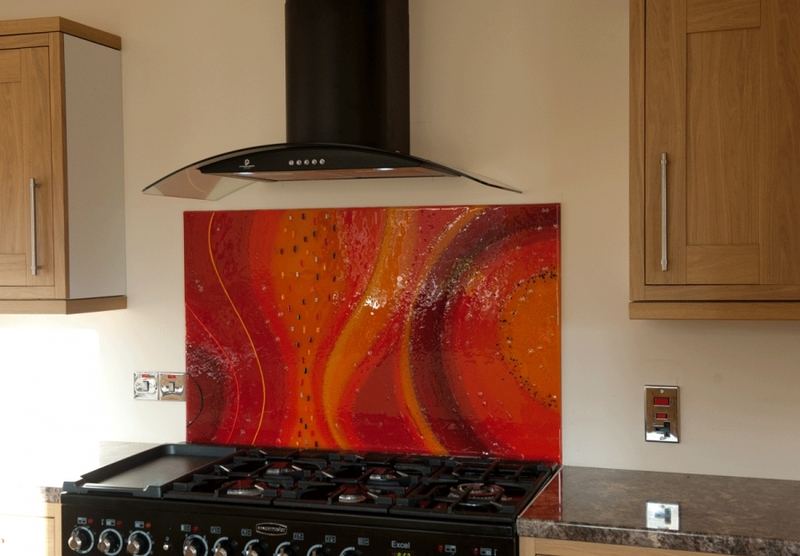 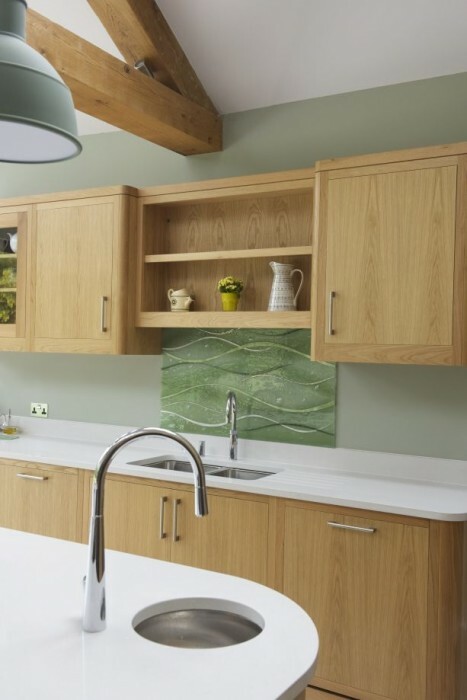 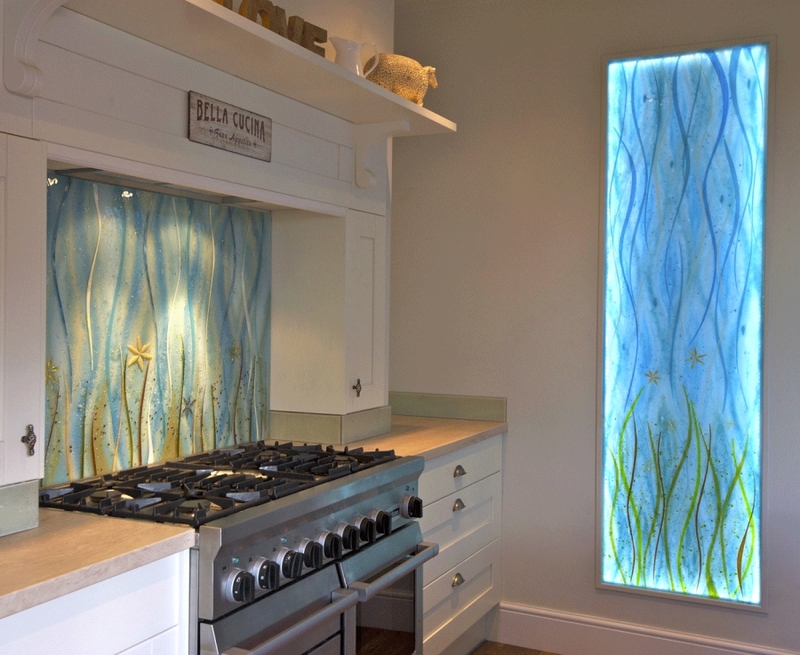 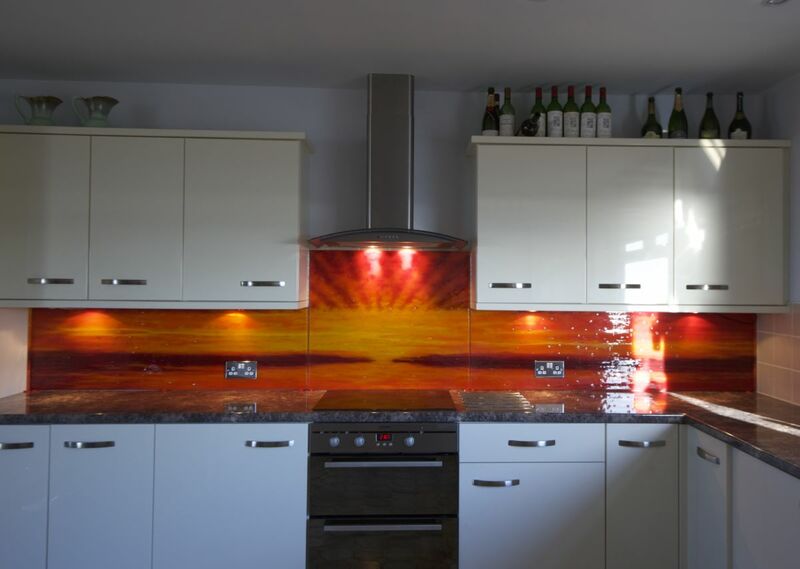 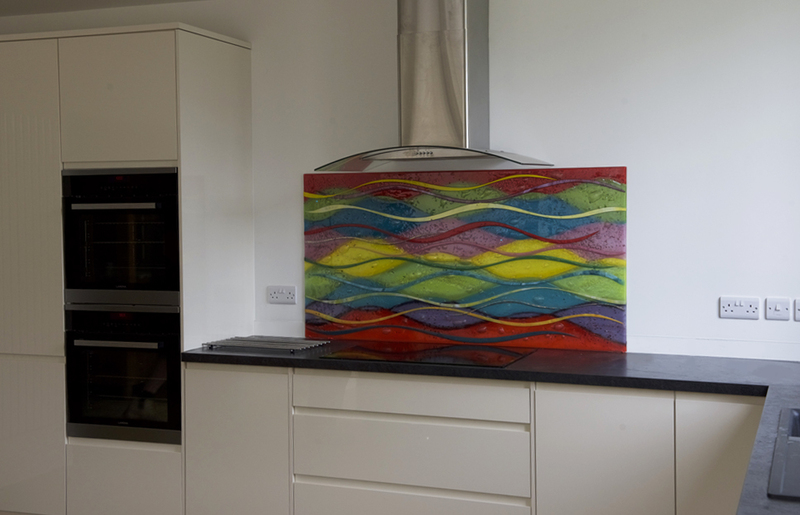 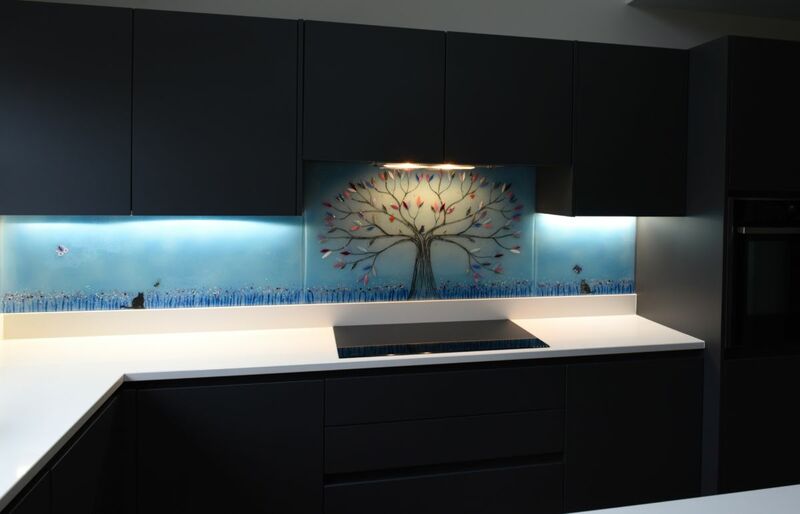 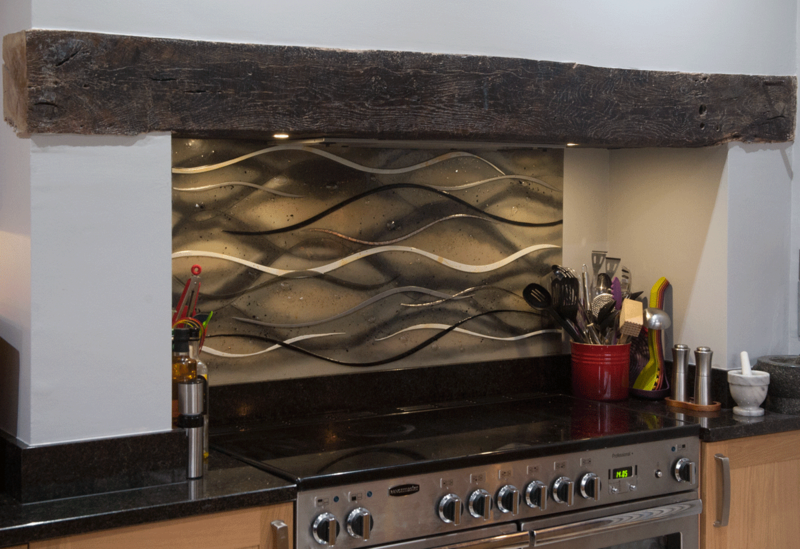 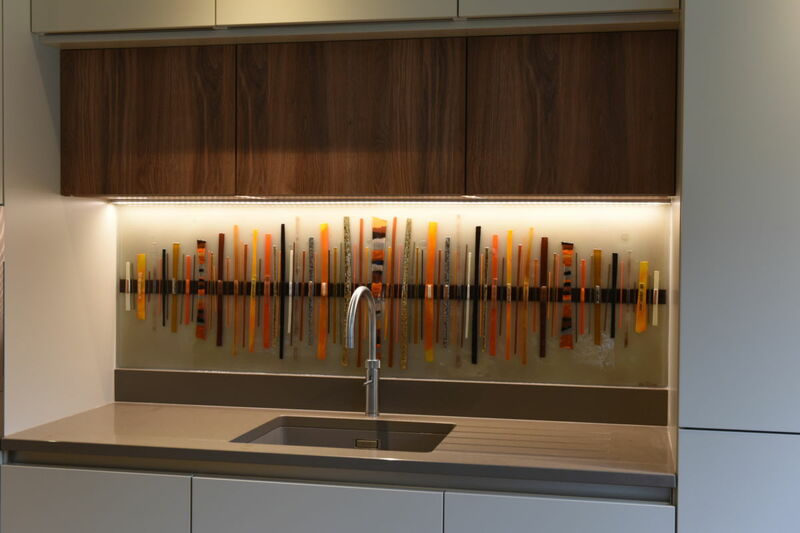 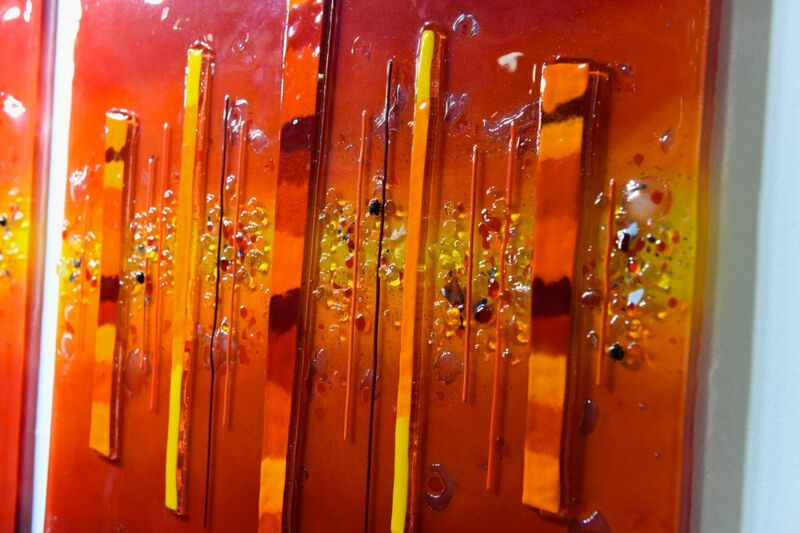 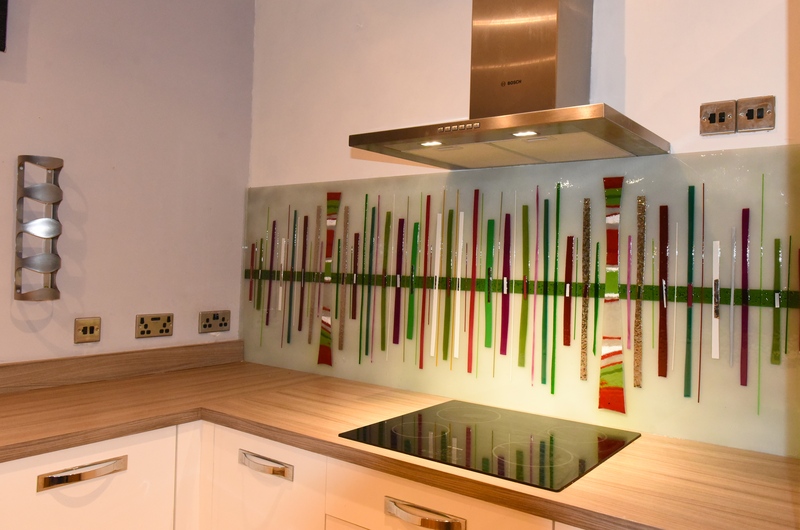 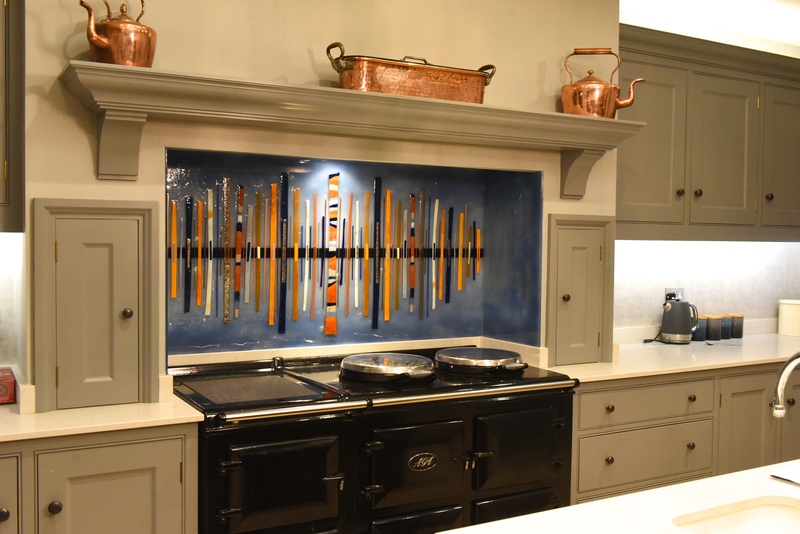 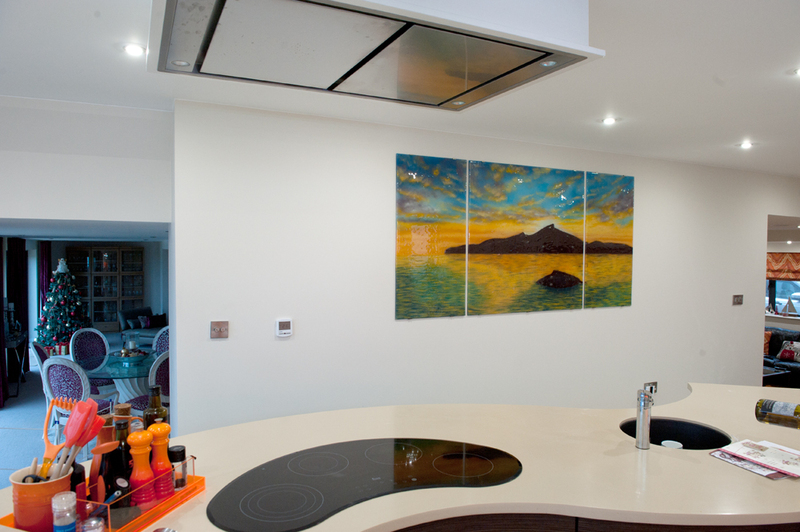 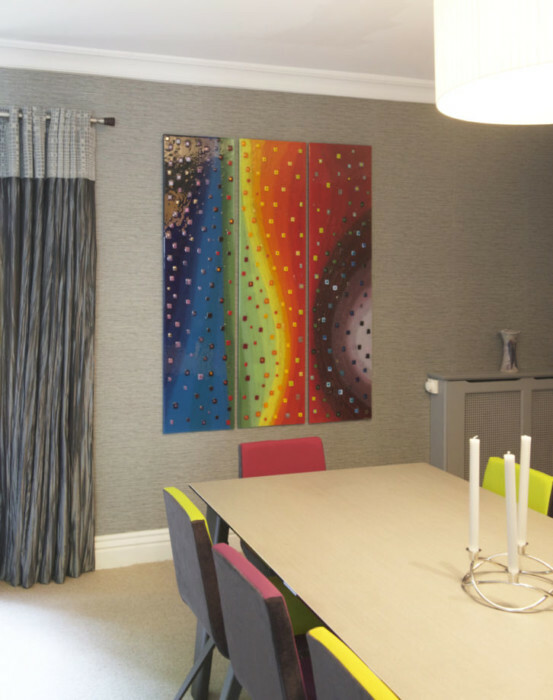 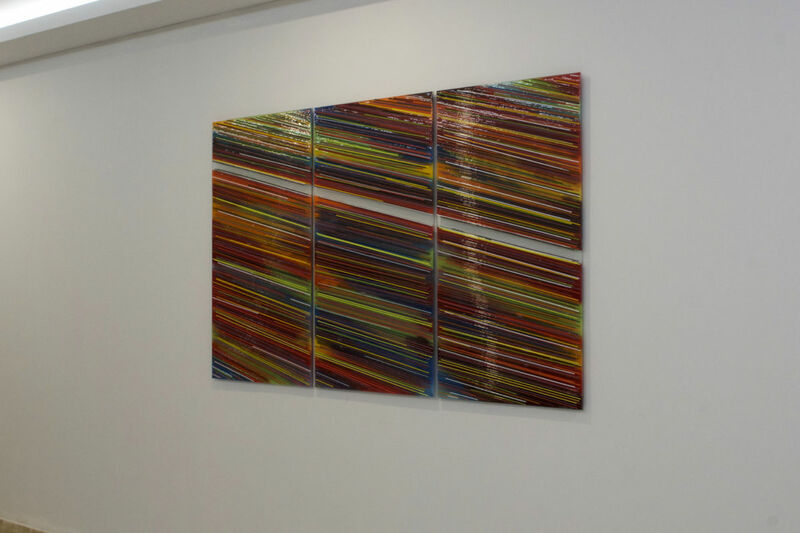 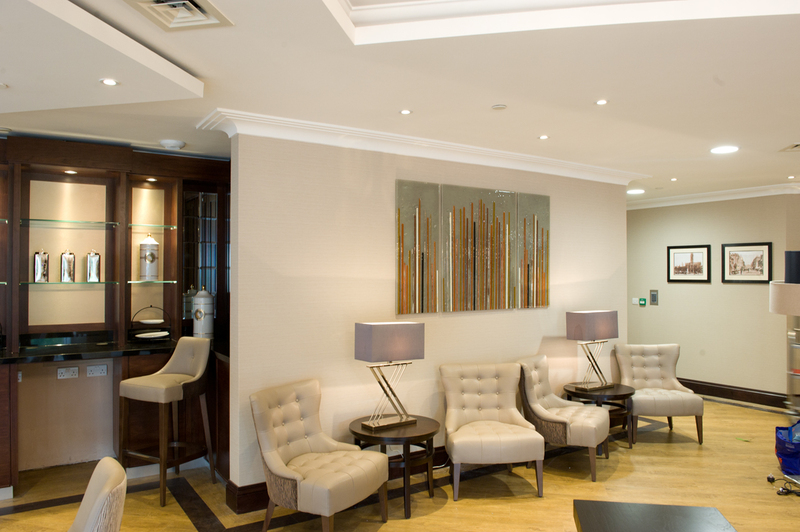 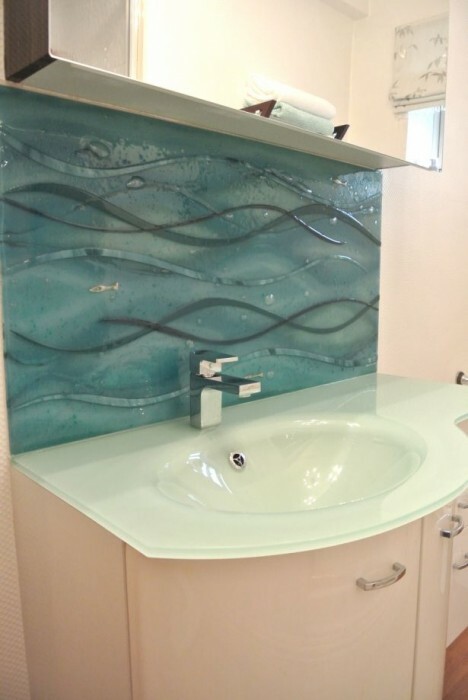 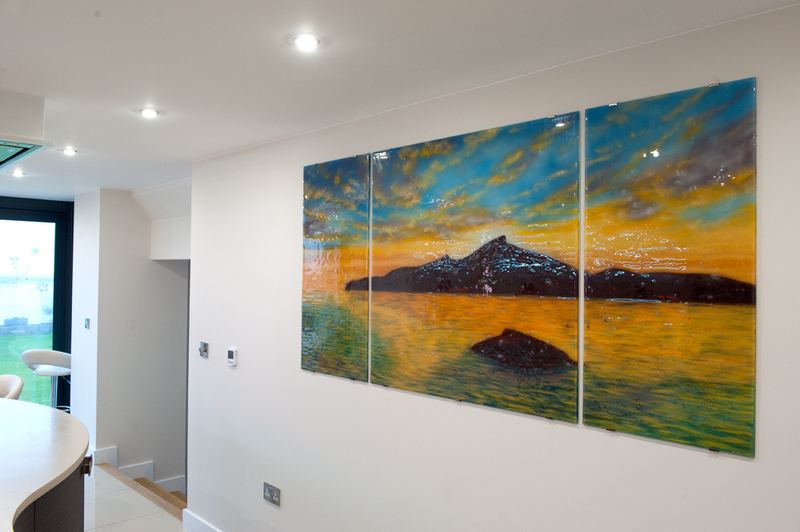 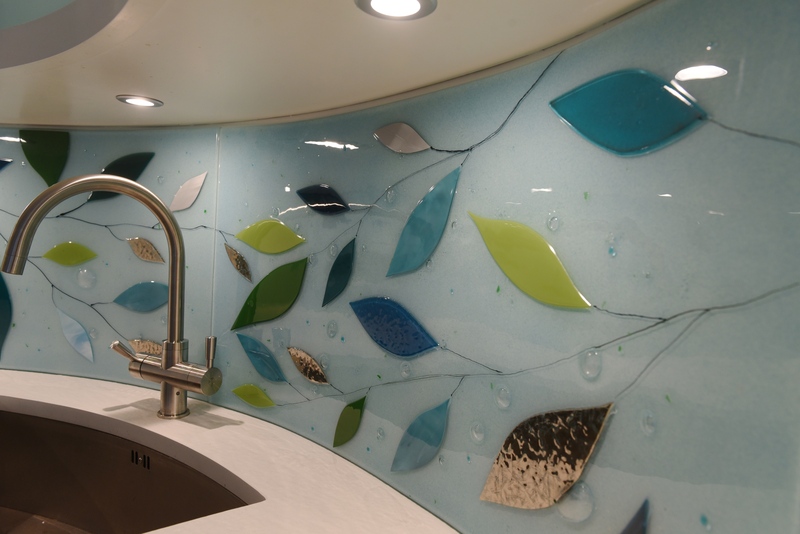 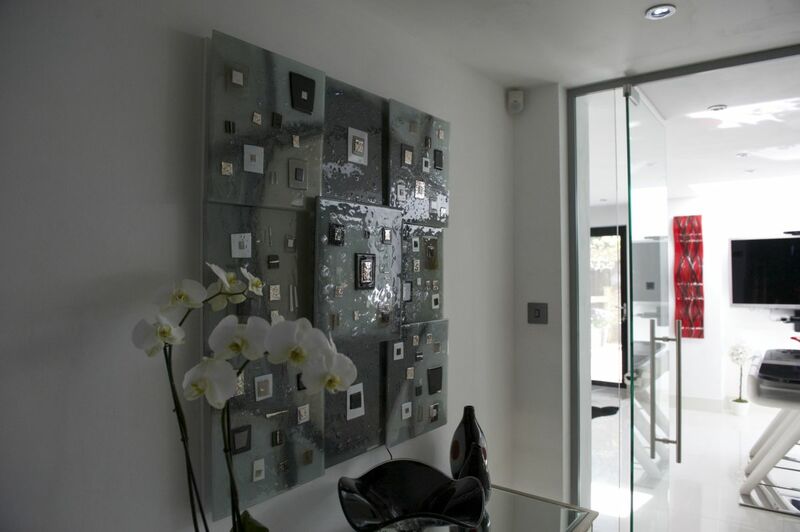 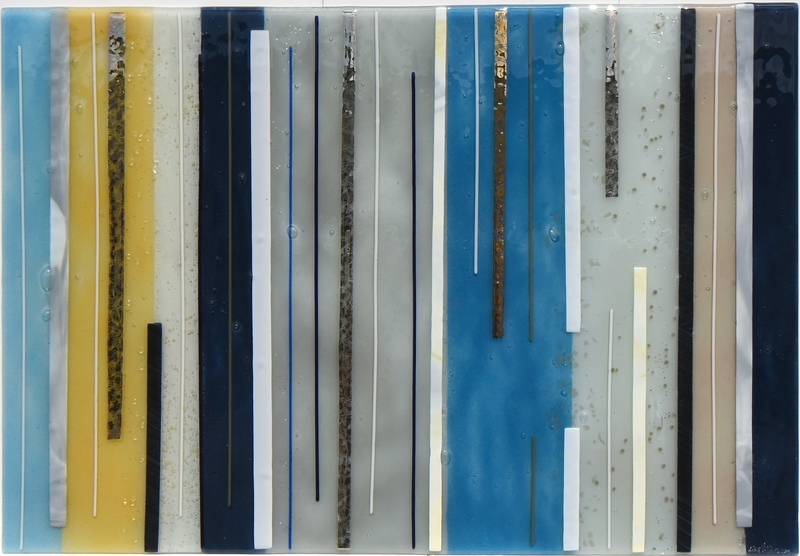 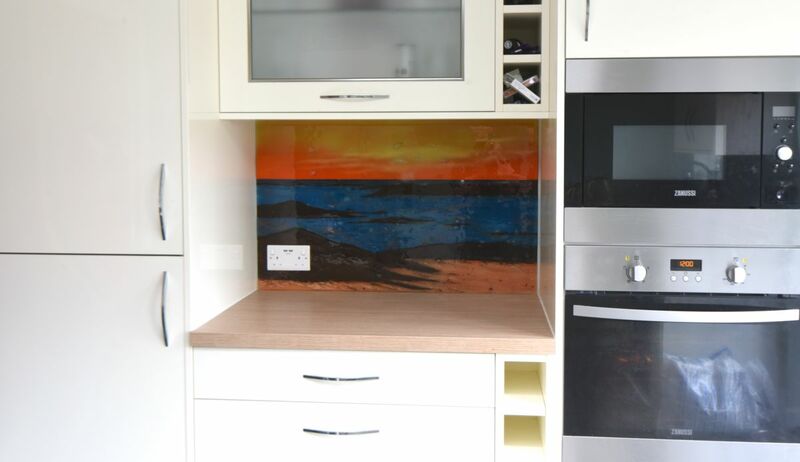 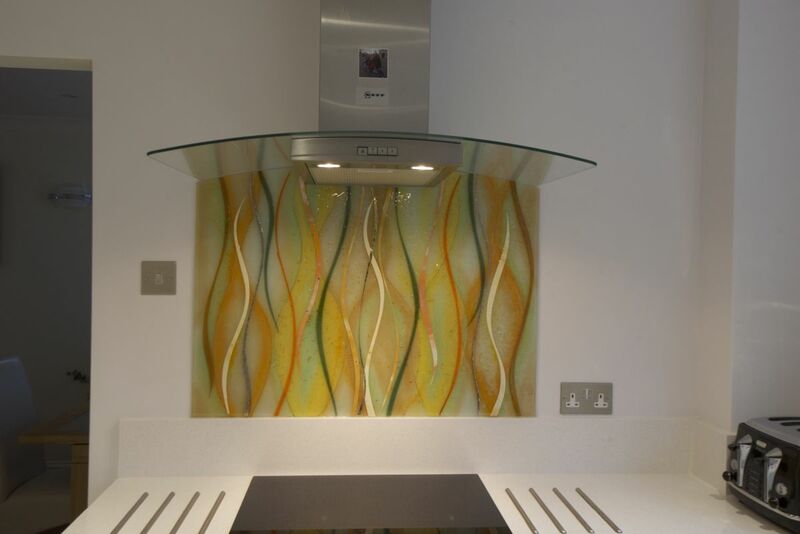 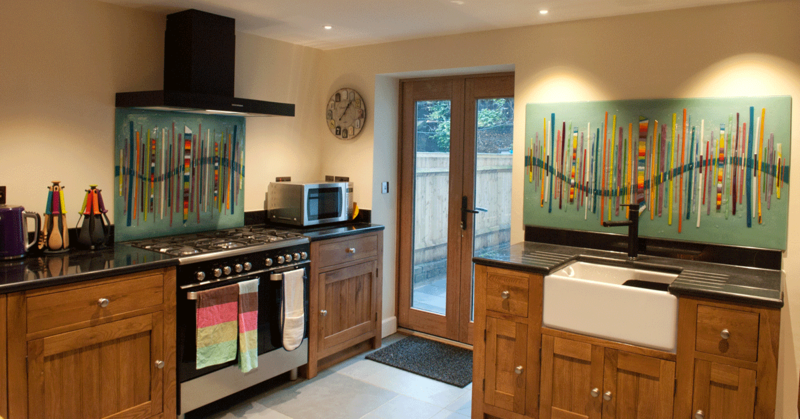 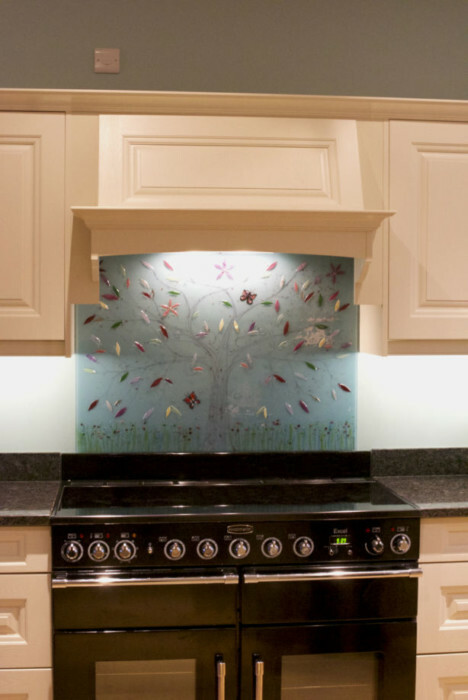 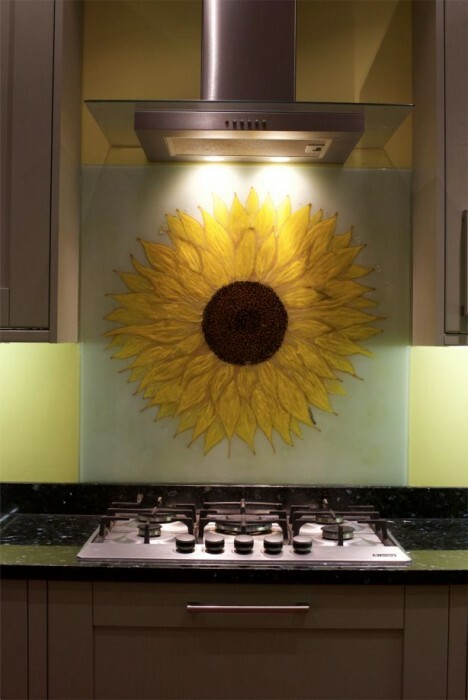 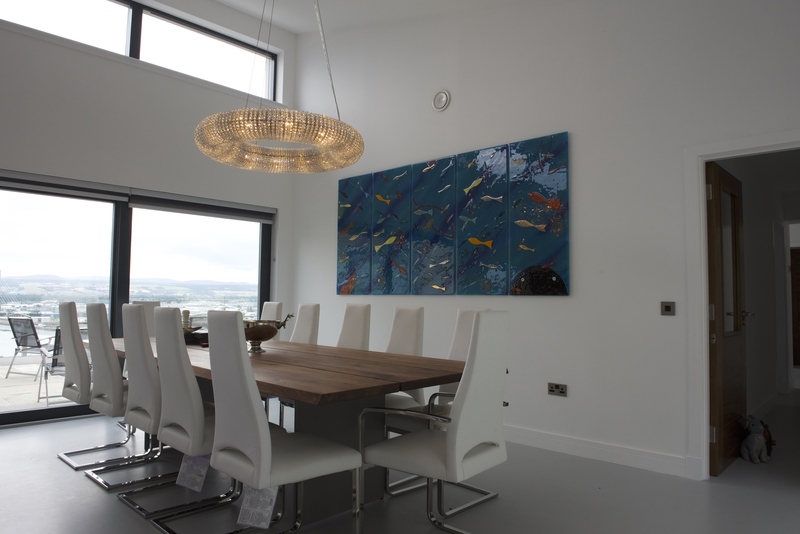 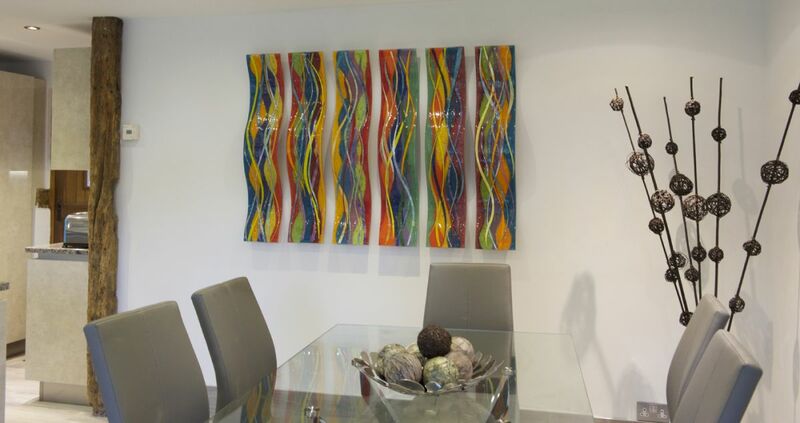 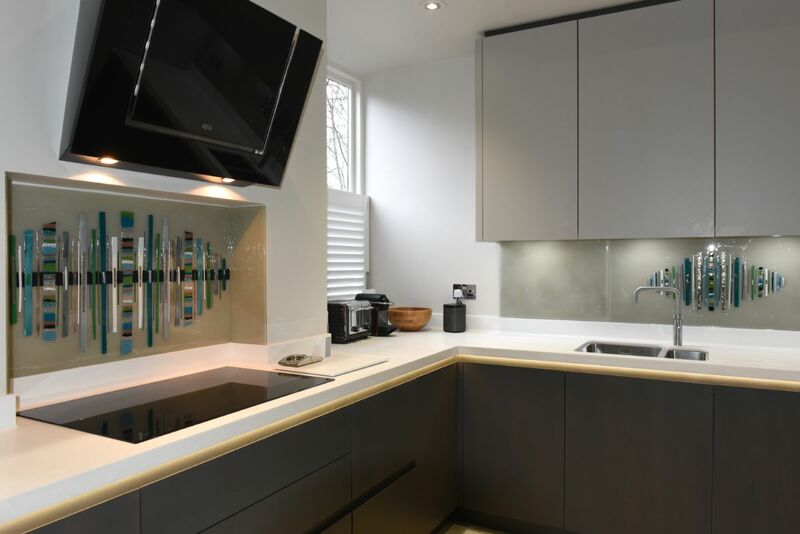 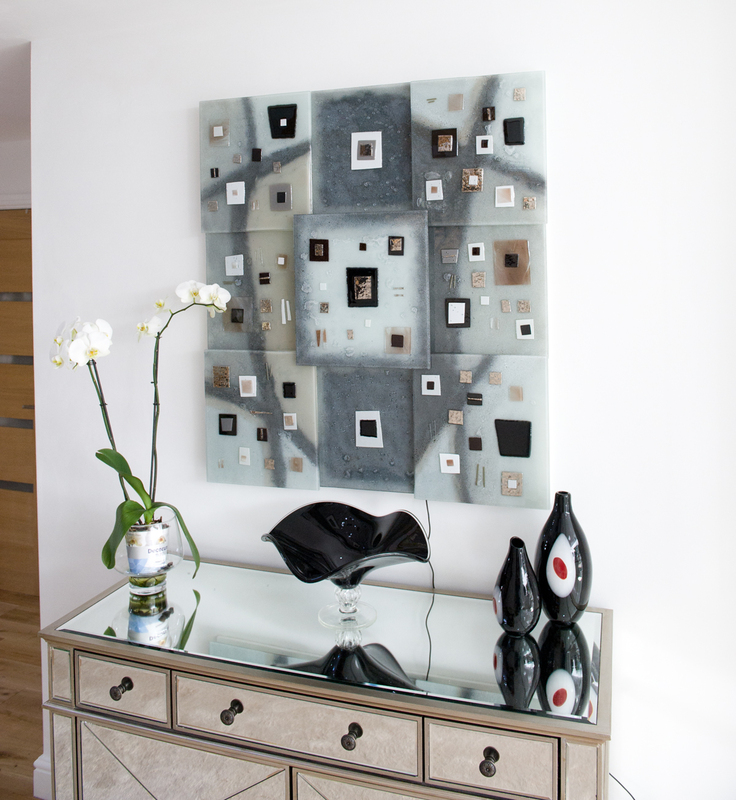 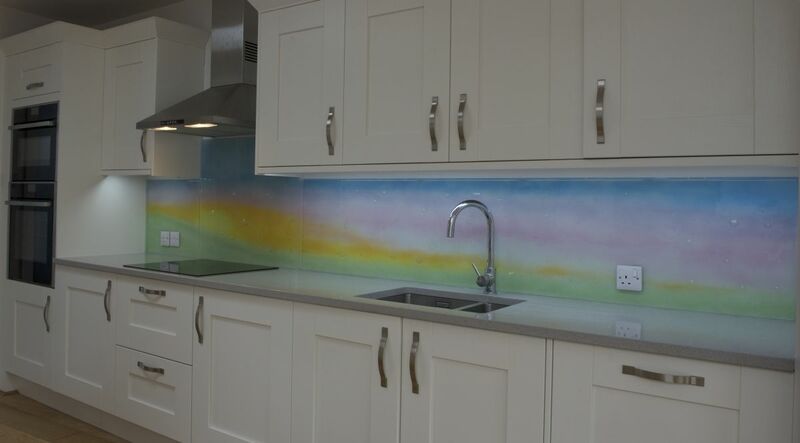 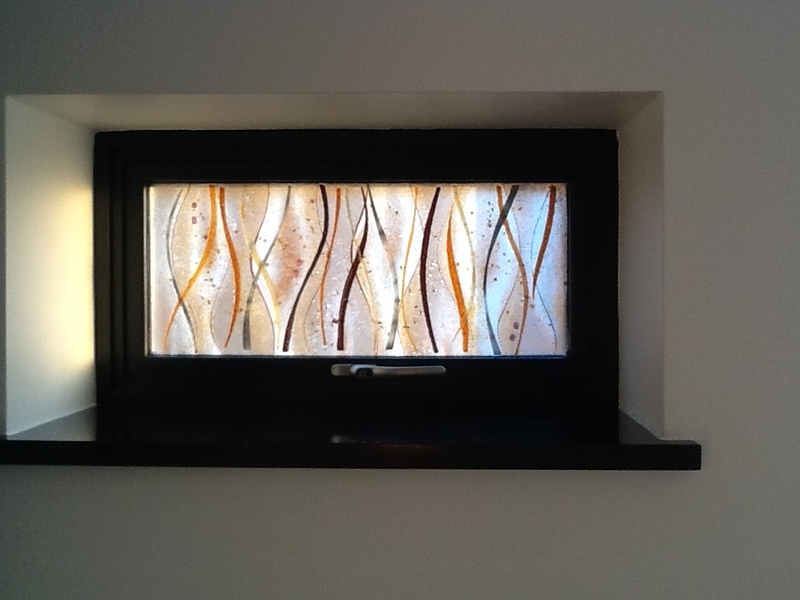 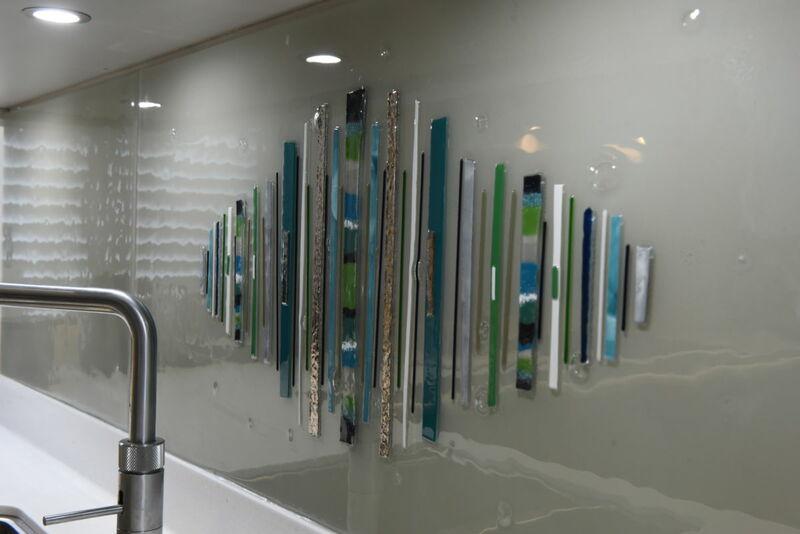 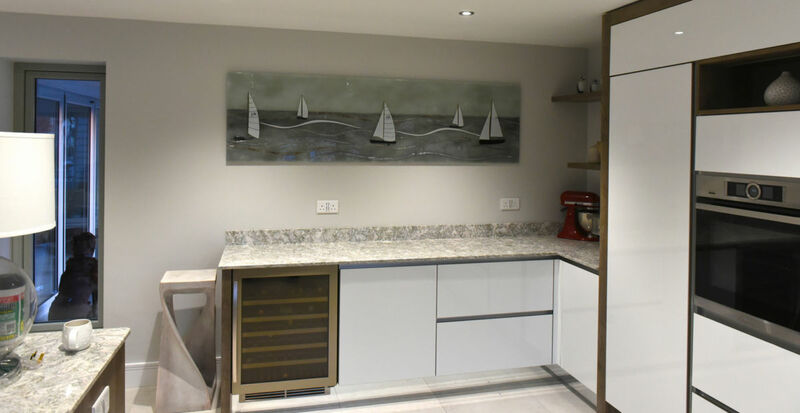 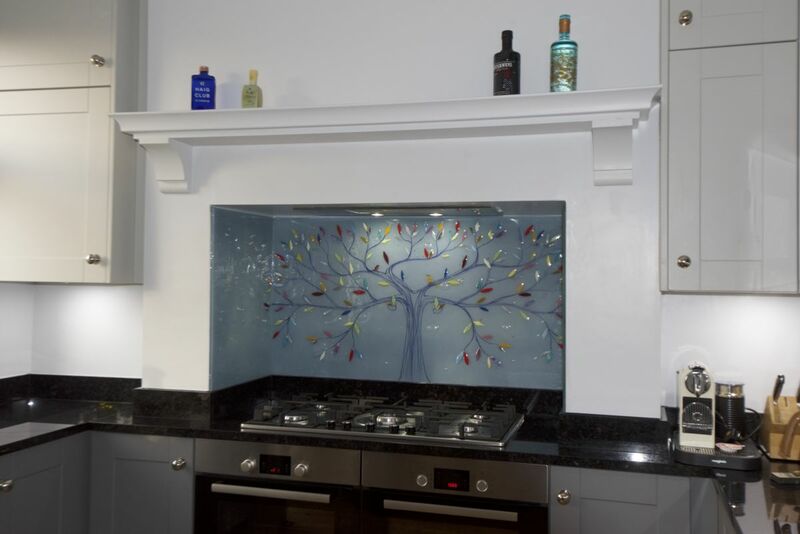 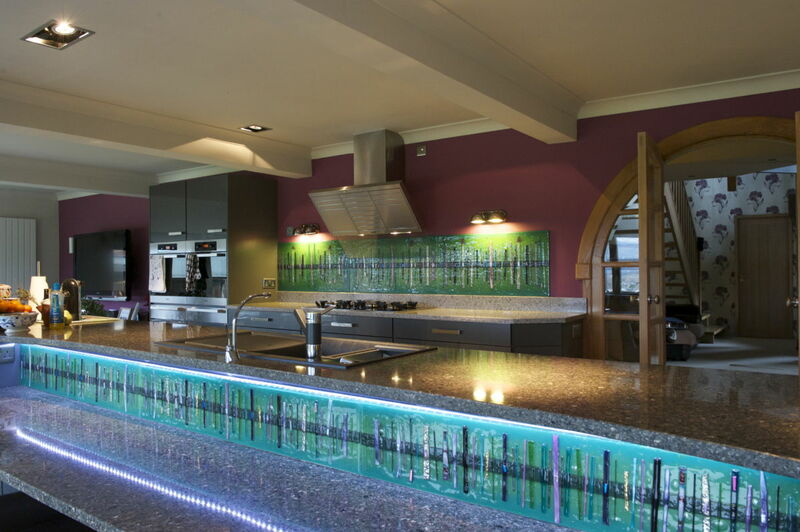 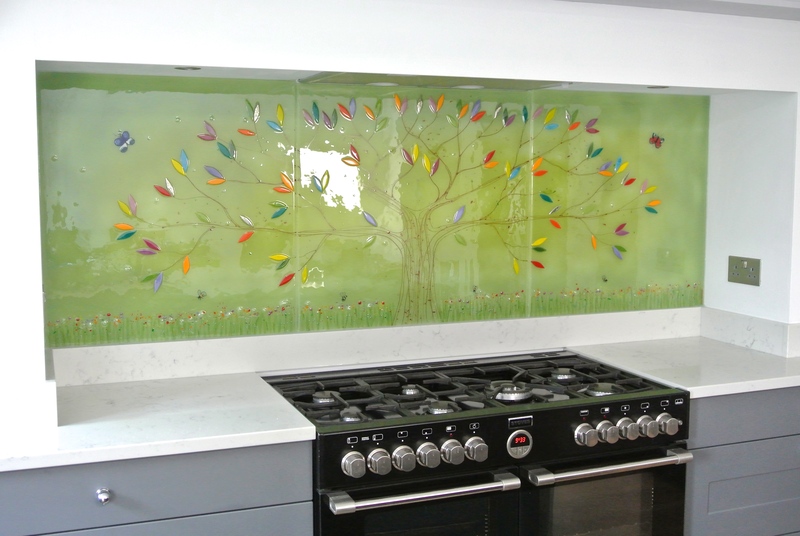 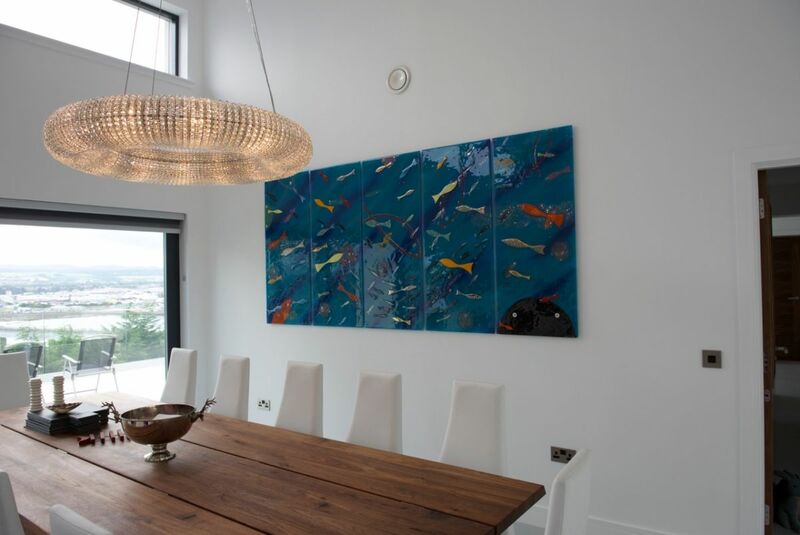 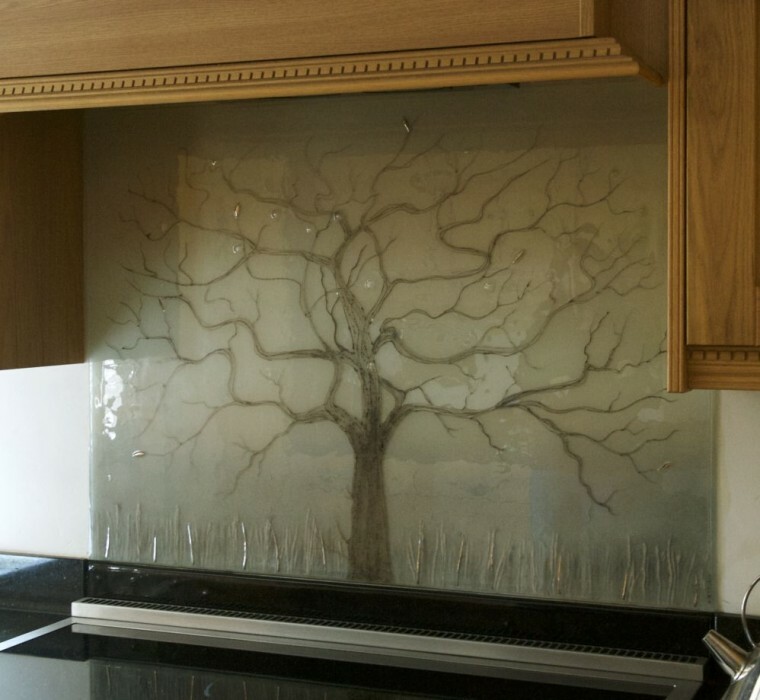 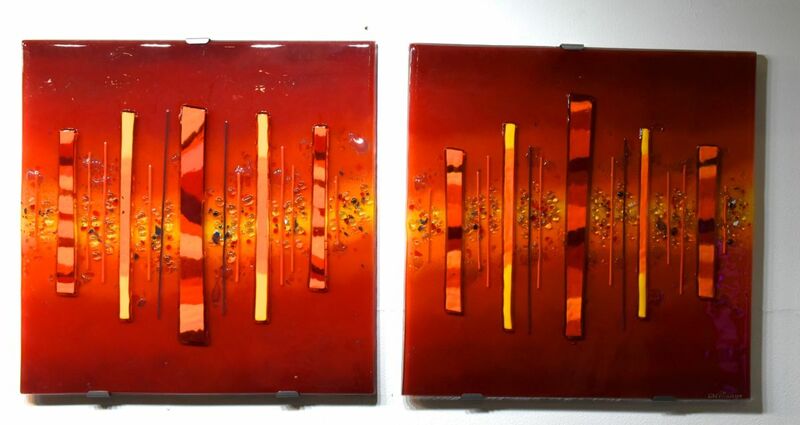 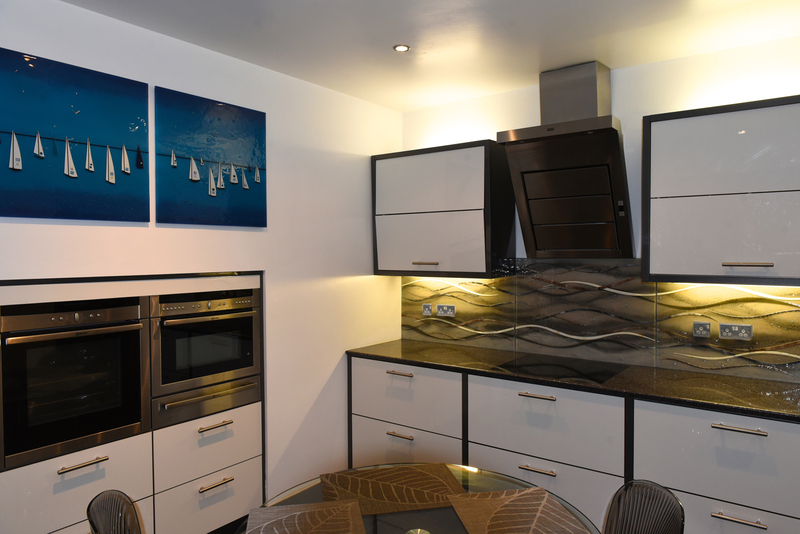 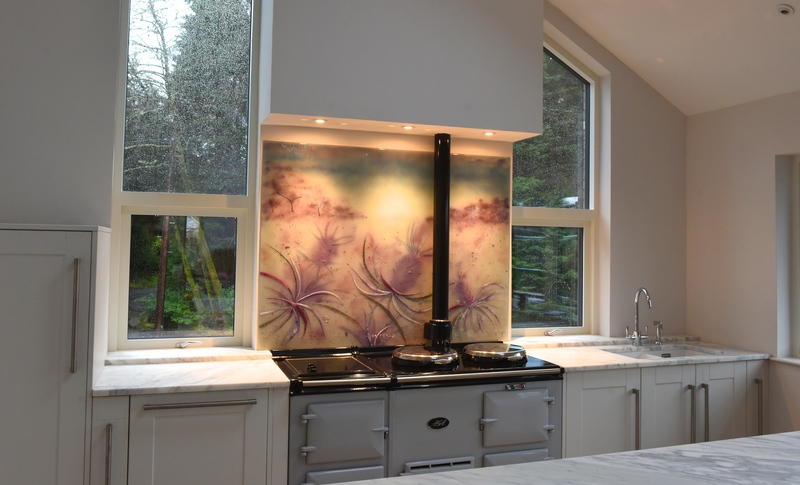 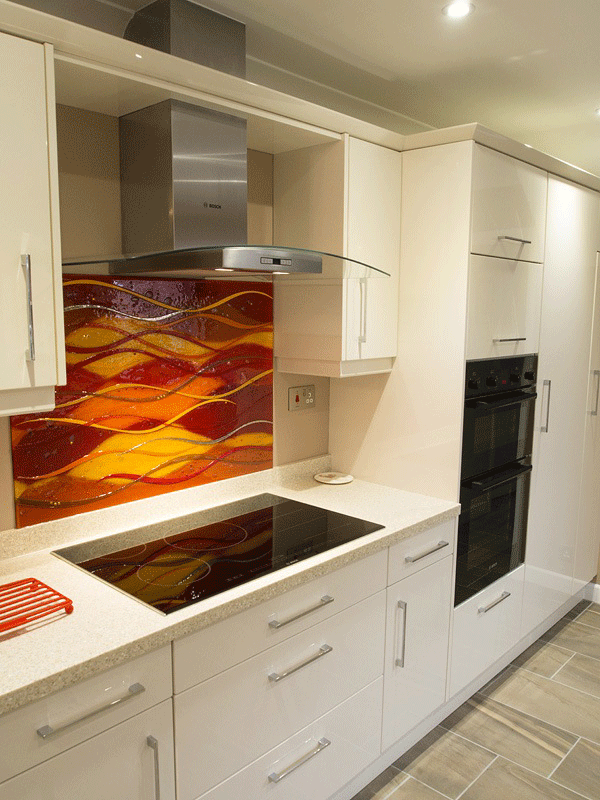 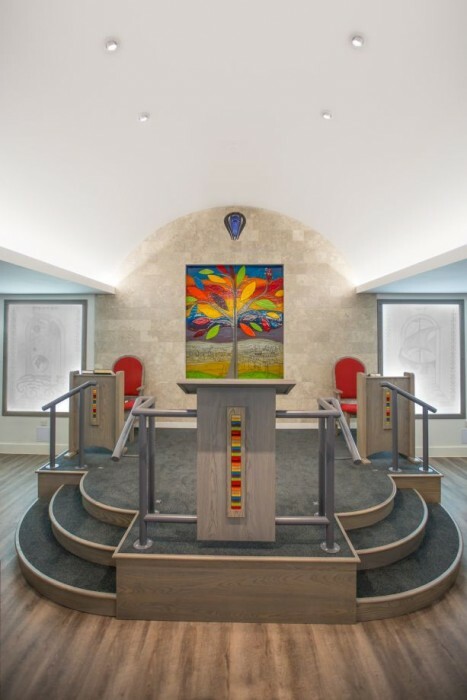 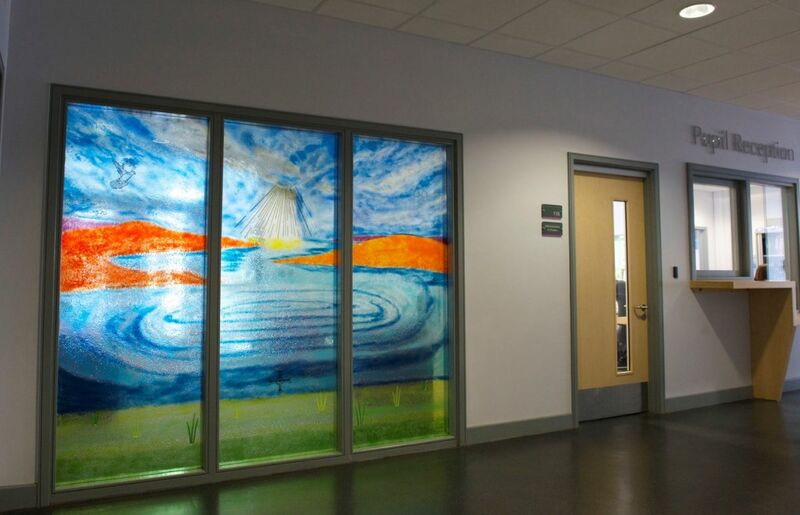 It’s comprised of three fused glass art panels that work seamlessly together, with one central splashback and two surrounding pieces helping to create the effect you see here. 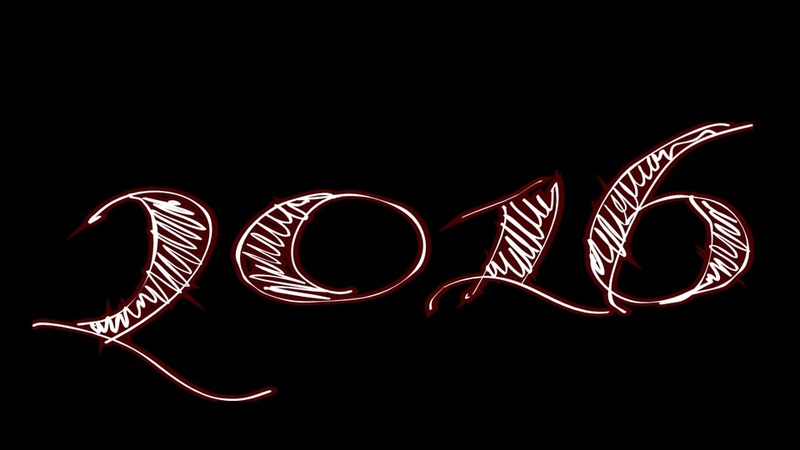 And what an effect it is! 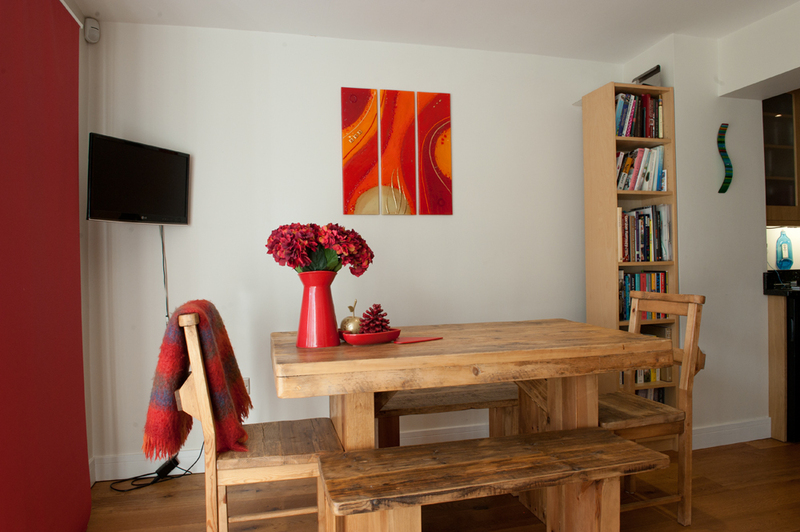 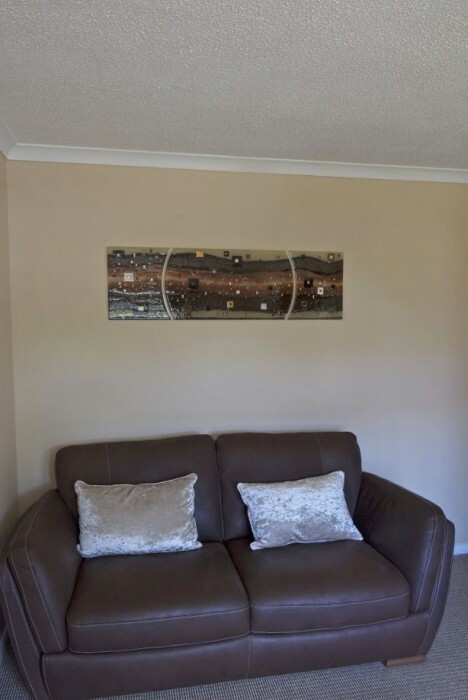 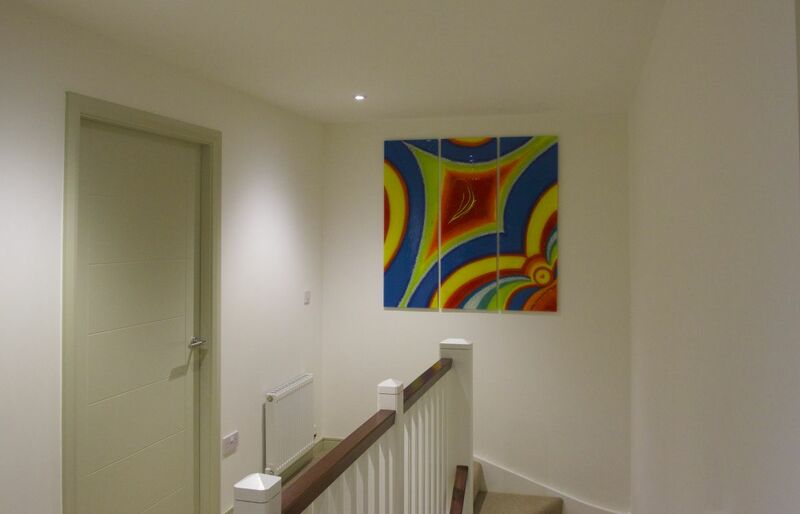 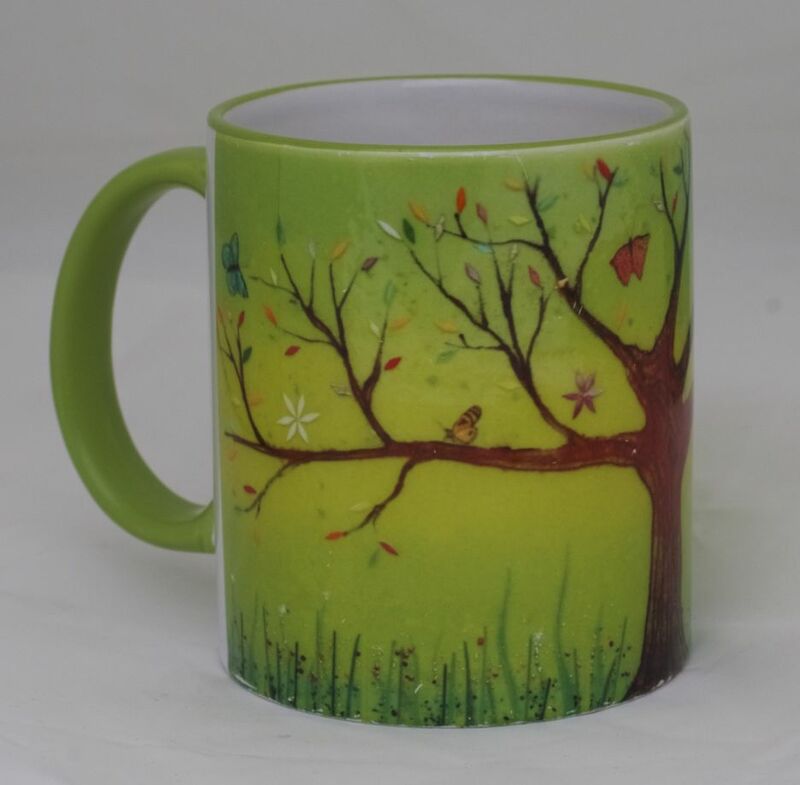 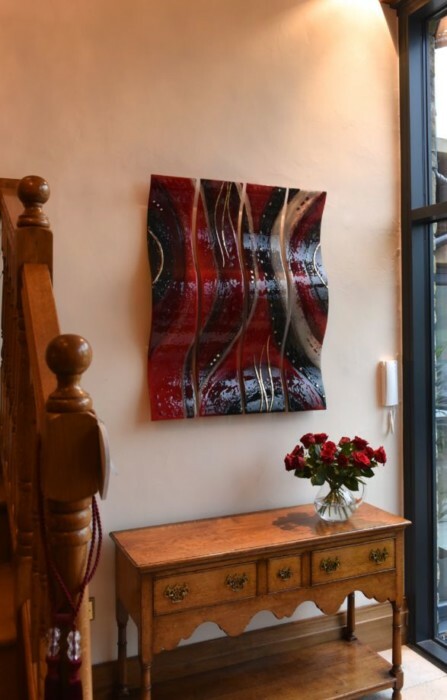 The panoramic effect is immediately recognisable, and it’s probably the first thing that you notice when you first spot this piece nestled under the cupboards making a big impression. 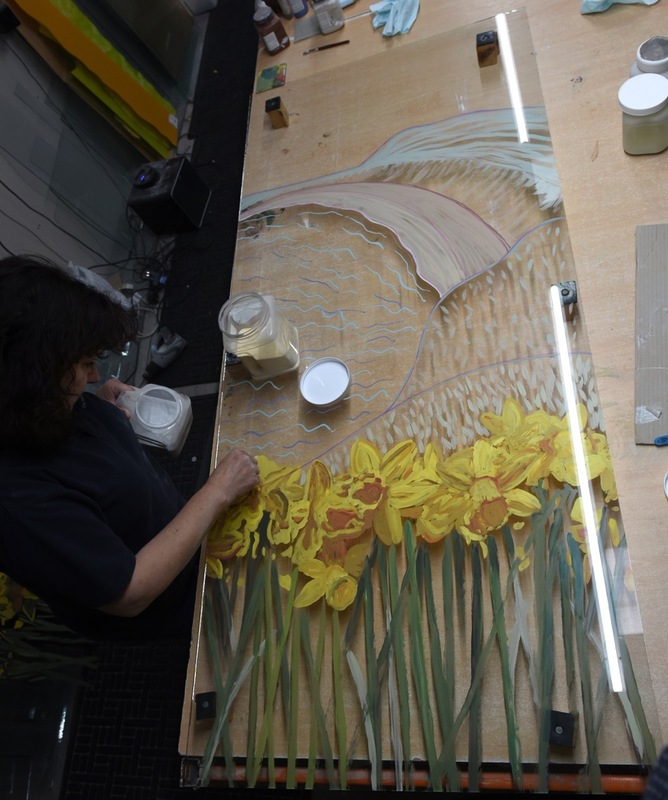 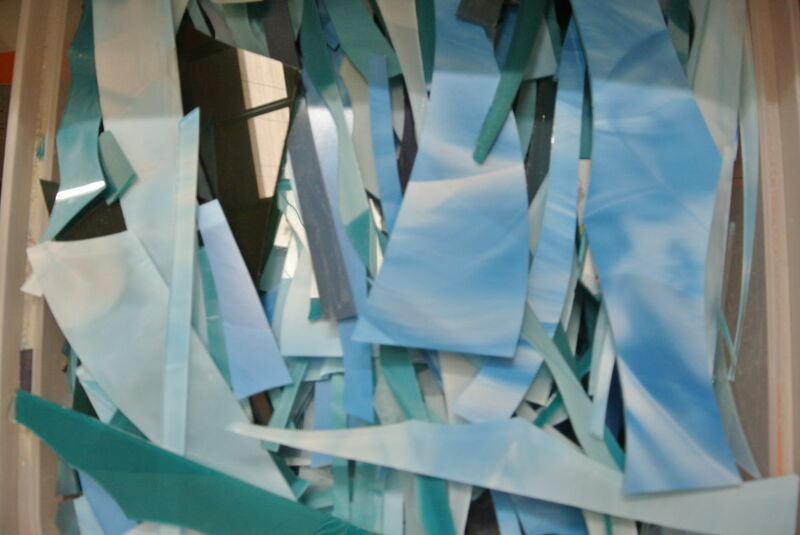 The central panel is the key, as it’s where all of the visuals come together. 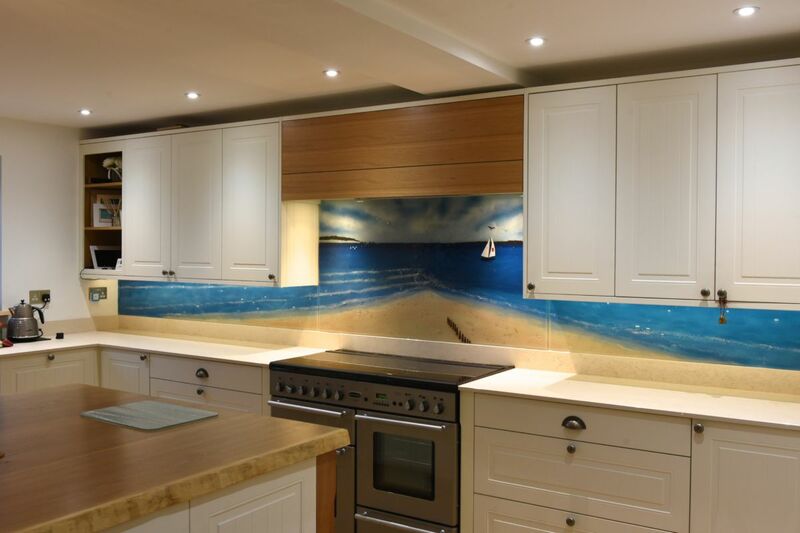 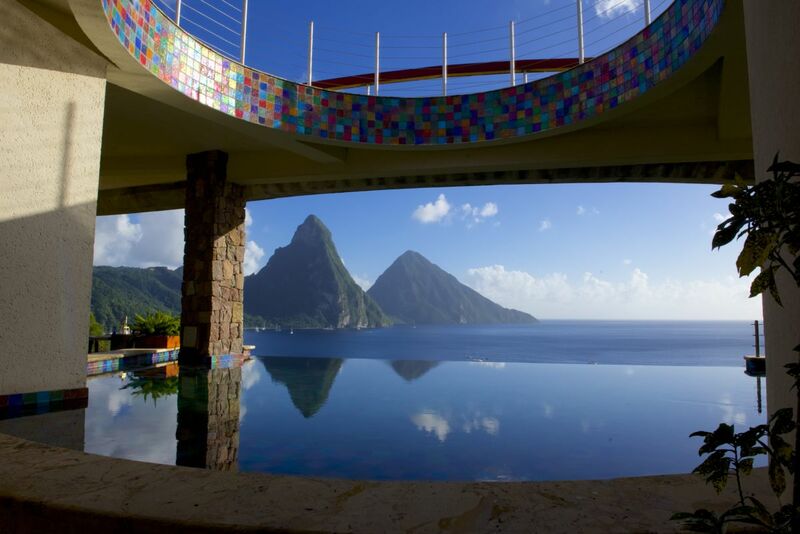 It features a design that presents the sandy shores of a beach meeting the deep waters of the open sea, with converging waters and a strong sense of perspective. 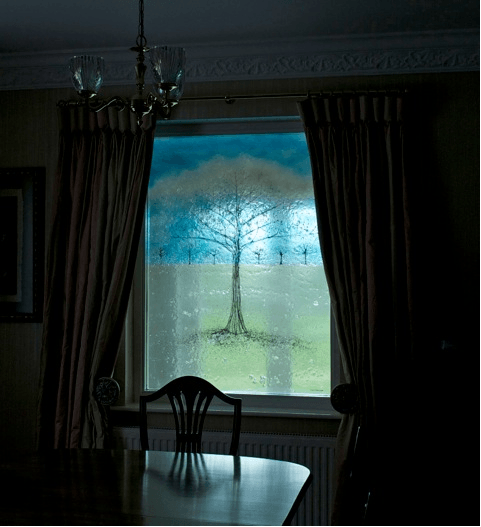 It’s almost like looking into a window that leads to the real world! 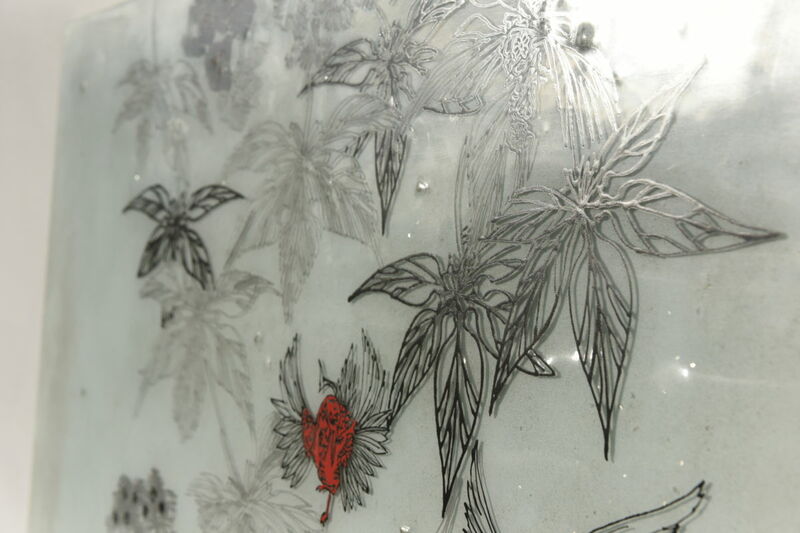 Take a look closer, and you’ll be able to spot all the details in the piece. 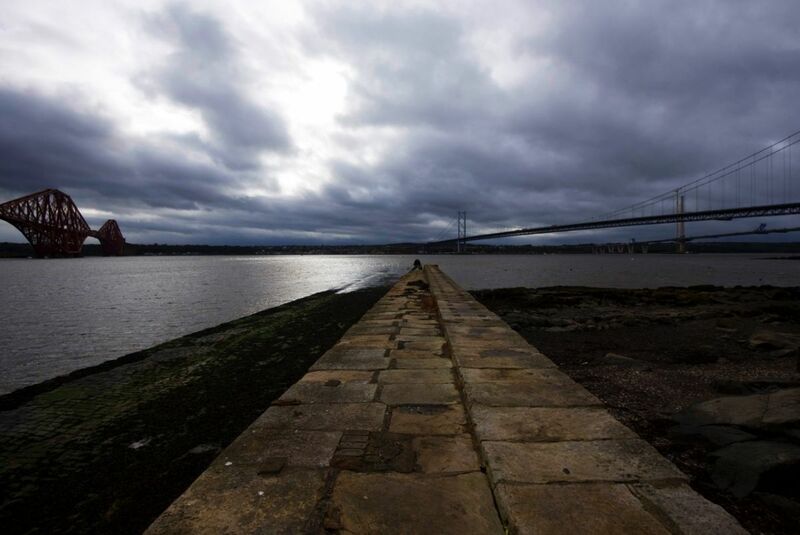 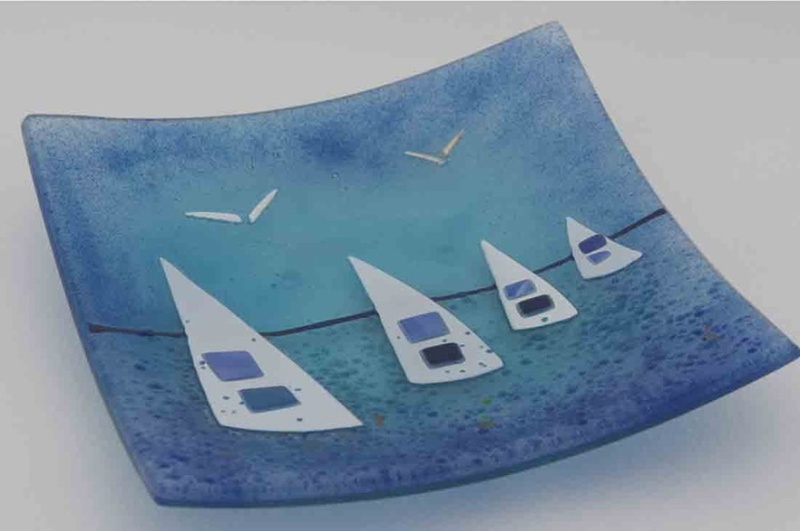 There’s a boat out on the water, and at least one bird taking flight against the clouds in the sky, perhaps hovering close to see what’s going on down below. 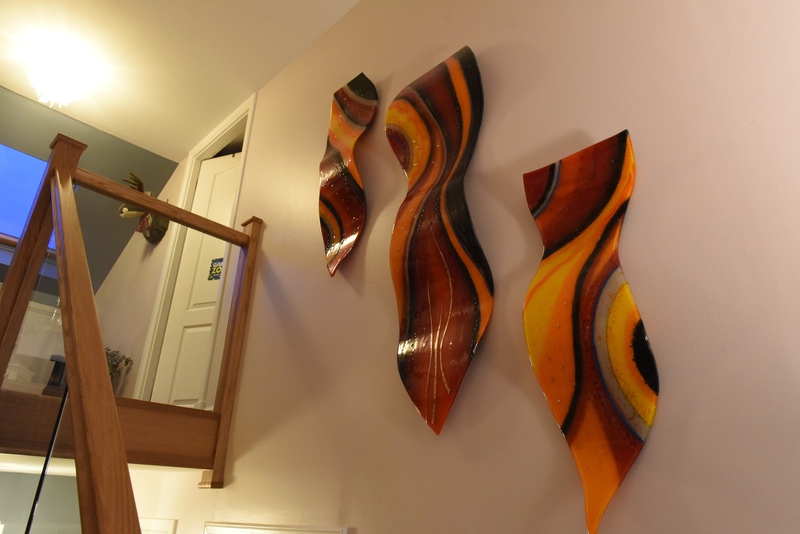 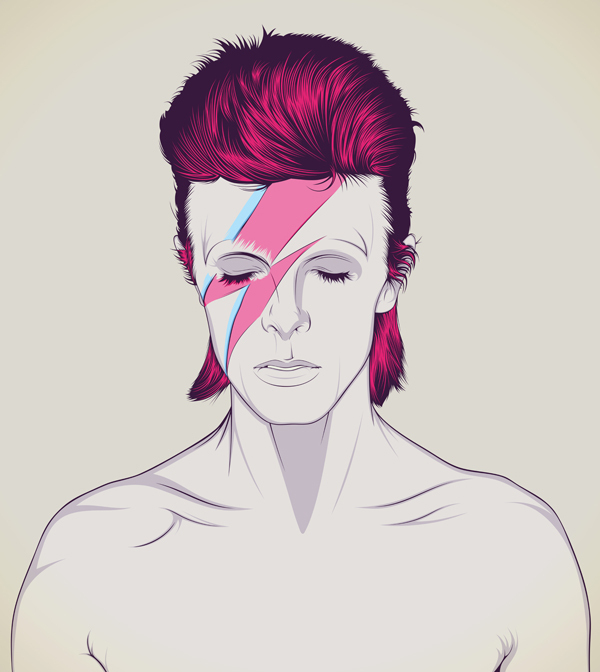 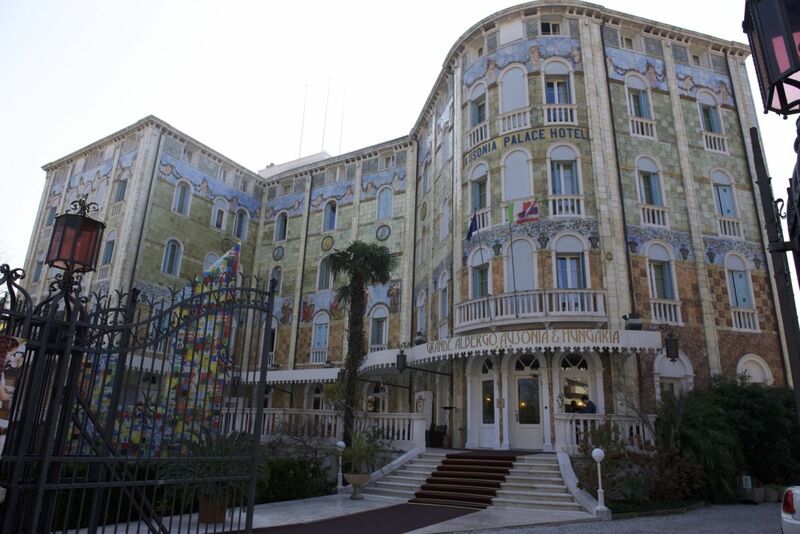 That said, however, a photo simply doesn’t do this piece justice. 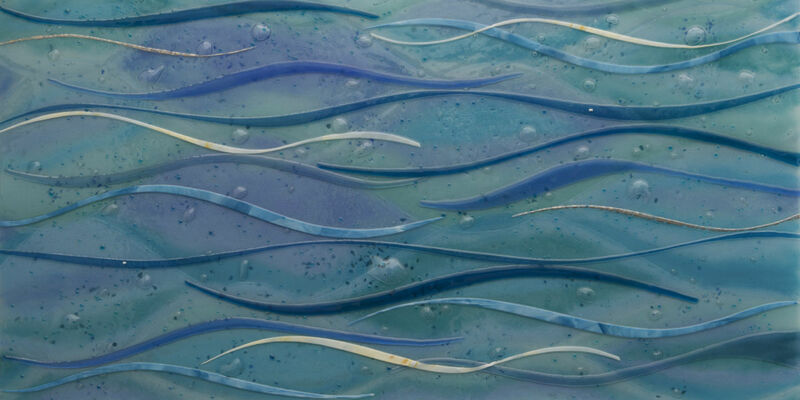 Even the simplest stretches of colours have so much to admire, with subtle gradients and textures making a design like this a joy to look at. 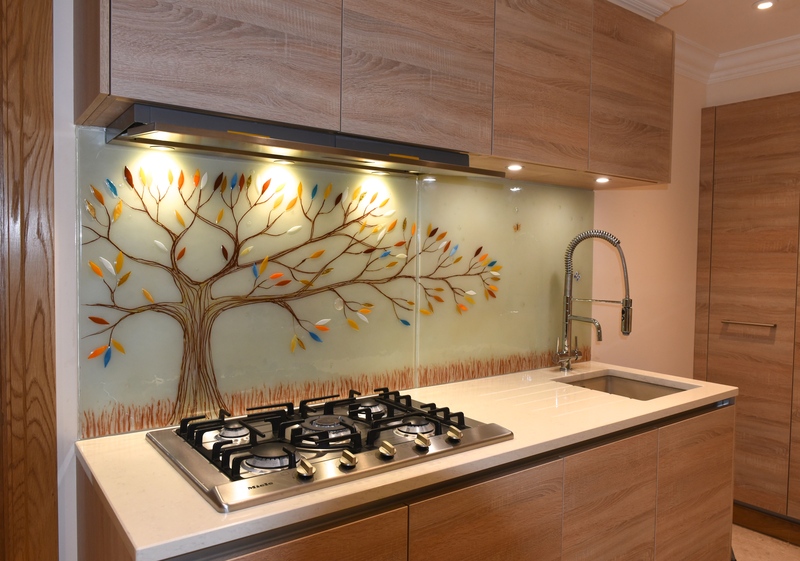 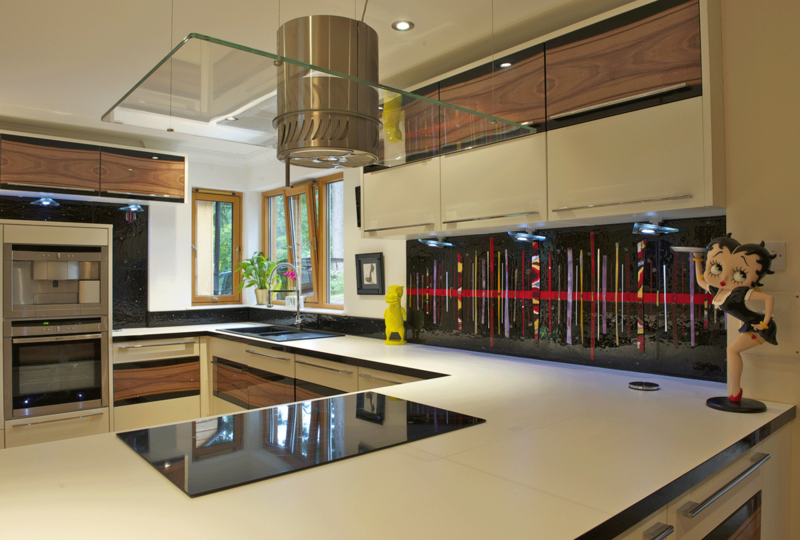 Every time friends and family come into this kitchen, there’ll be something new to notice in the glass. 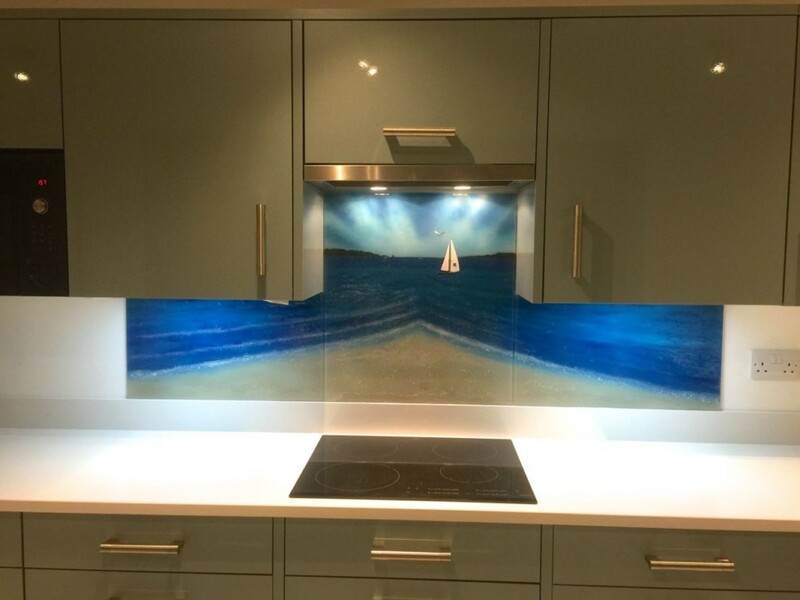 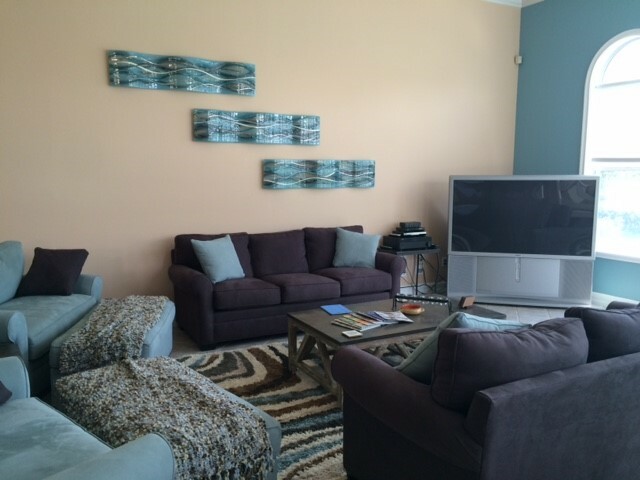 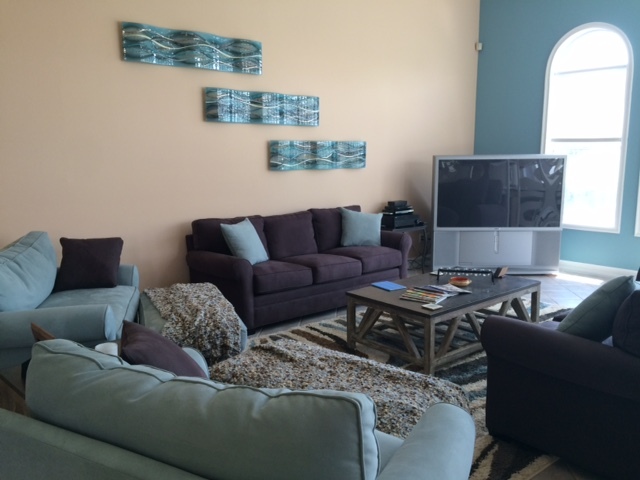 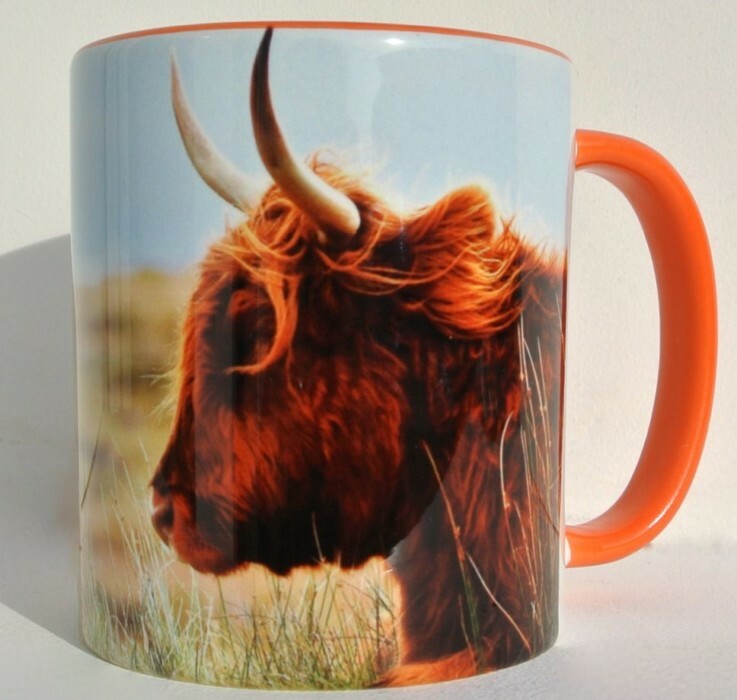 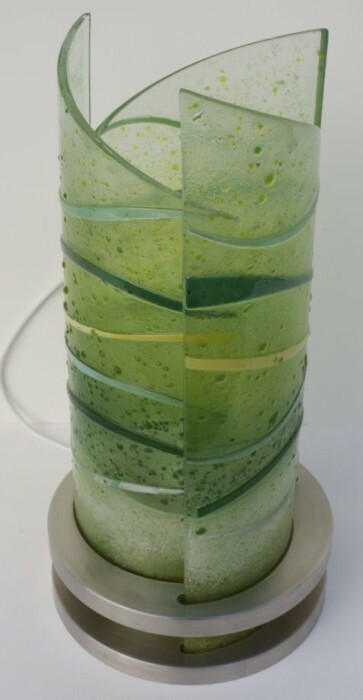 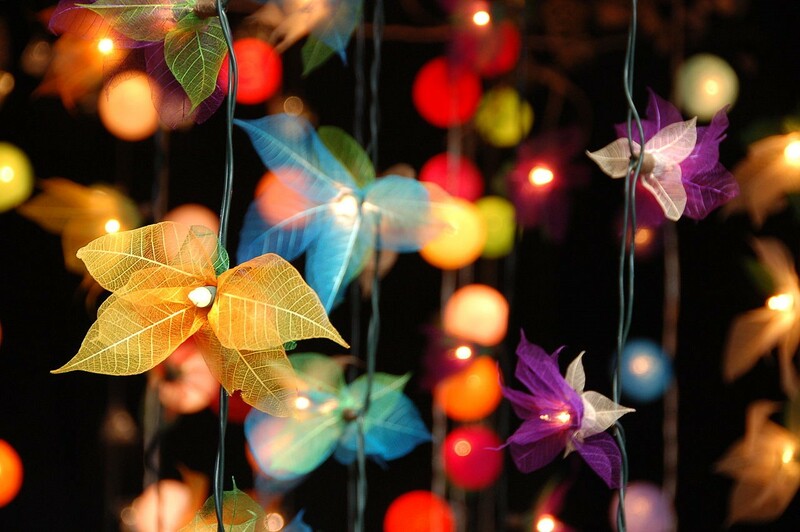 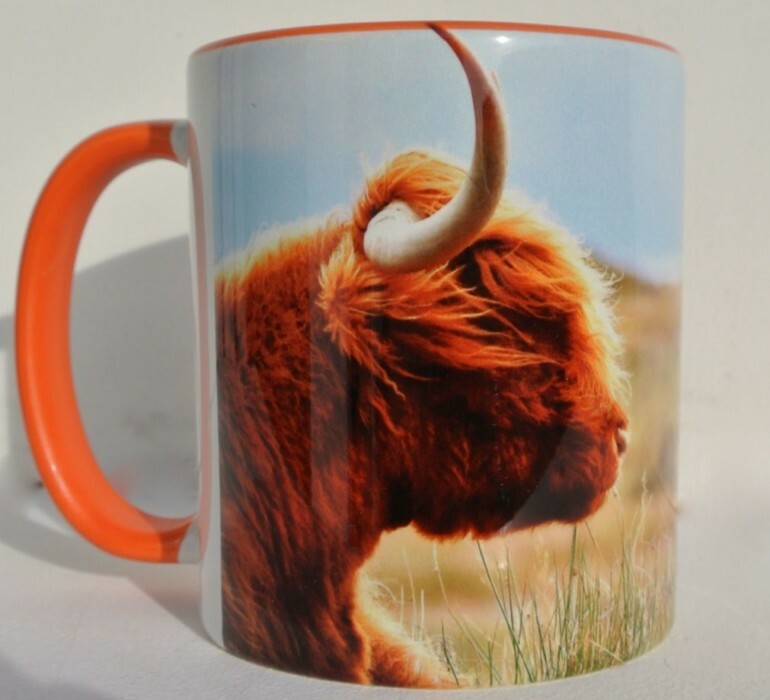 Why not put something just like this in your own home? 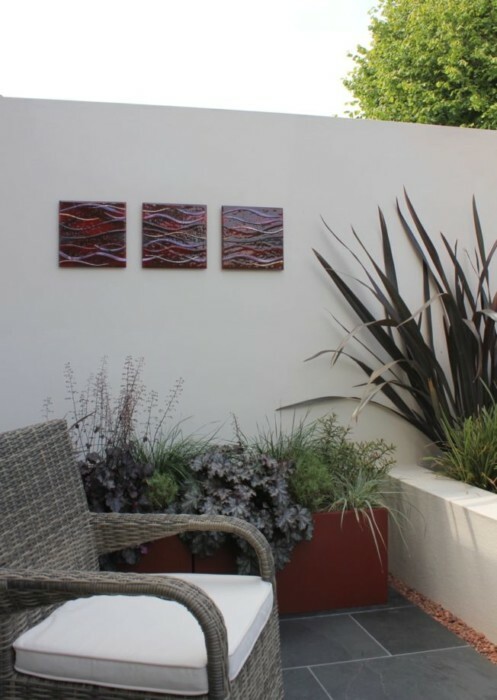 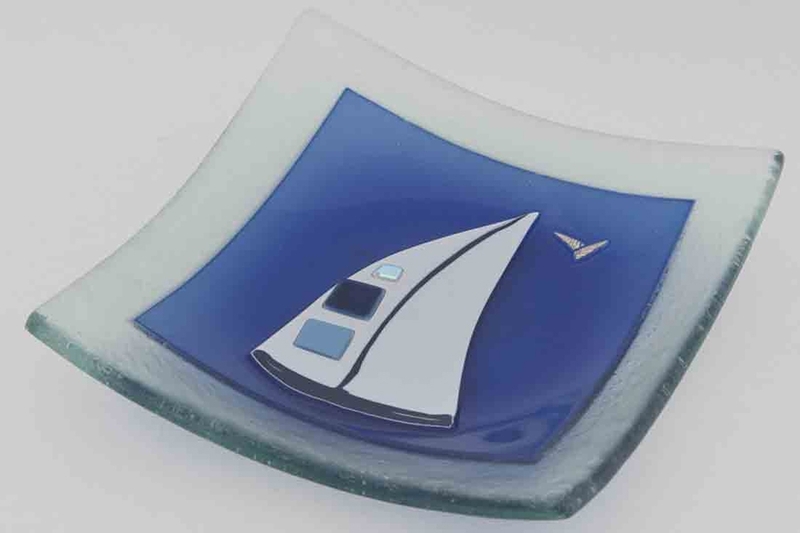 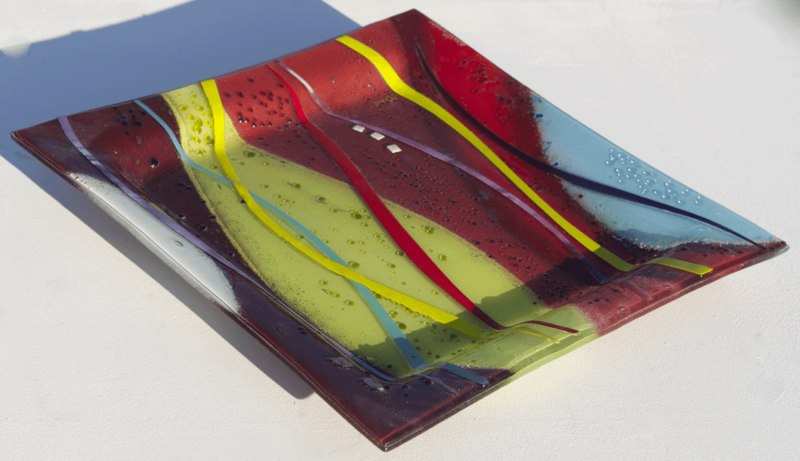 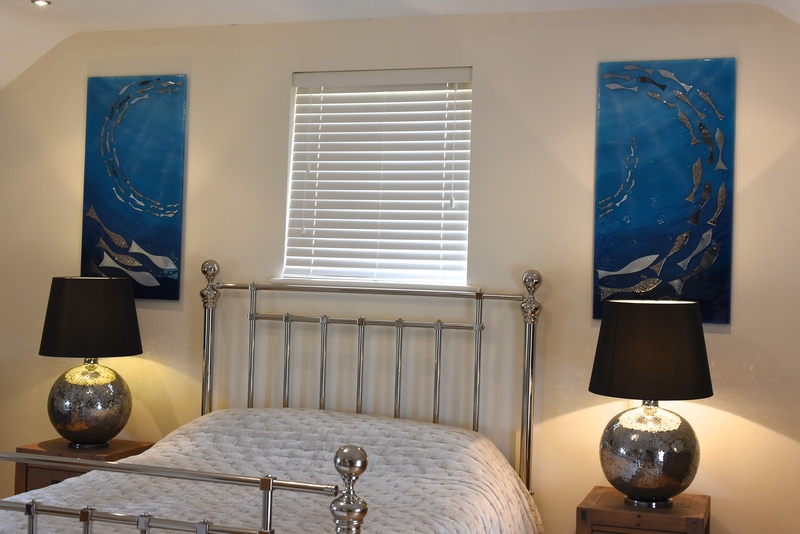 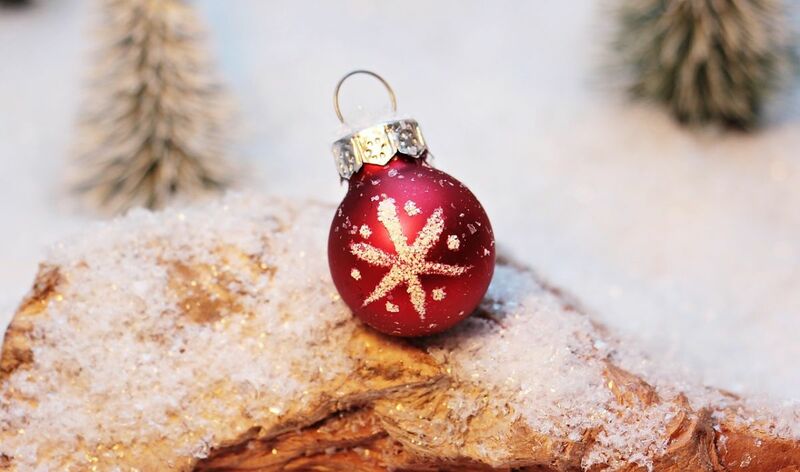 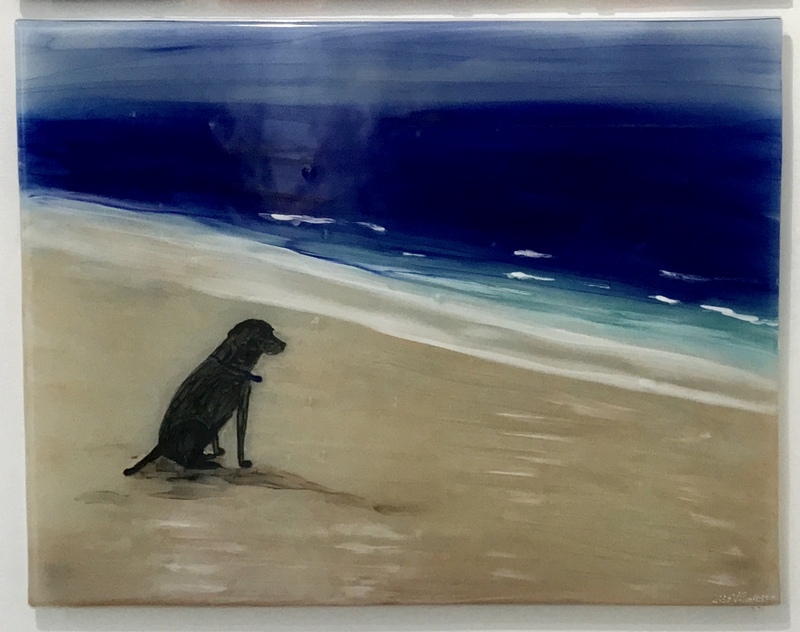 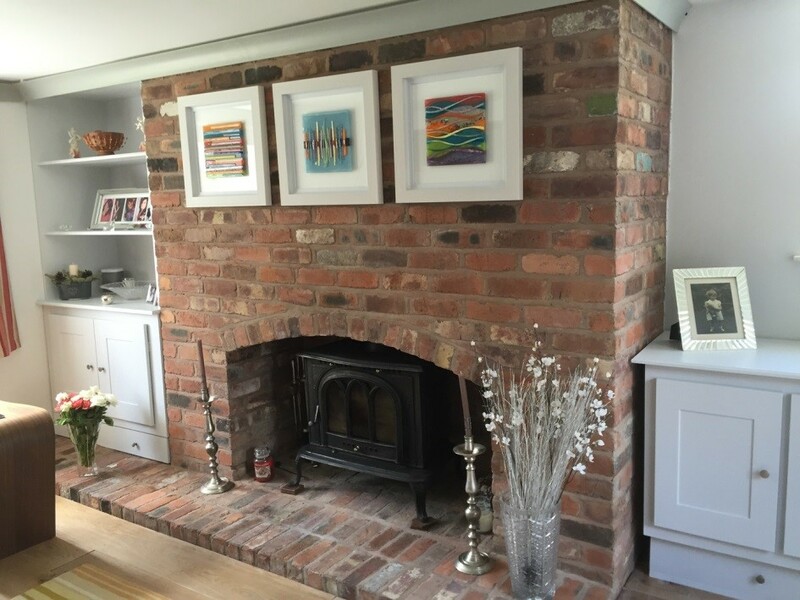 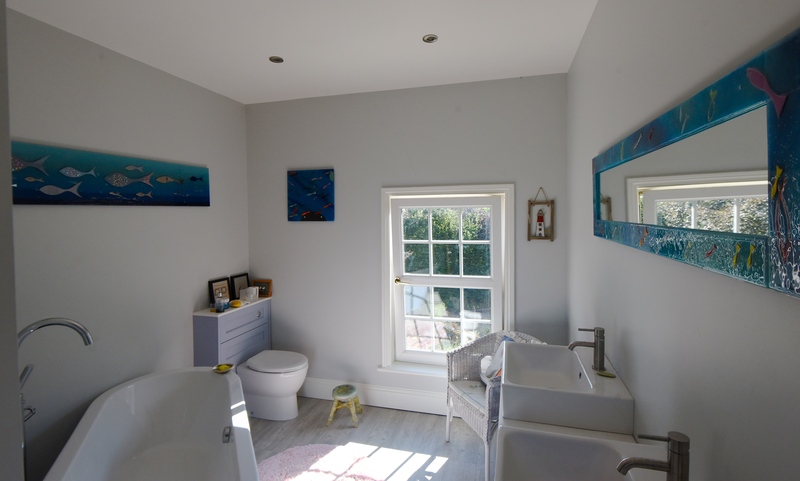 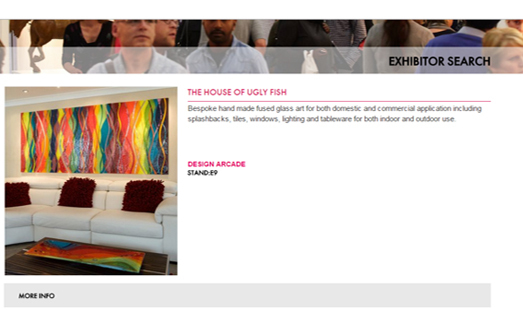 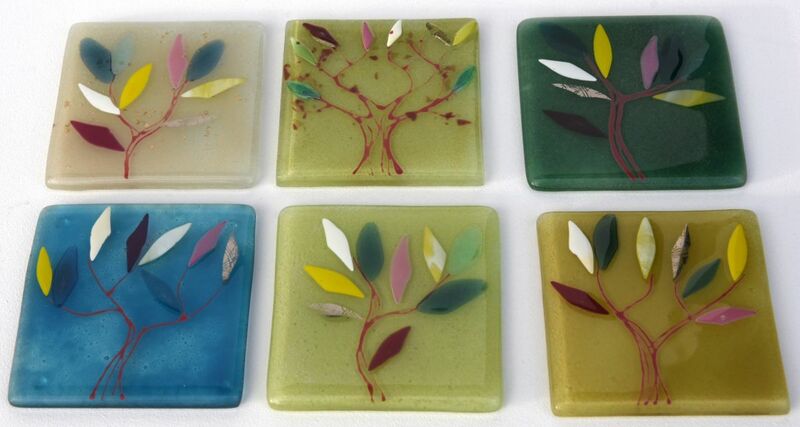 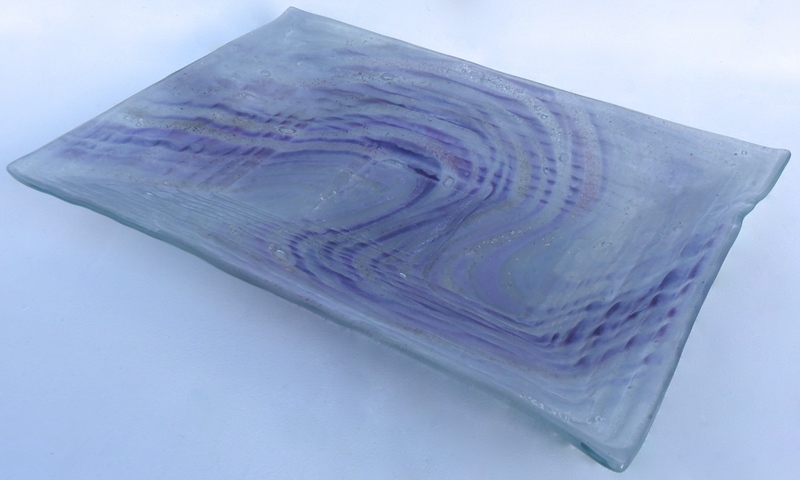 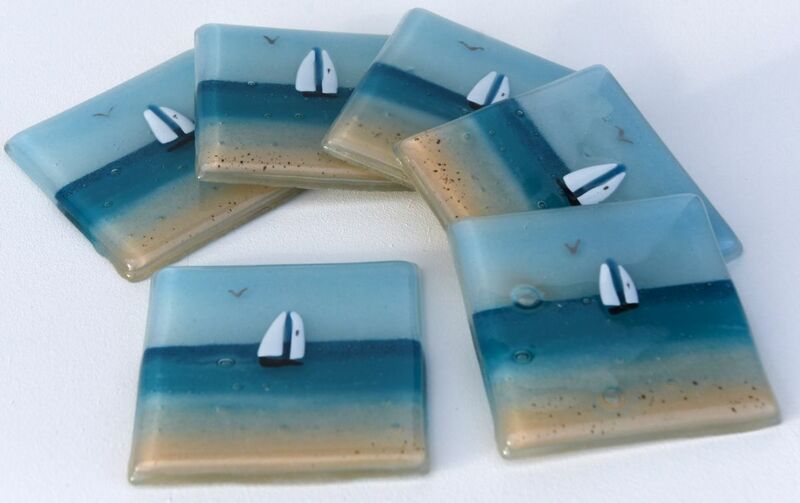 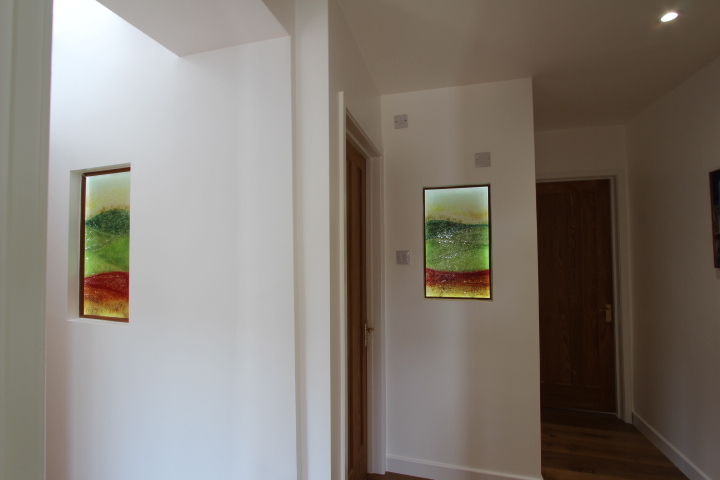 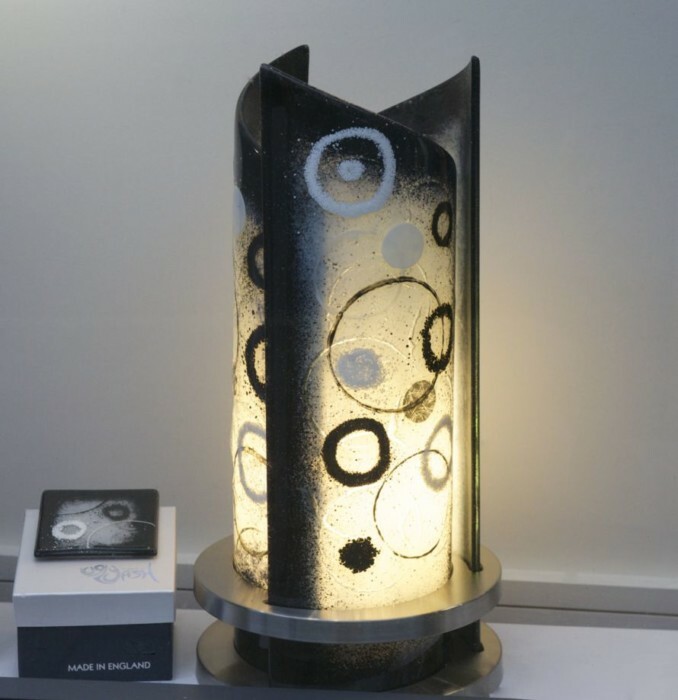 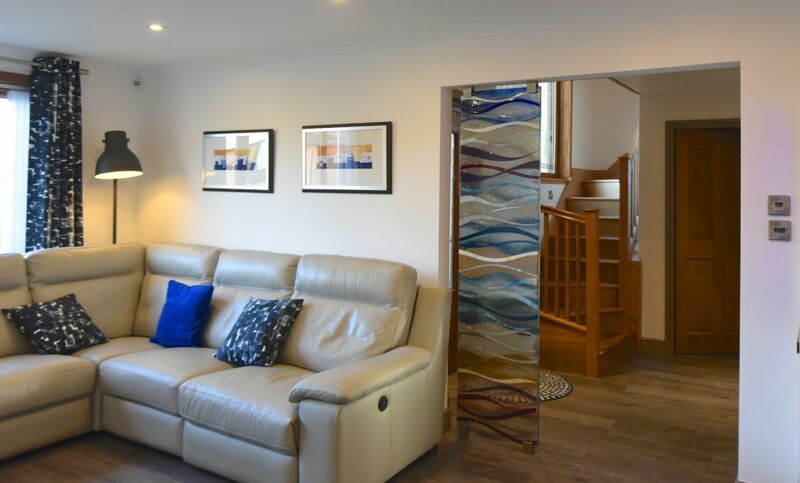 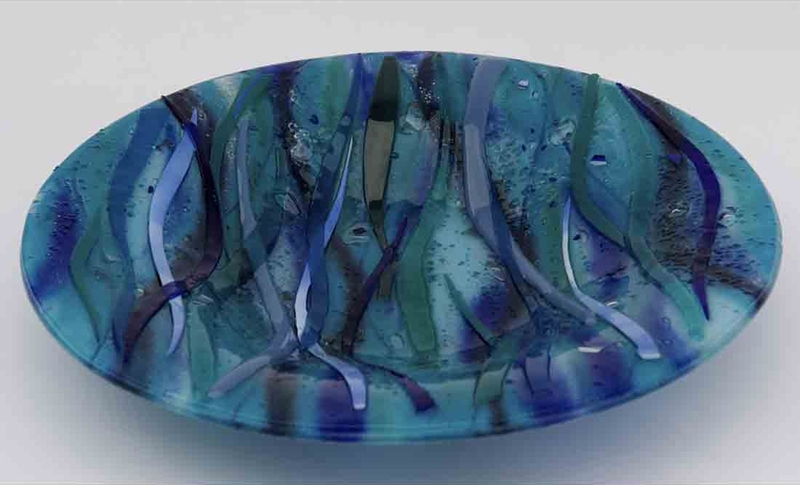 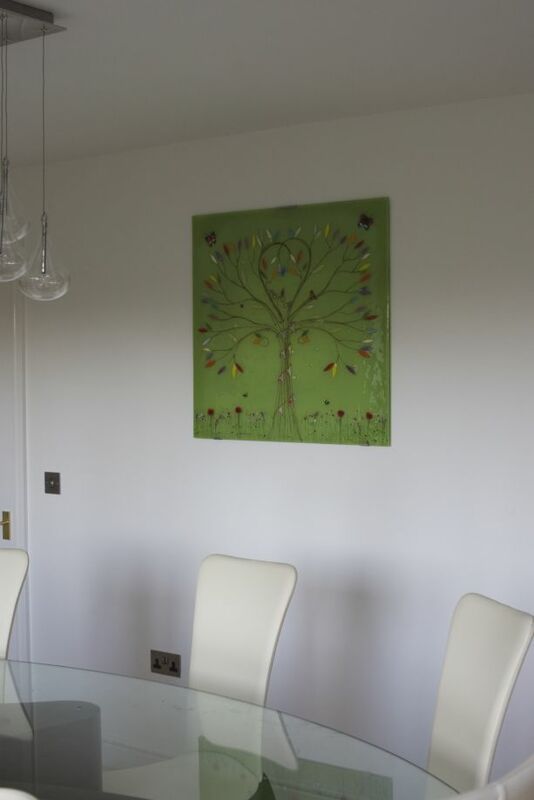 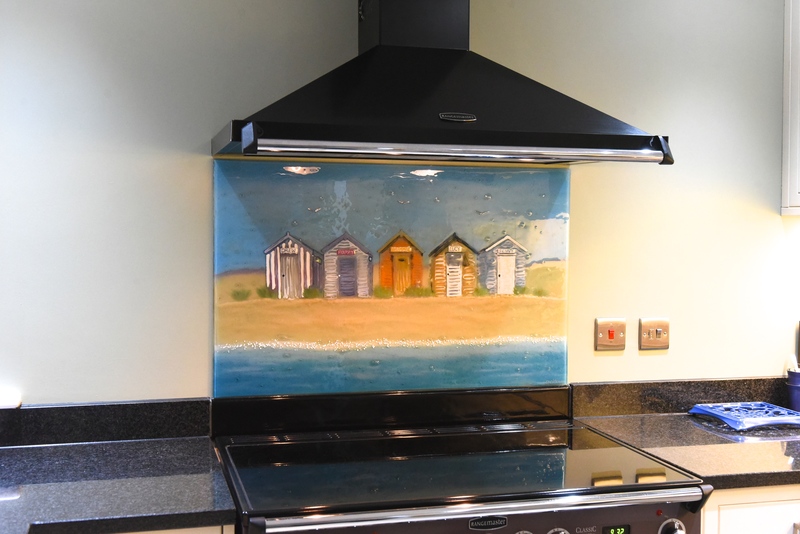 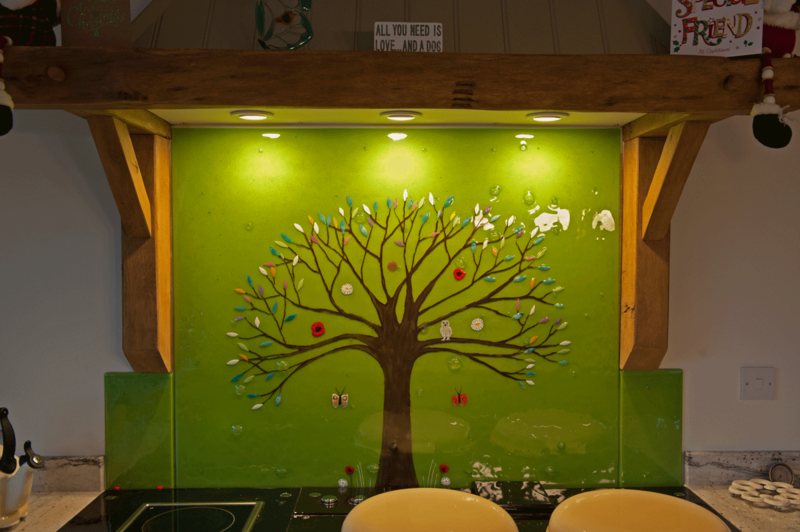 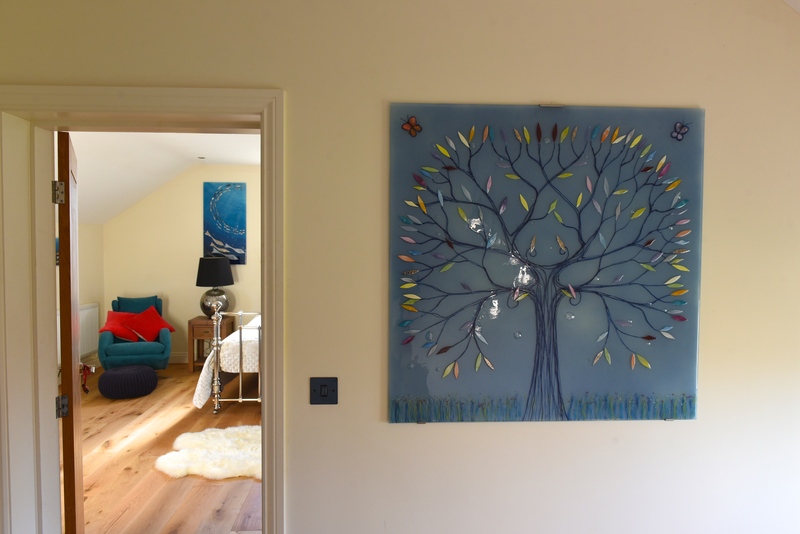 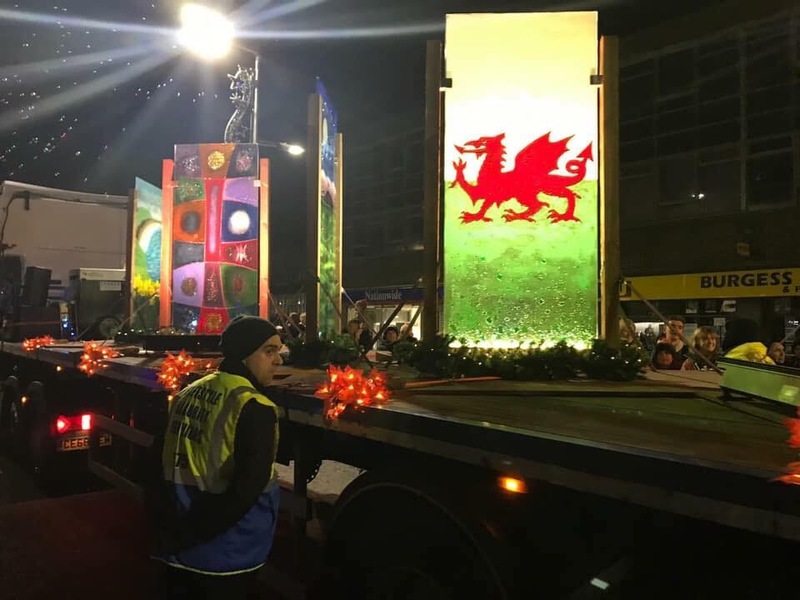 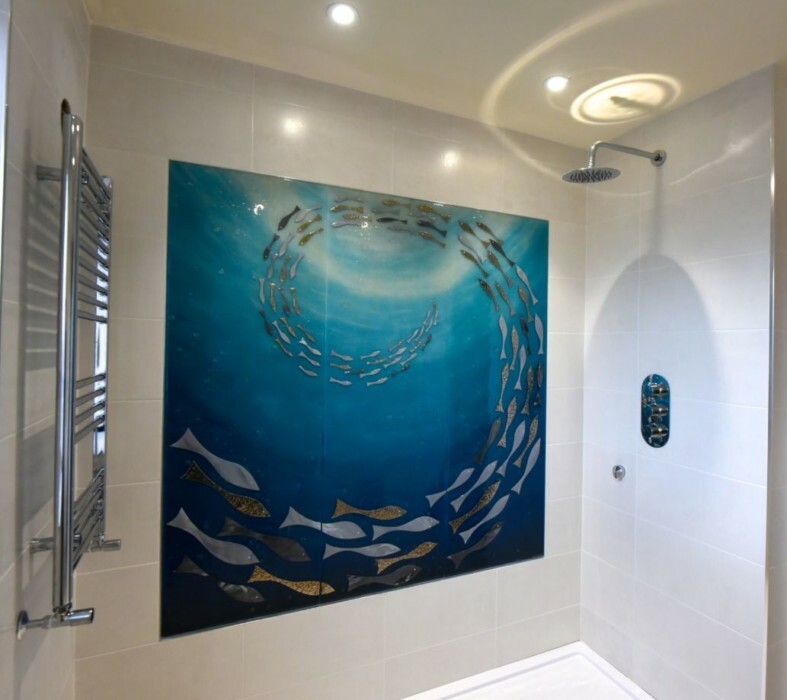 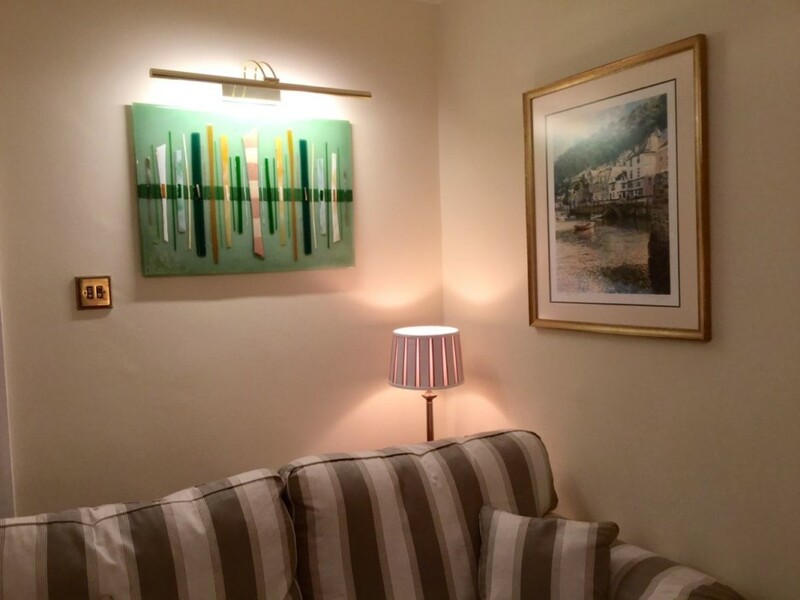 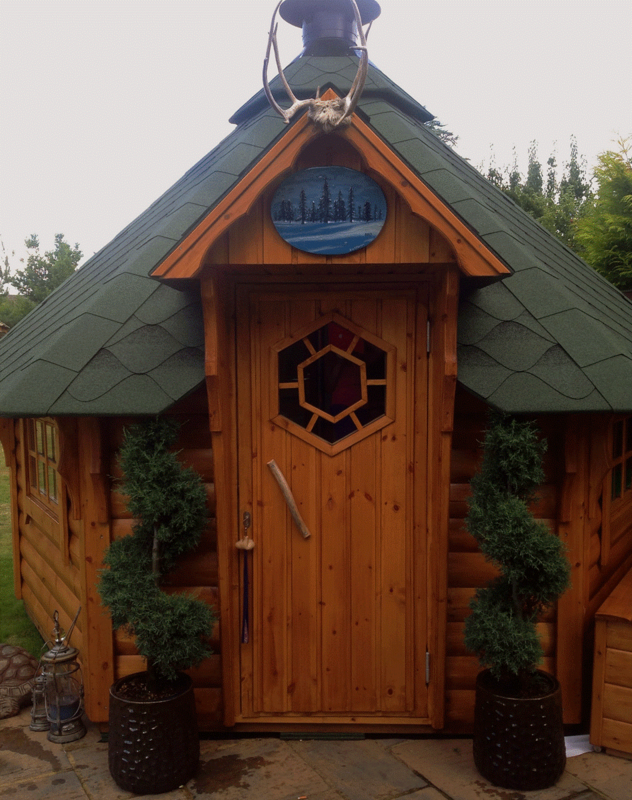 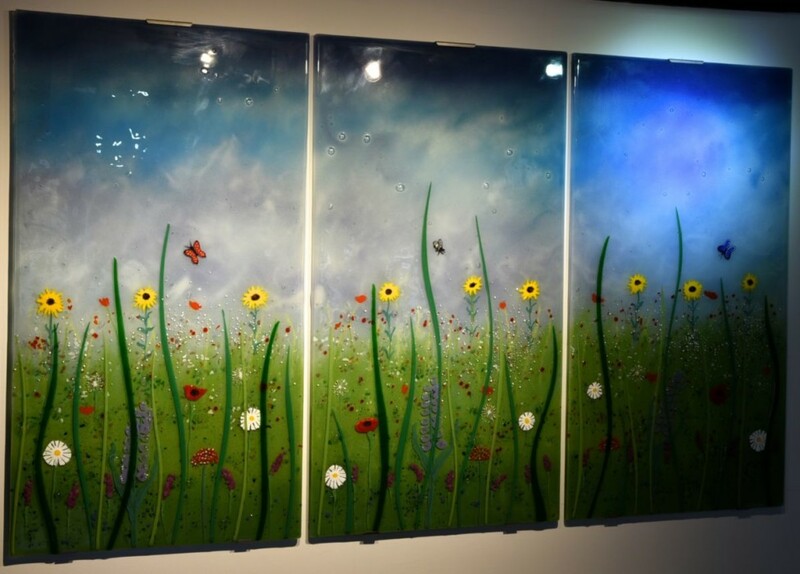 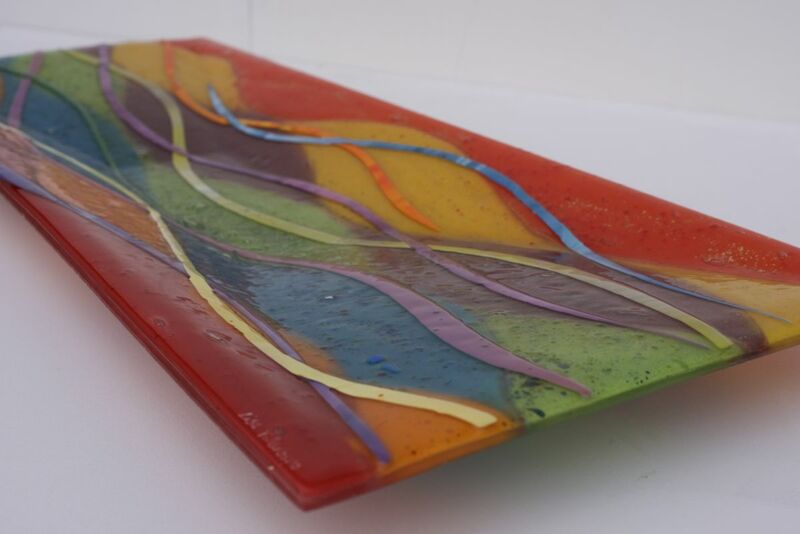 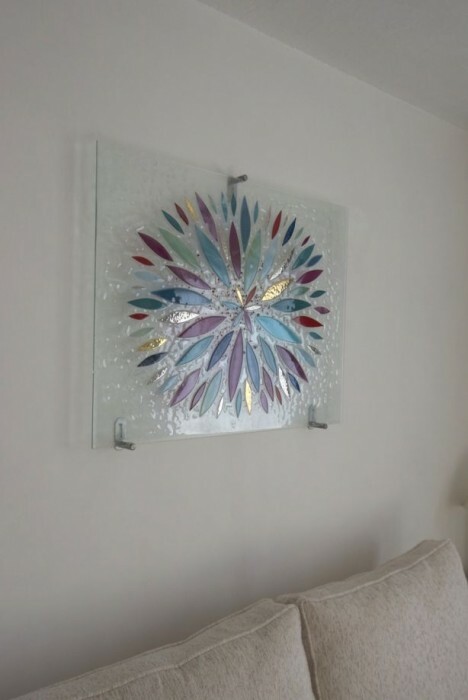 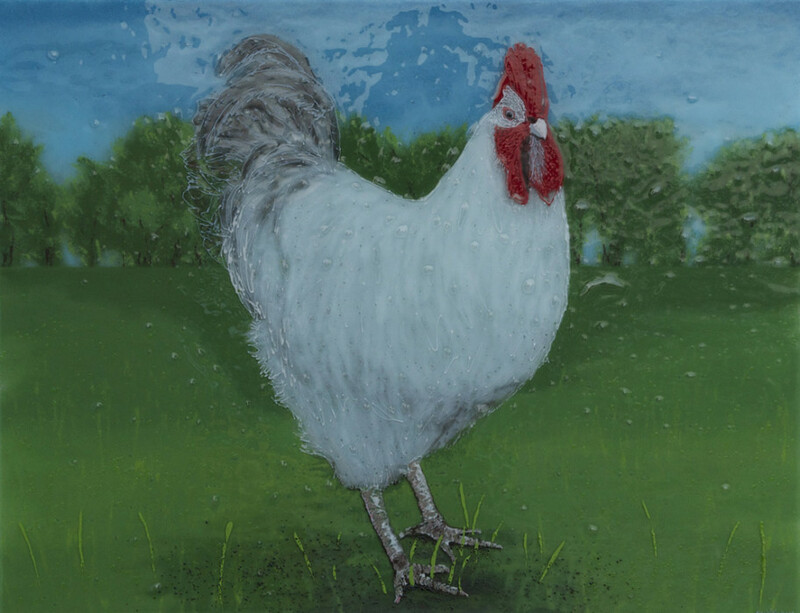 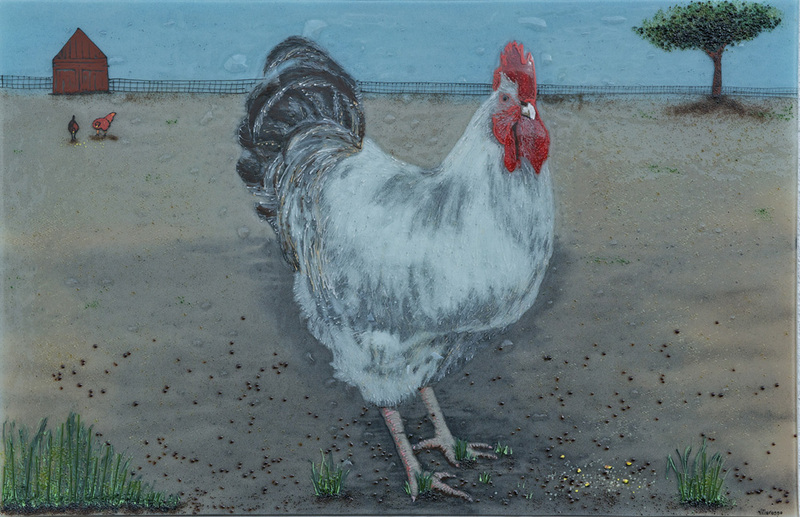 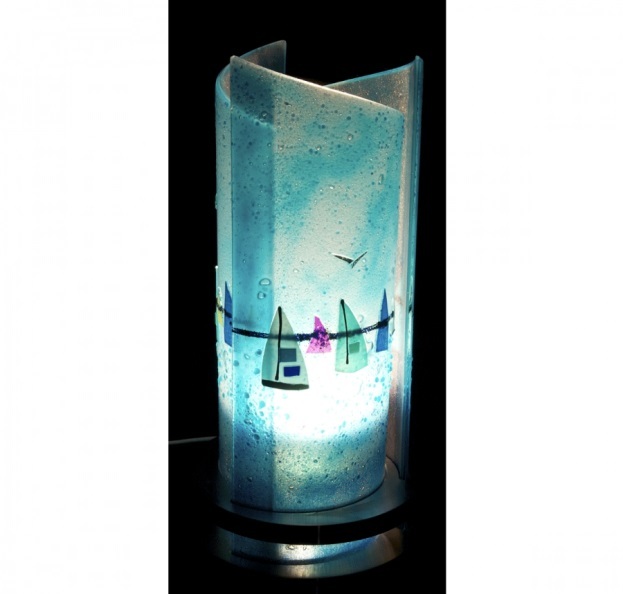 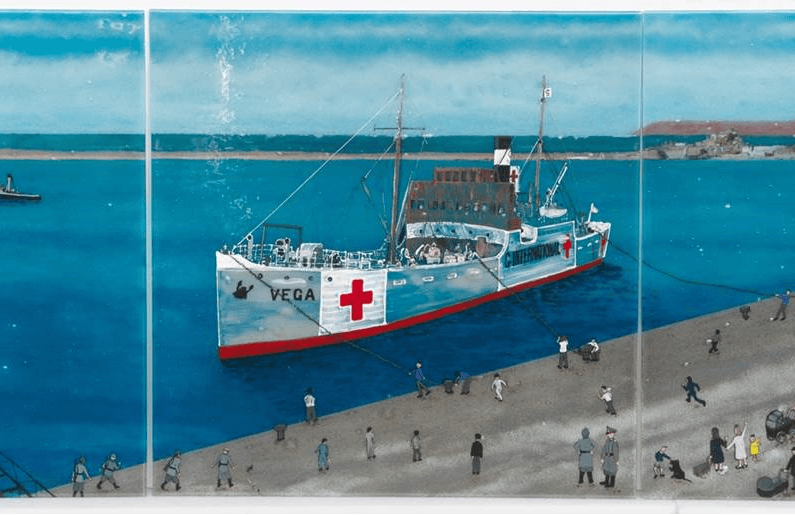 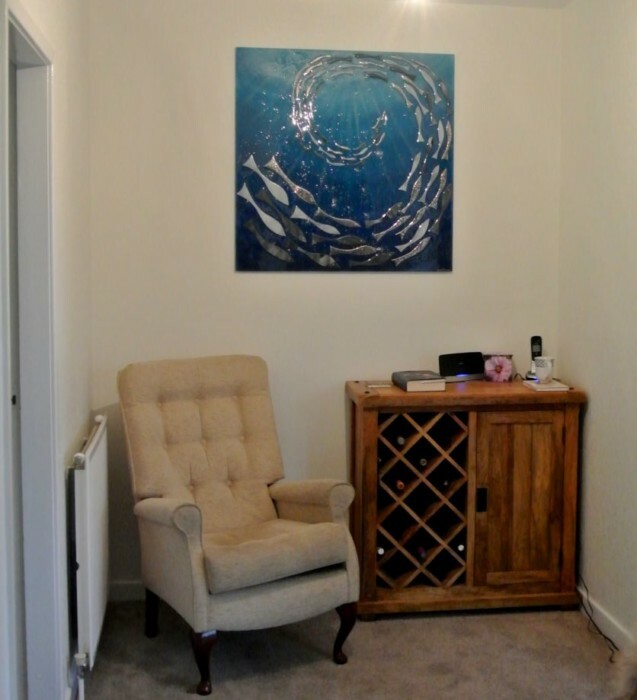 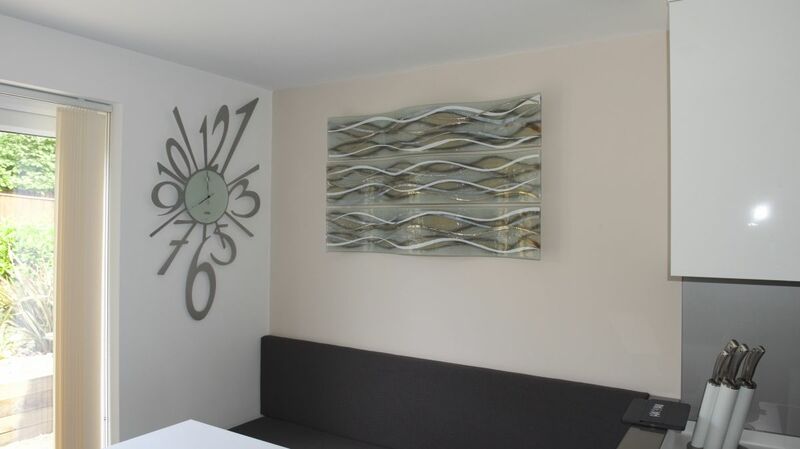 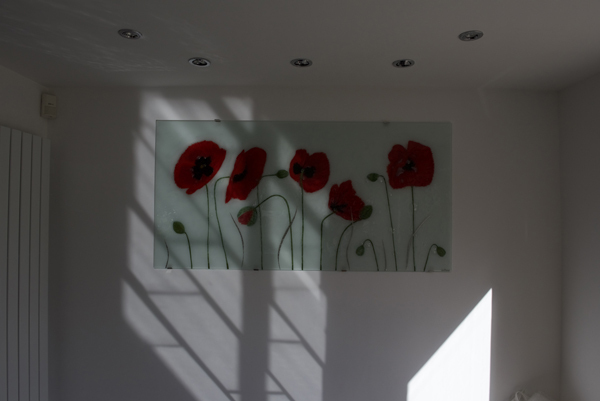 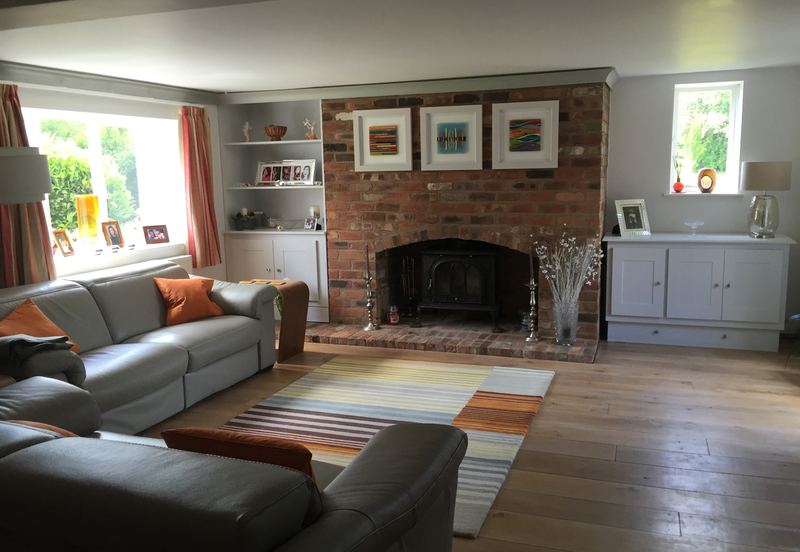 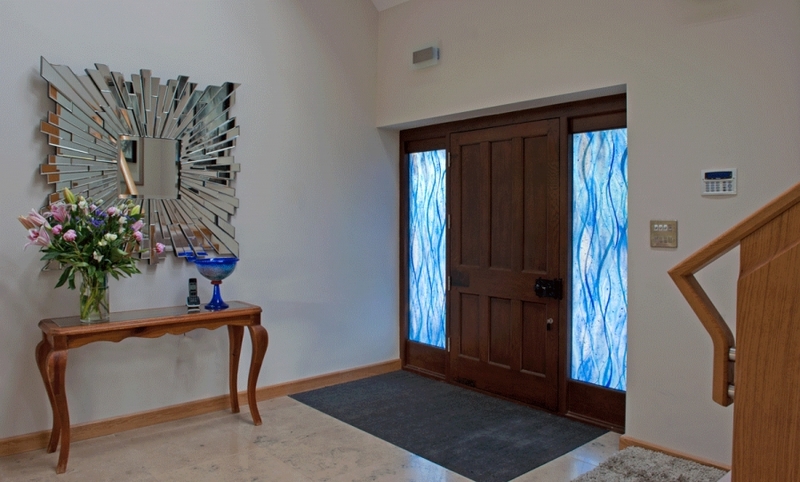 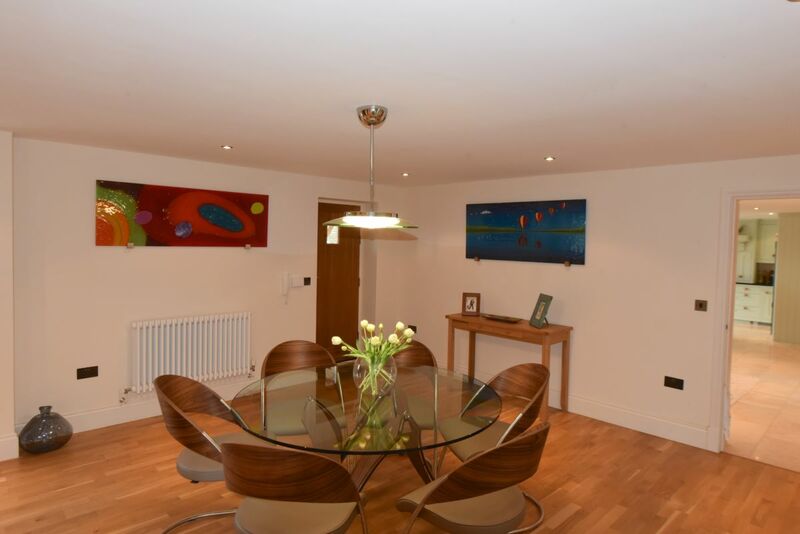 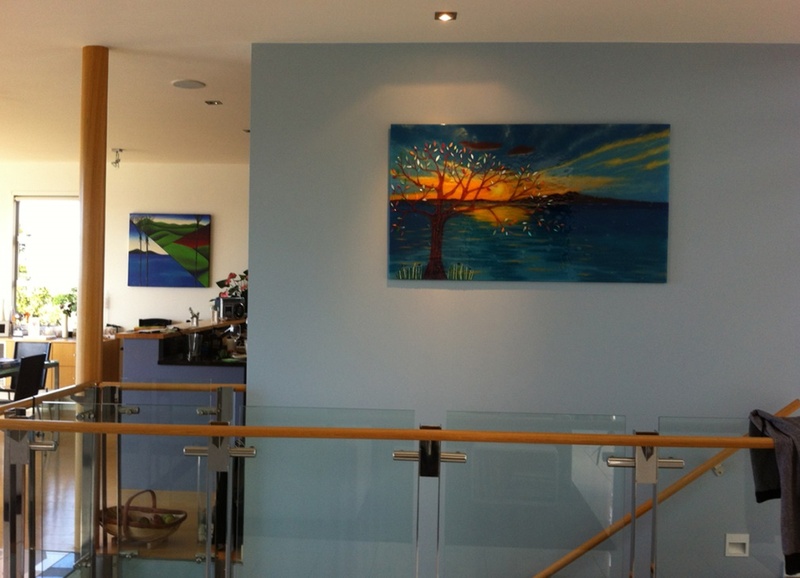 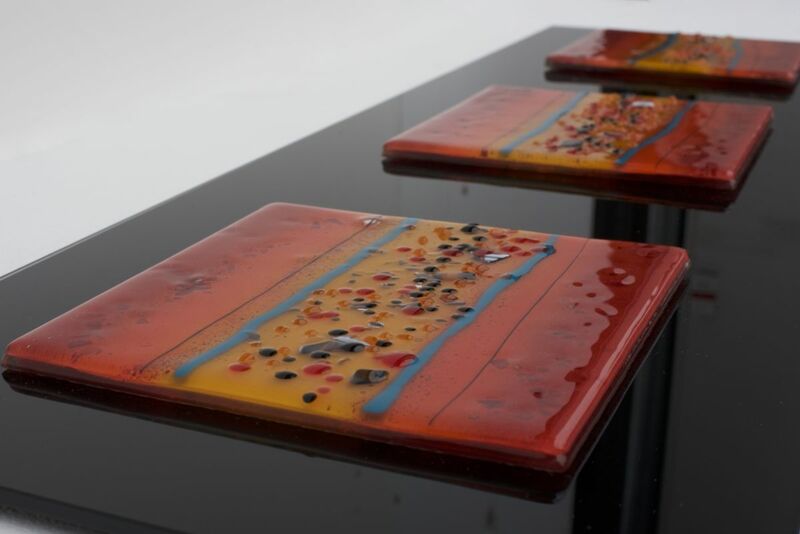 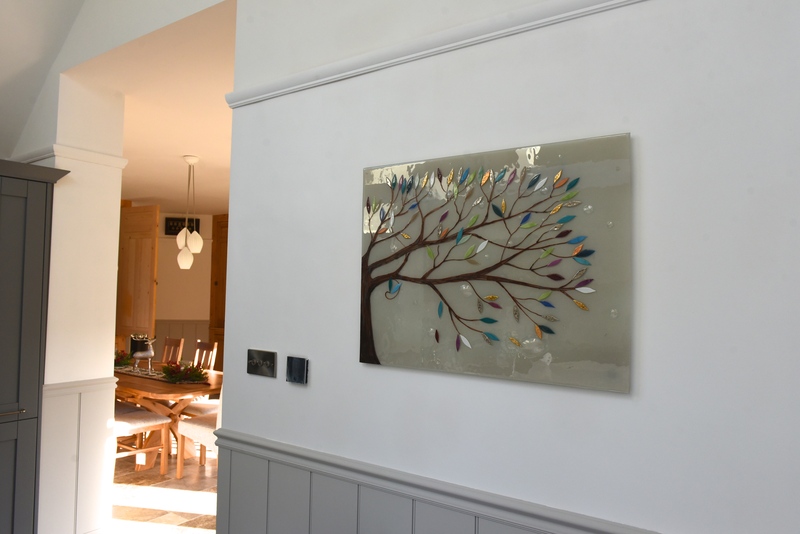 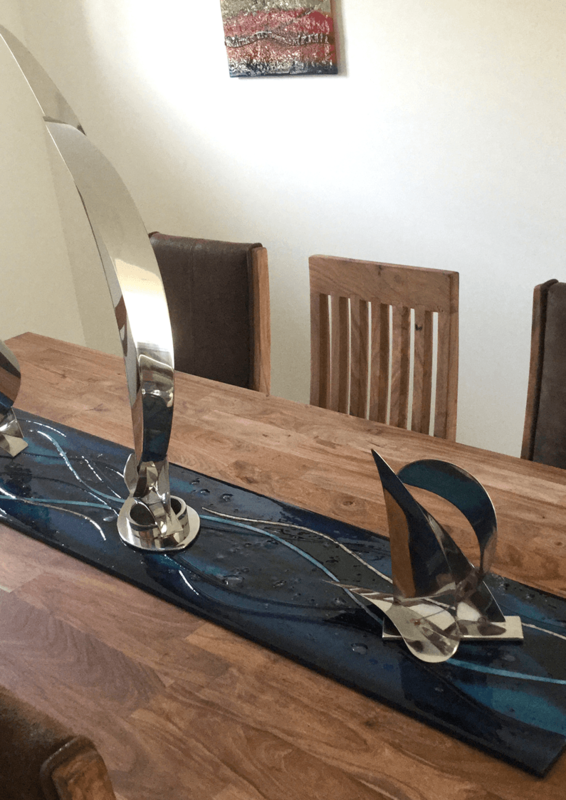 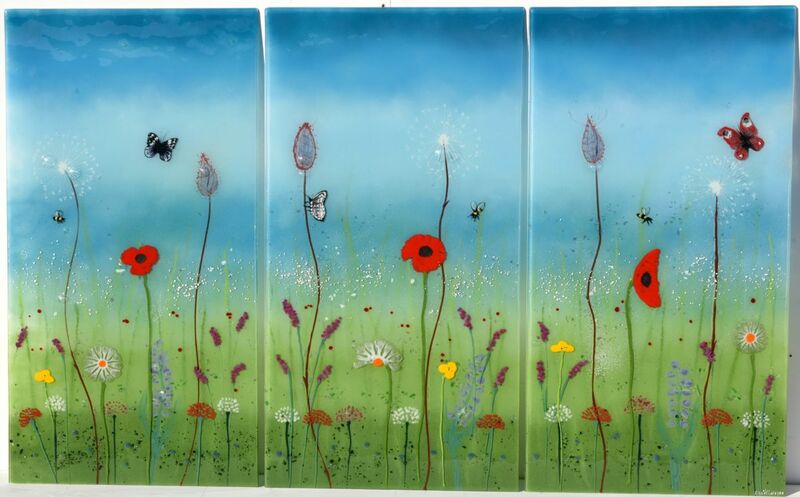 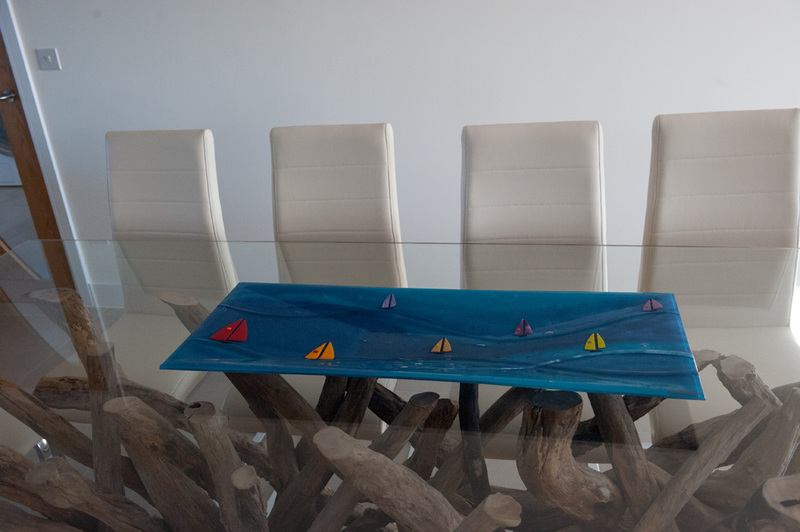 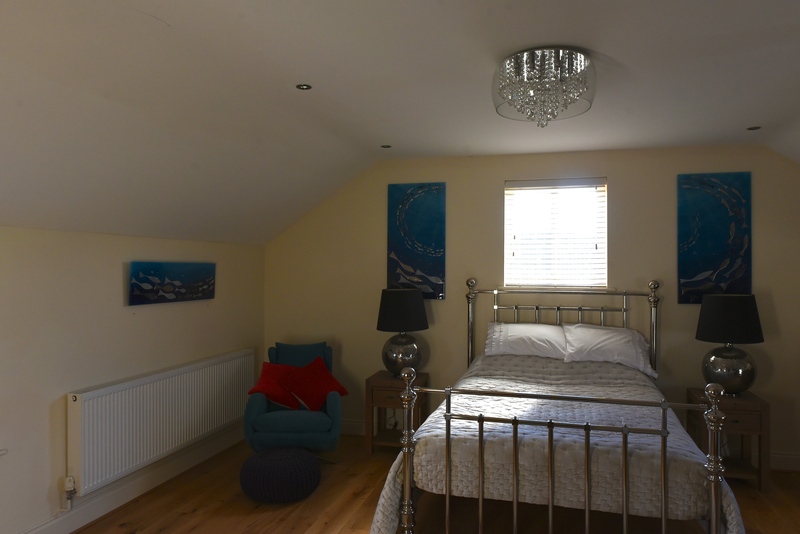 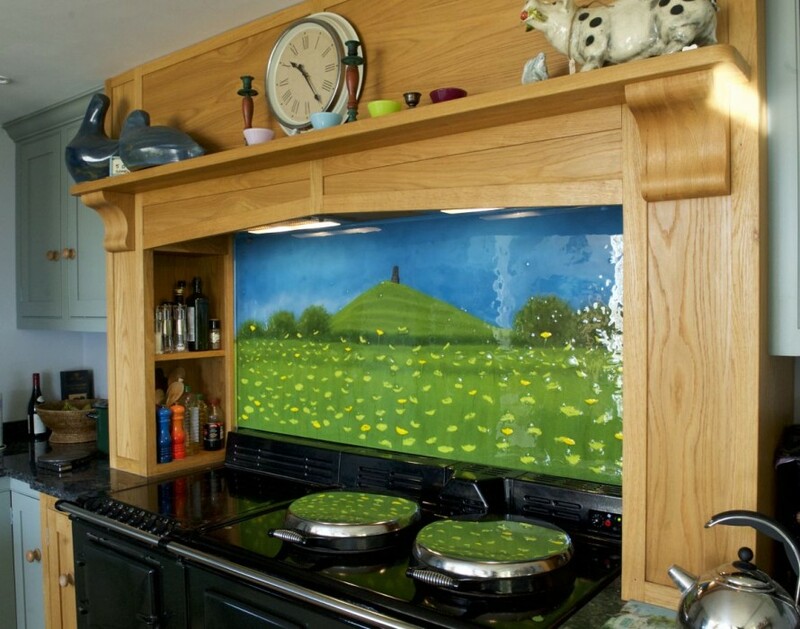 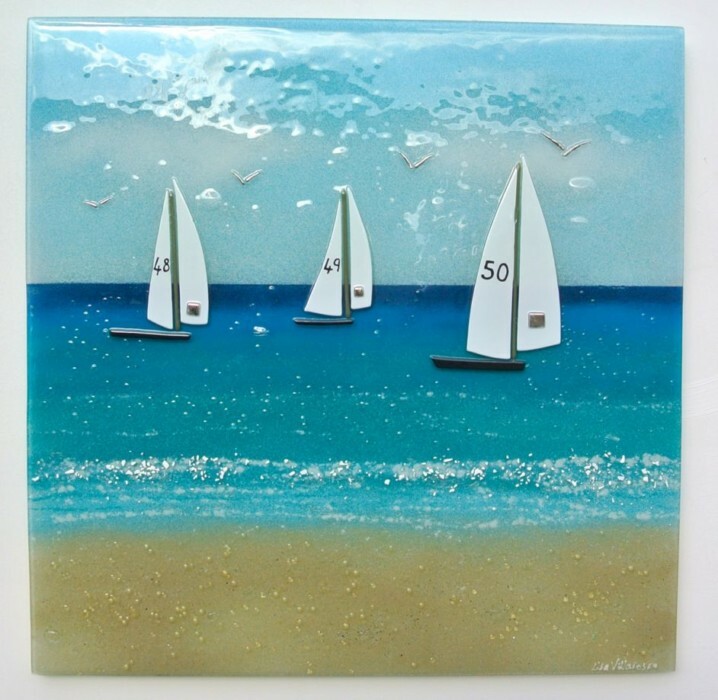 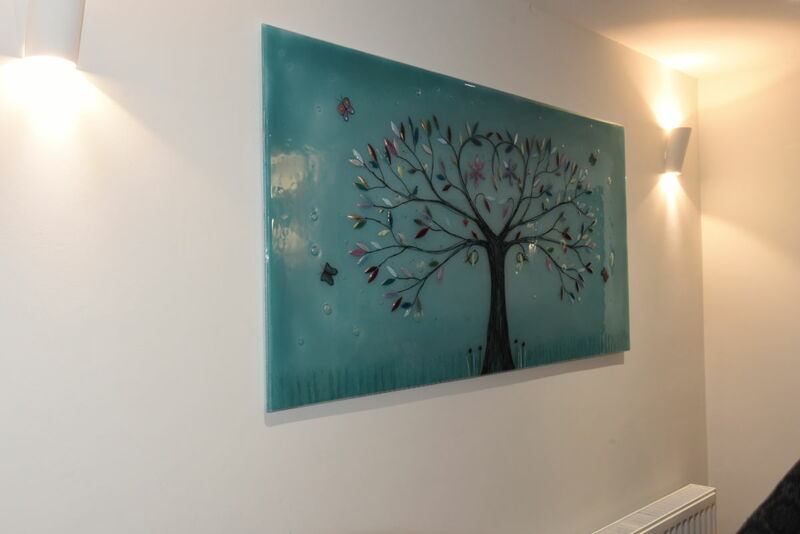 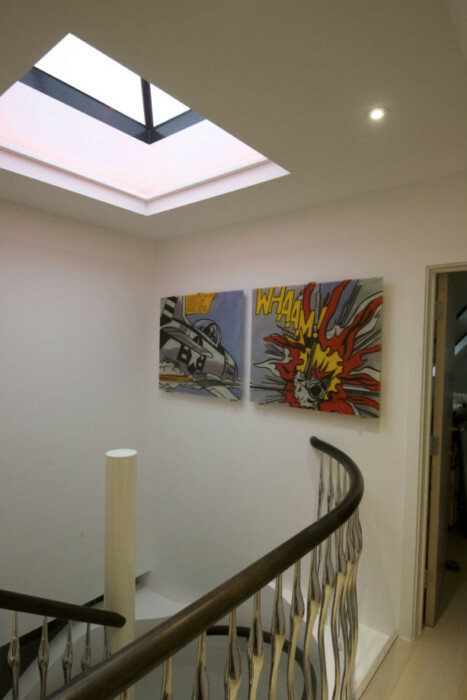 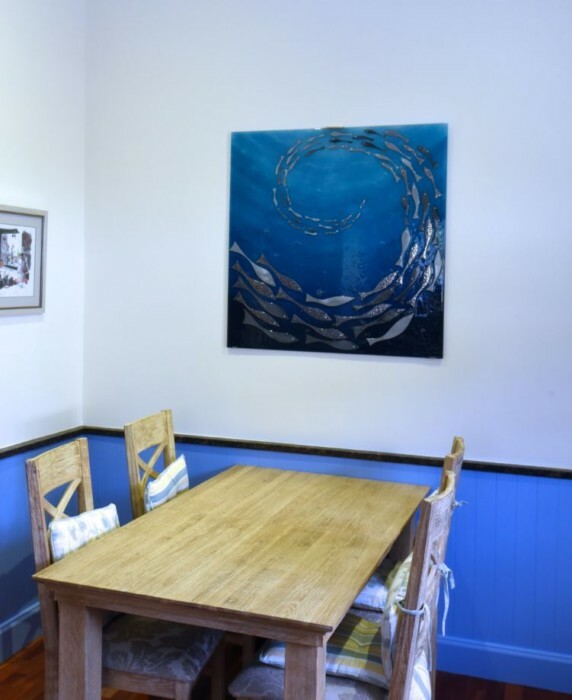 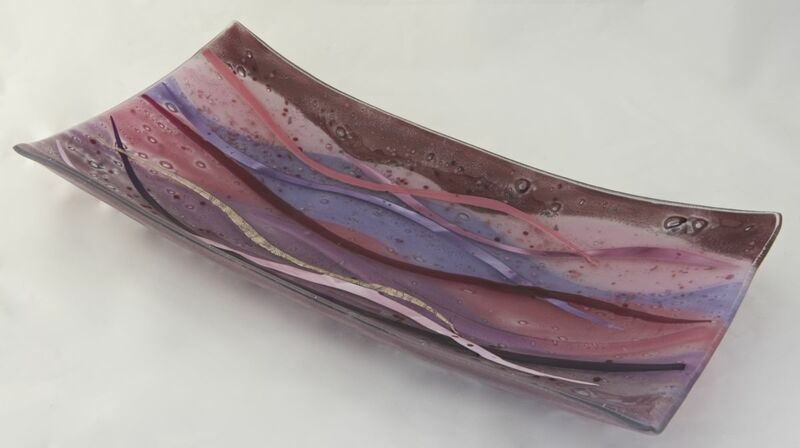 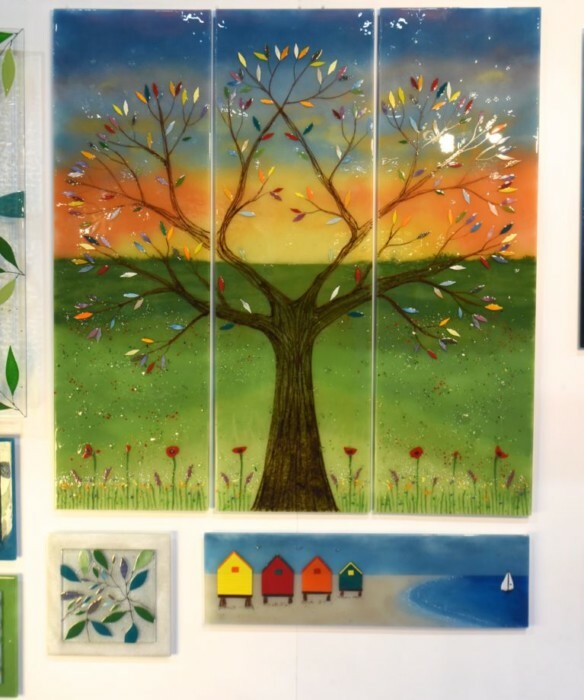 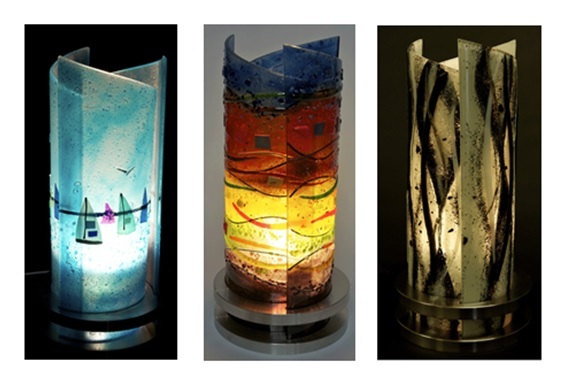 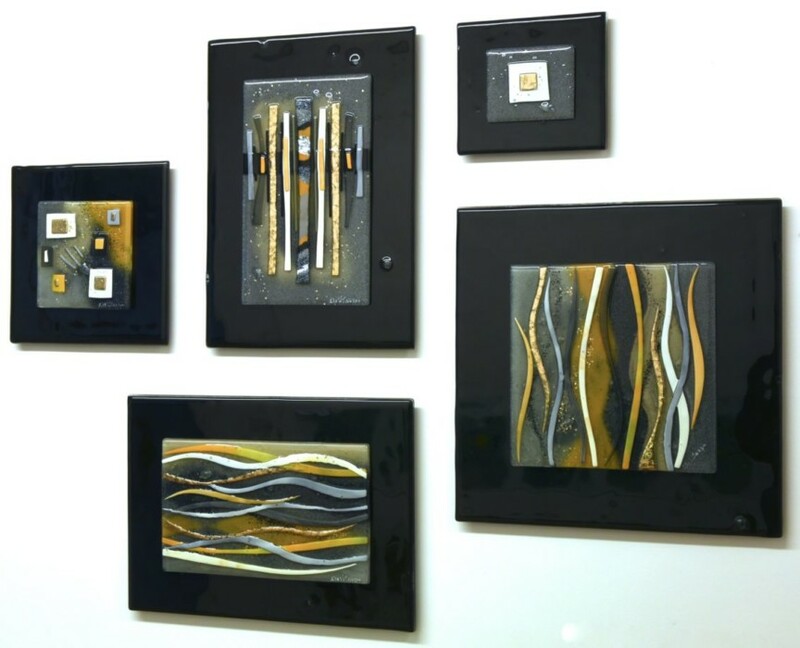 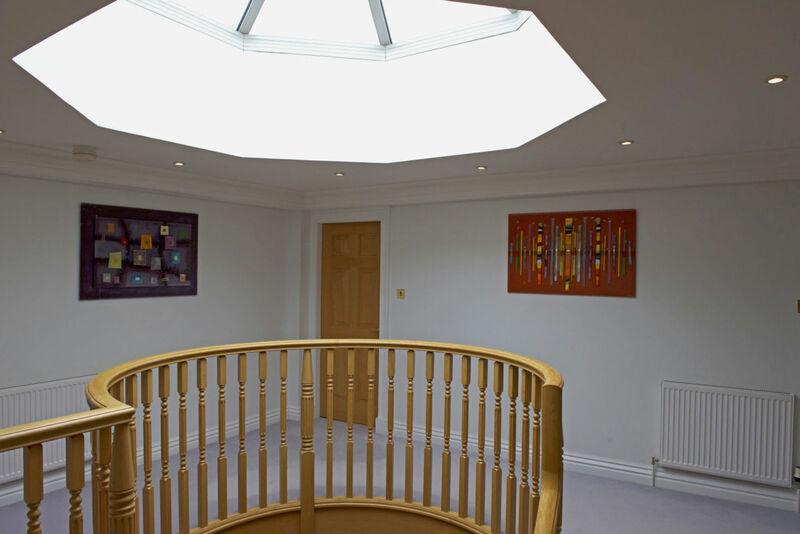 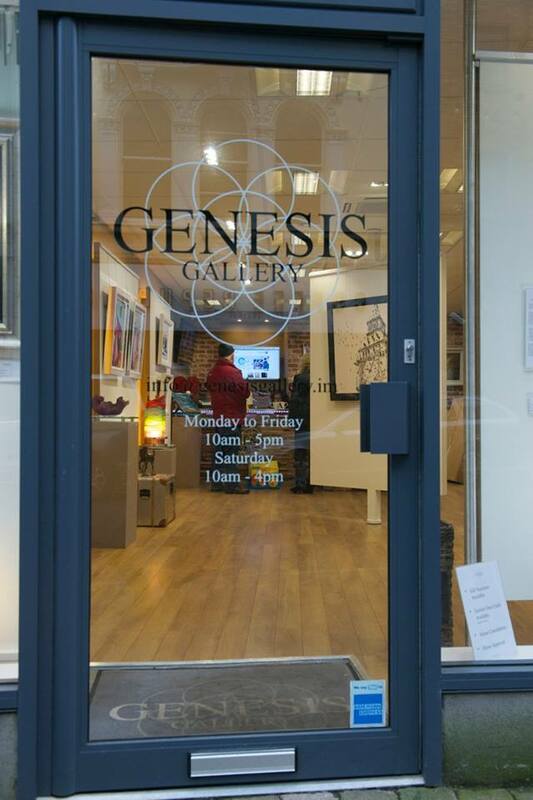 We here at The House of Ugly Fish are specialists when it comes to the creation of bespoke, handmade fused glass art that’s perfect for any space you want to put it in. 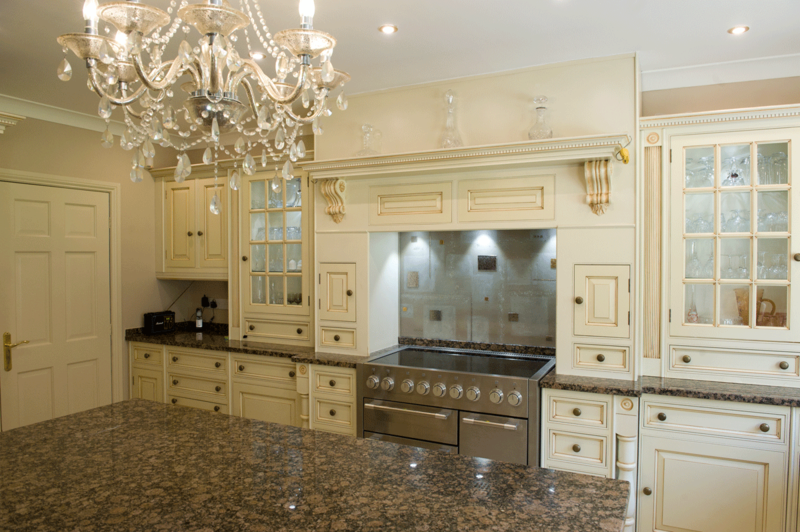 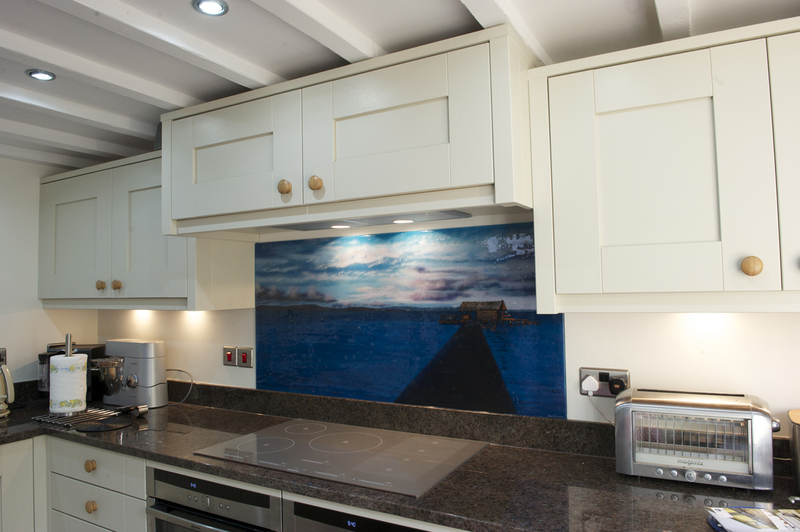 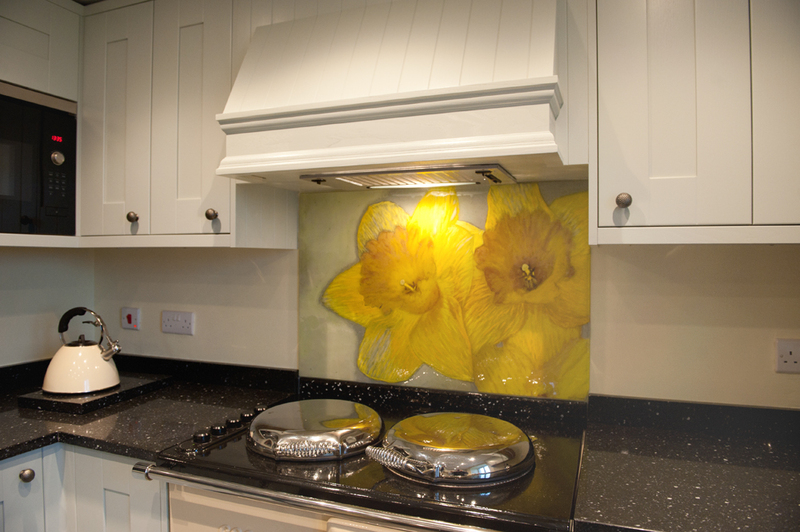 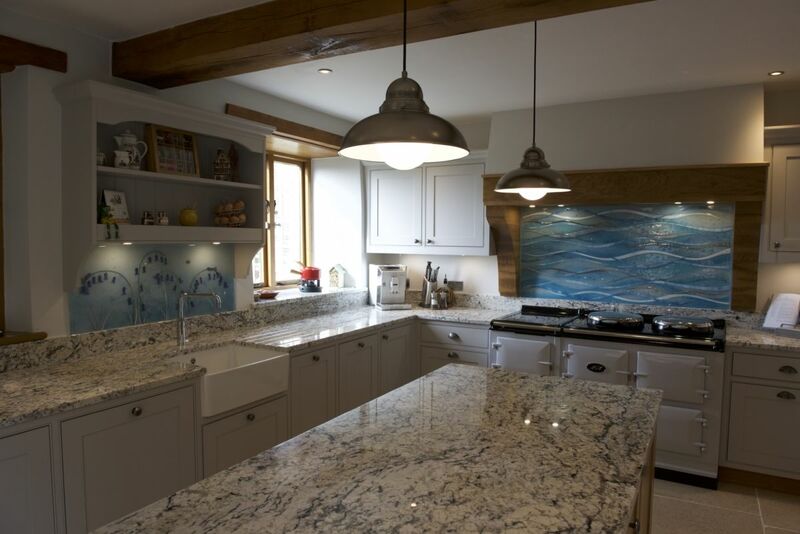 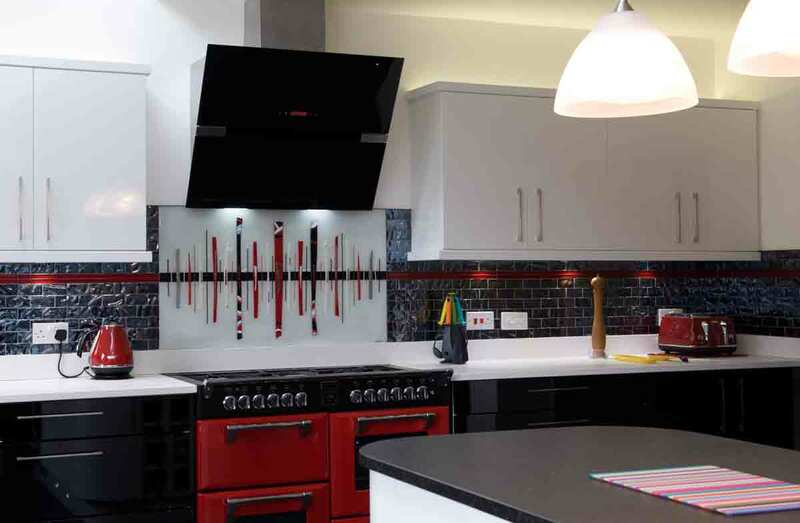 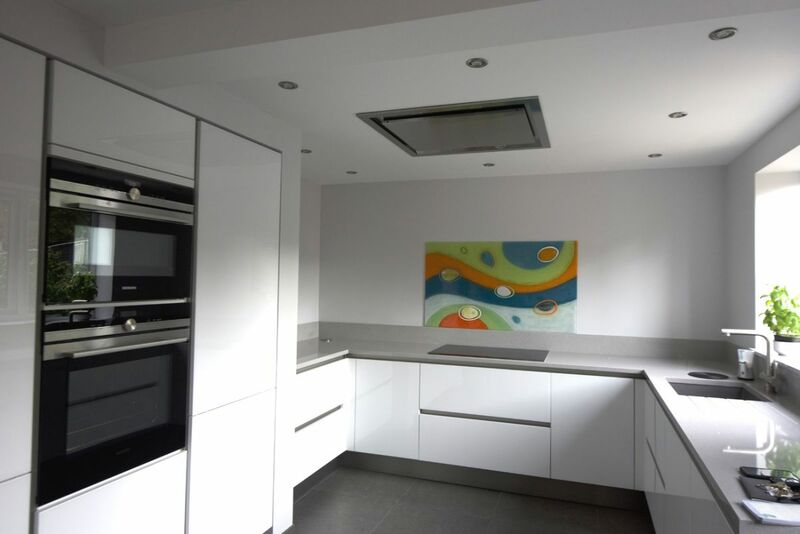 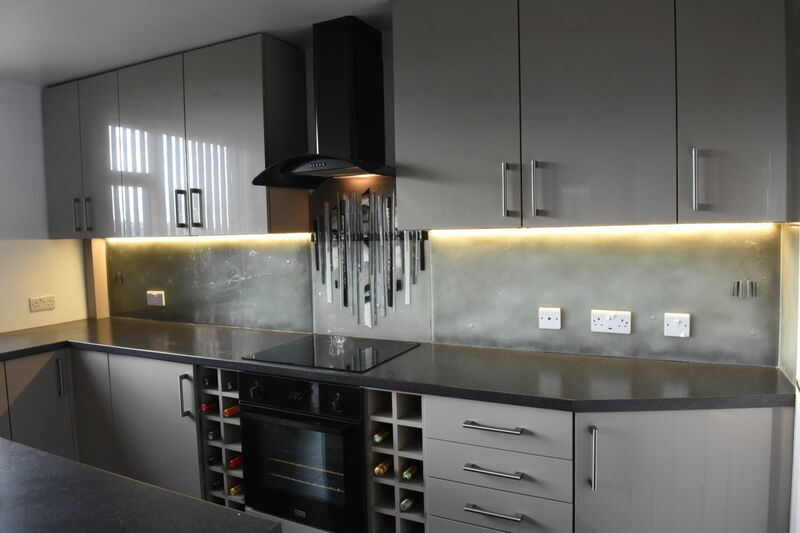 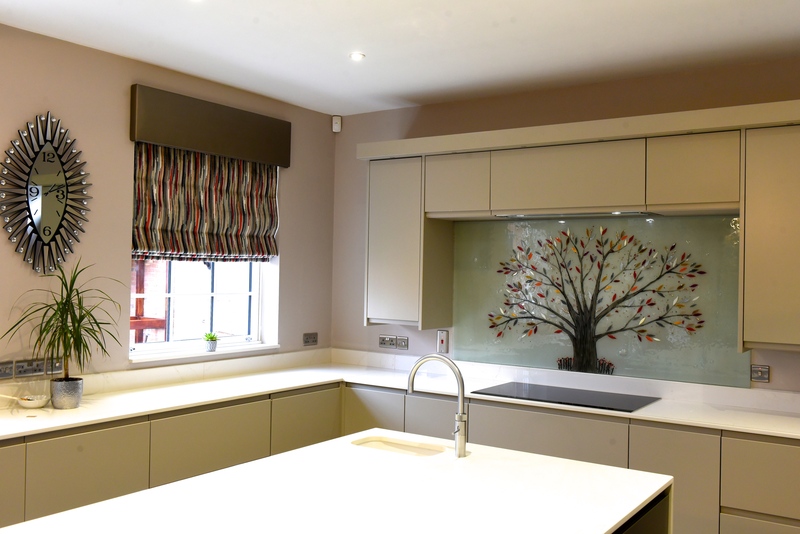 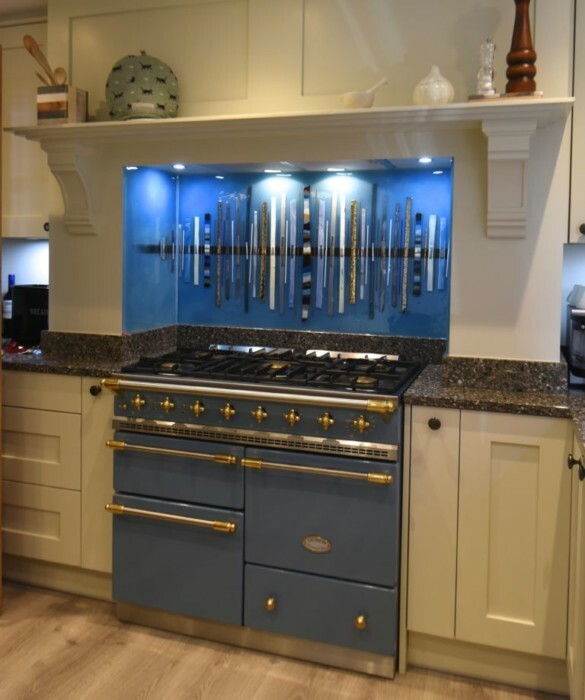 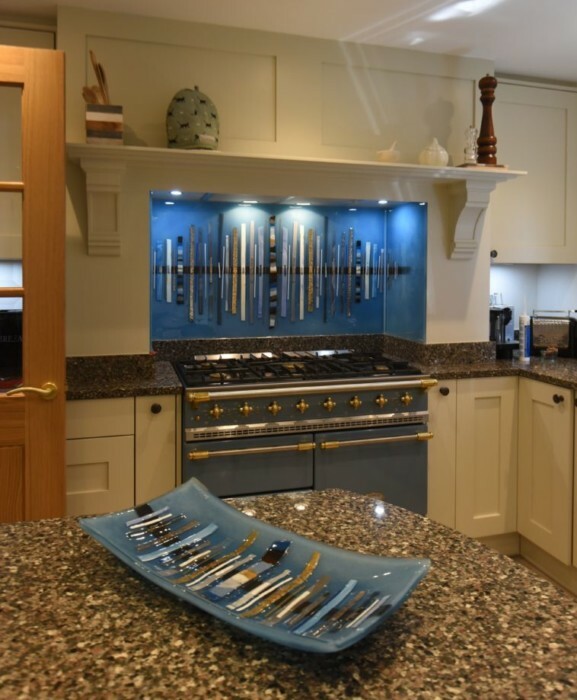 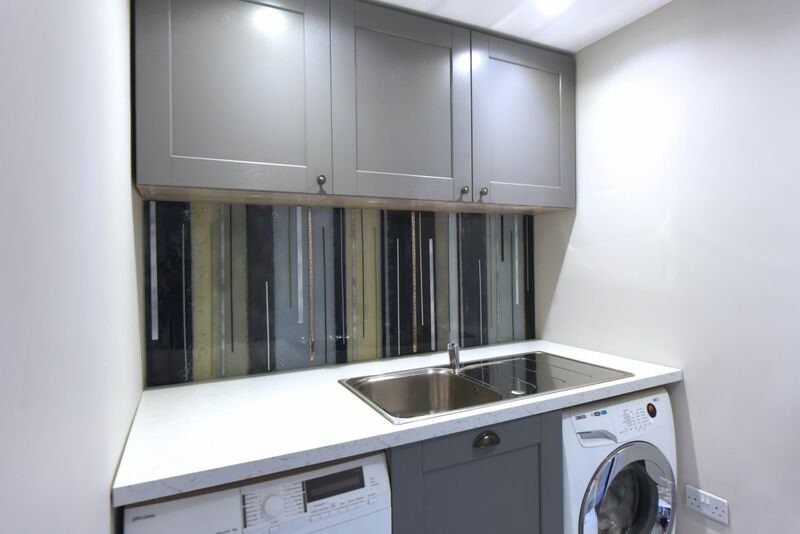 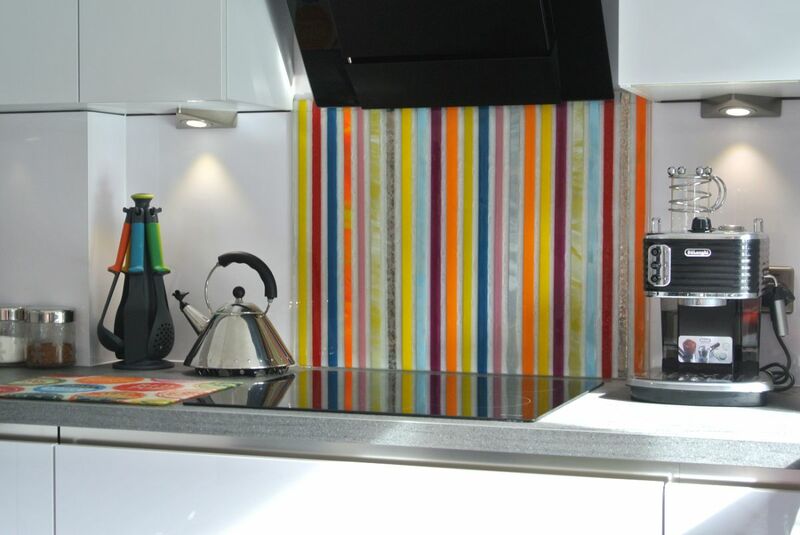 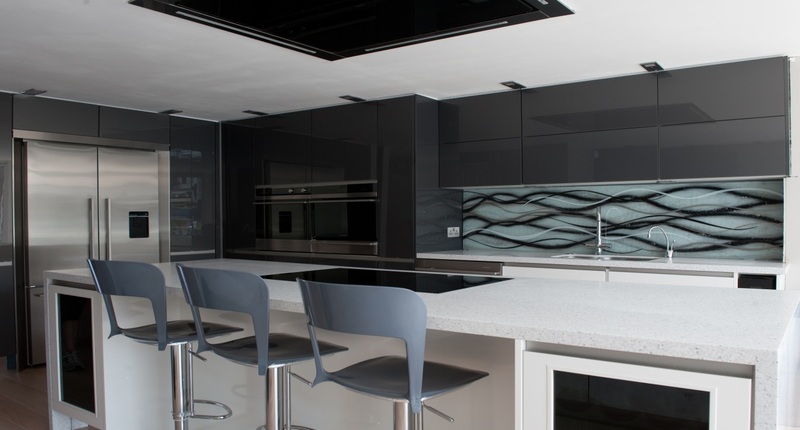 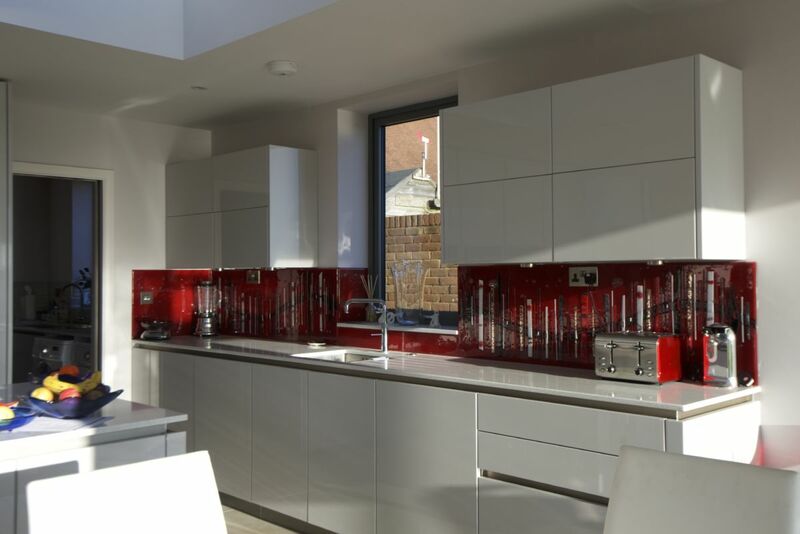 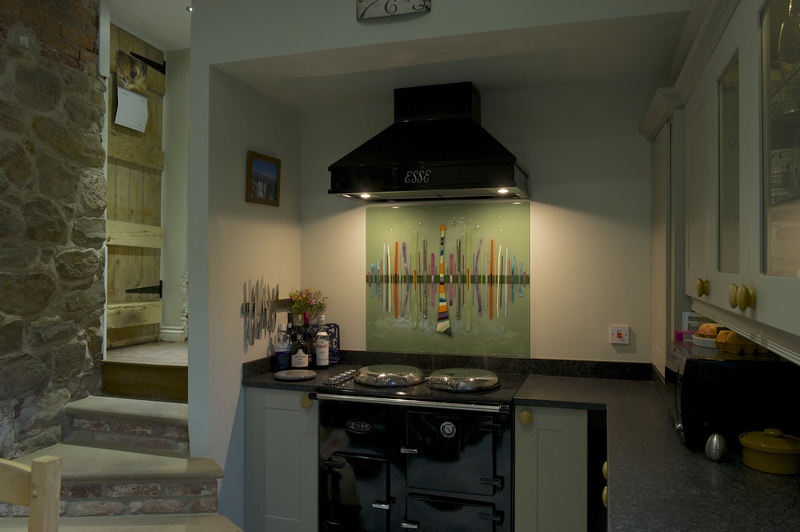 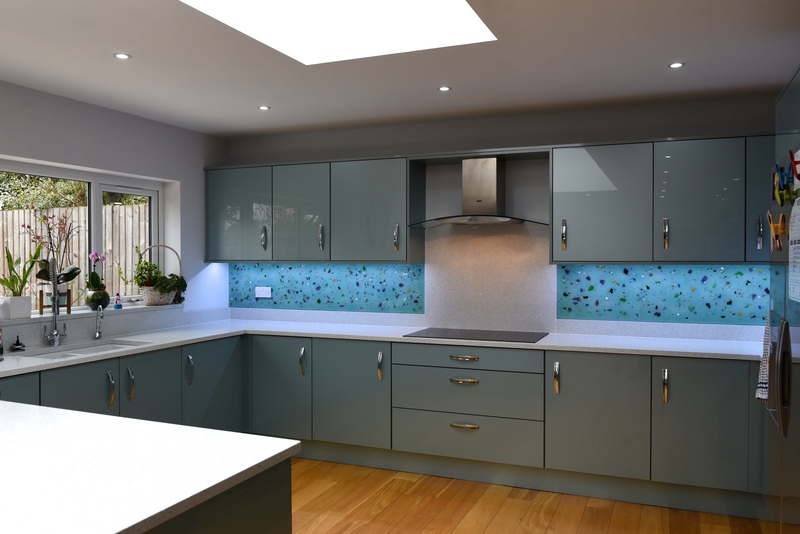 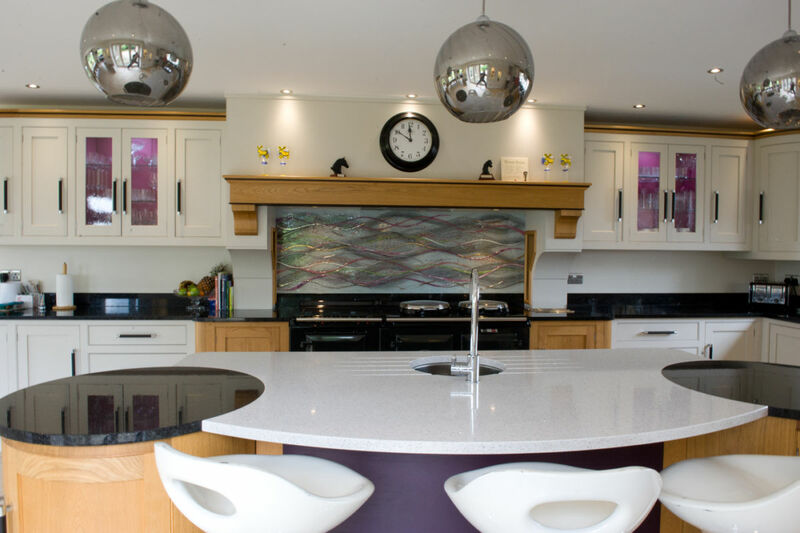 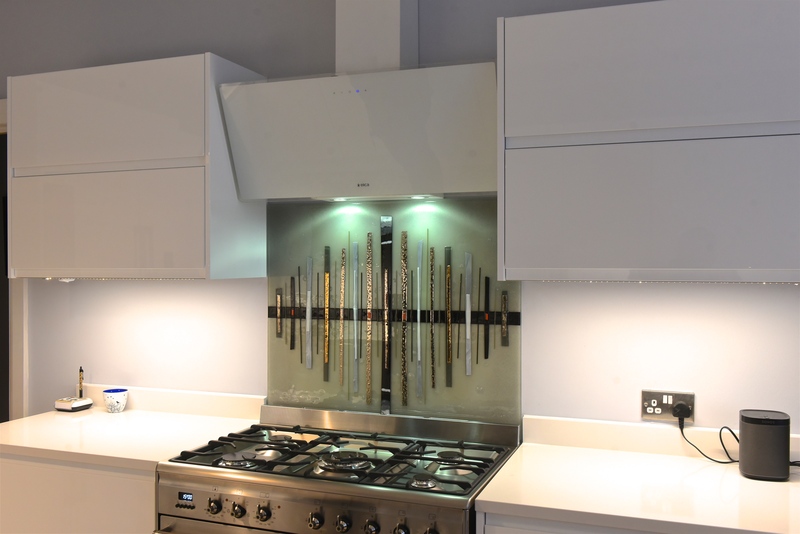 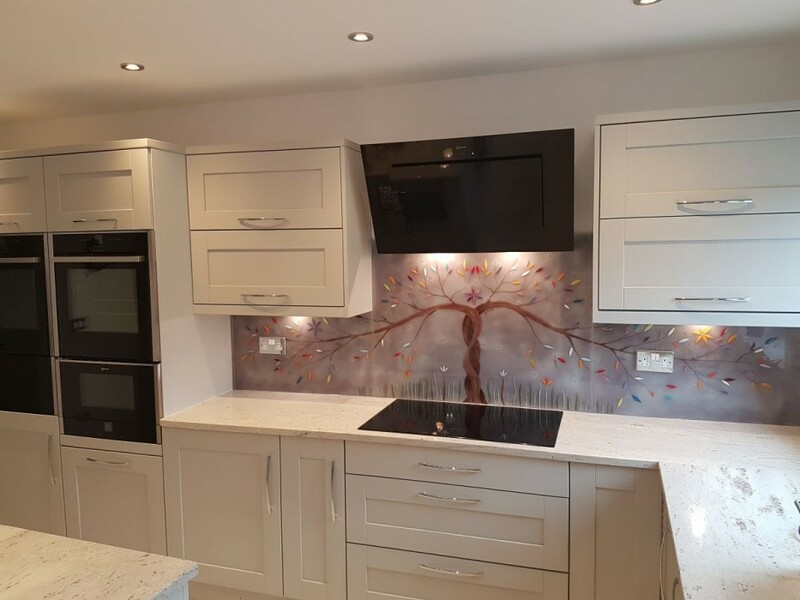 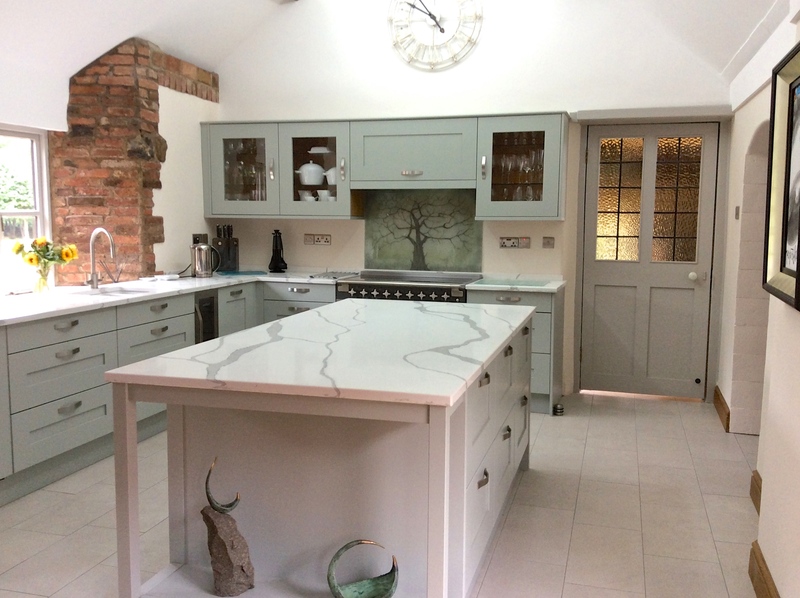 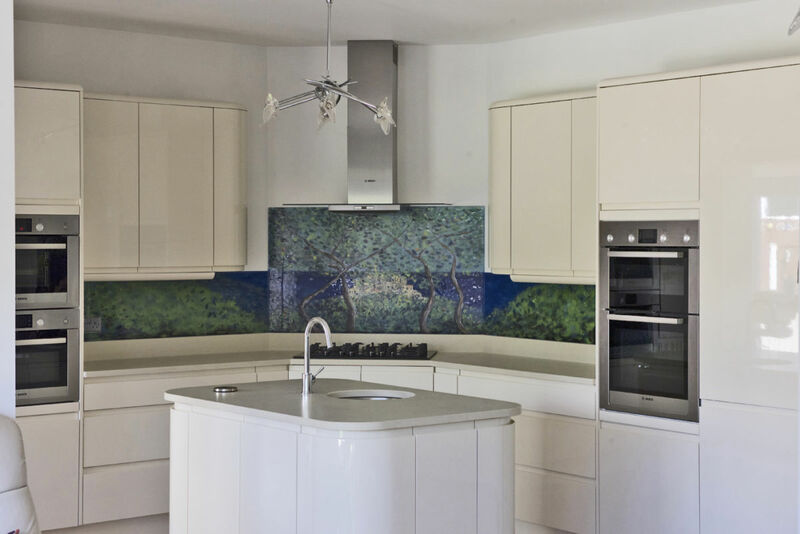 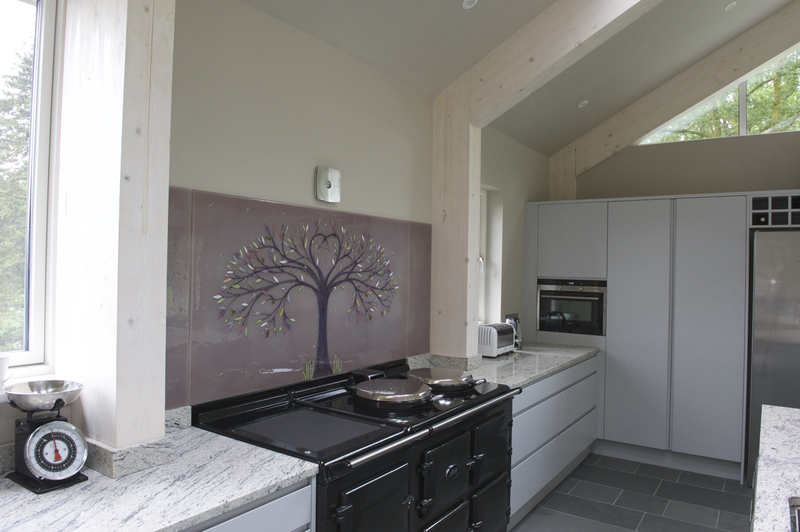 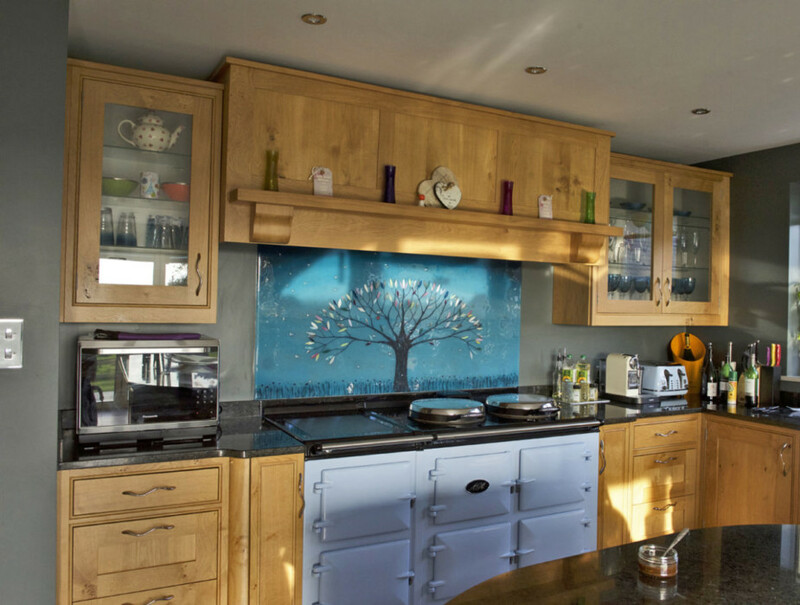 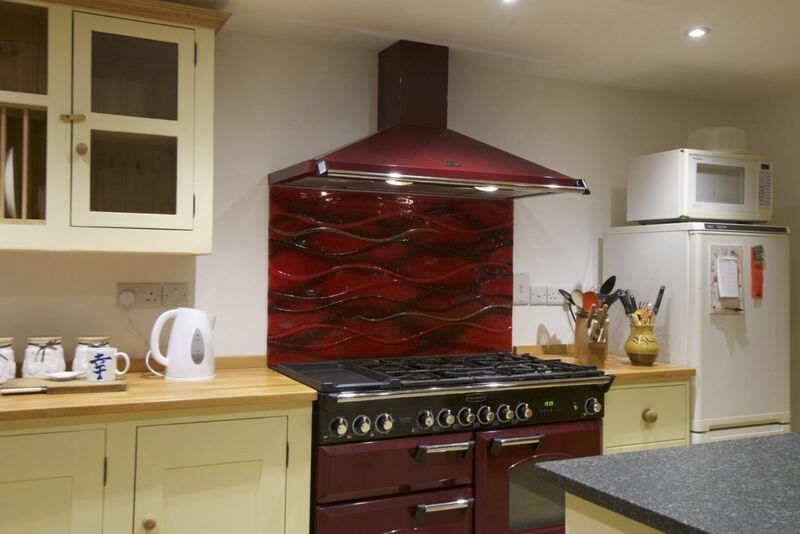 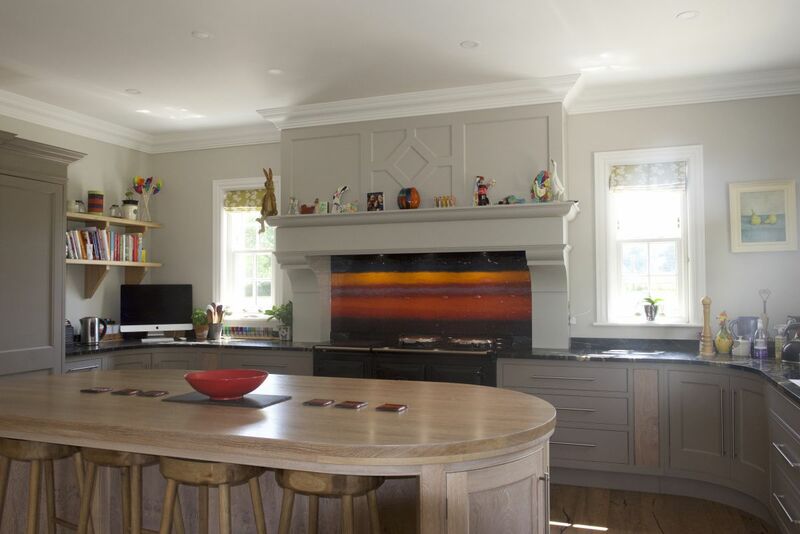 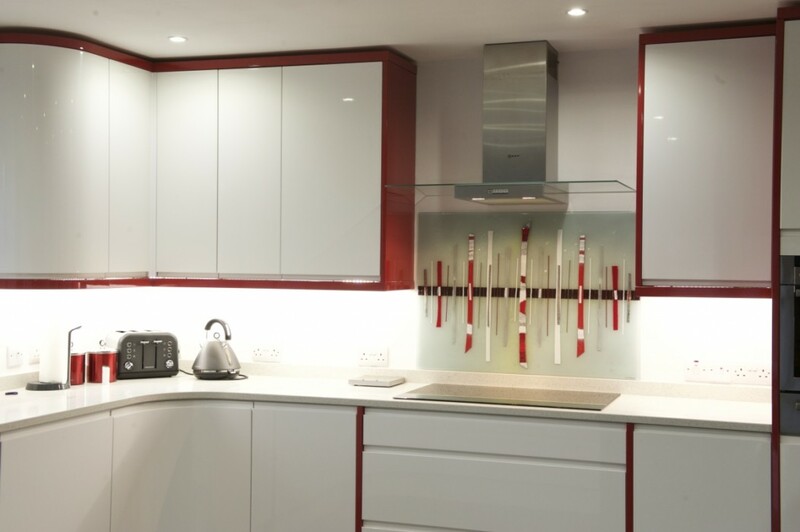 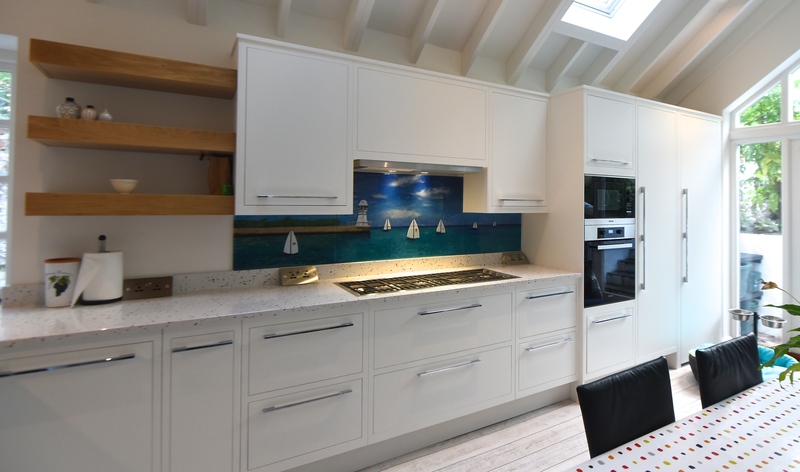 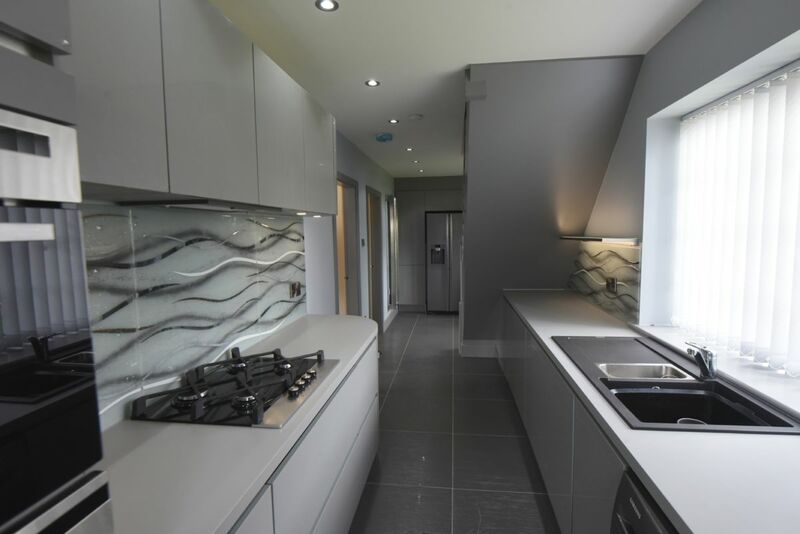 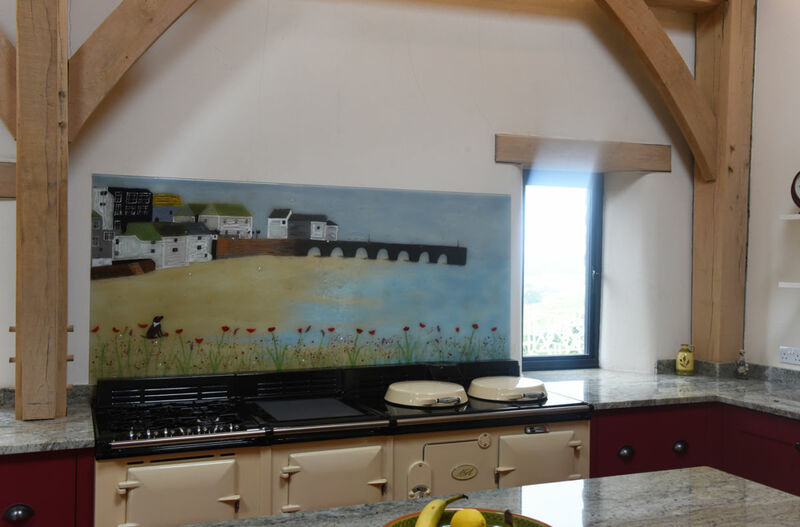 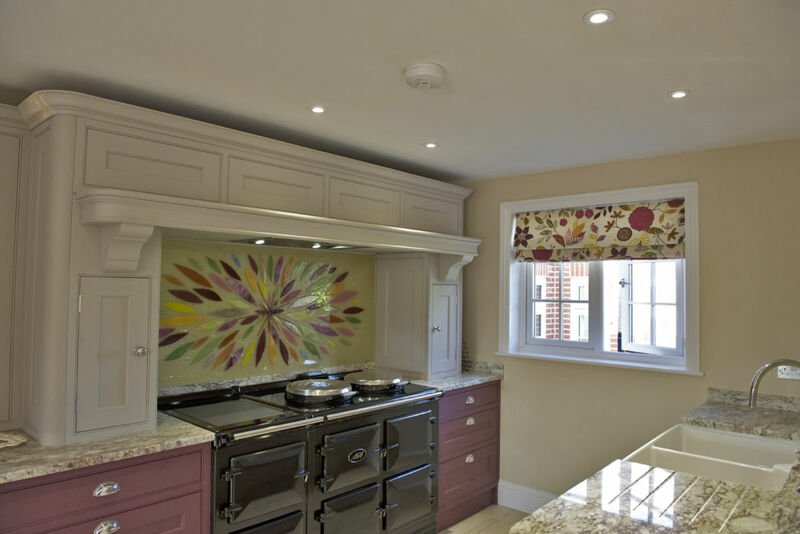 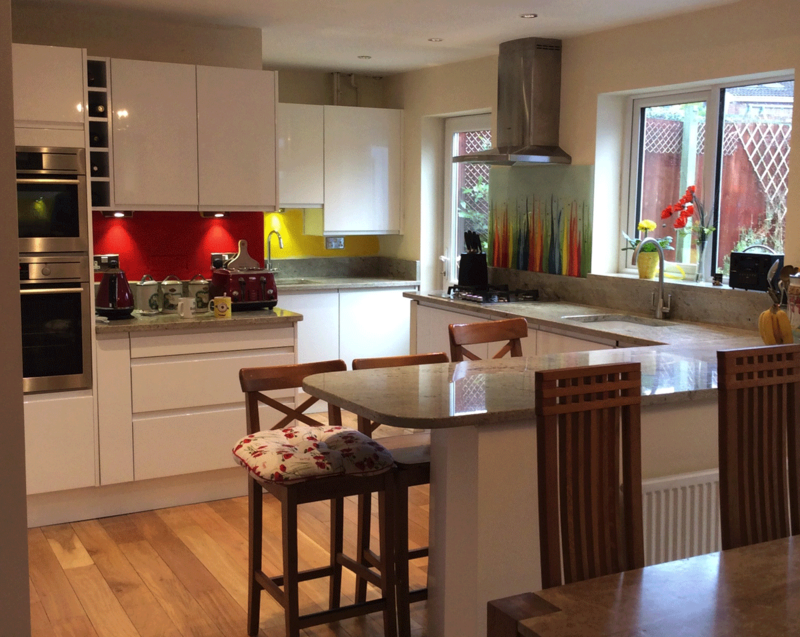 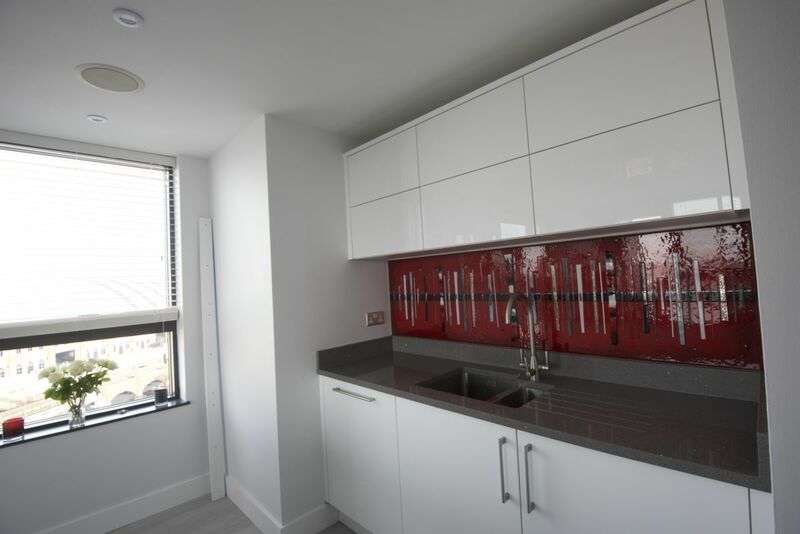 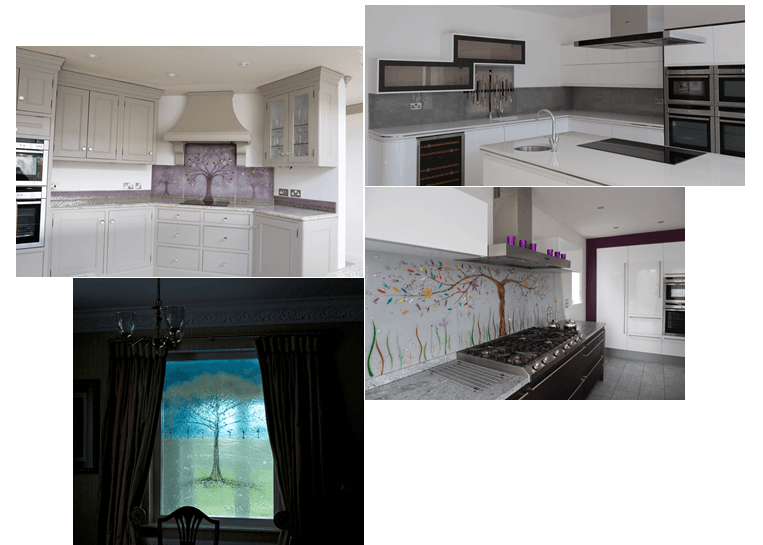 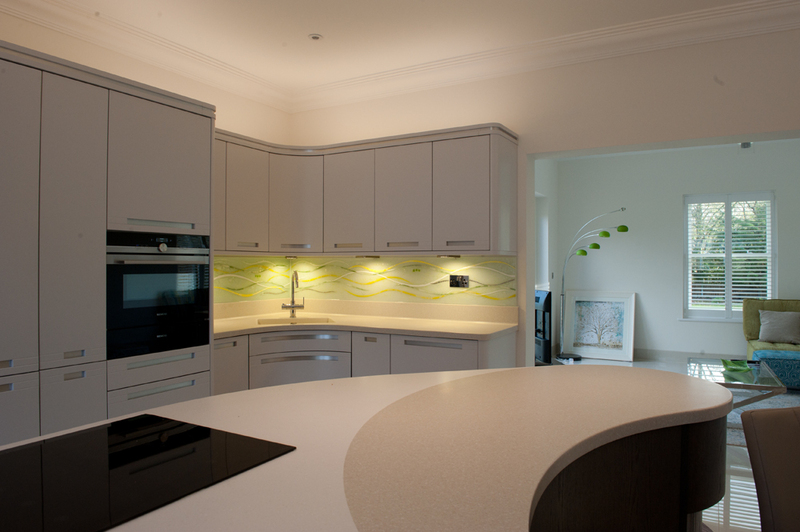 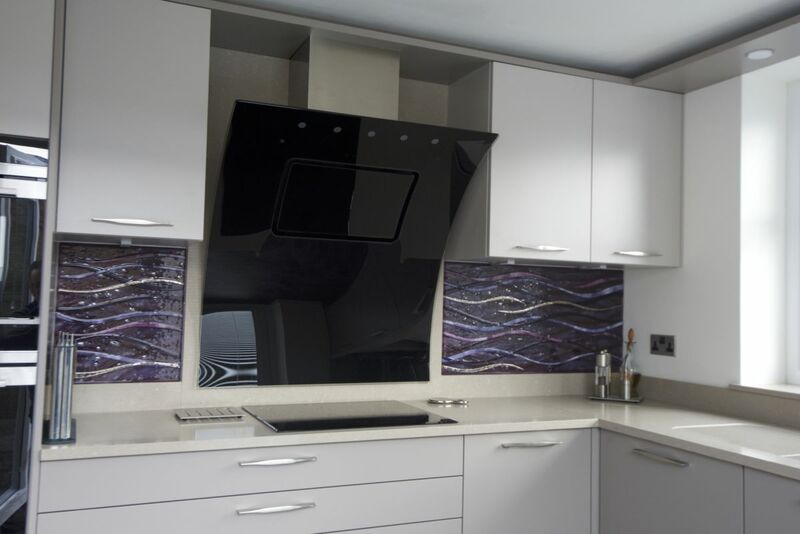 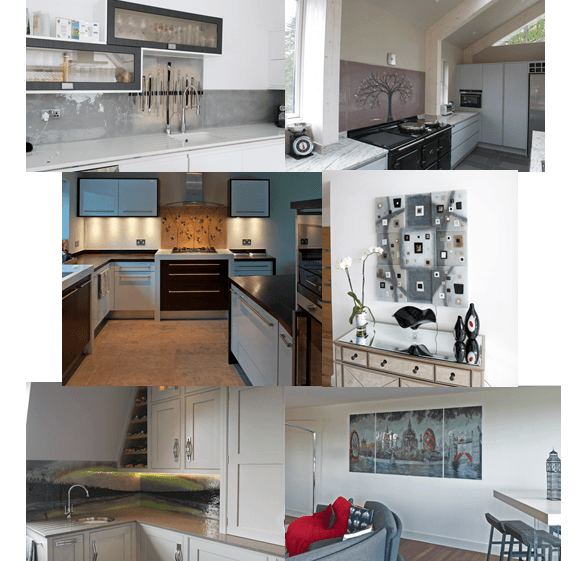 Whether you’re looking for a kitchen splashback, a panel for a blank looking wall or anything else from our extensive portfolio, make sure you don’t wait to get in touch as soon as you can! 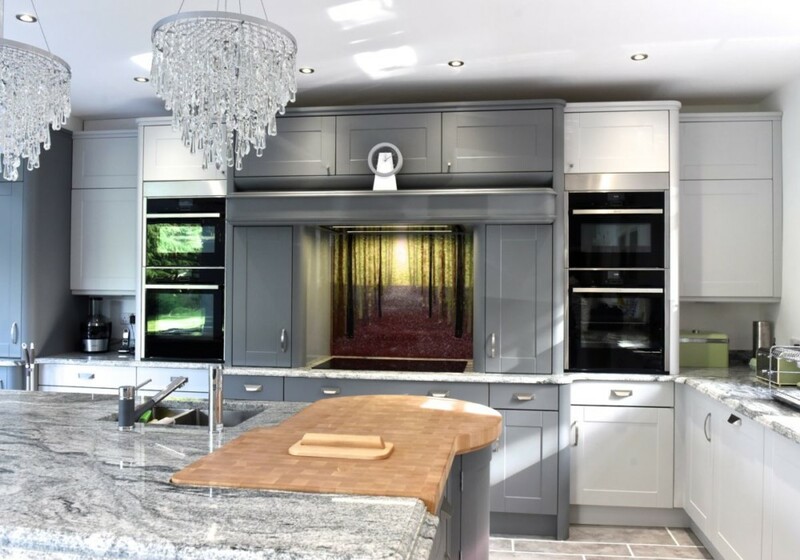 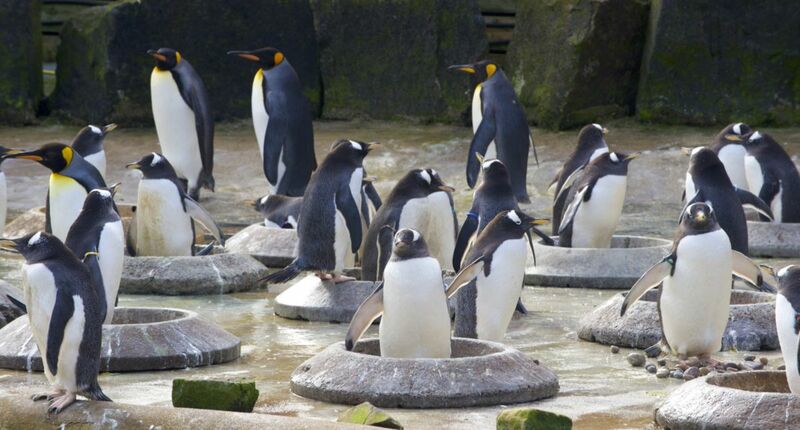 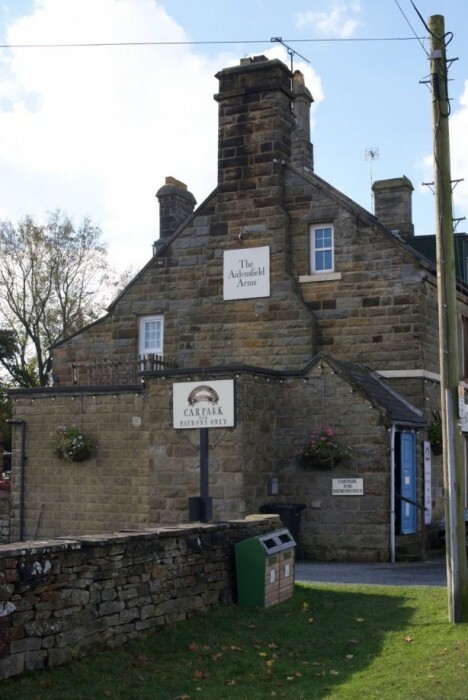 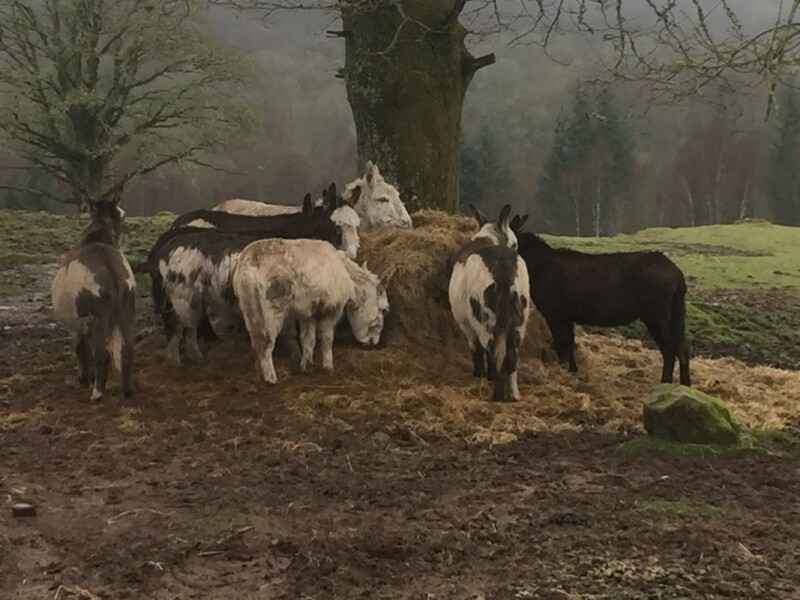 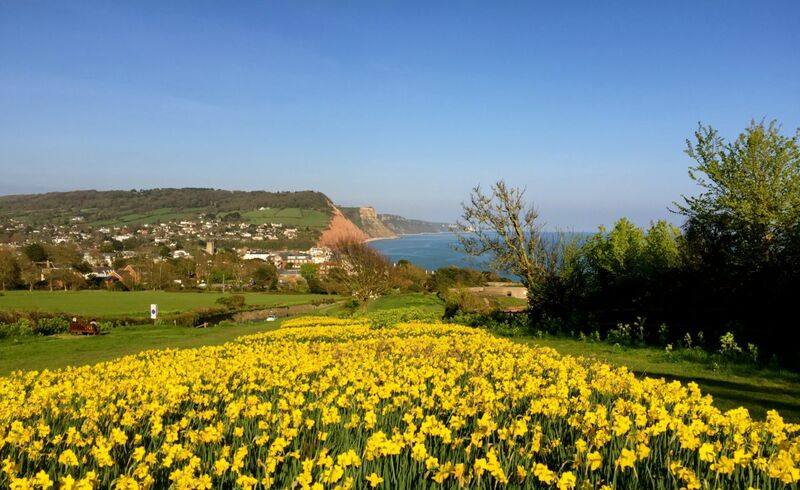 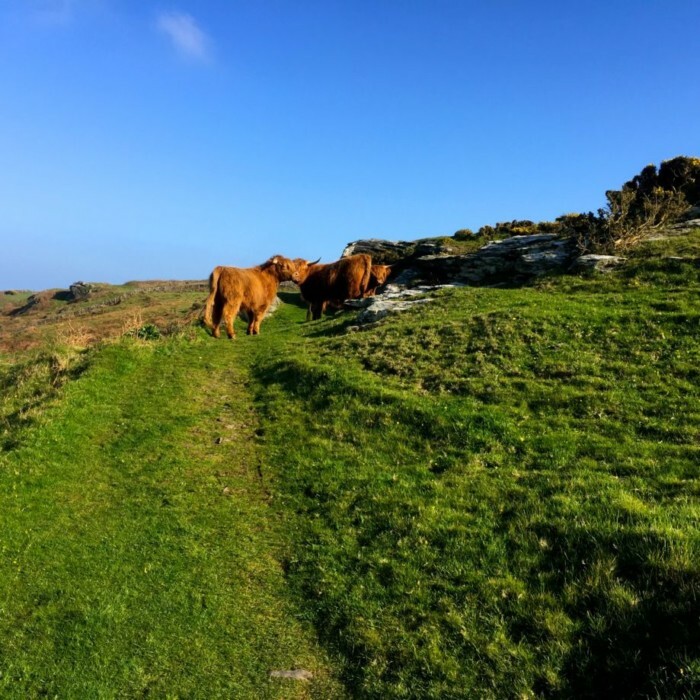 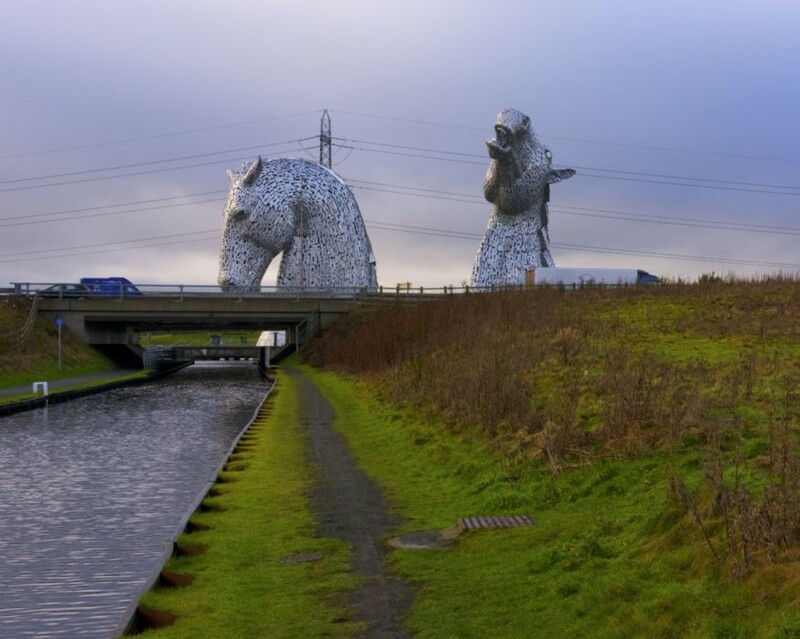 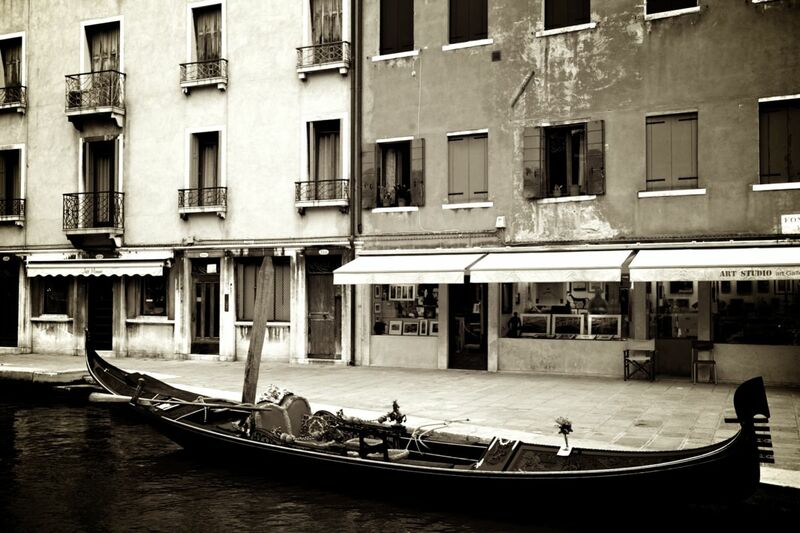 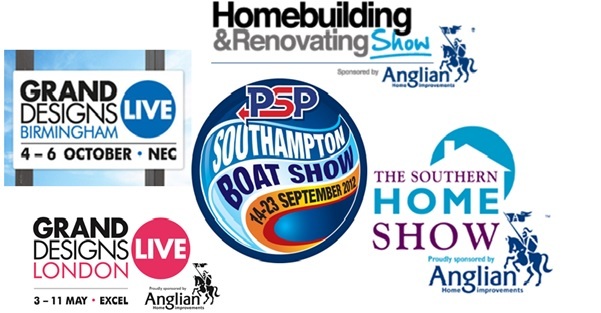 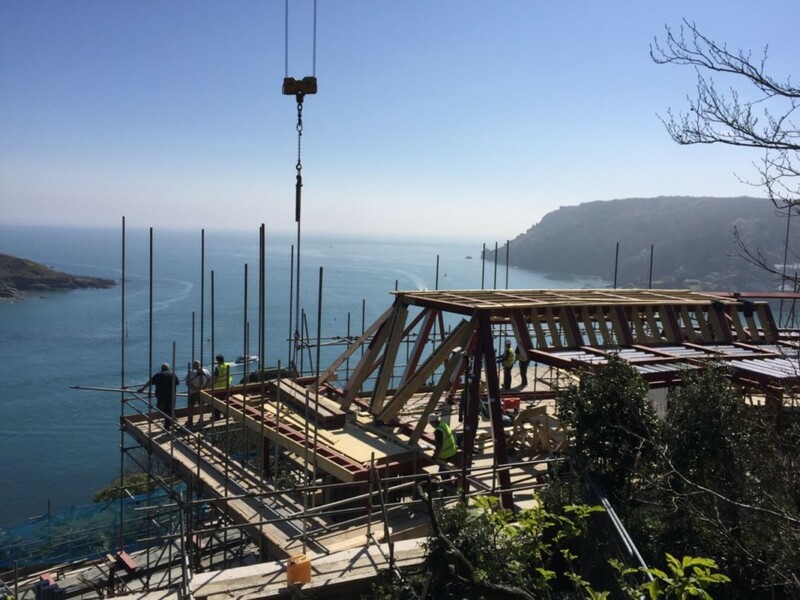 You can find our full contact details right here on our website, where you’ll find everything you need to drop us an email or pick up the phone for a chat. 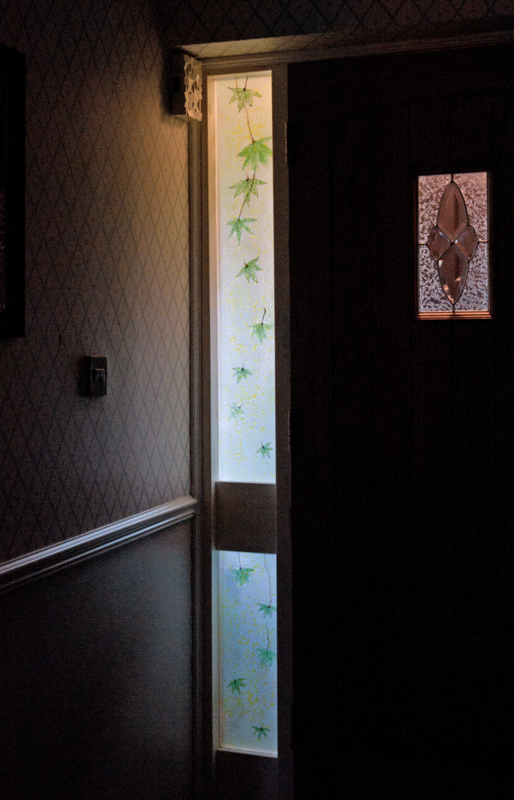 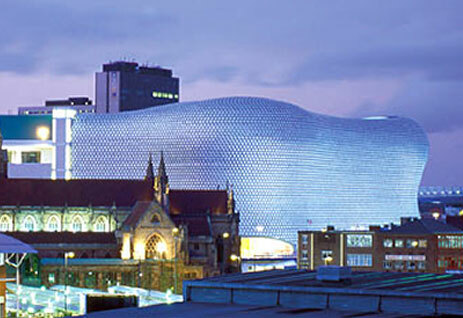 Hopefully, we’ll be delivering something special to your doorstep before you know it.